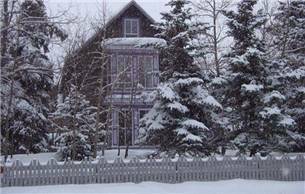 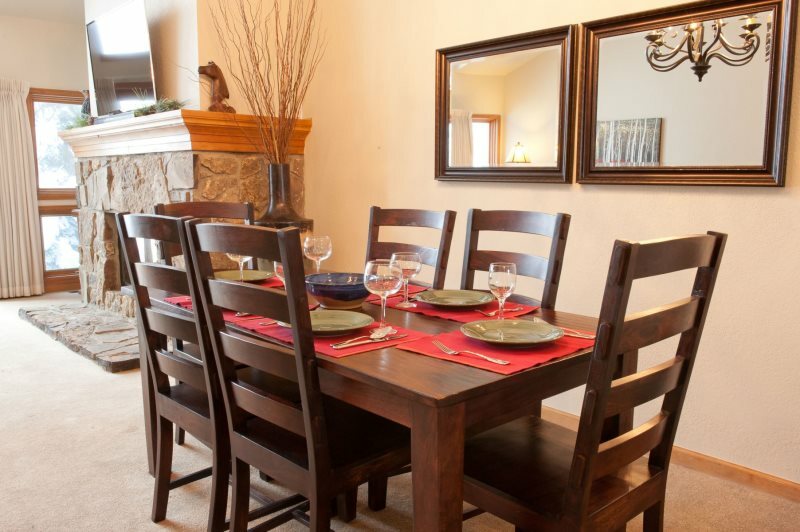 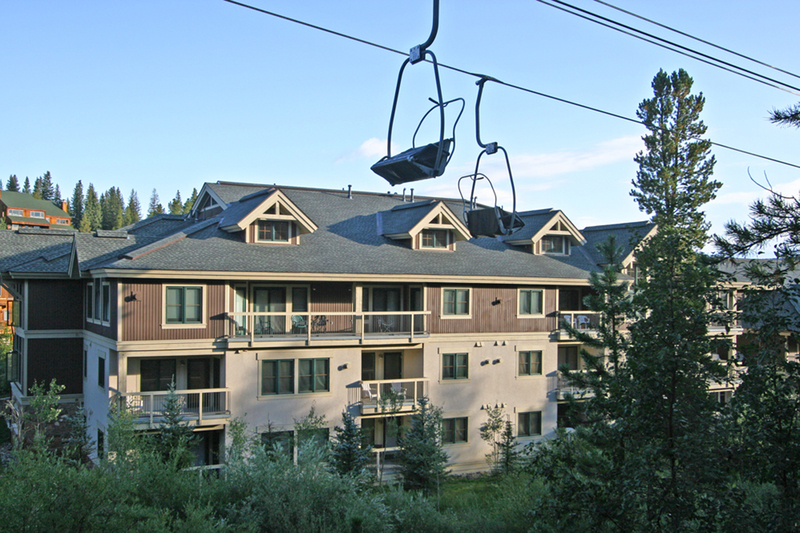 Starfire Townhomes are located in the quiet neighborhood of West Keystone. 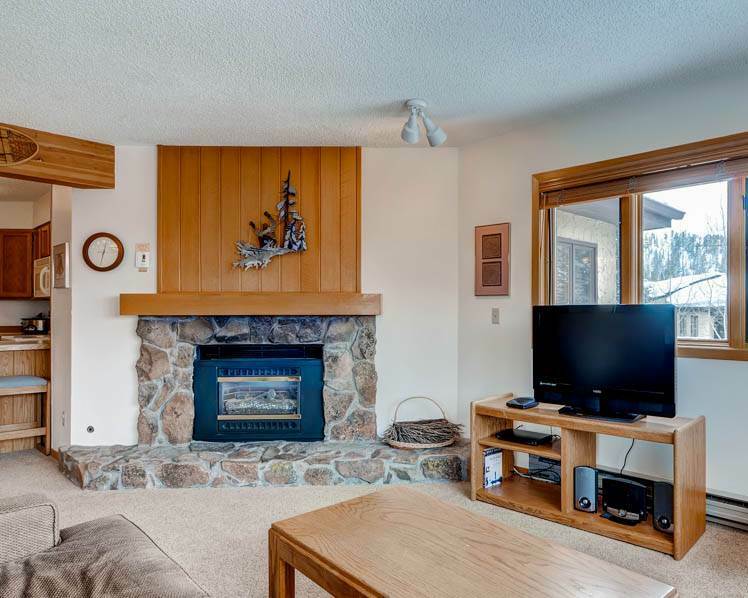 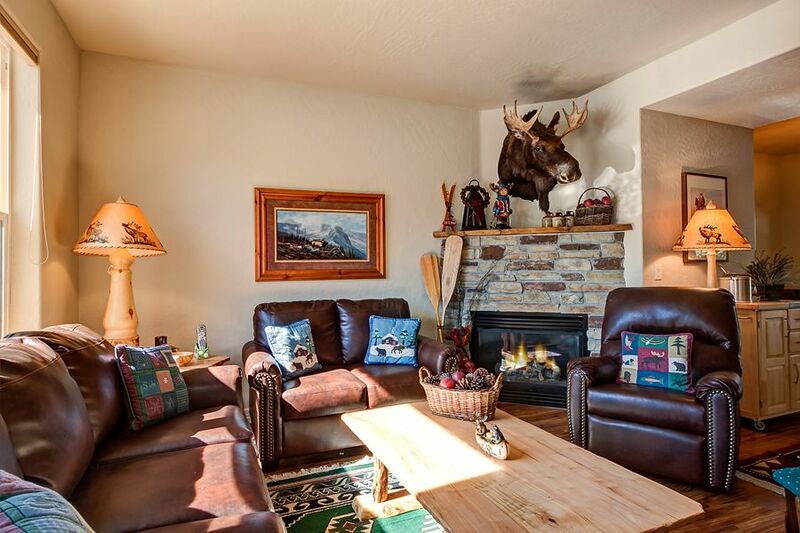 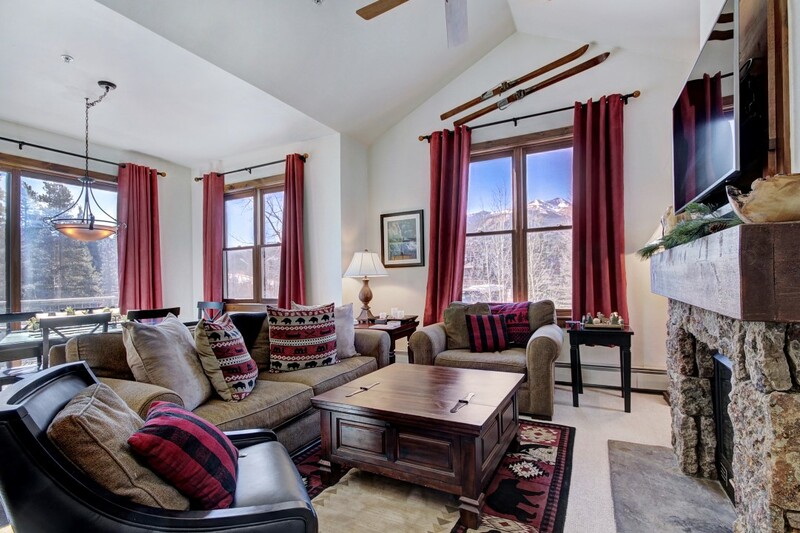 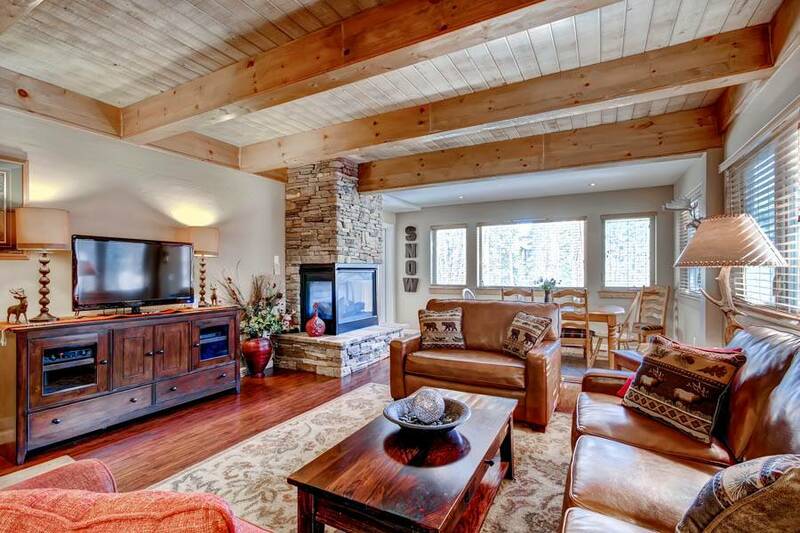 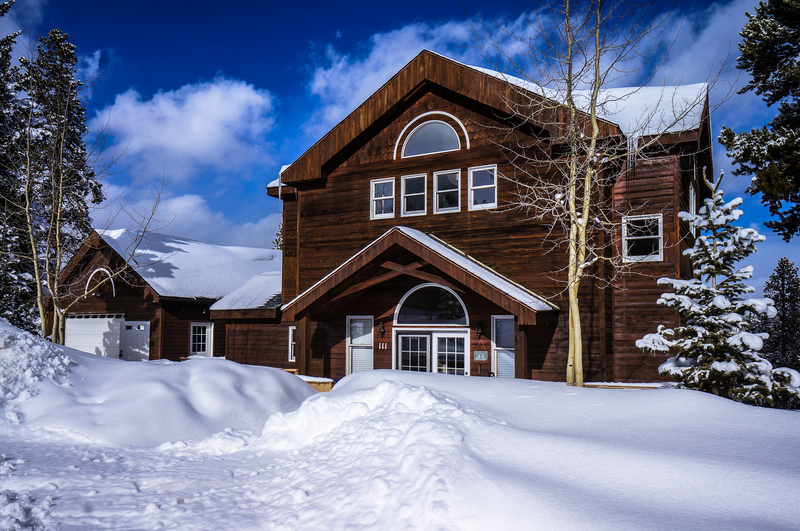 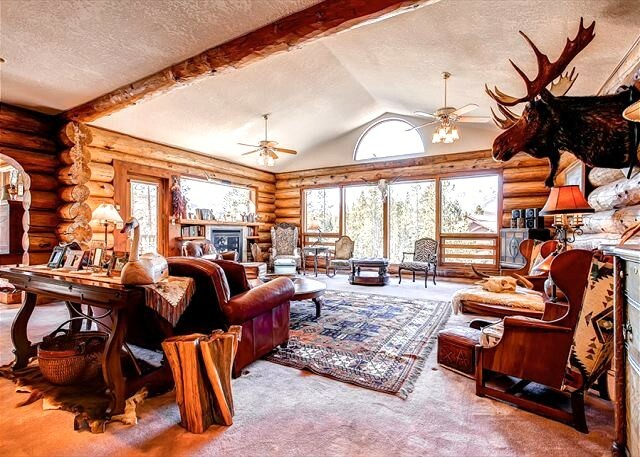 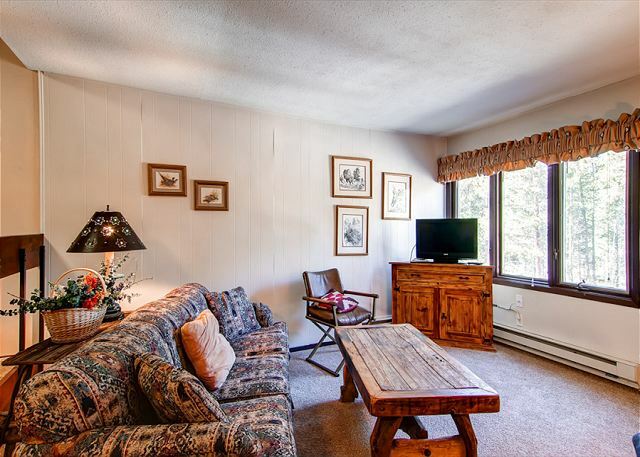 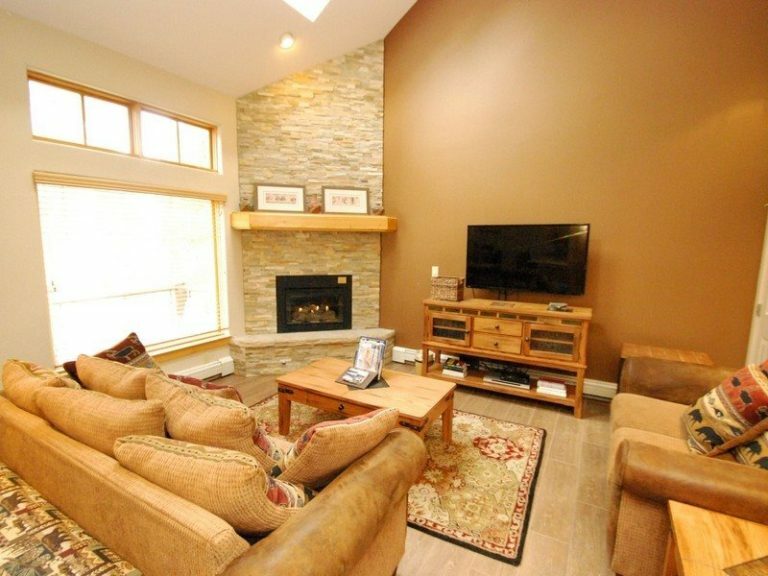 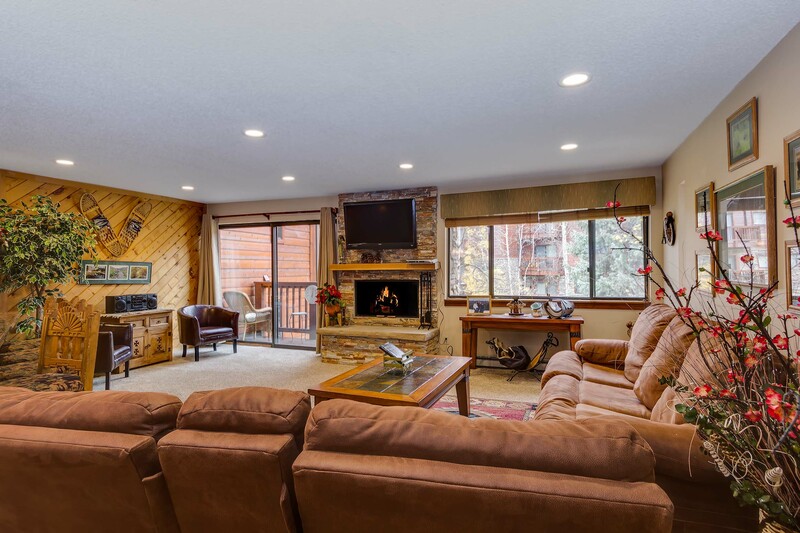 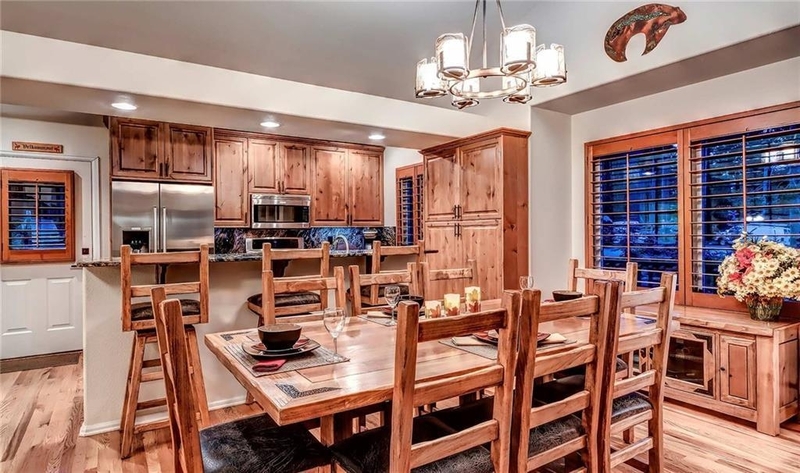 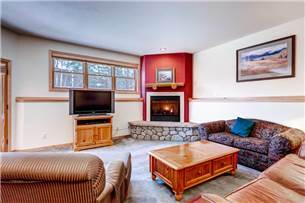 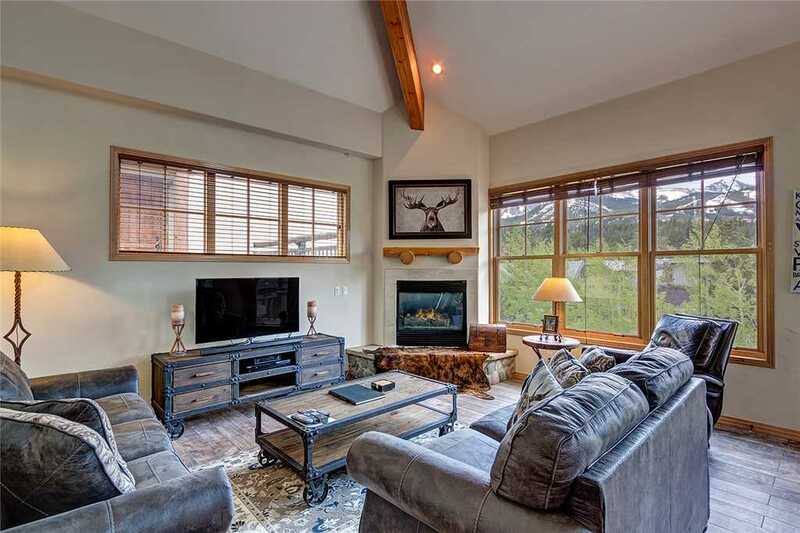 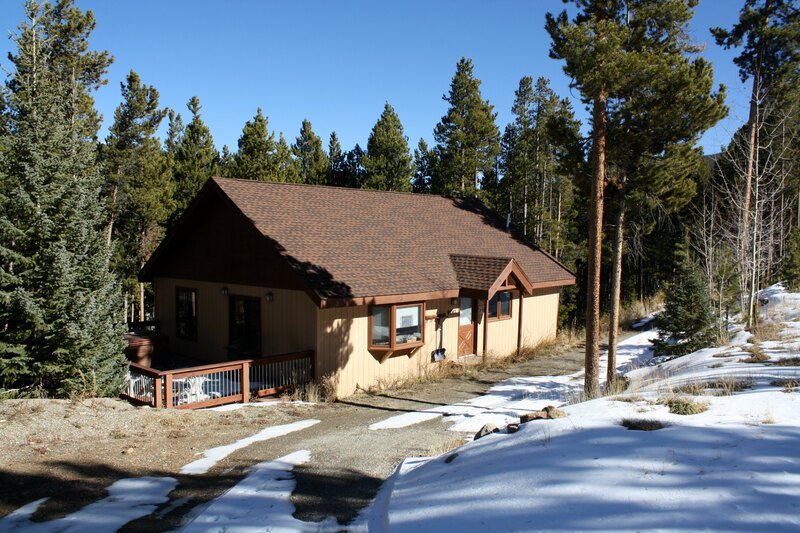 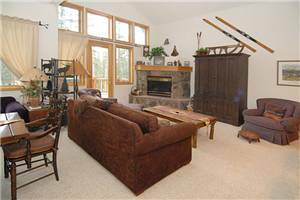 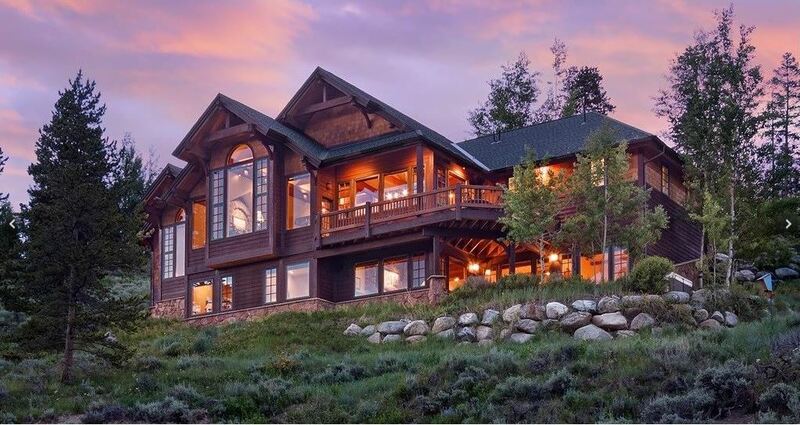 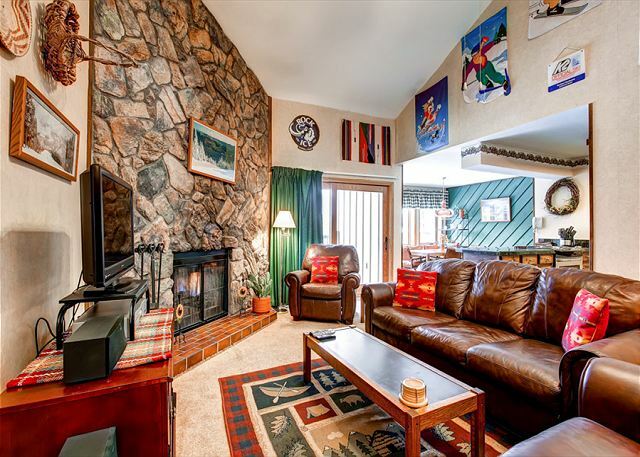 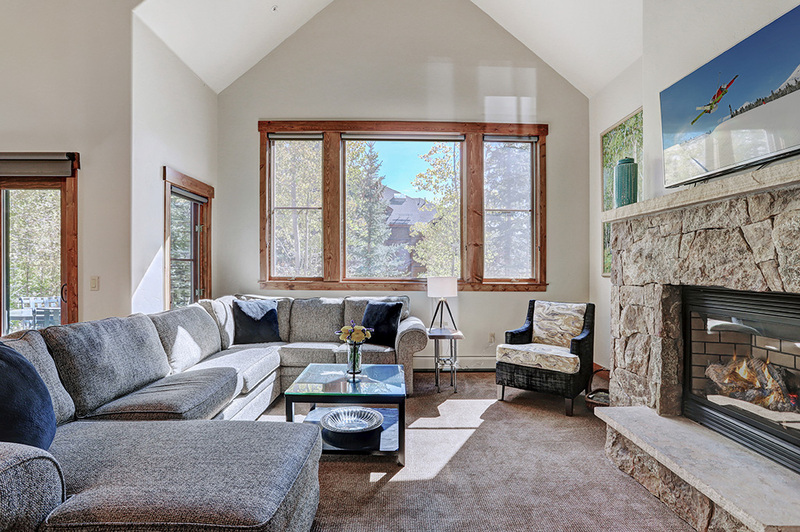 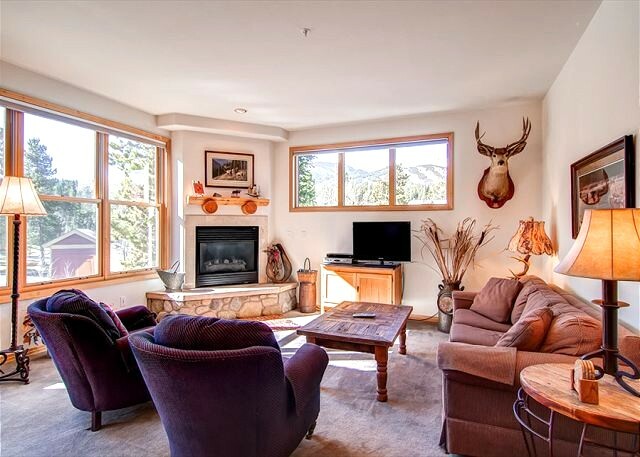 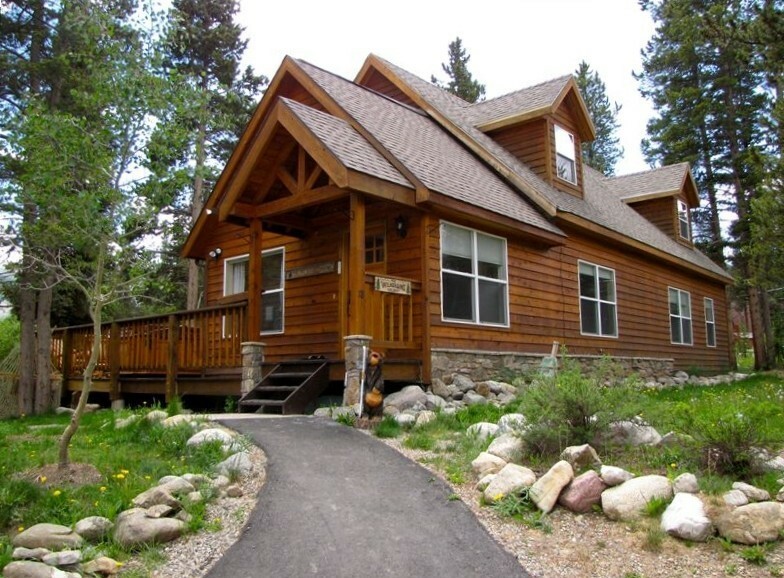 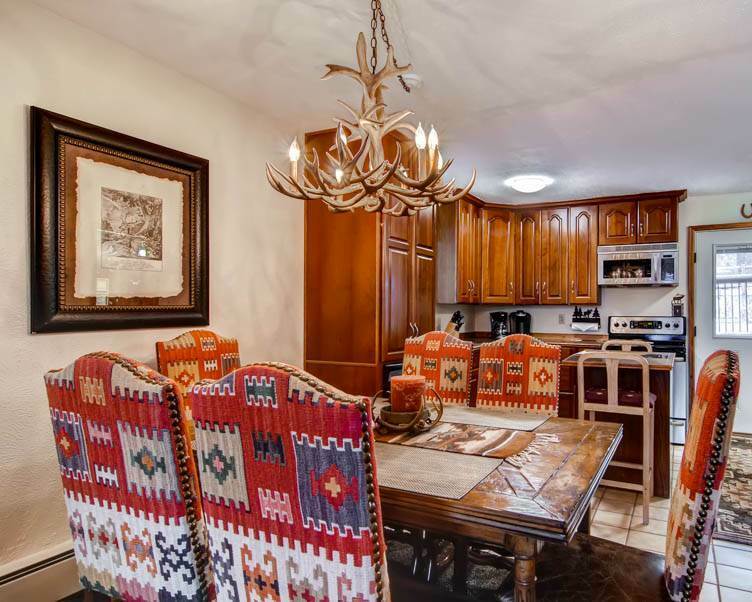 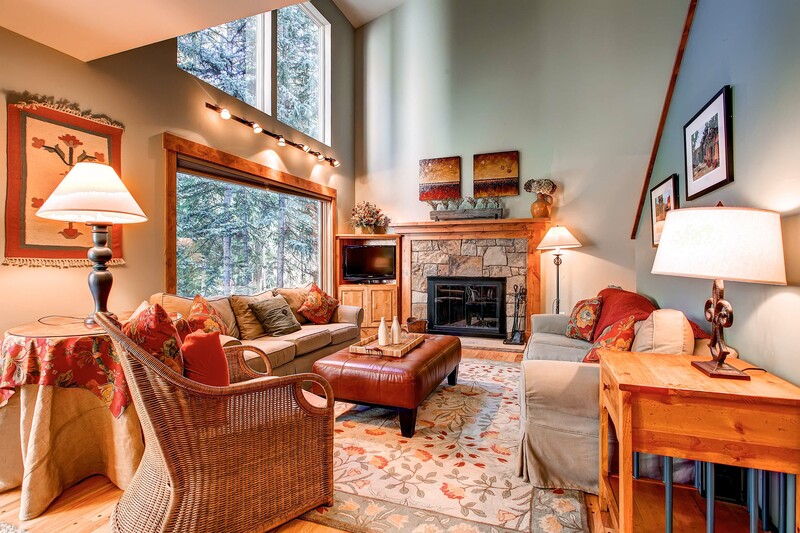 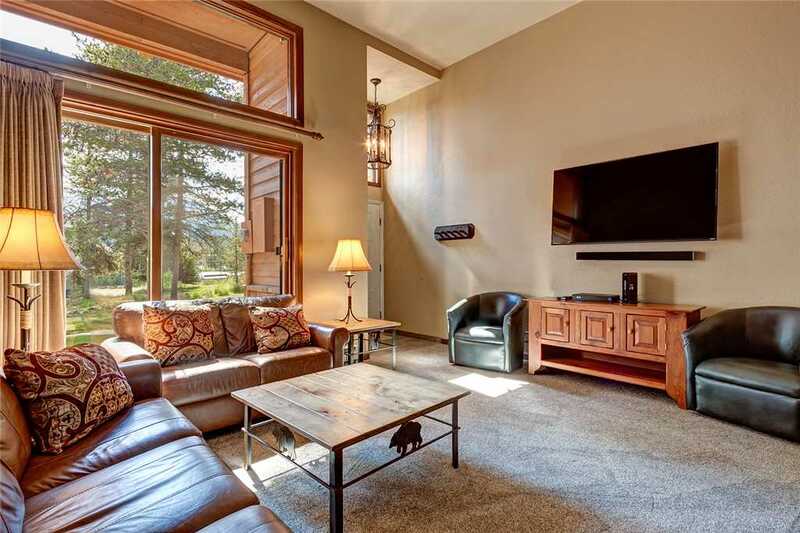 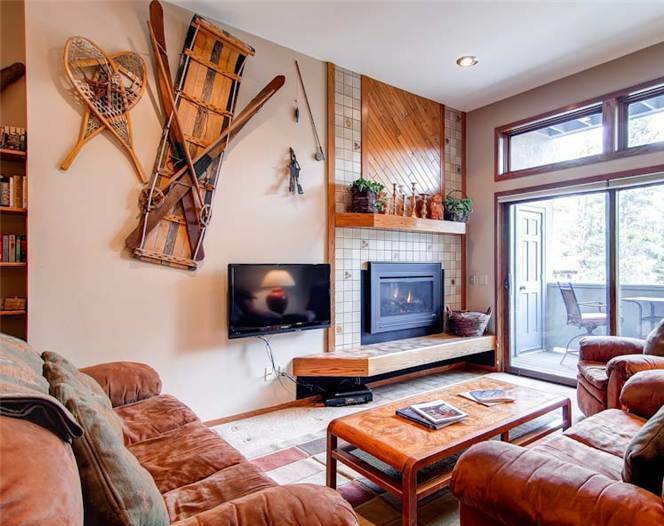 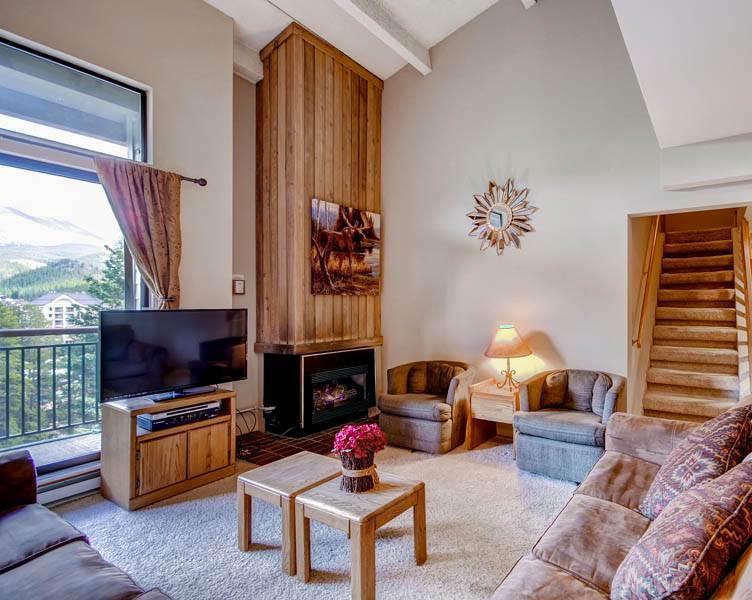 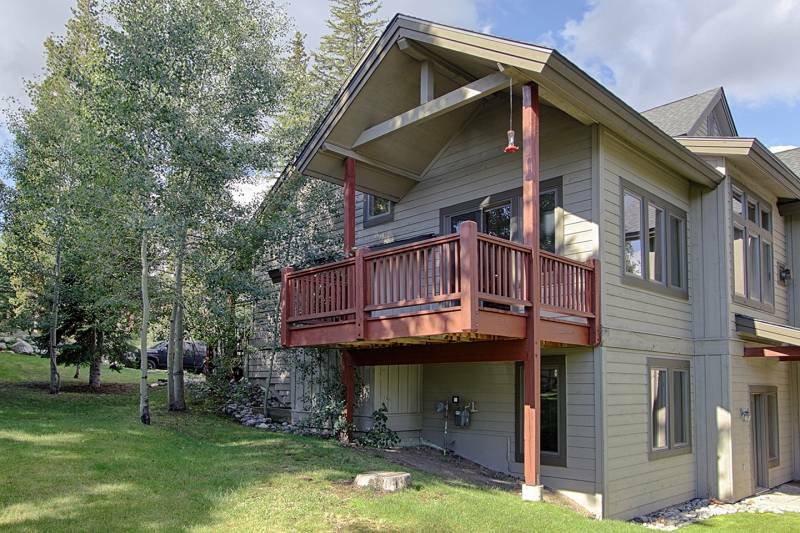 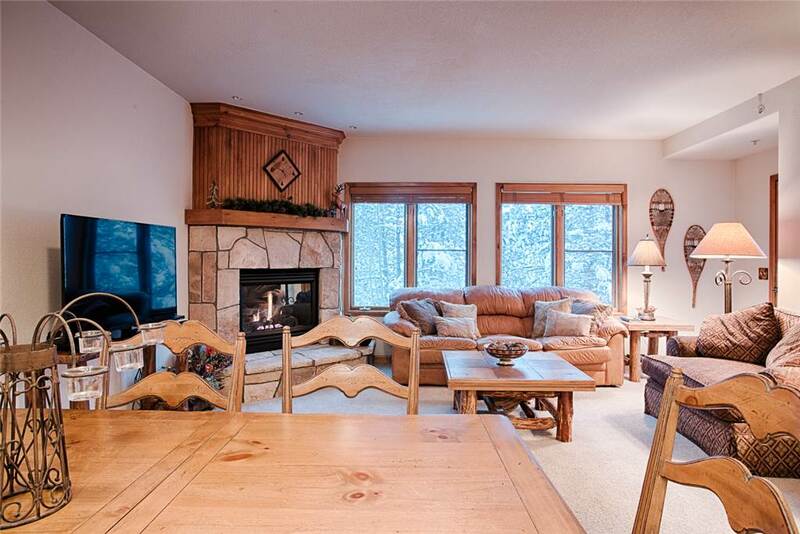 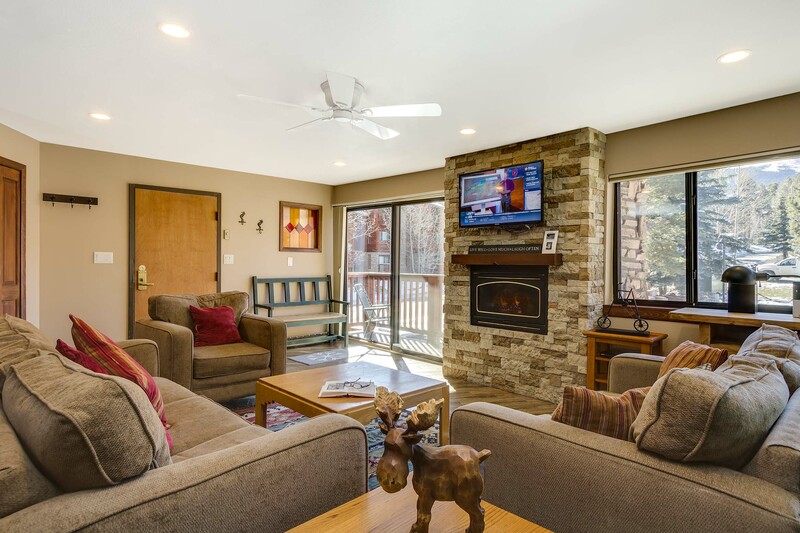 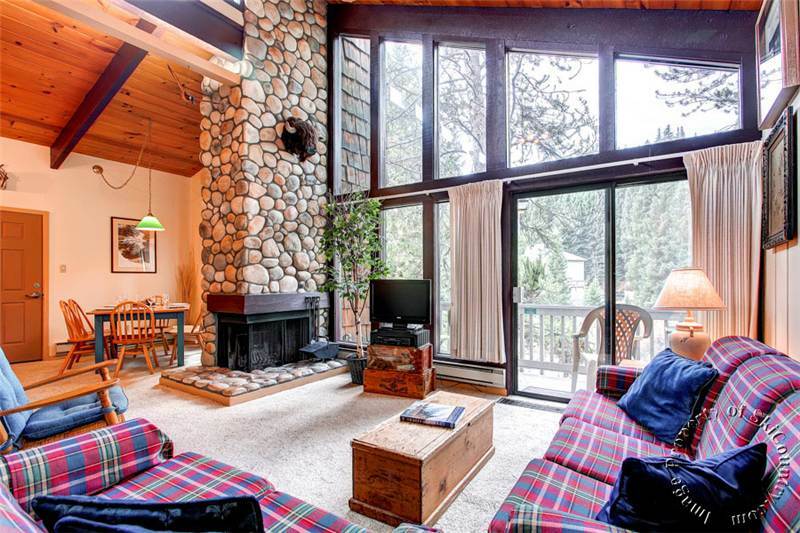 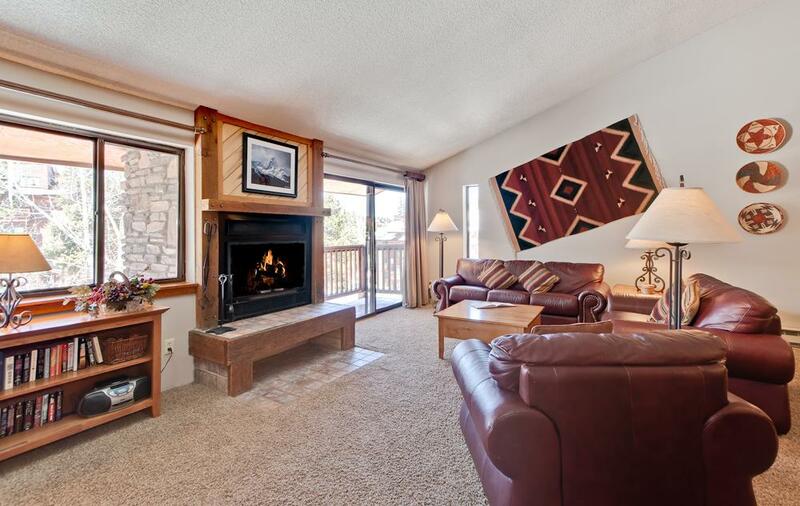 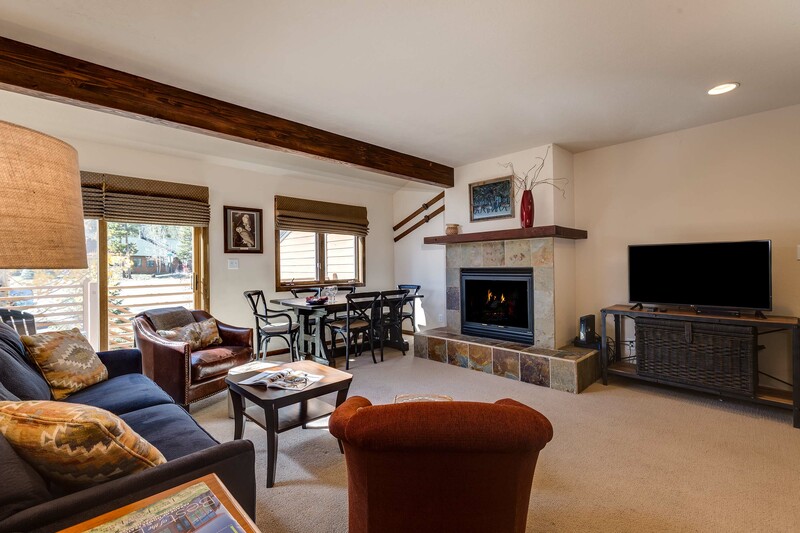 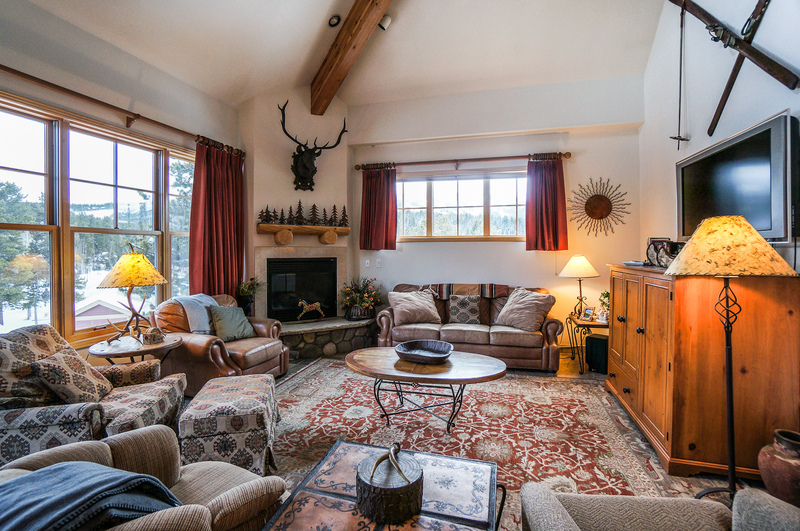 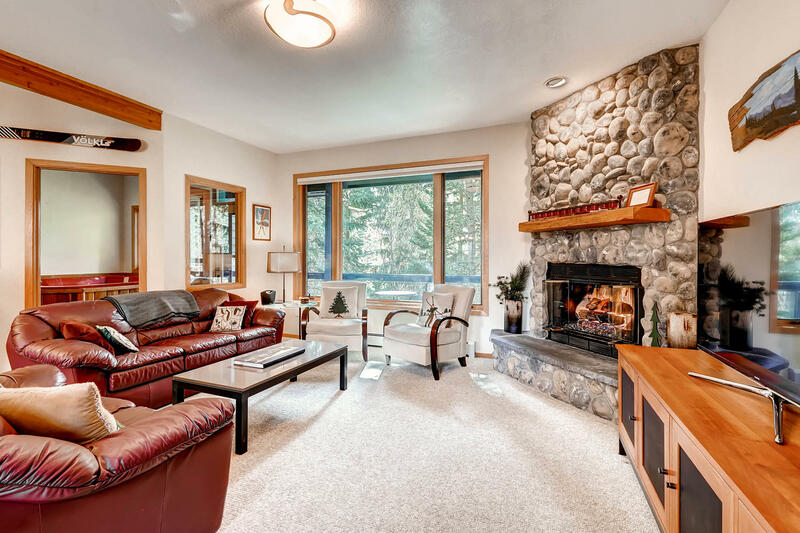 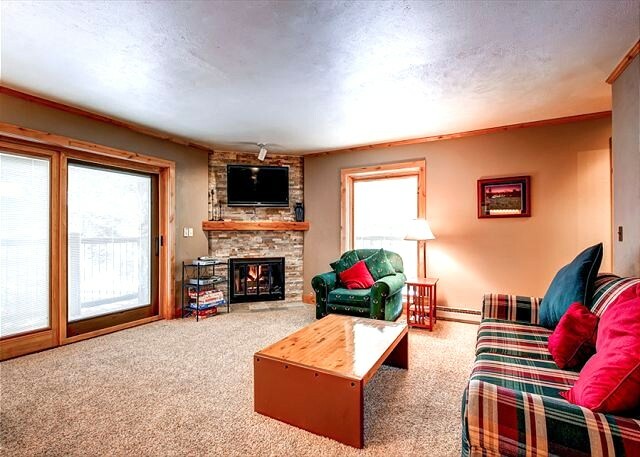 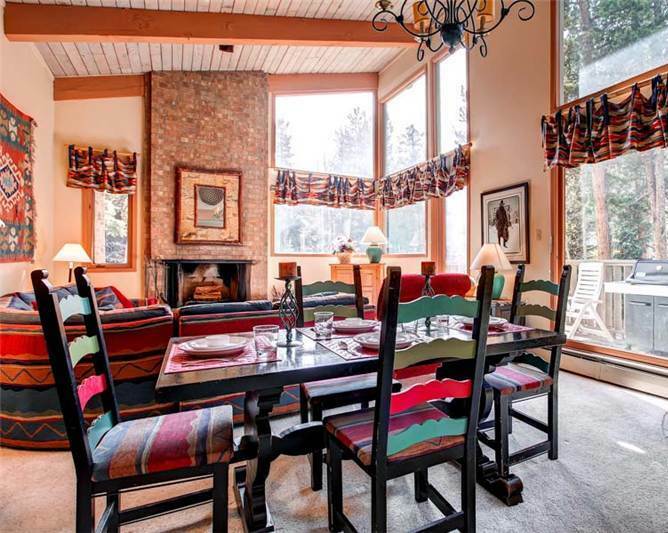 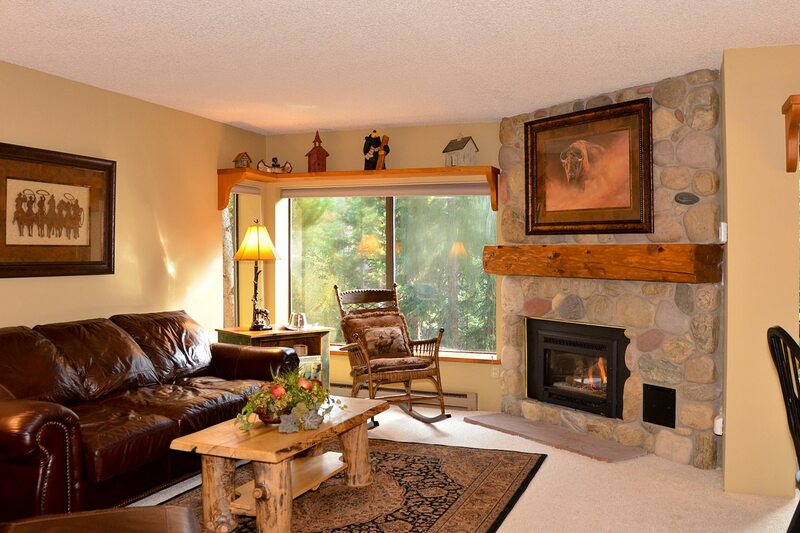 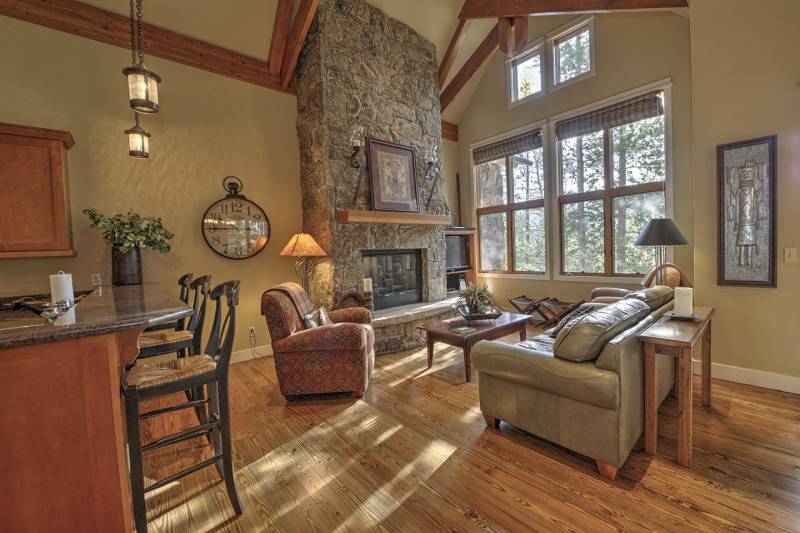 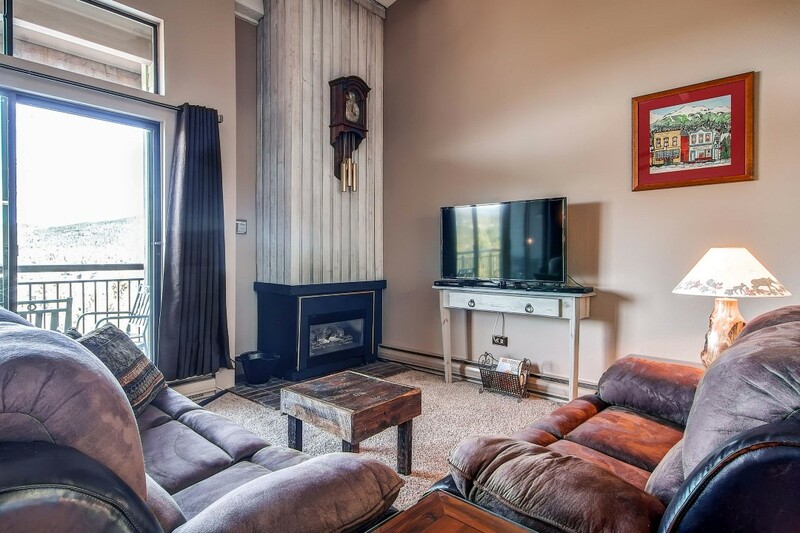 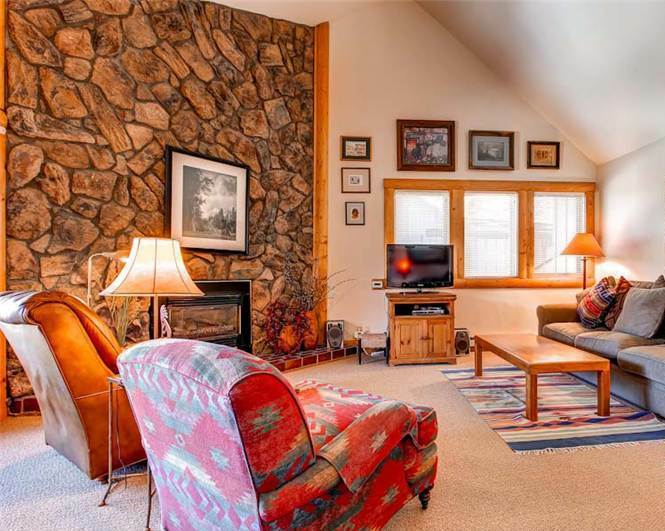 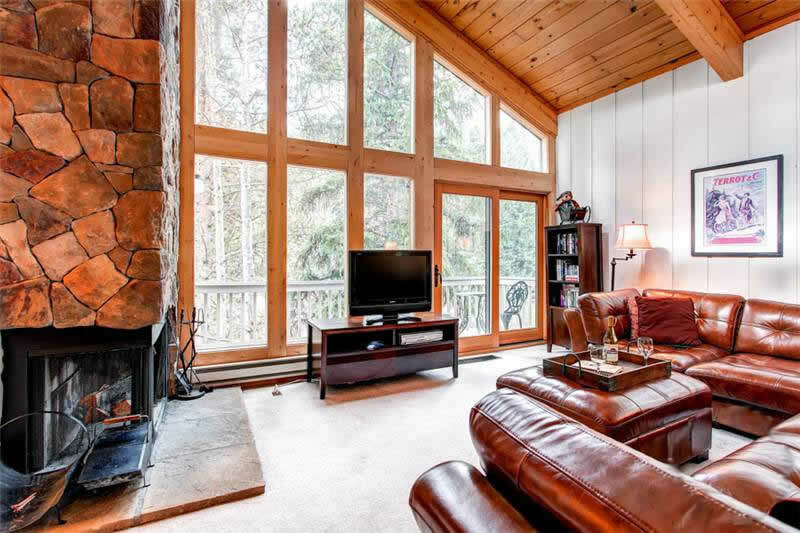 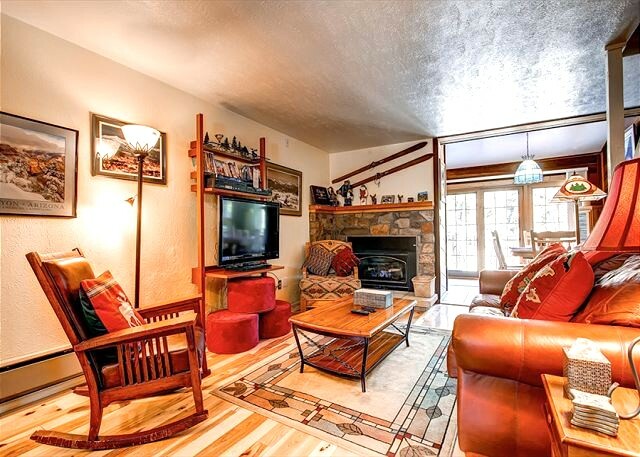 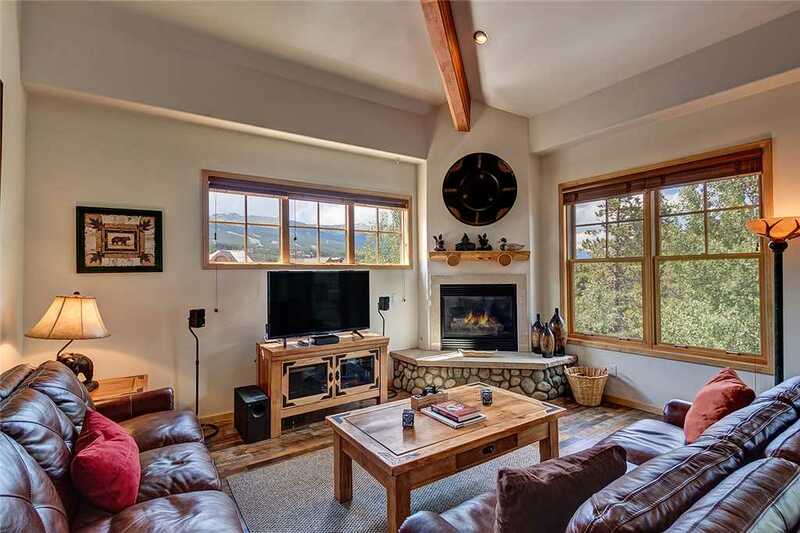 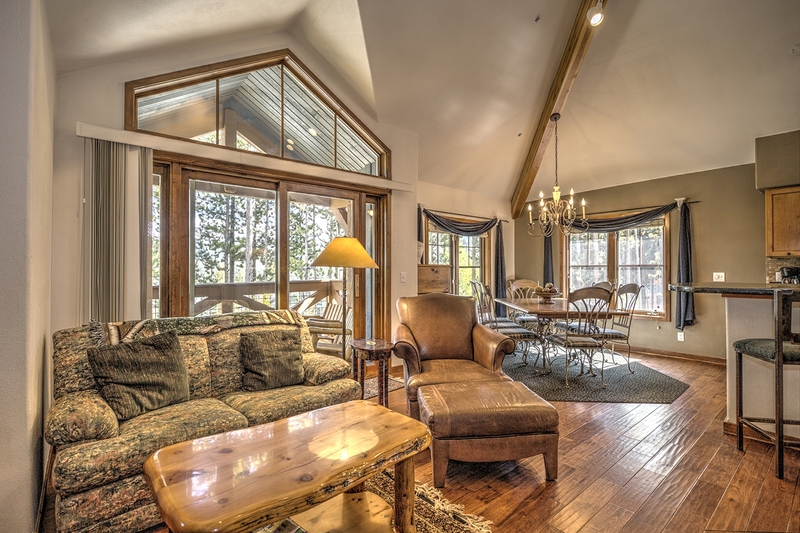 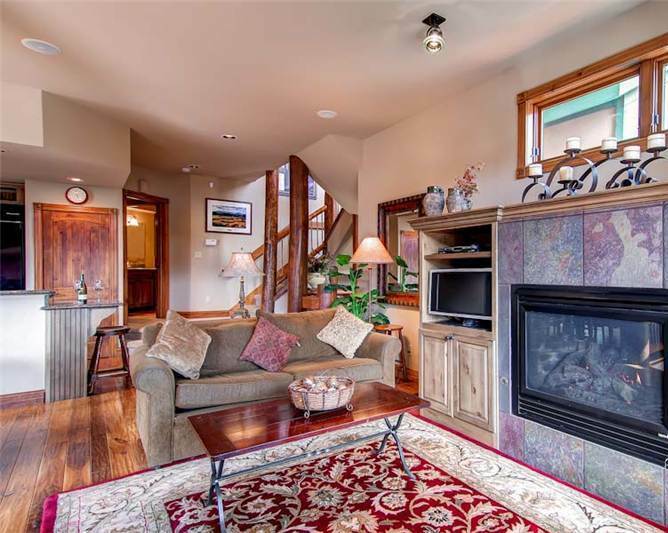 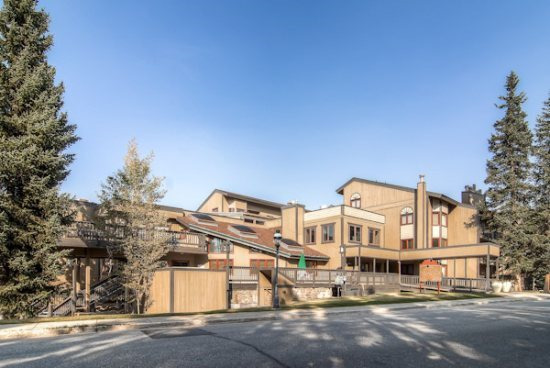 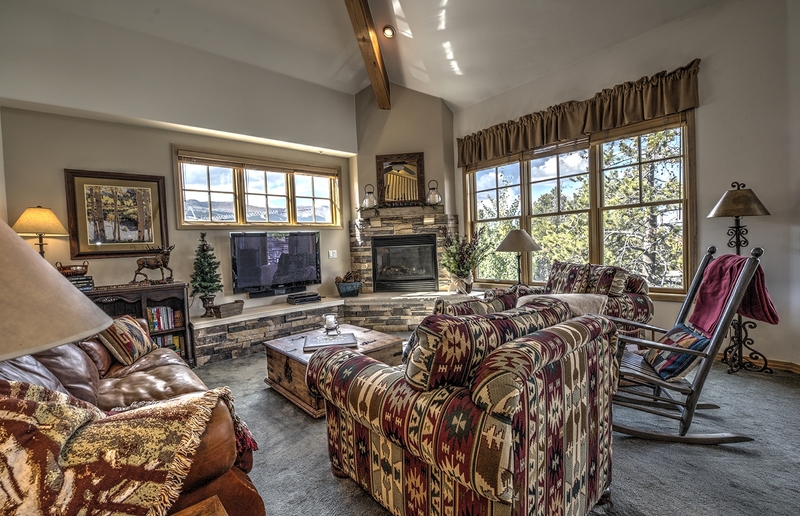 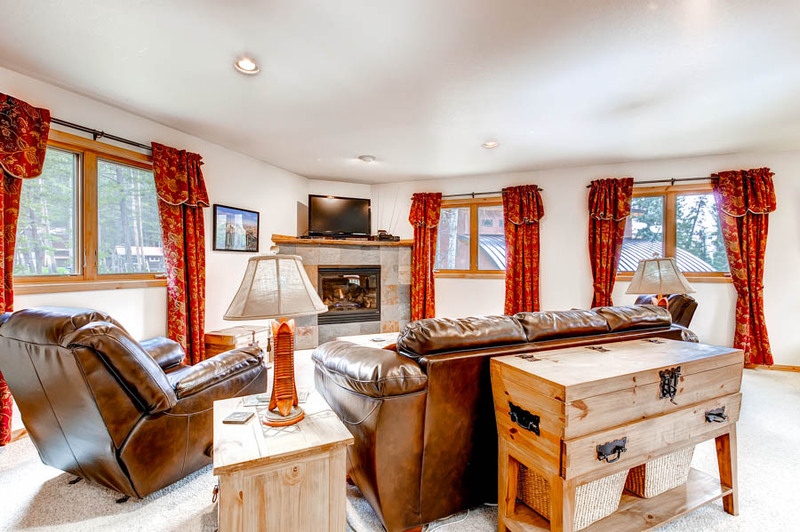 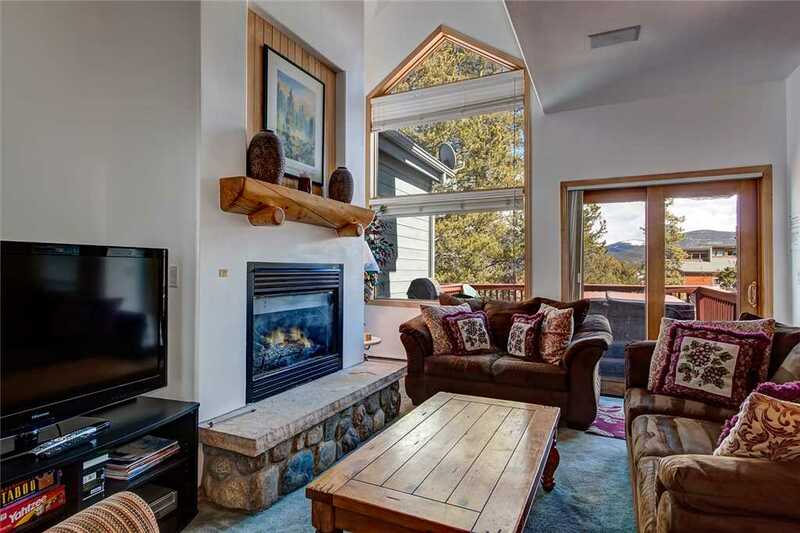 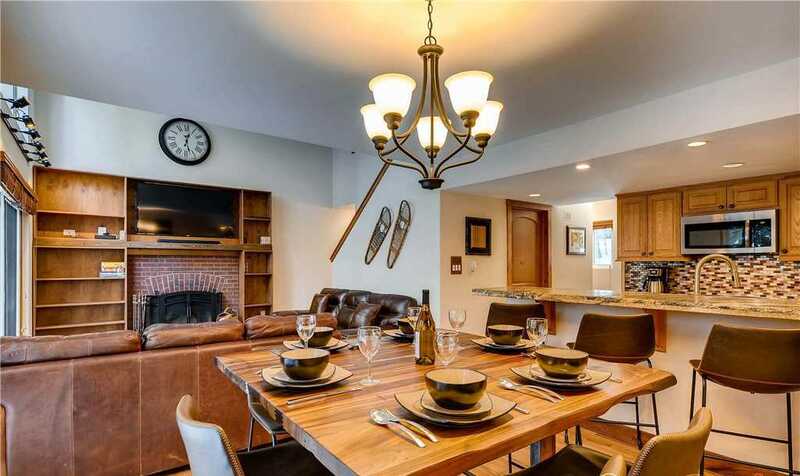 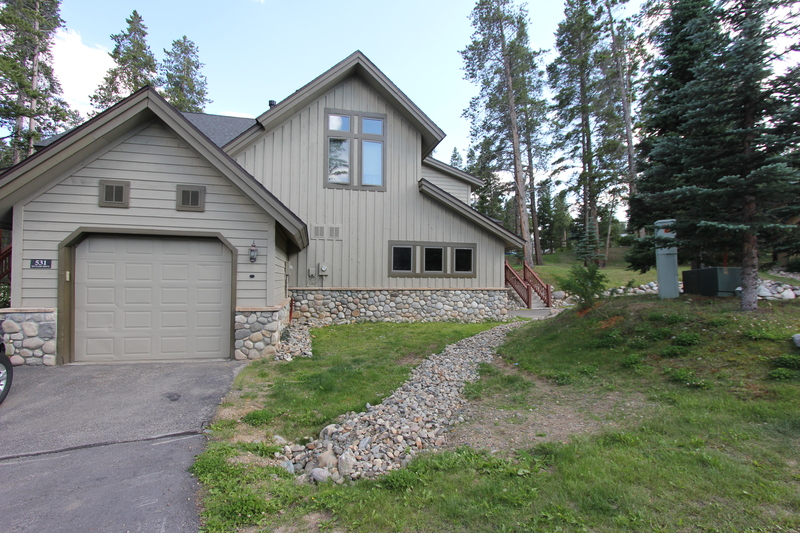 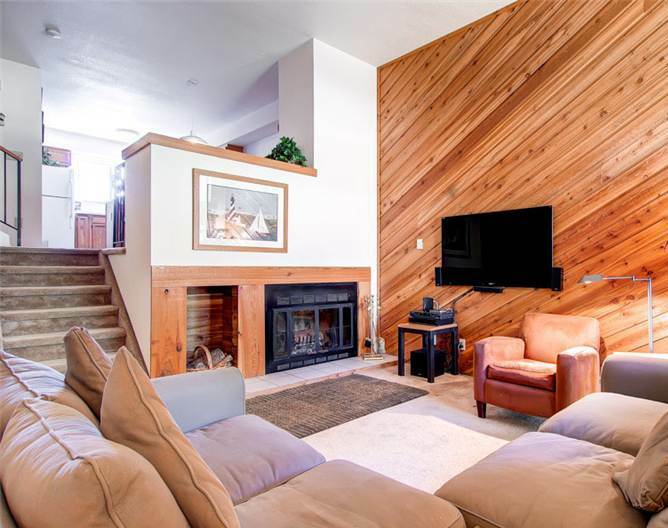 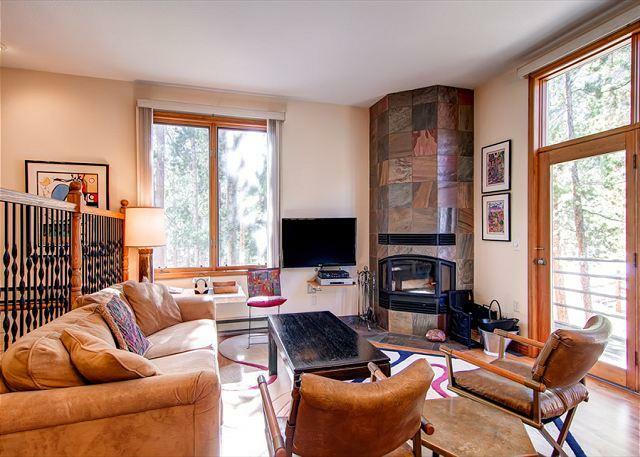 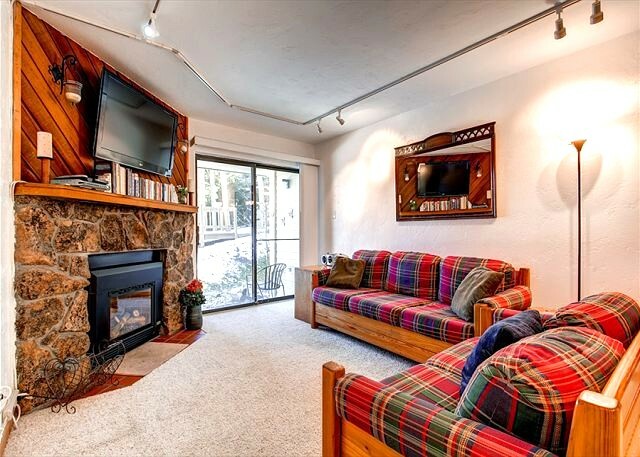 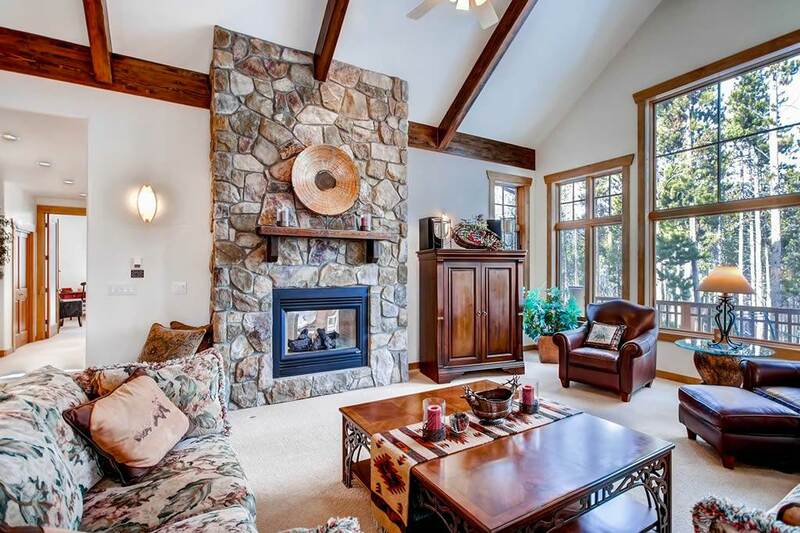 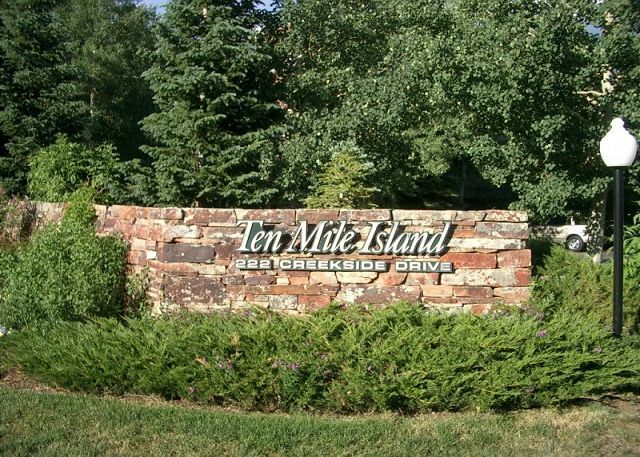 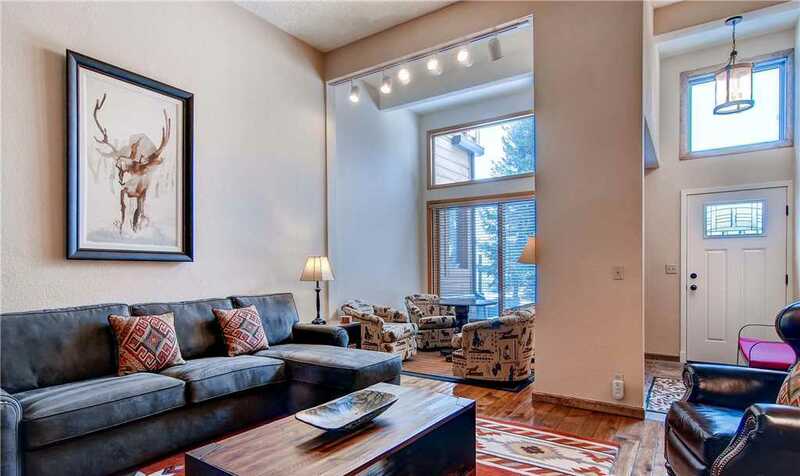 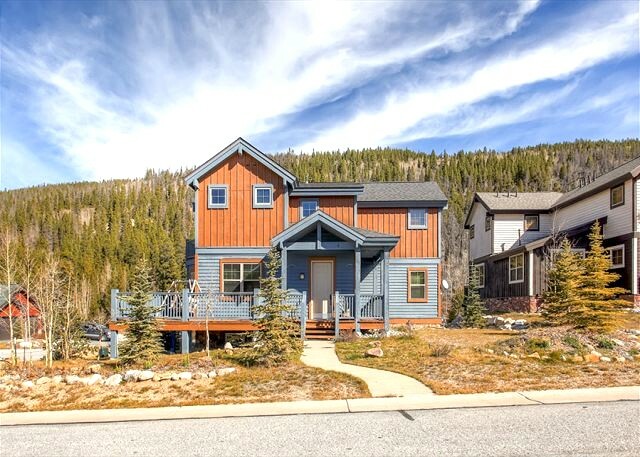 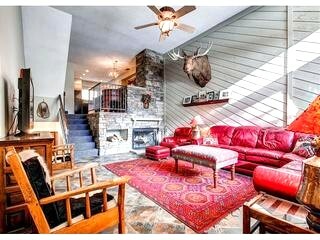 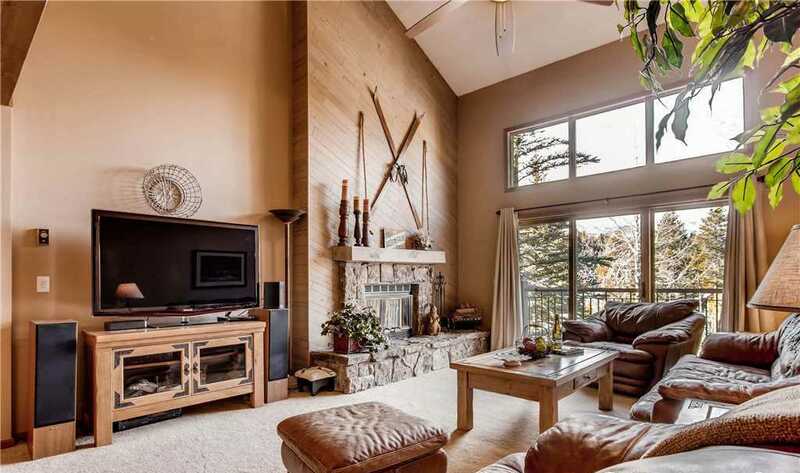 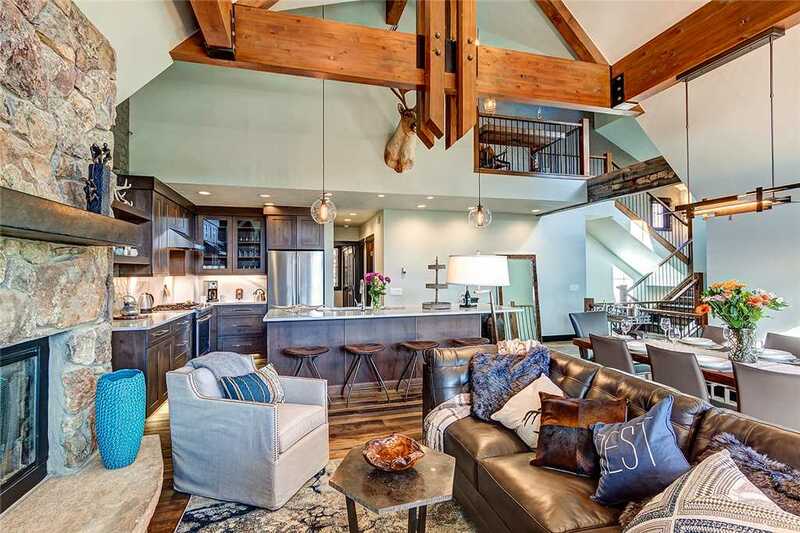 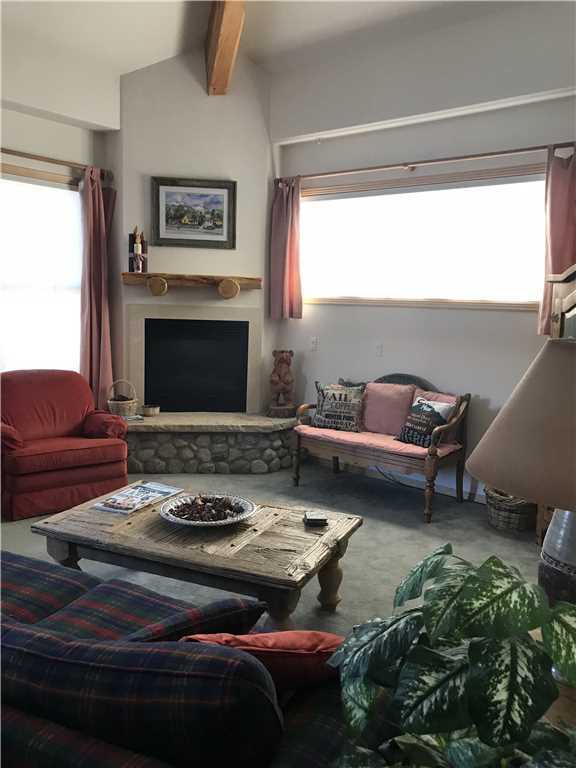 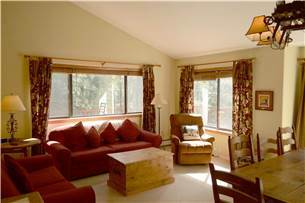 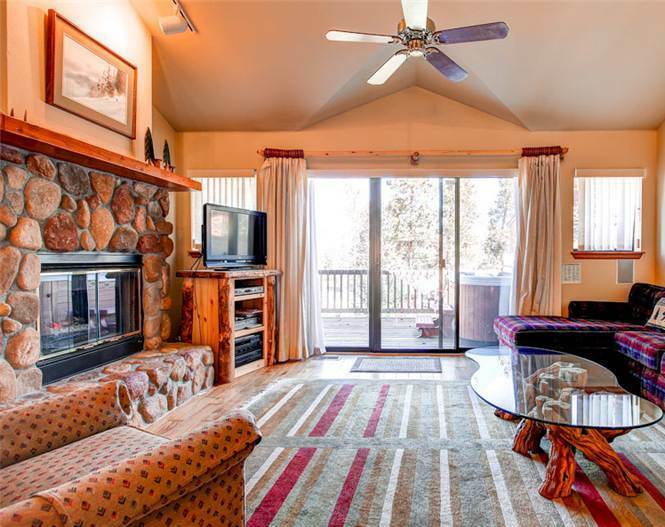 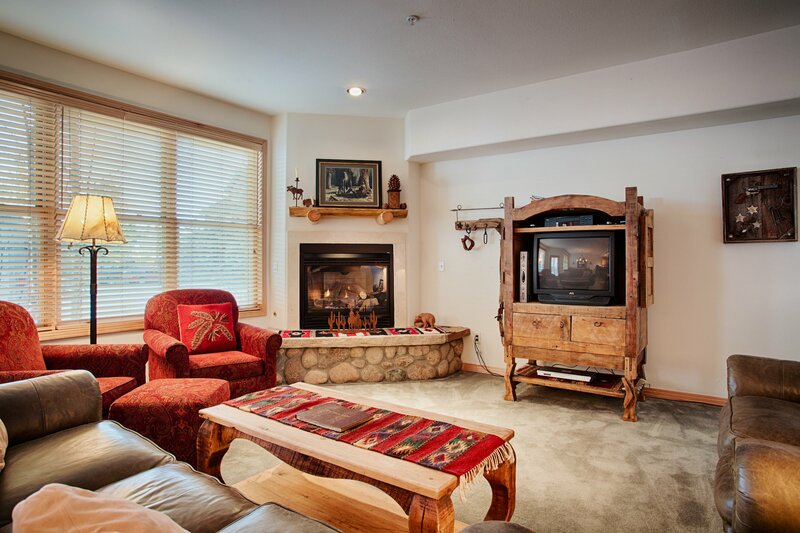 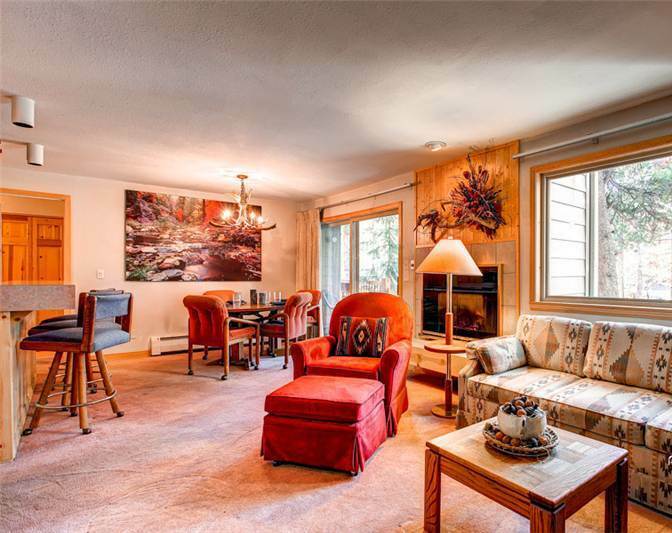 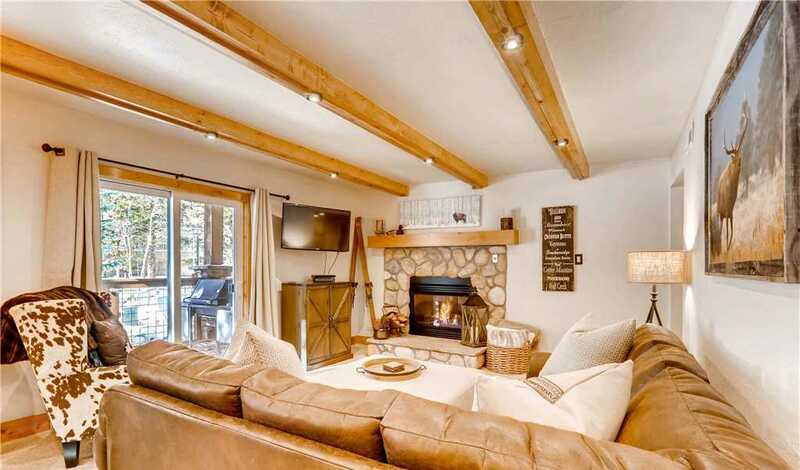 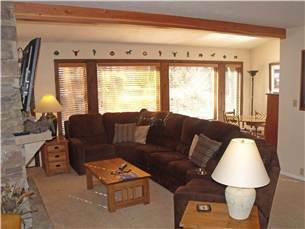 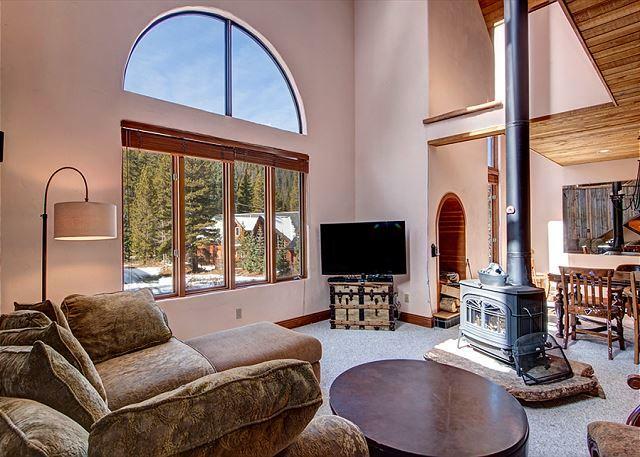 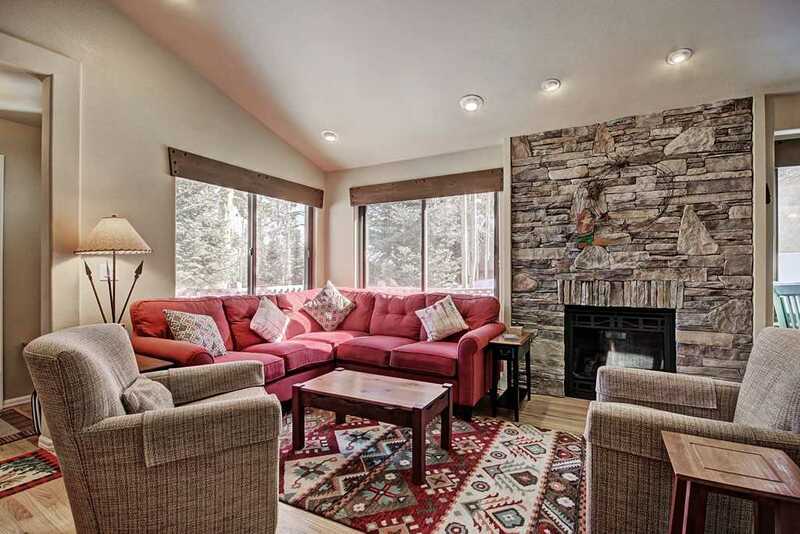 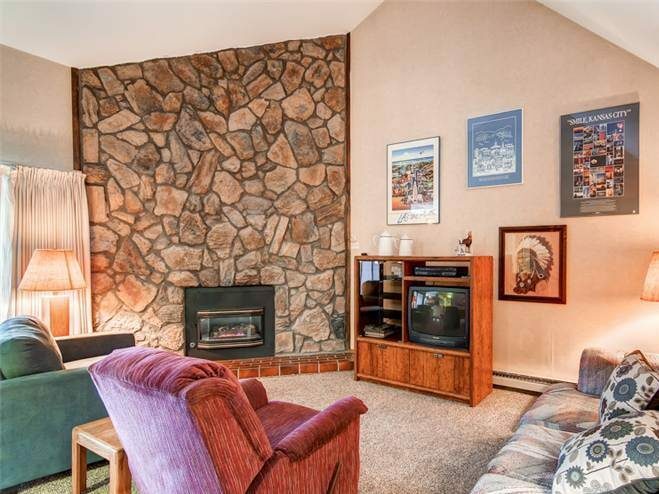 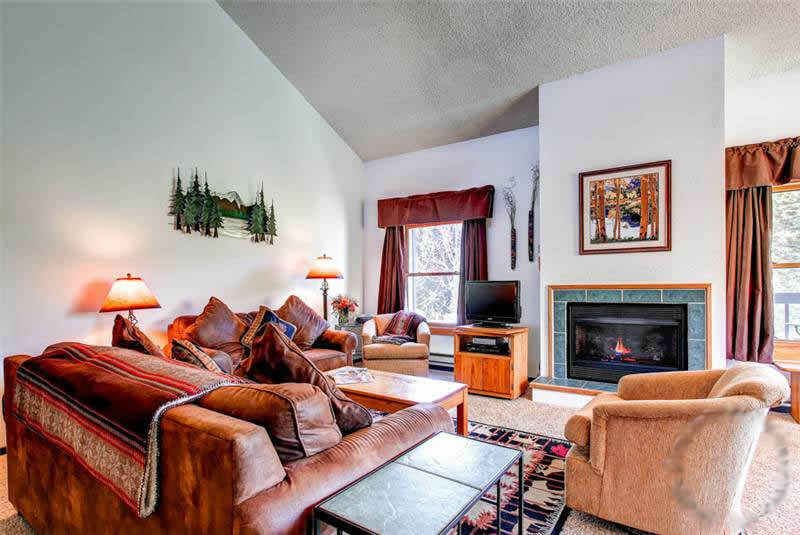 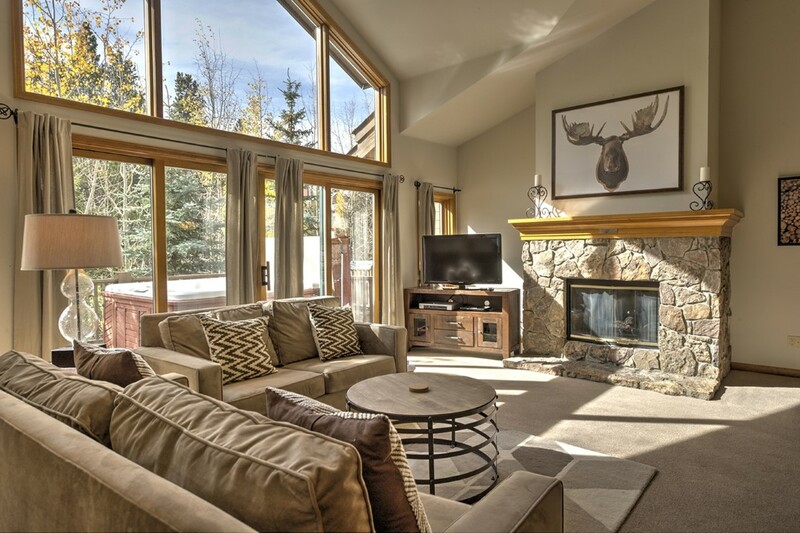 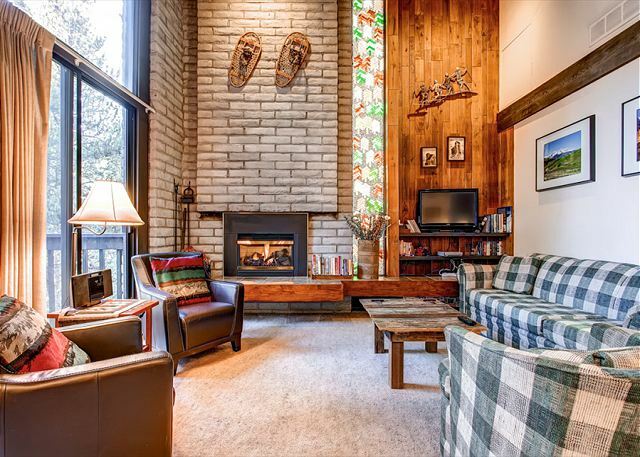 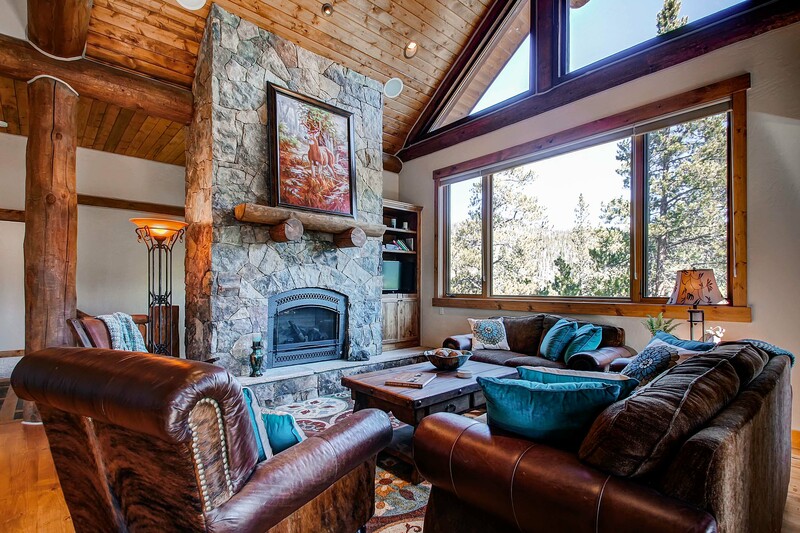 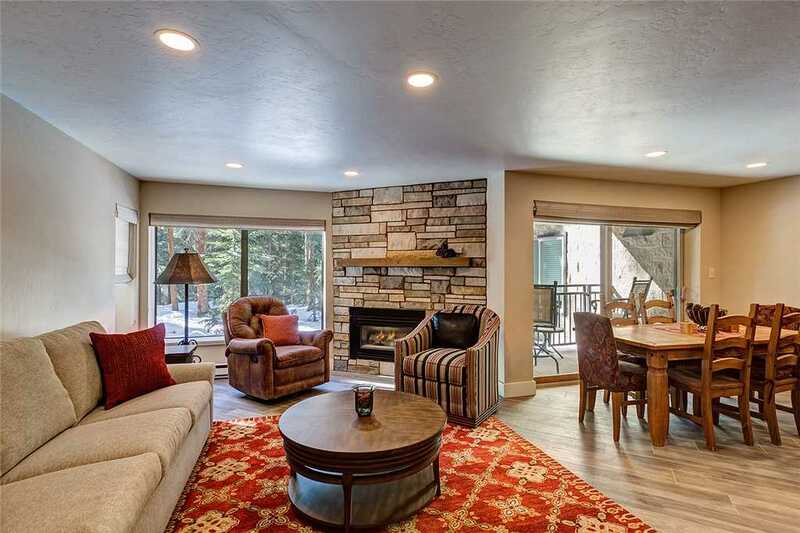 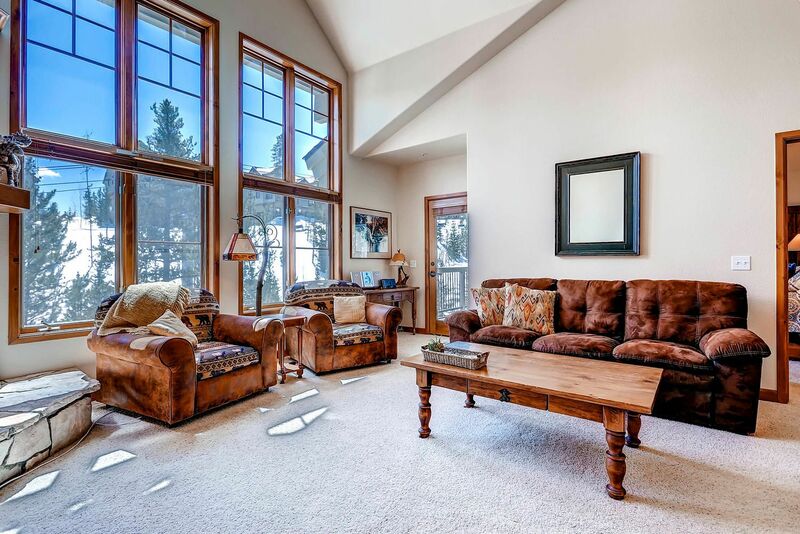 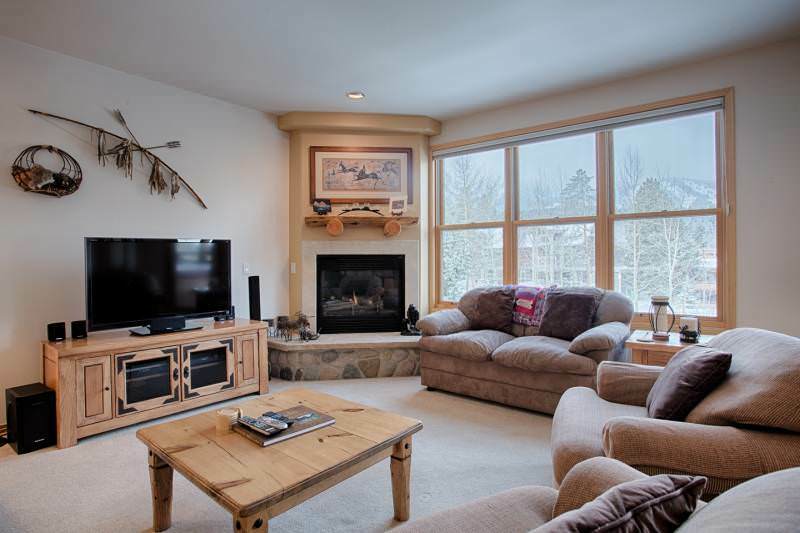 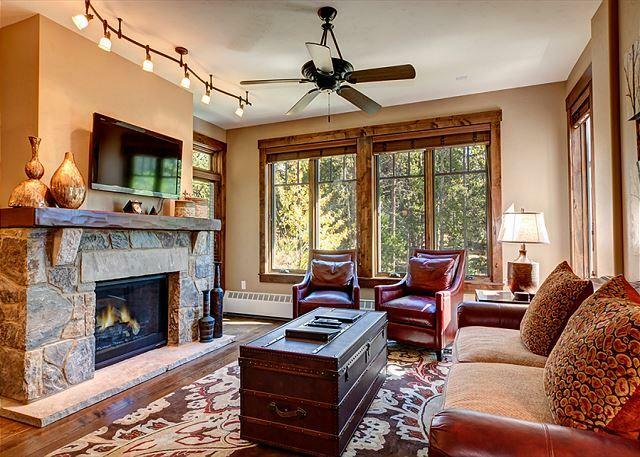 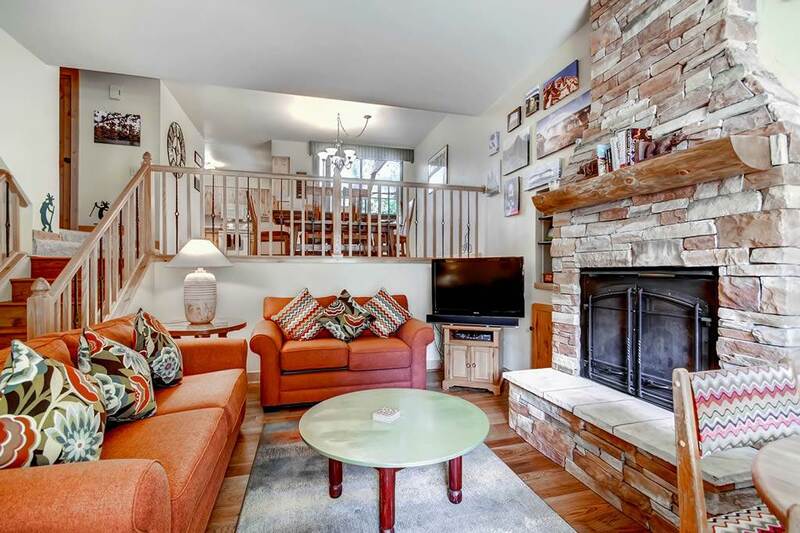 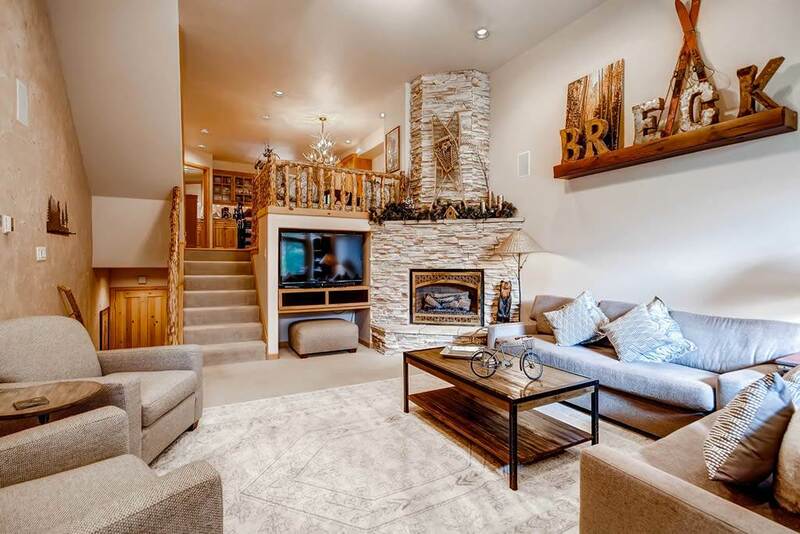 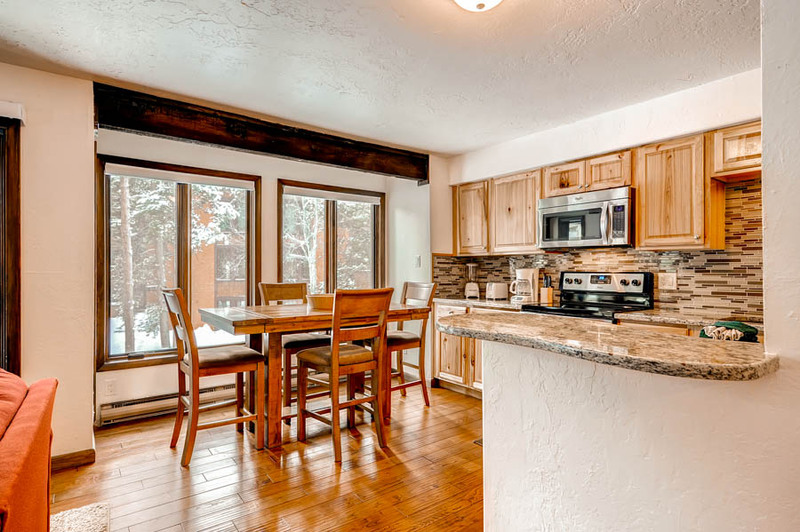 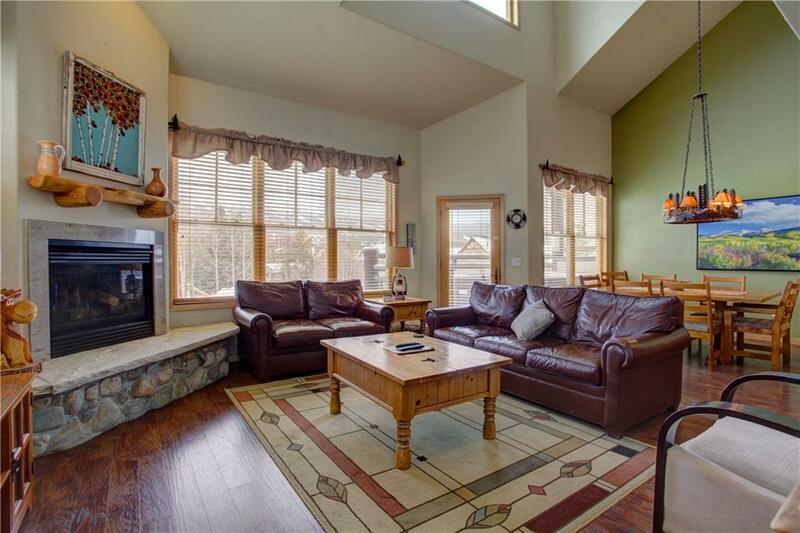 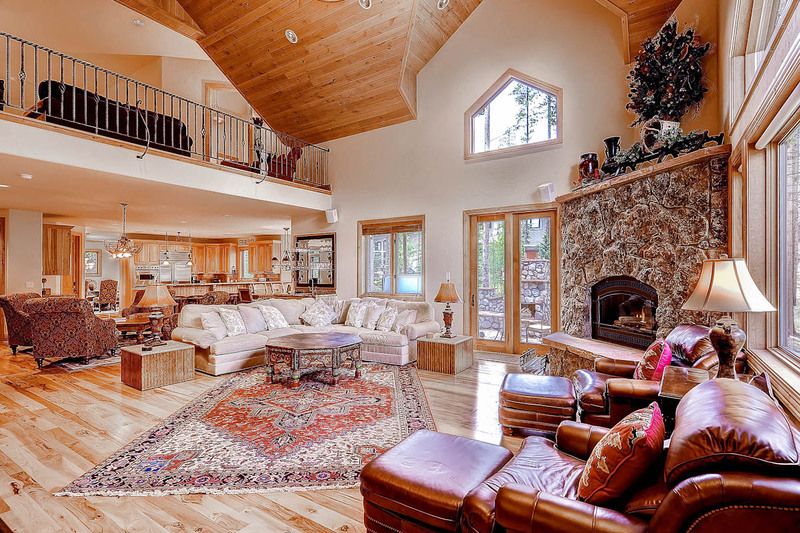 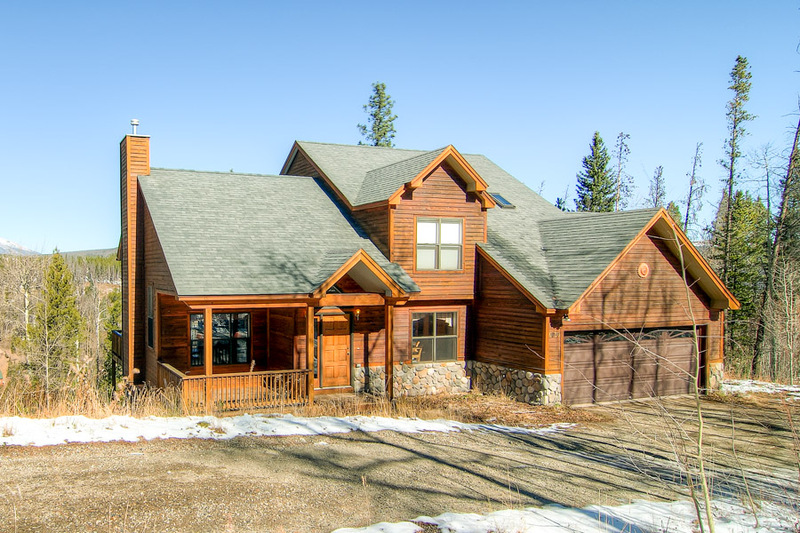 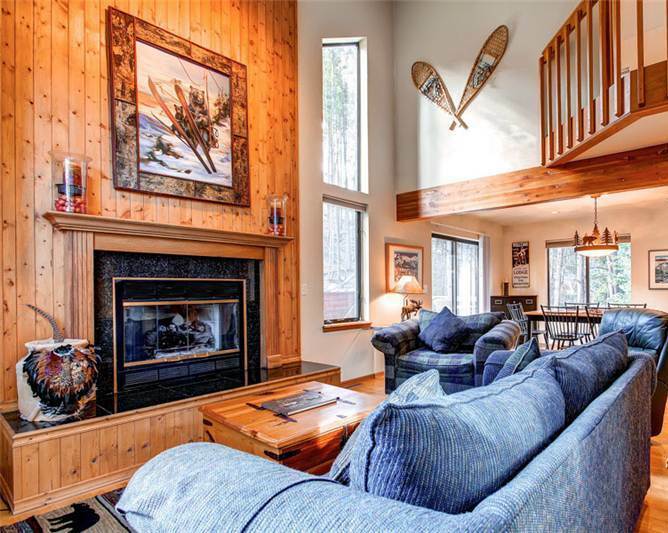 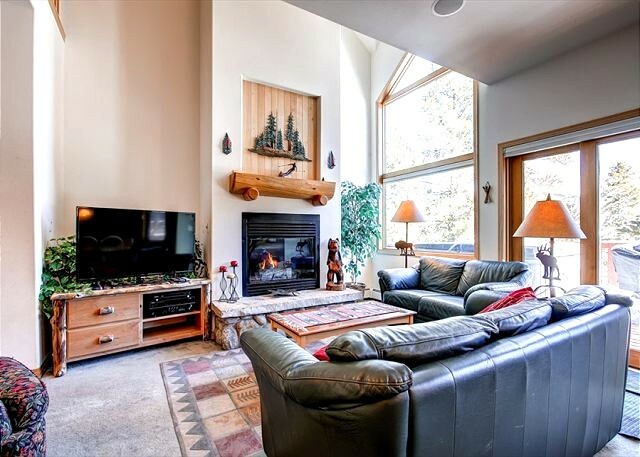 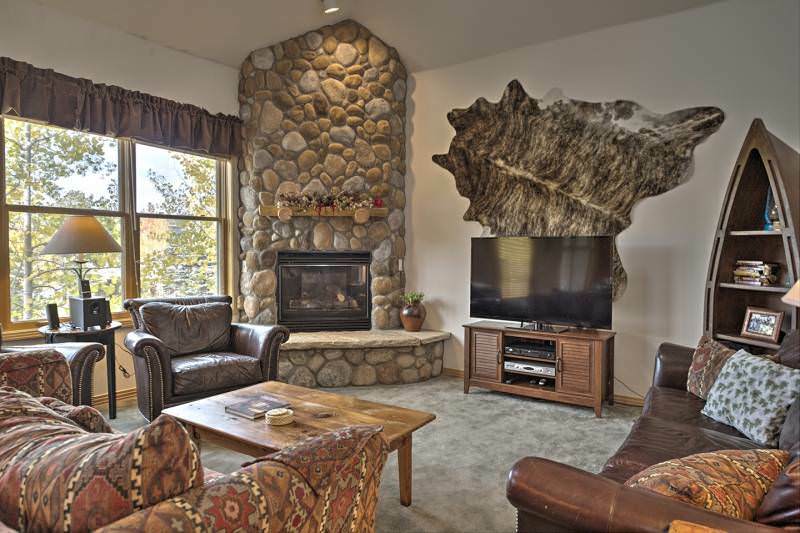 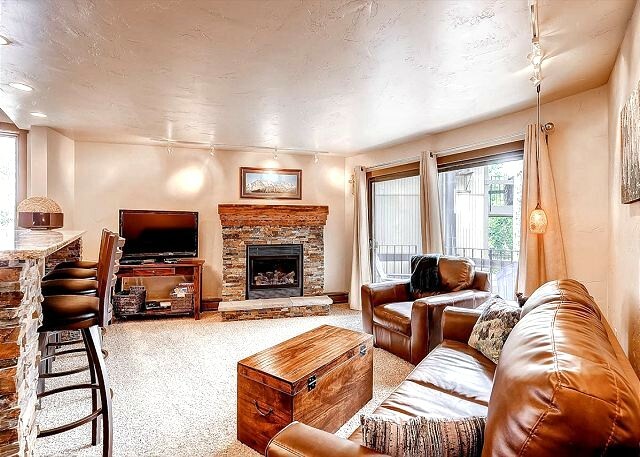 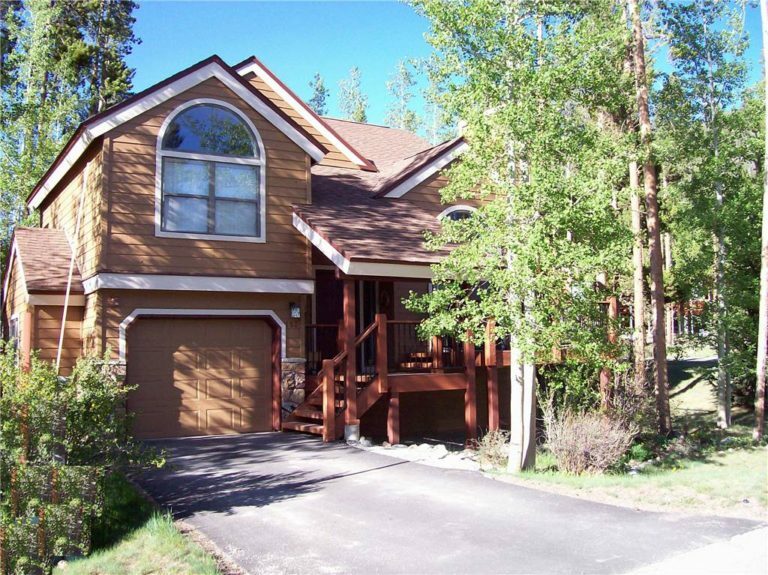 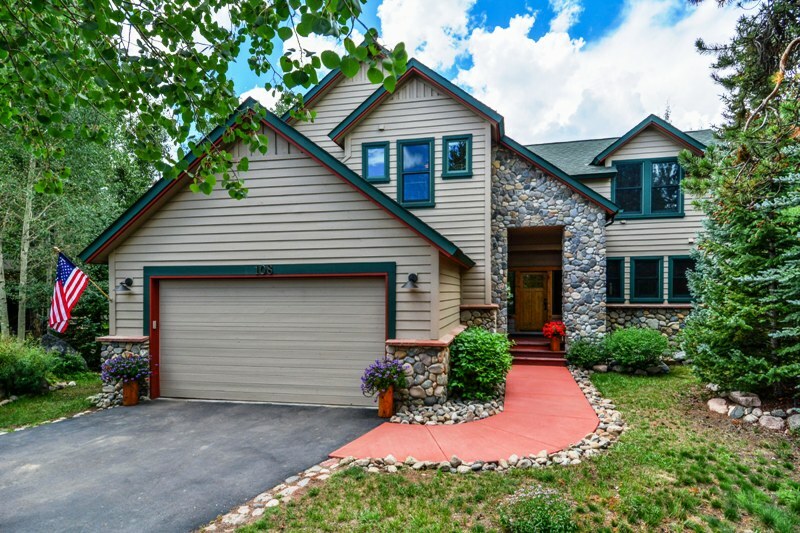 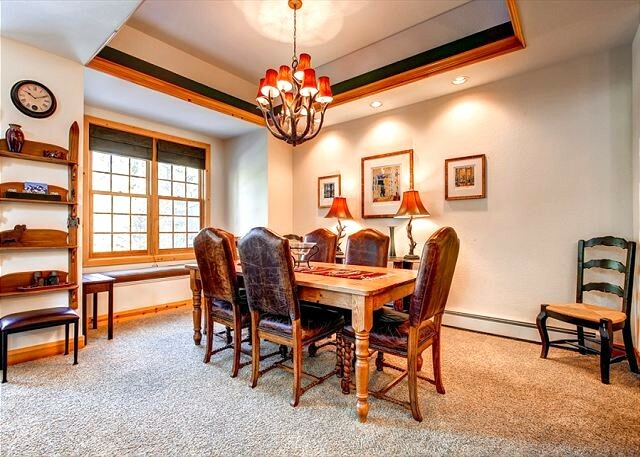 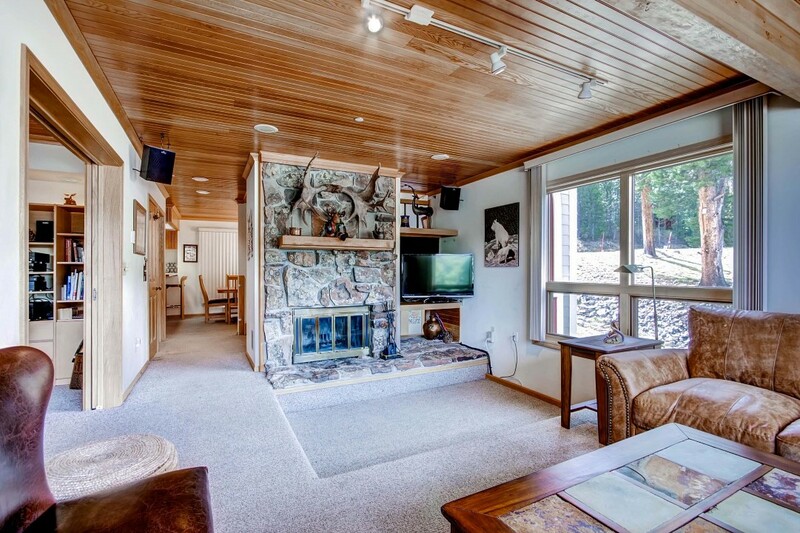 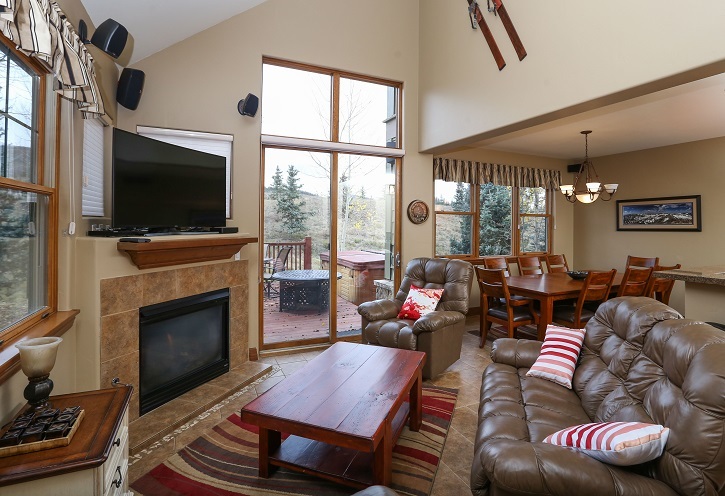 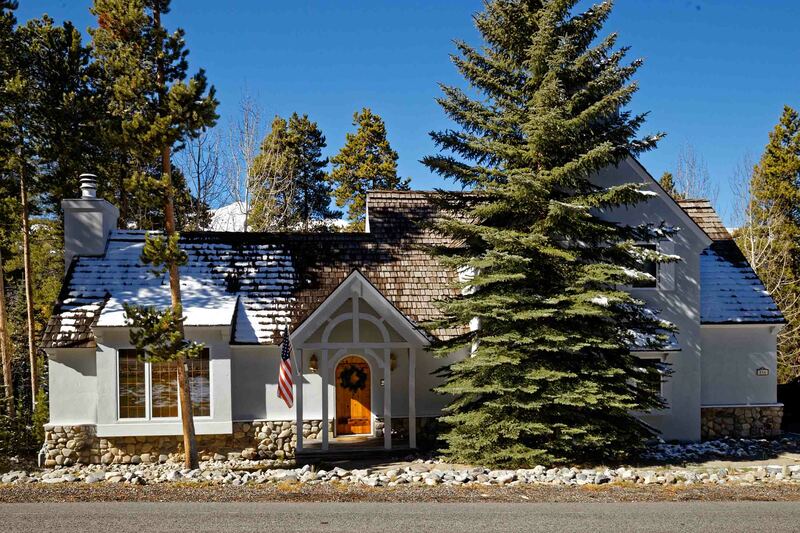 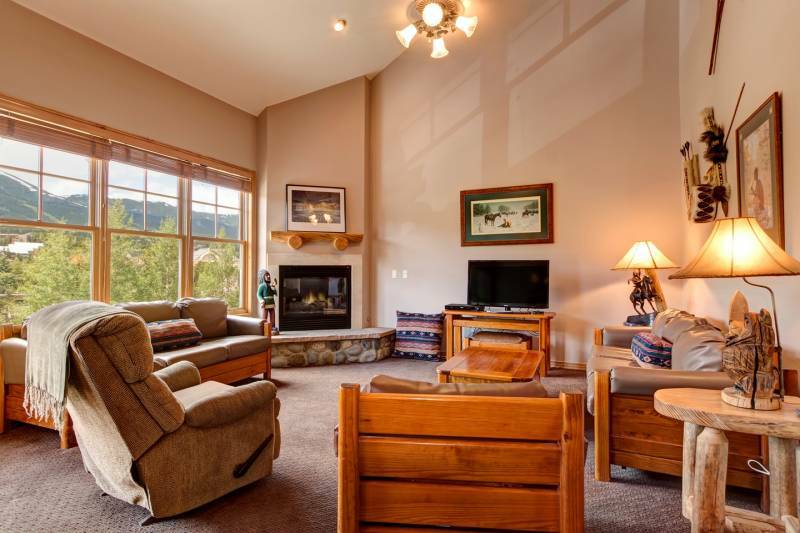 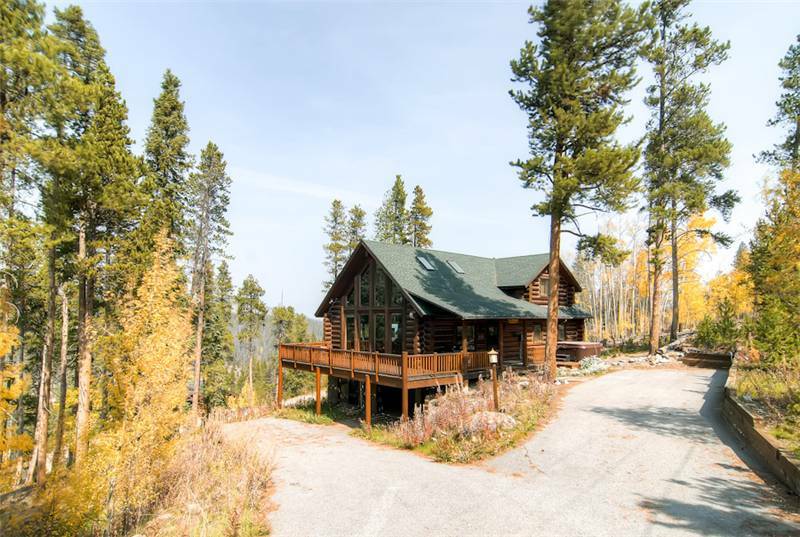 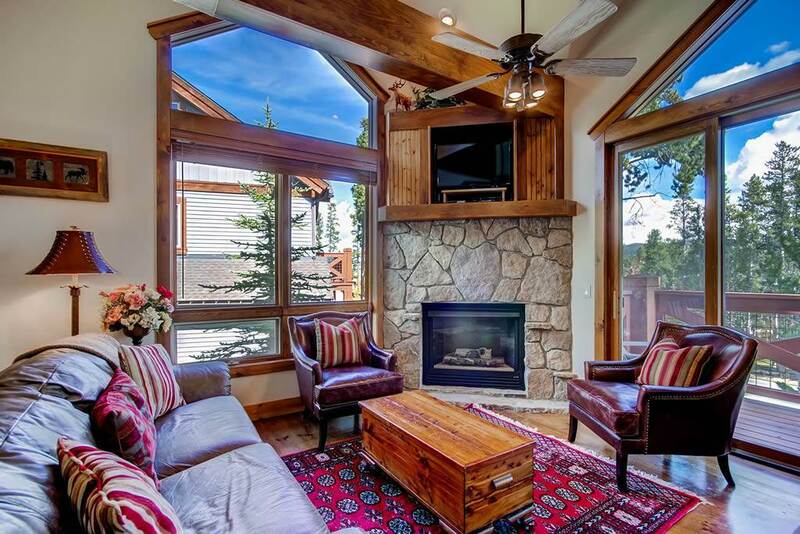 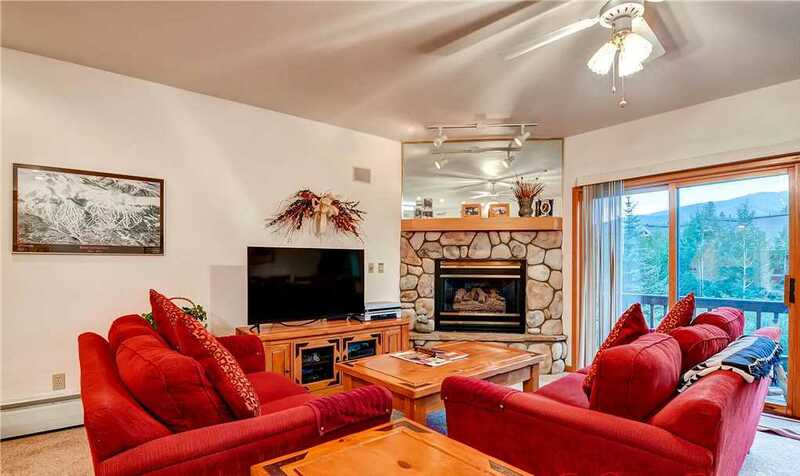 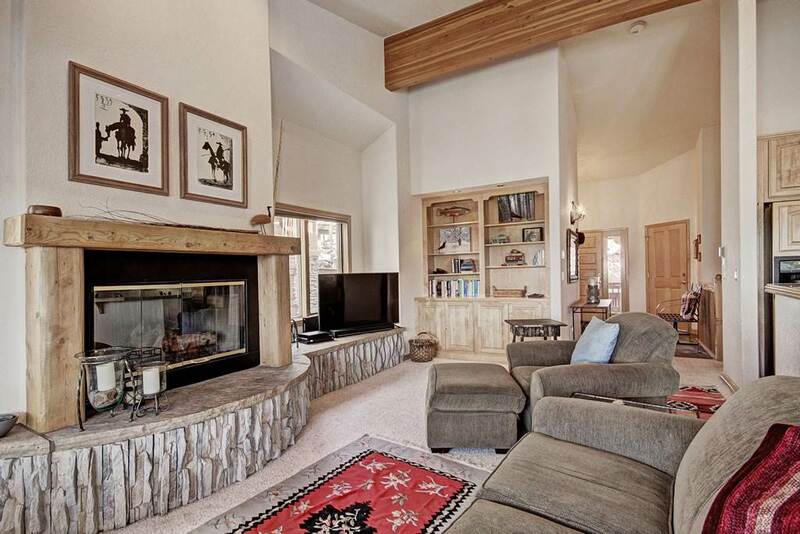 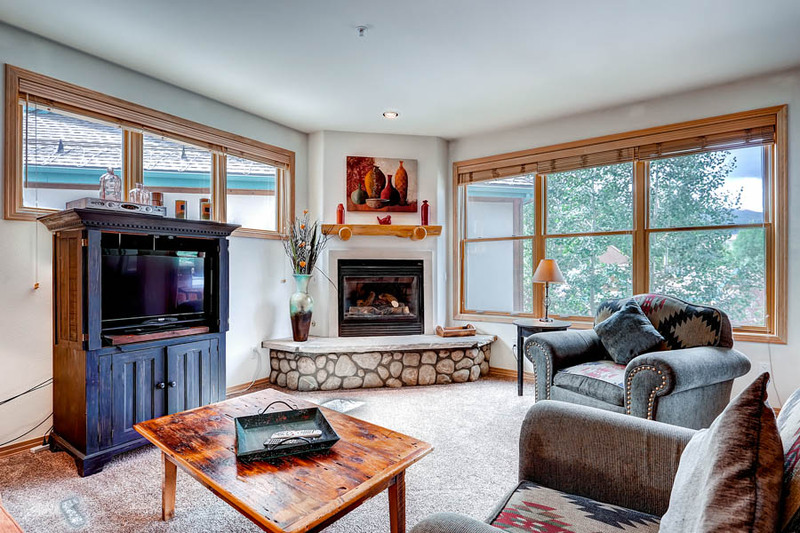 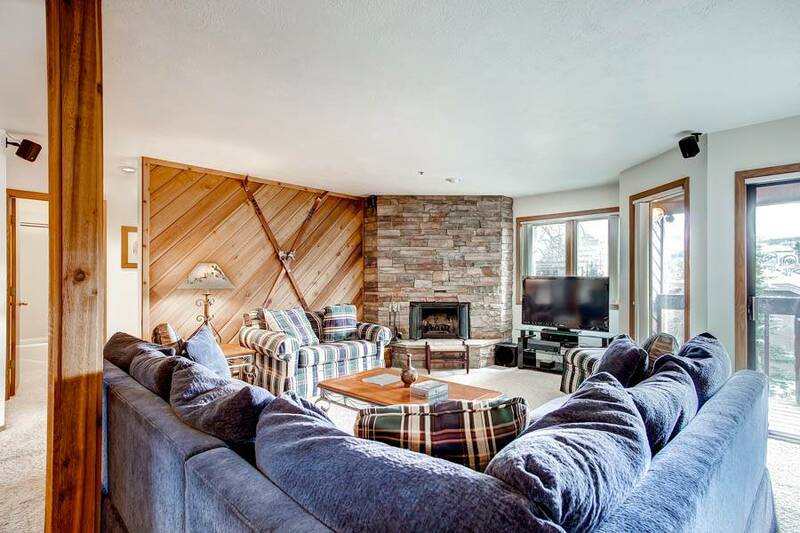 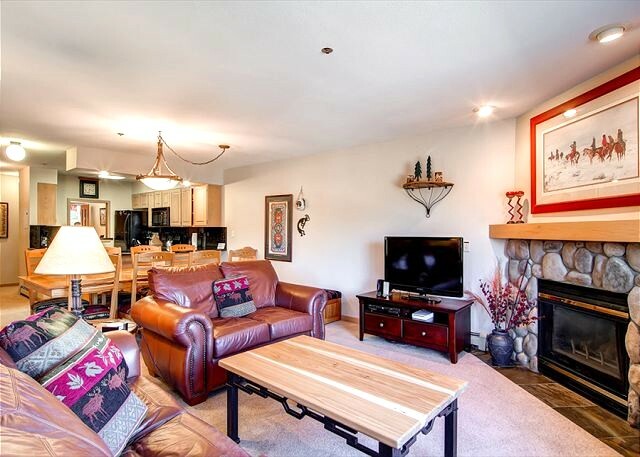 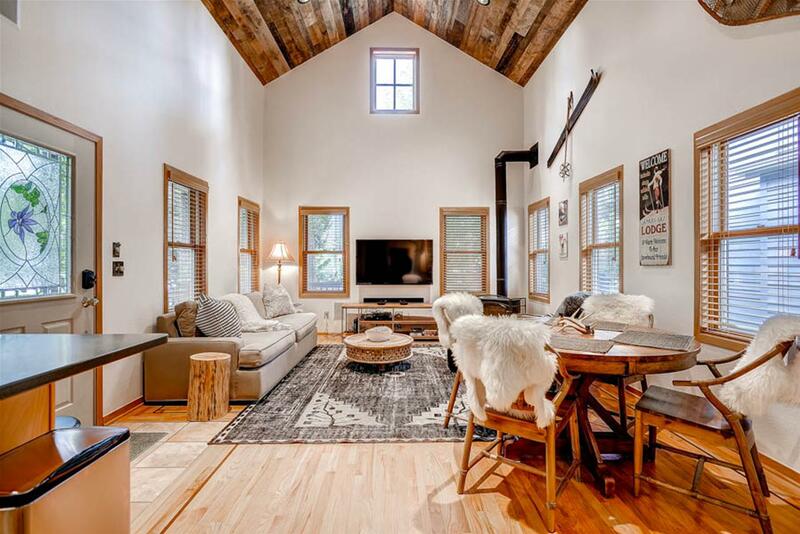 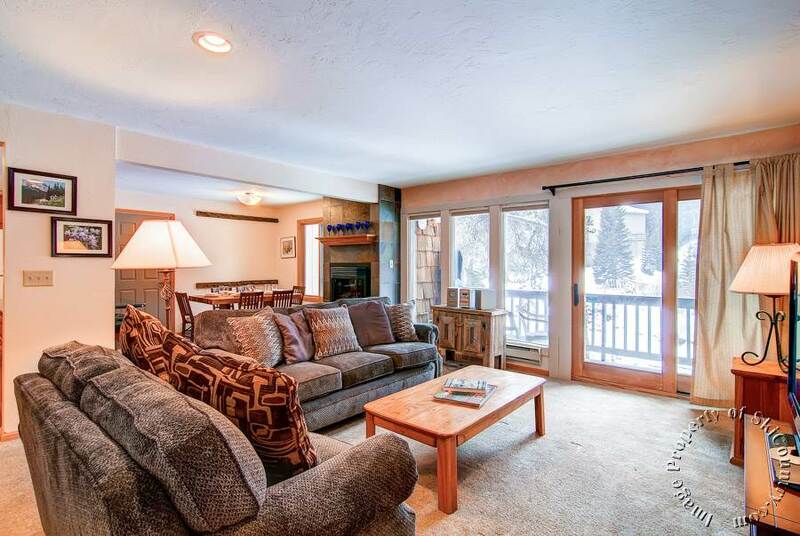 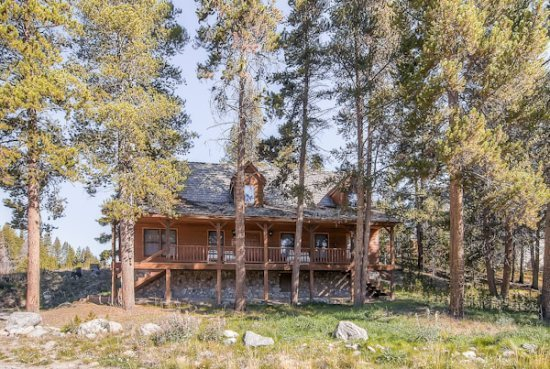 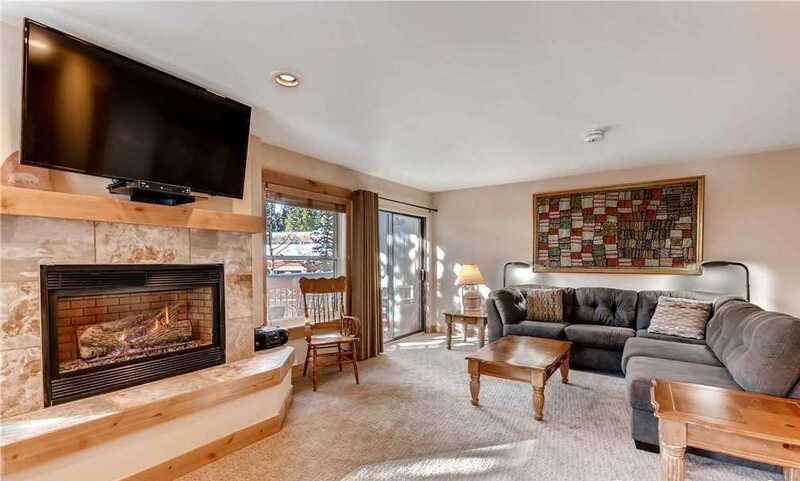 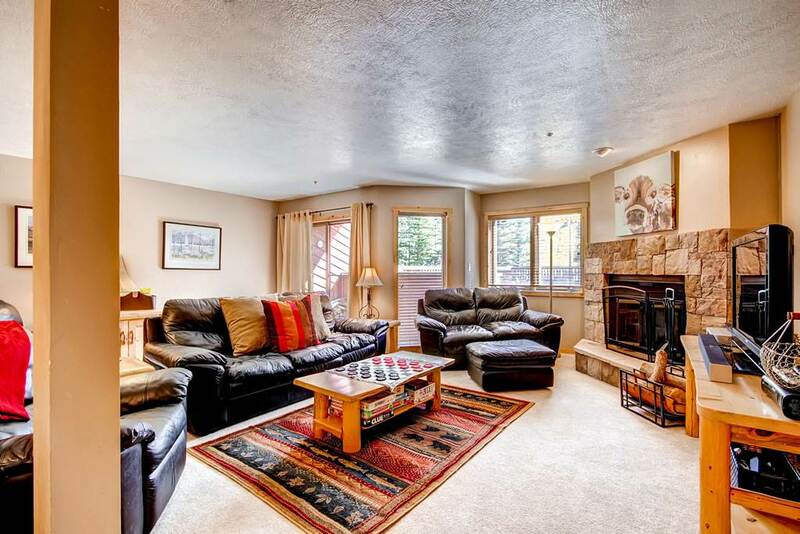 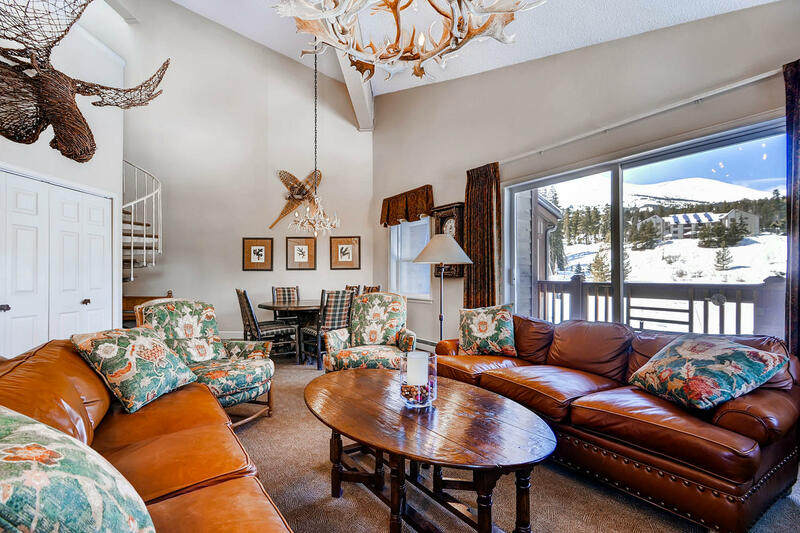 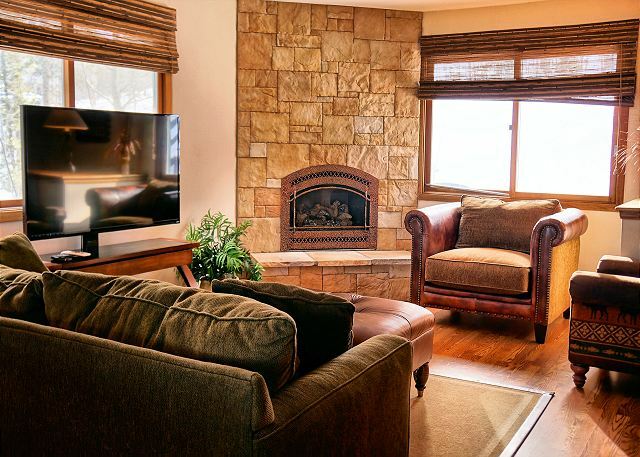 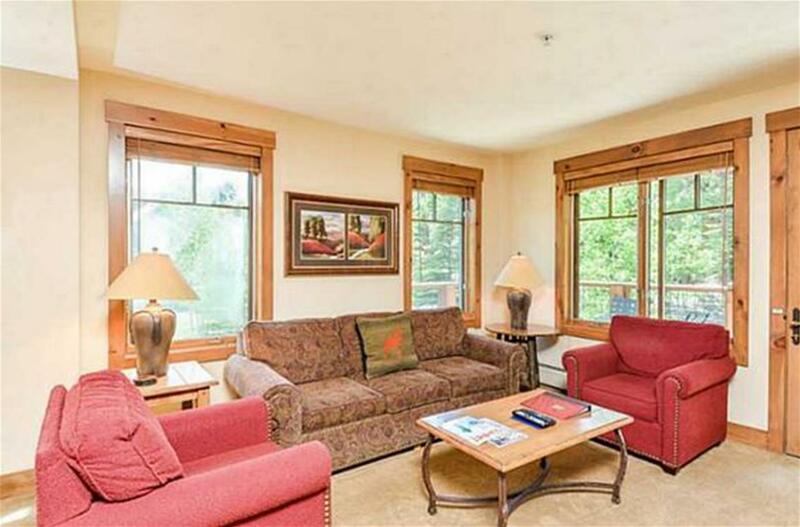 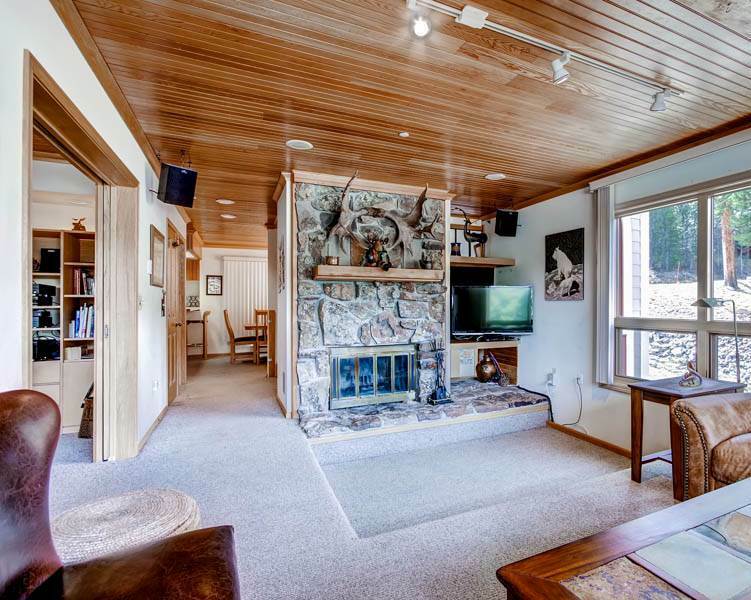 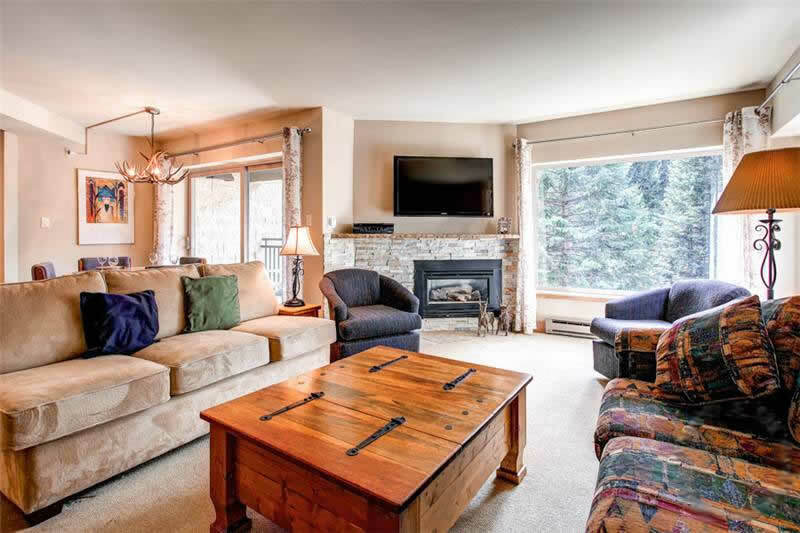 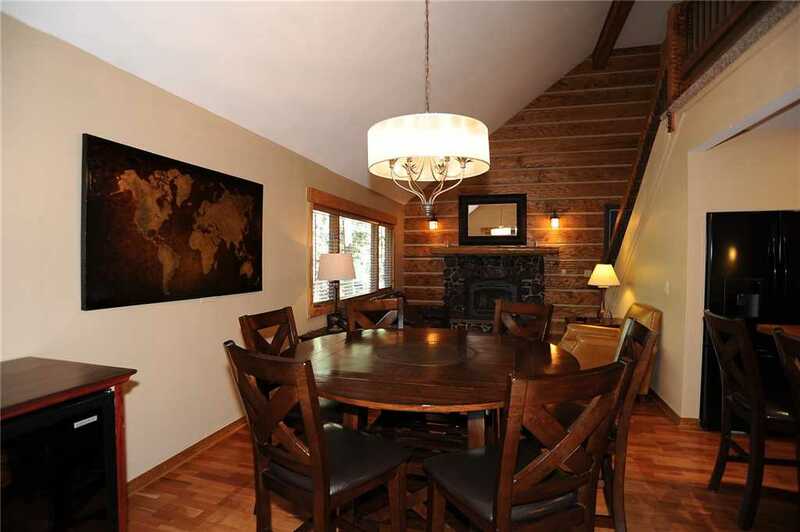 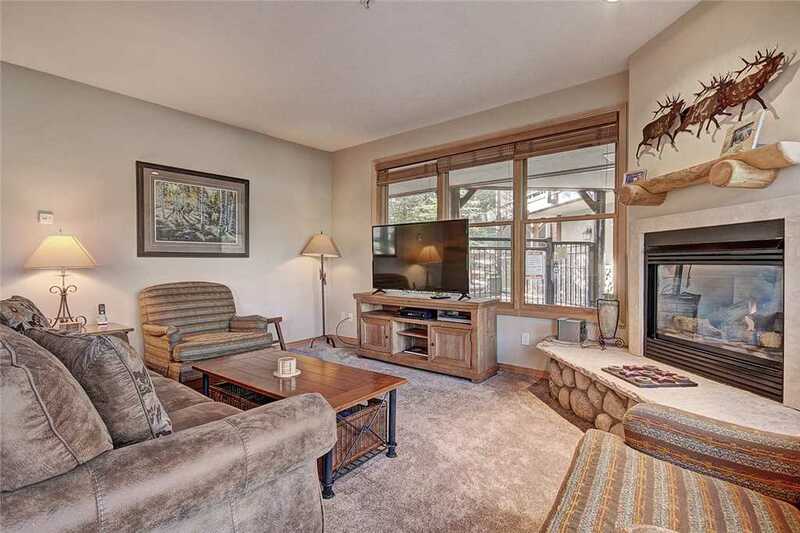 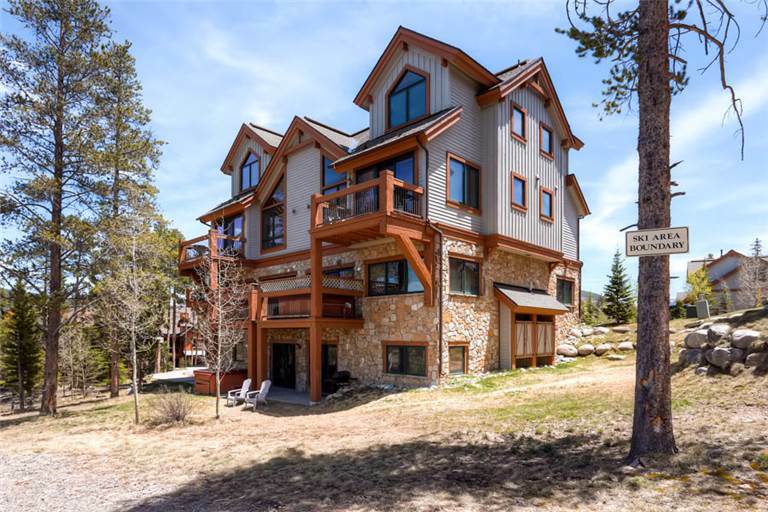 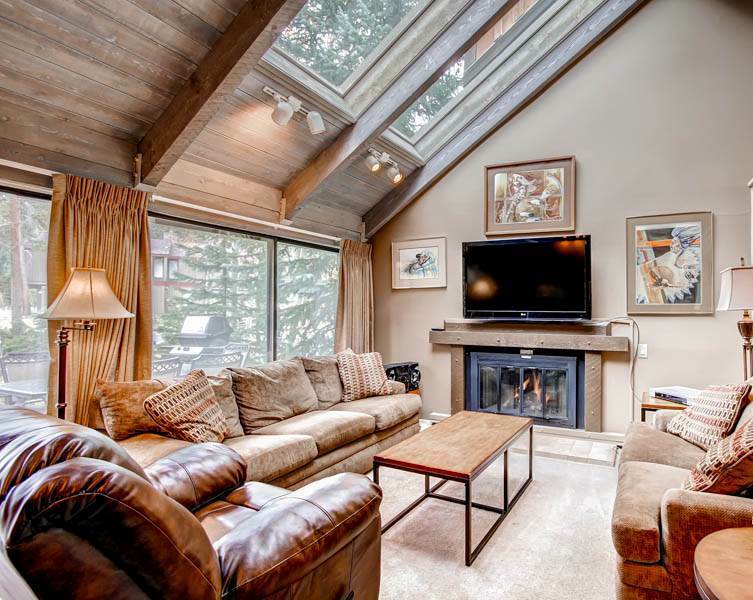 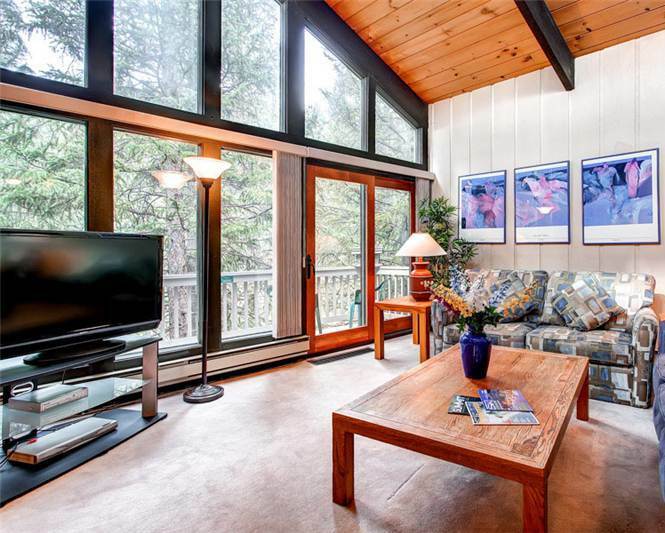 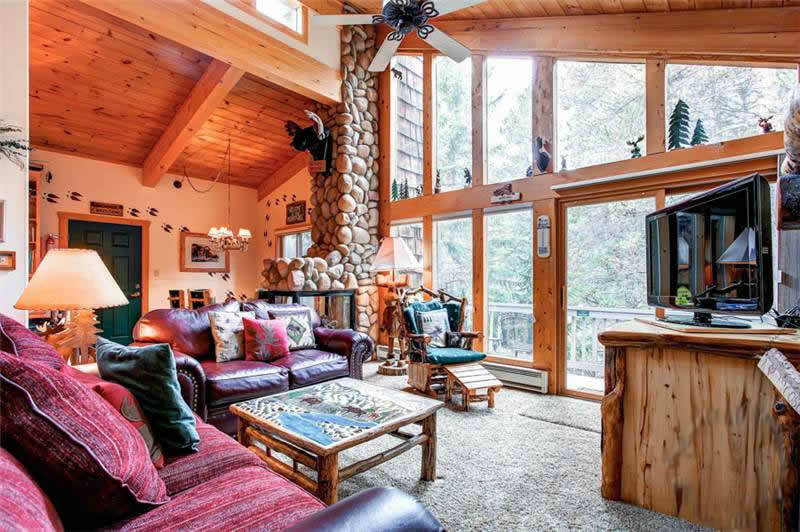 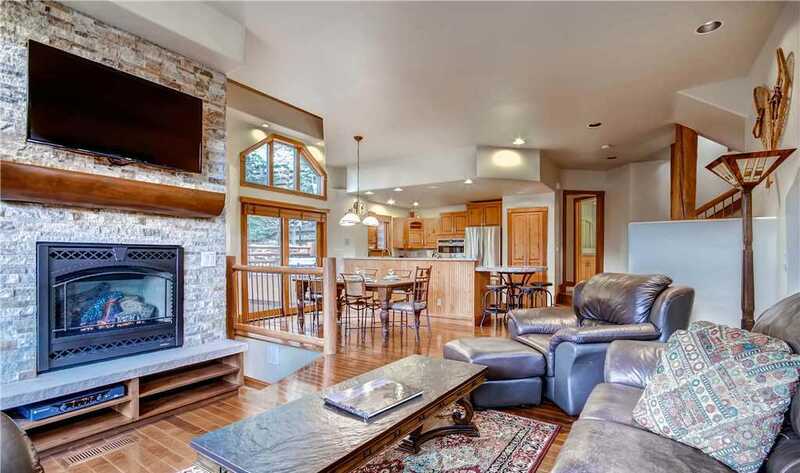 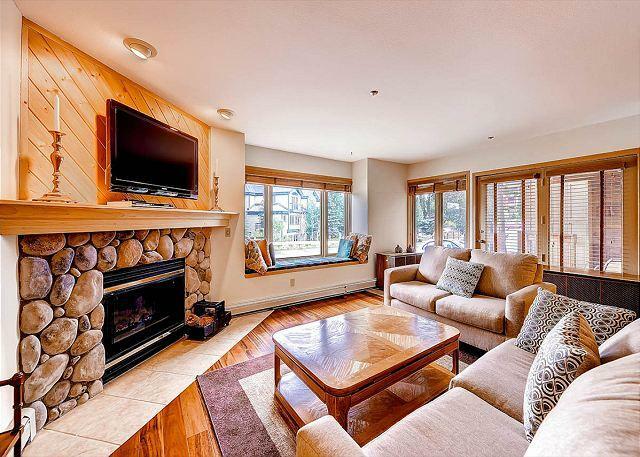 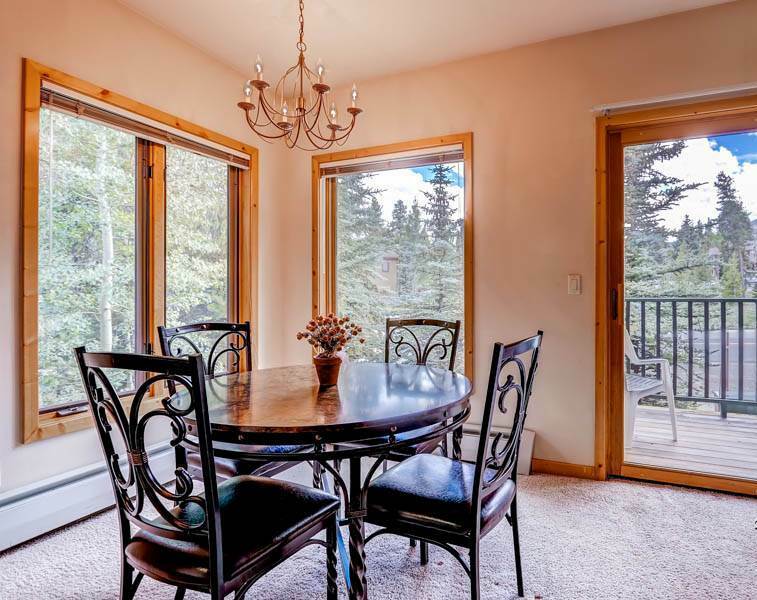 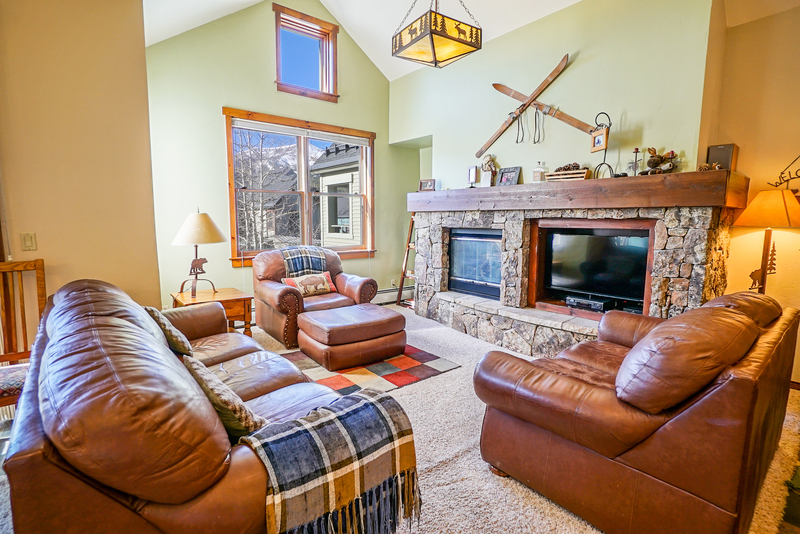 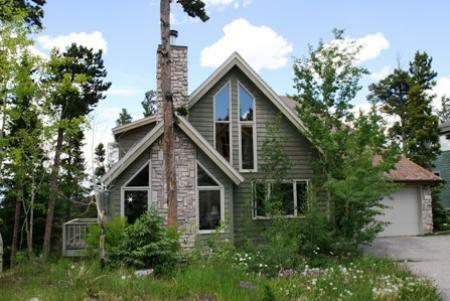 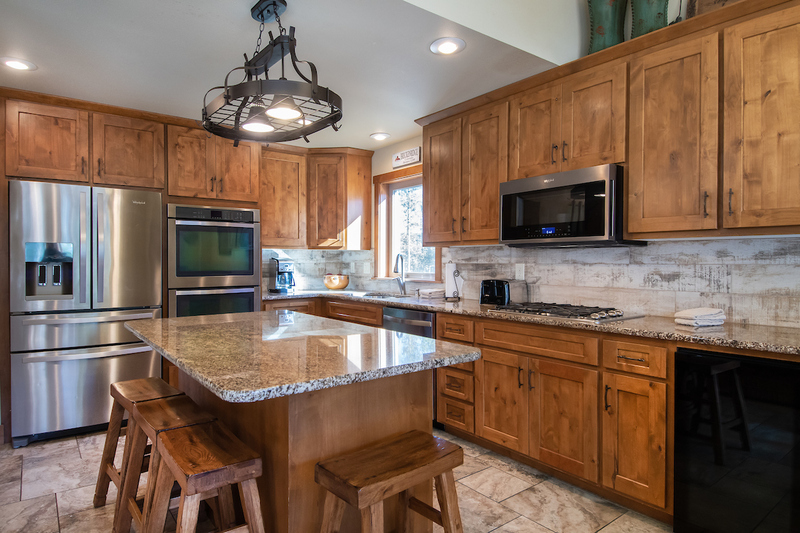 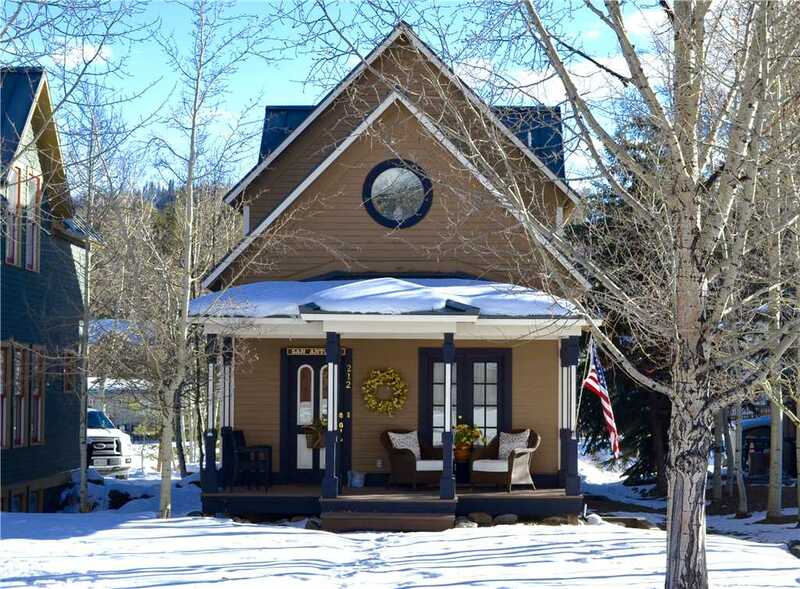 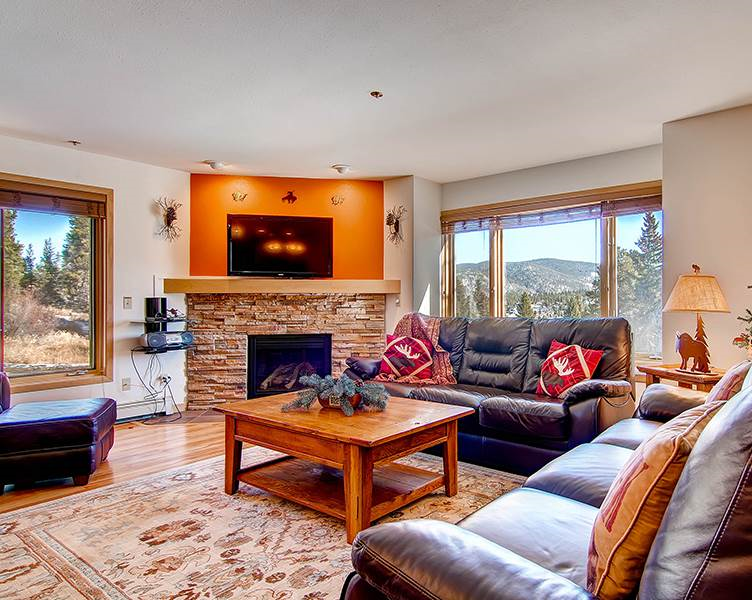 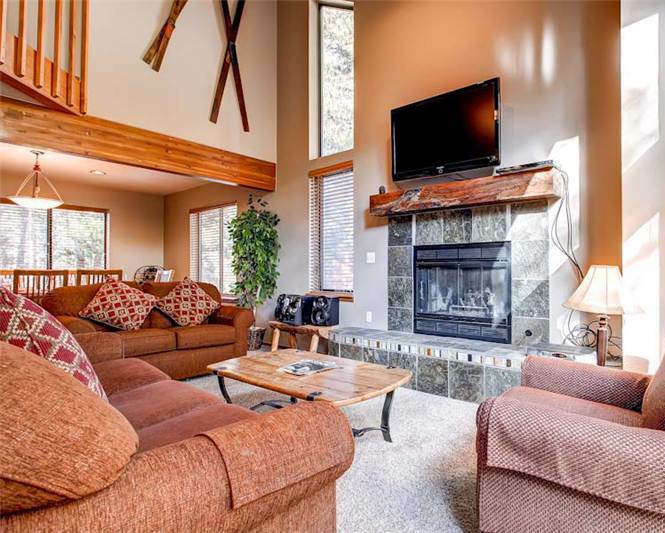 Less than a mile from the Mountain House ski area base (10 min walk) and on the shuttle route (2 min drive), this property is both convenient and serene. 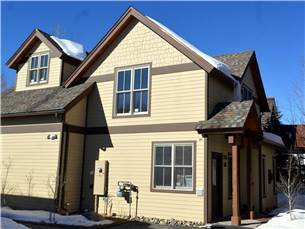 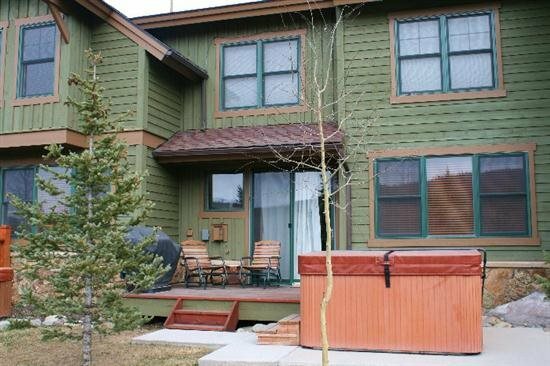 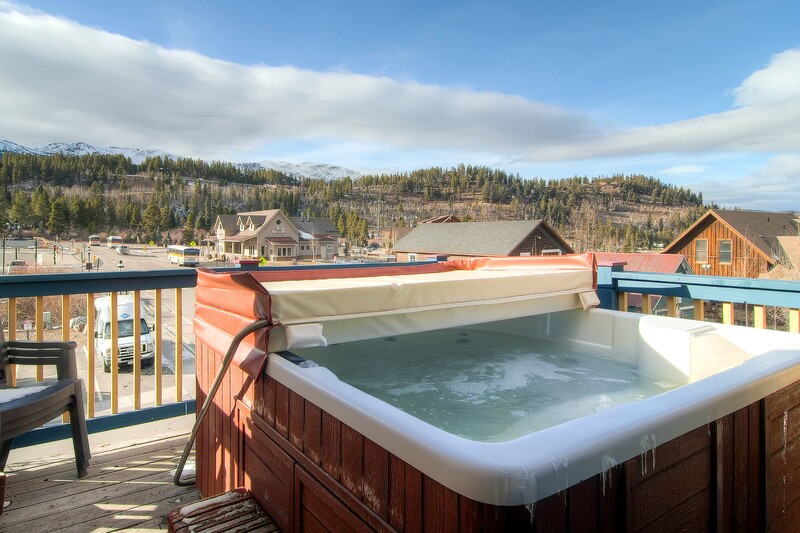 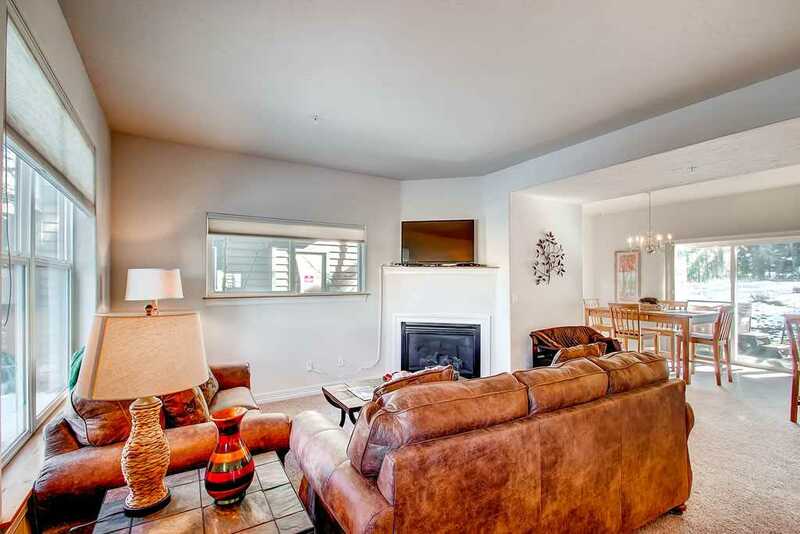 Starfire Townhomes offer access to the Soda Spring outdoor heated pool and hot tub, located just down the street. 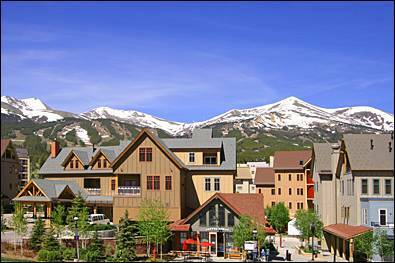 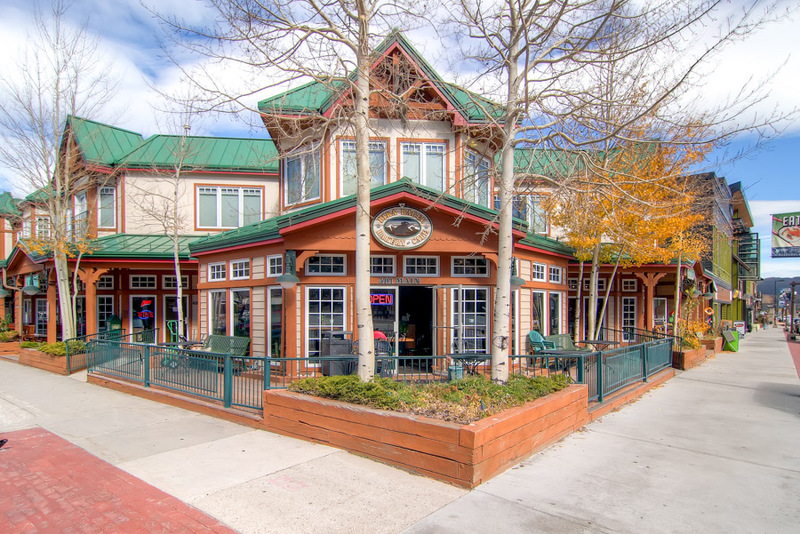 The shuttle stop is right out your door for easy access to all Keystone has to offer. 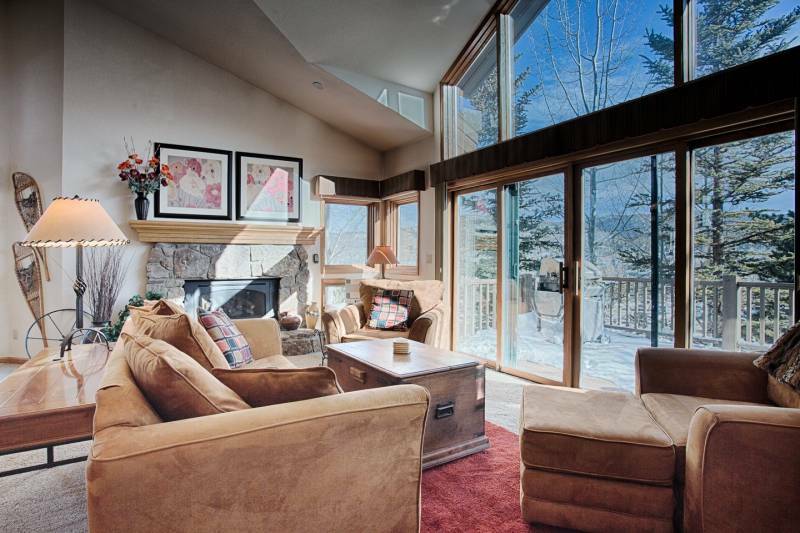 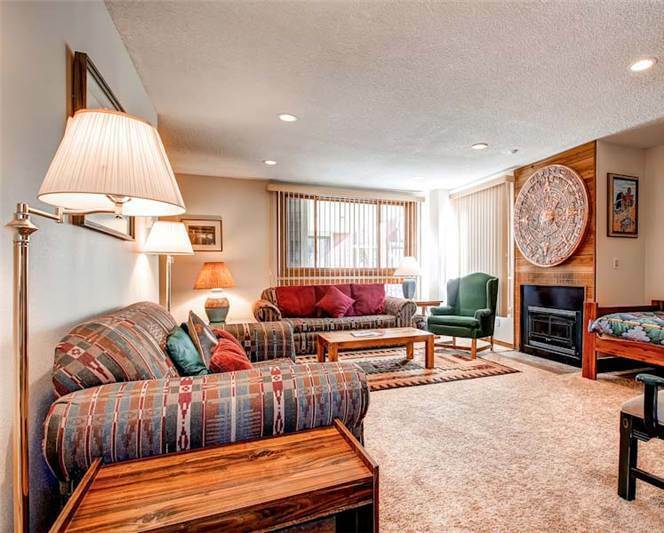 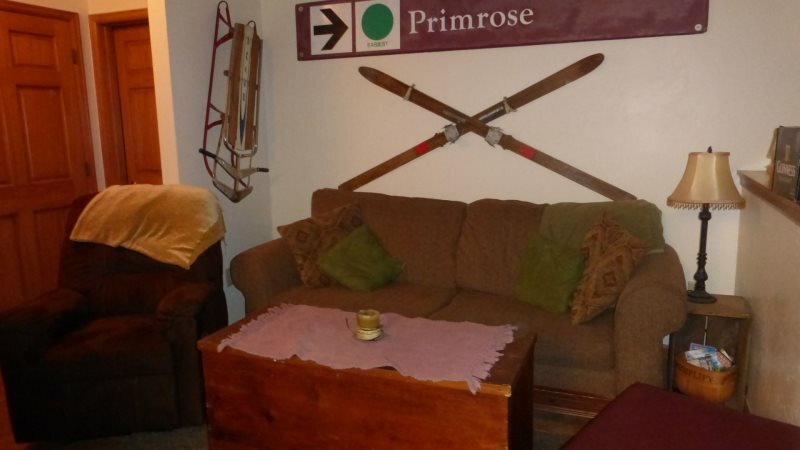 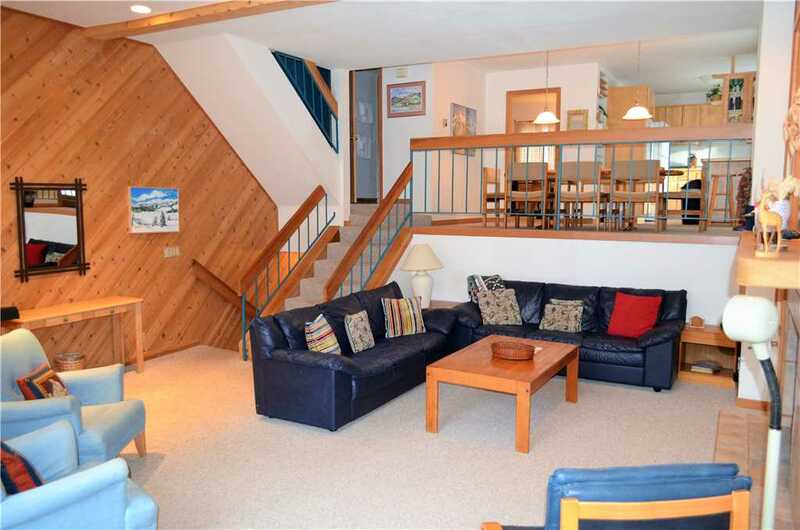 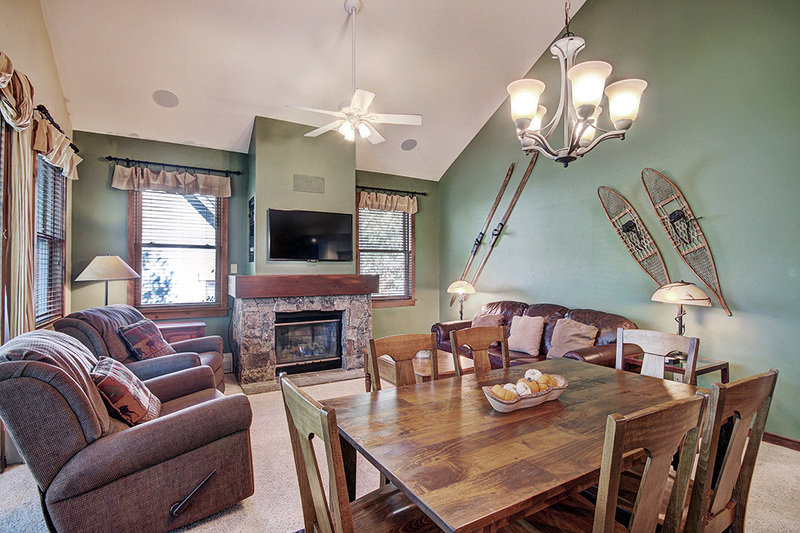 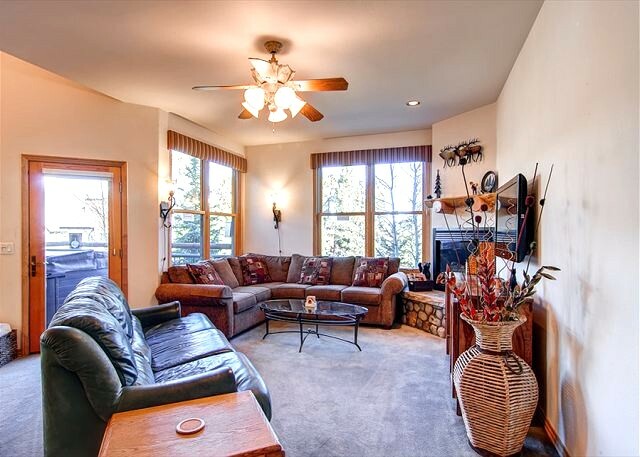 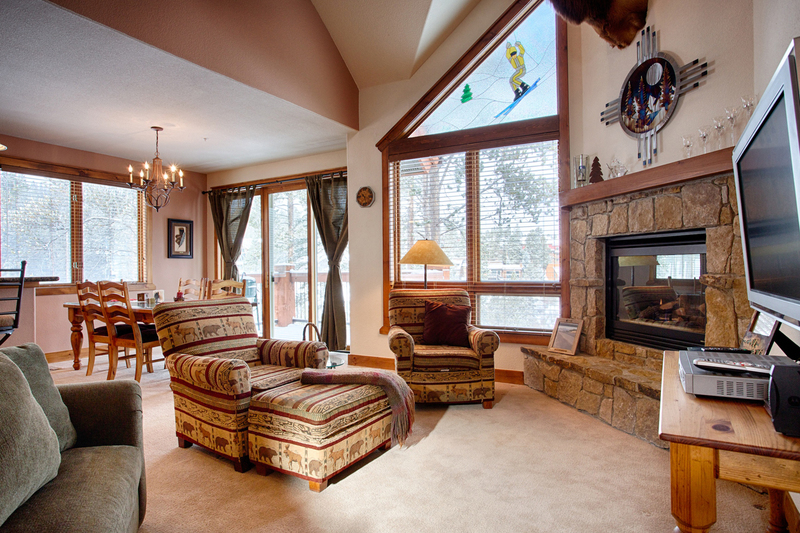 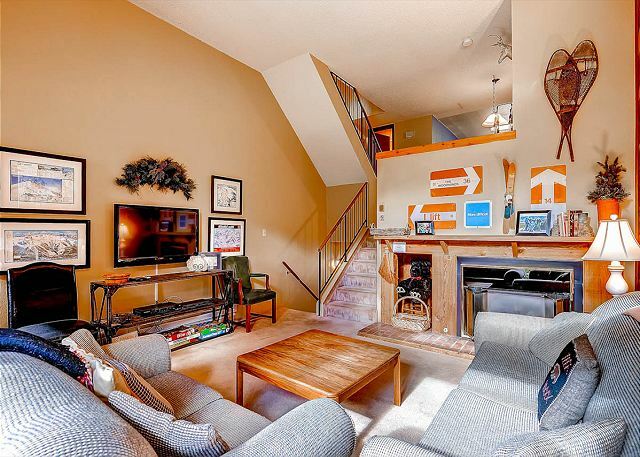 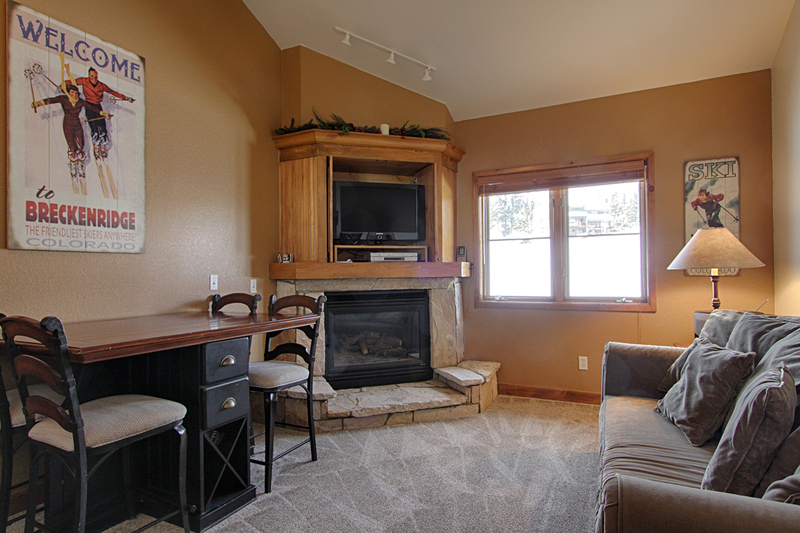 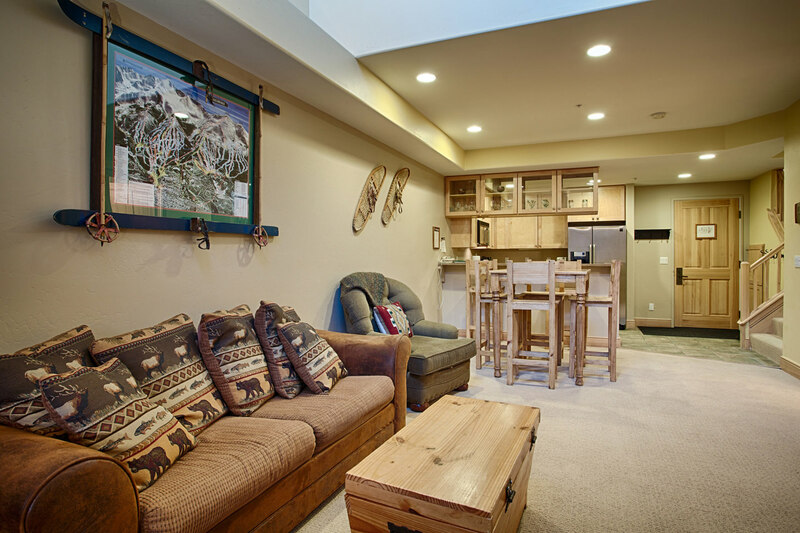 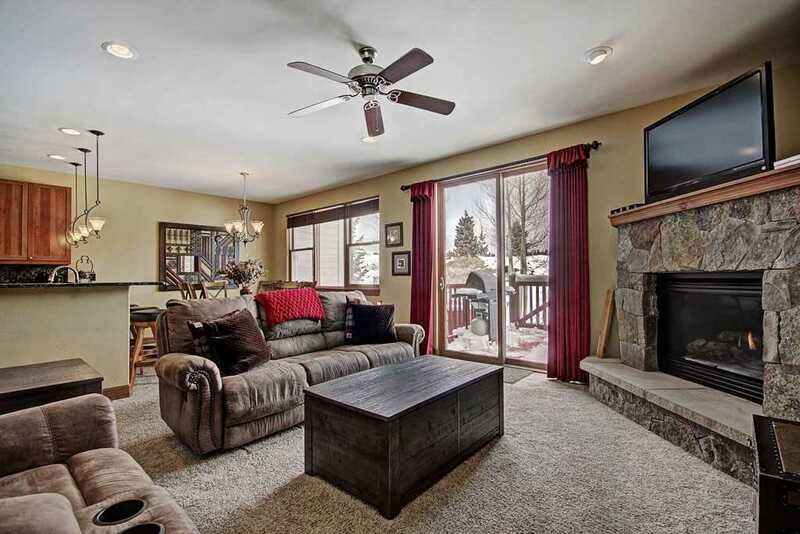 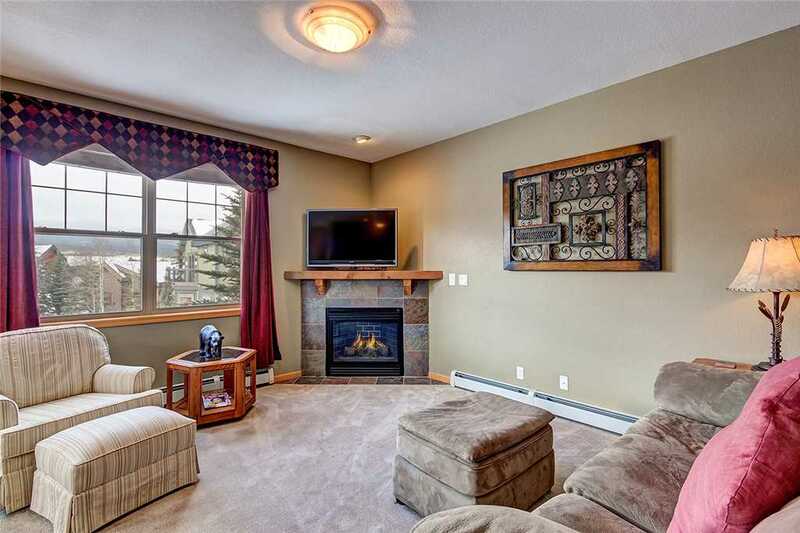 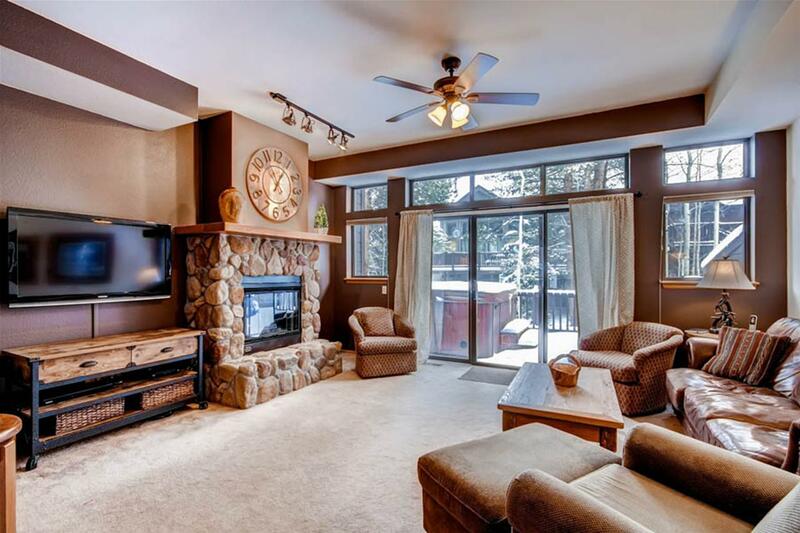 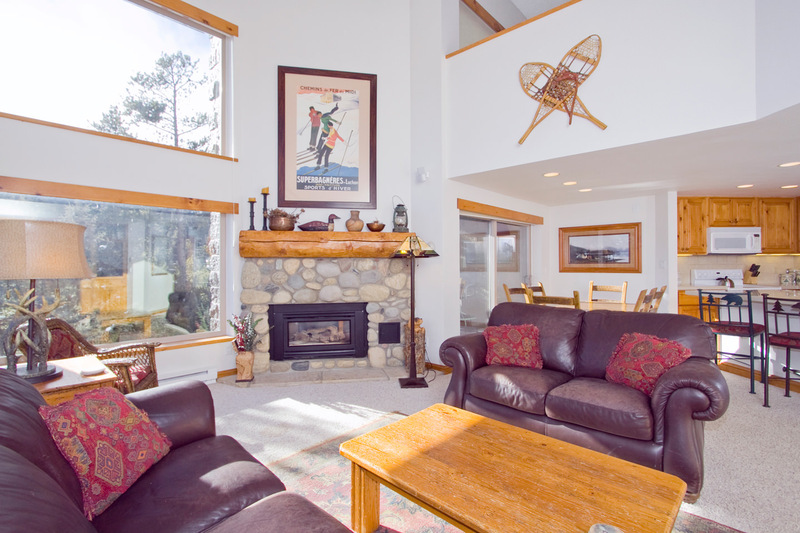 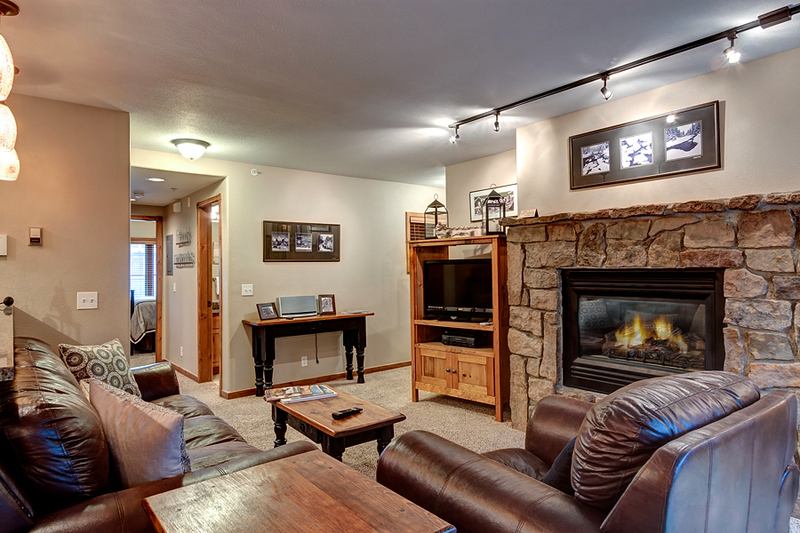 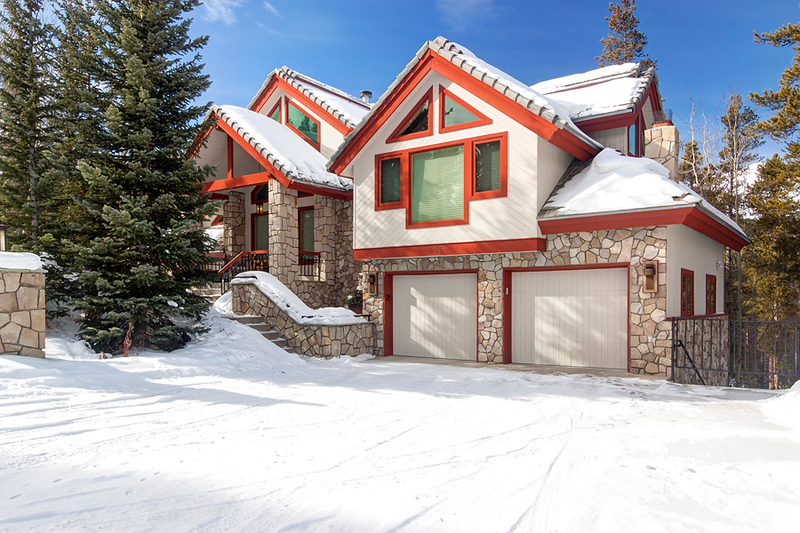 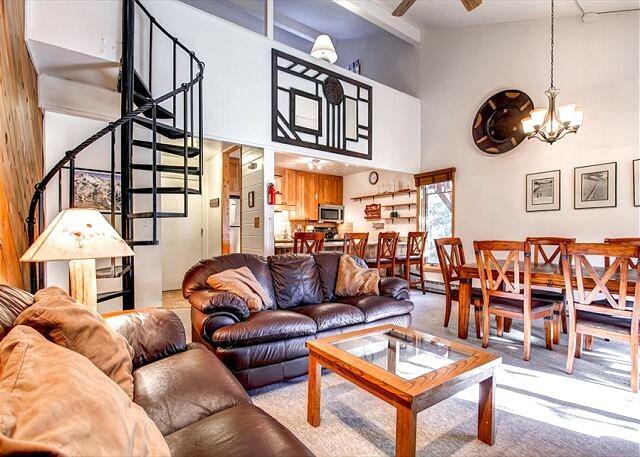 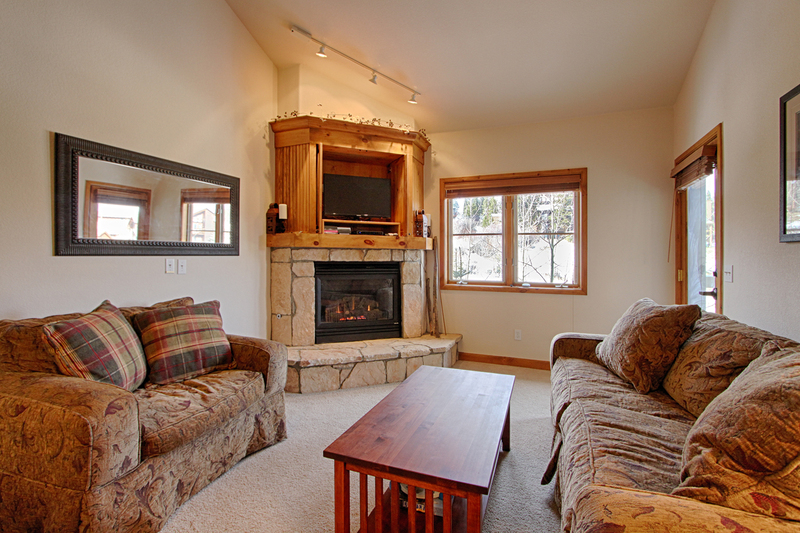 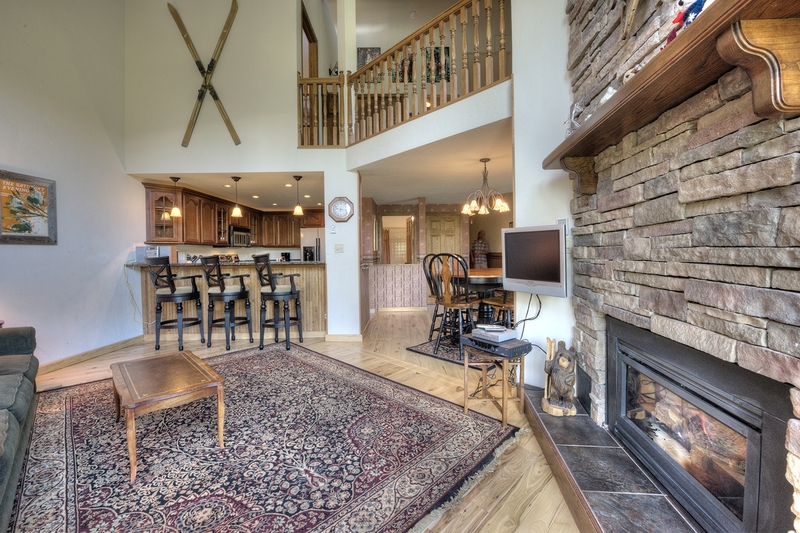 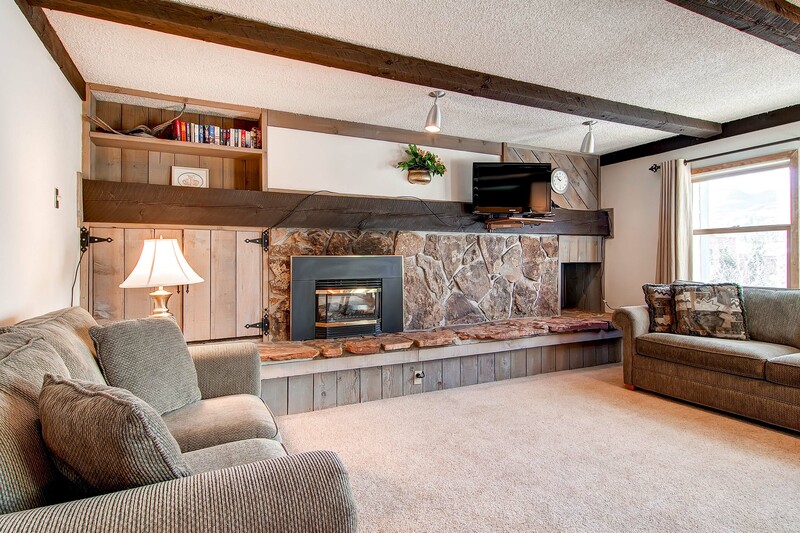 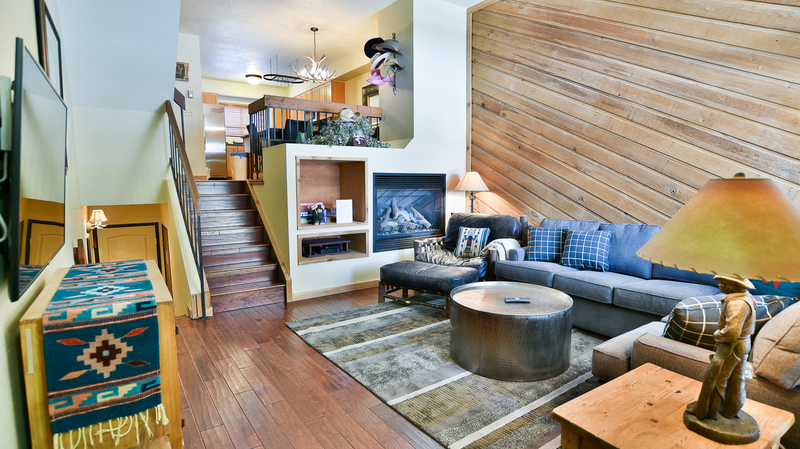 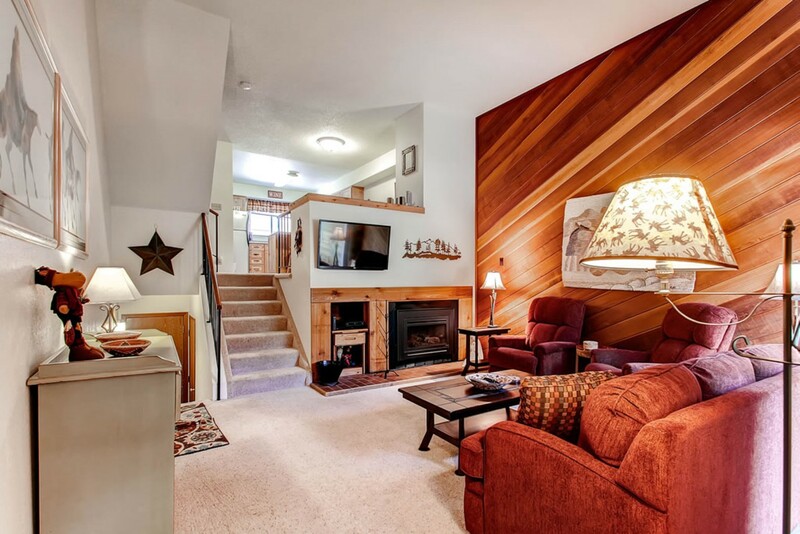 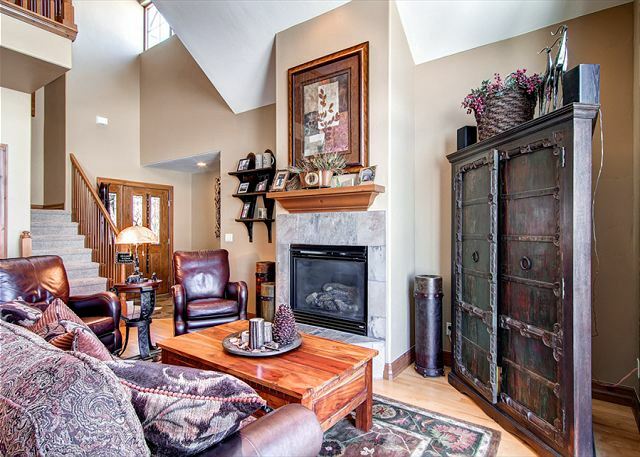 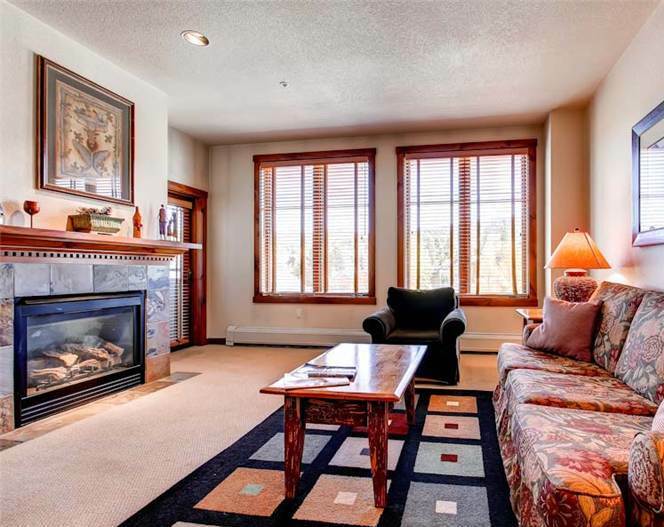 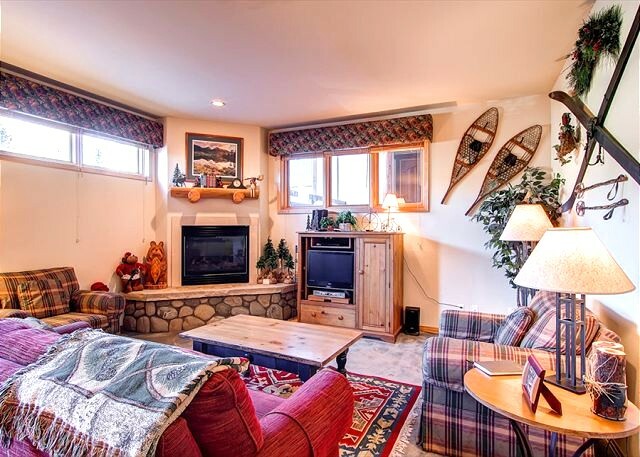 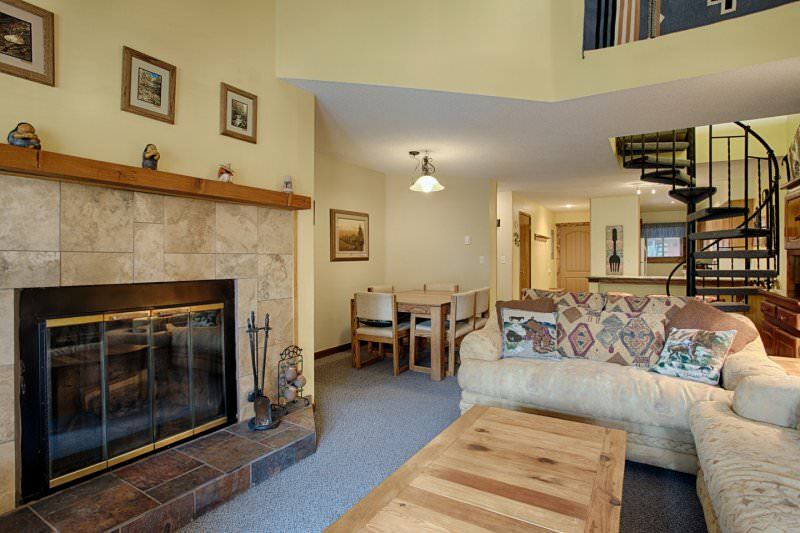 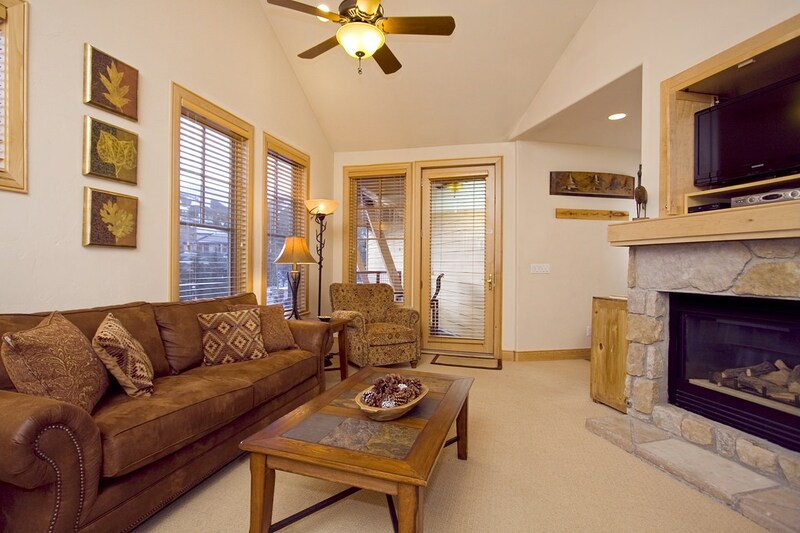 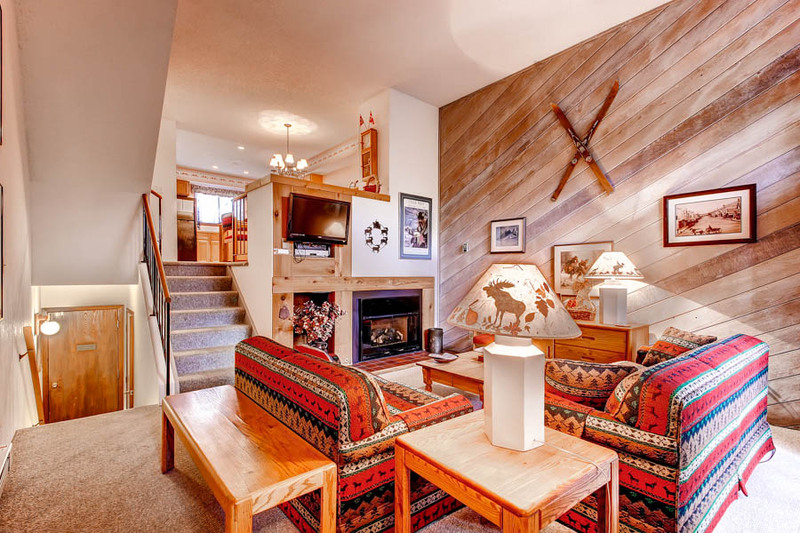 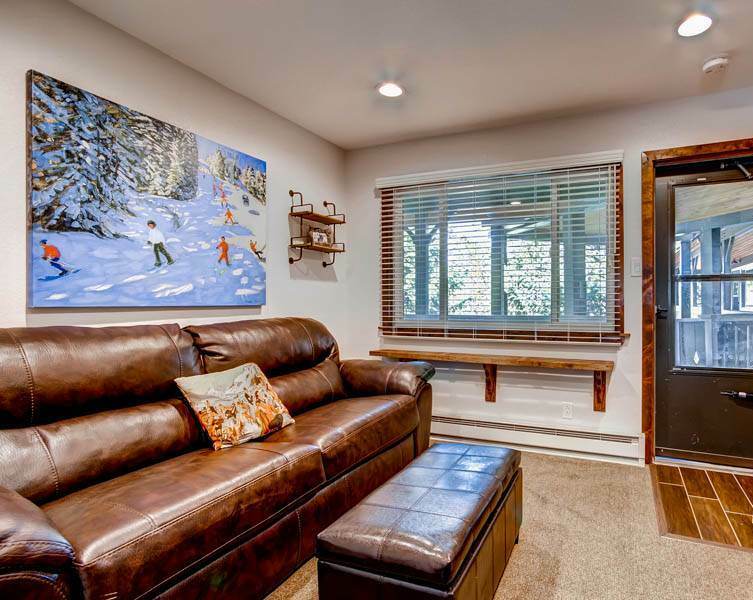 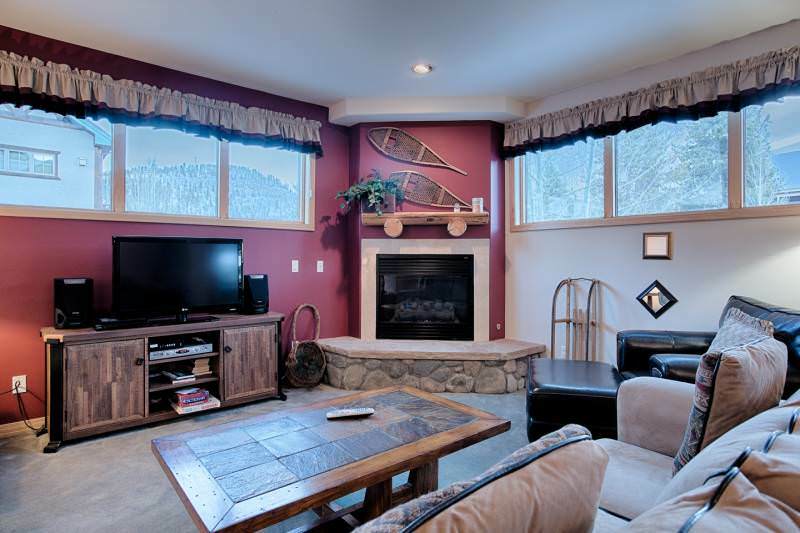 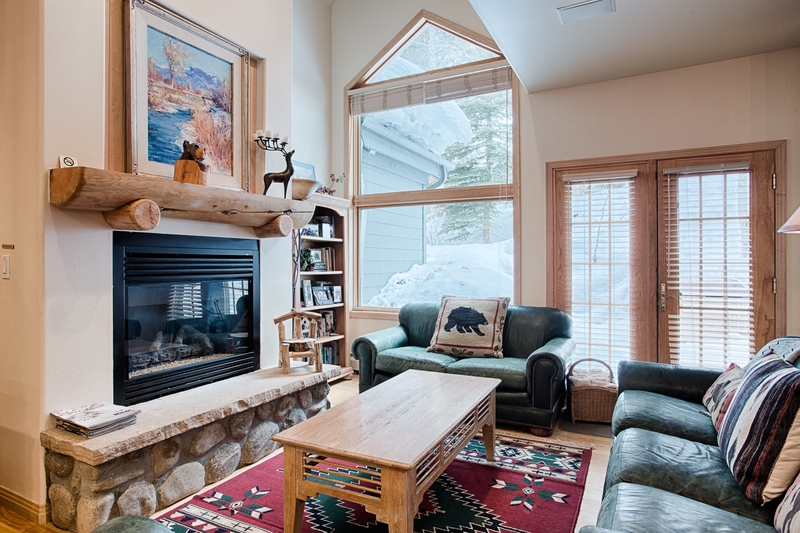 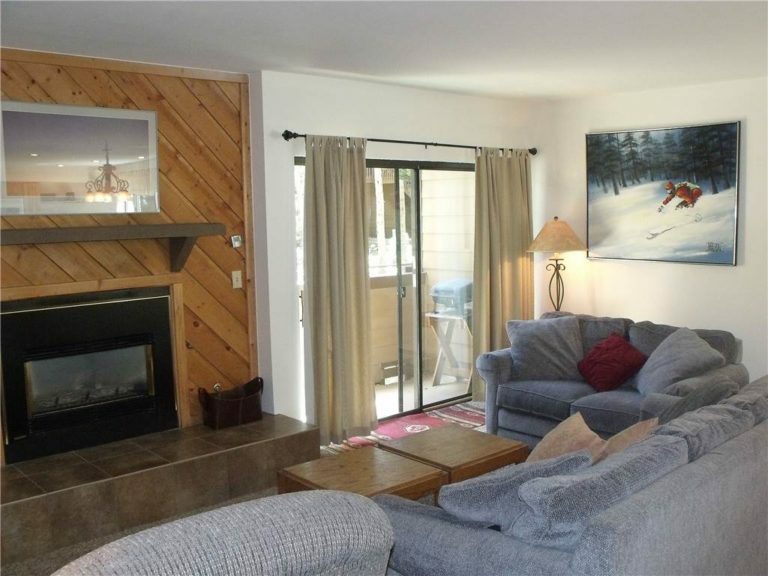 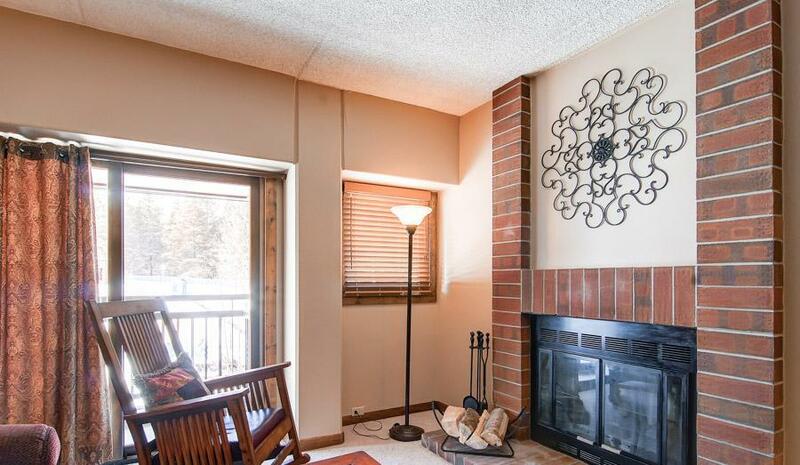 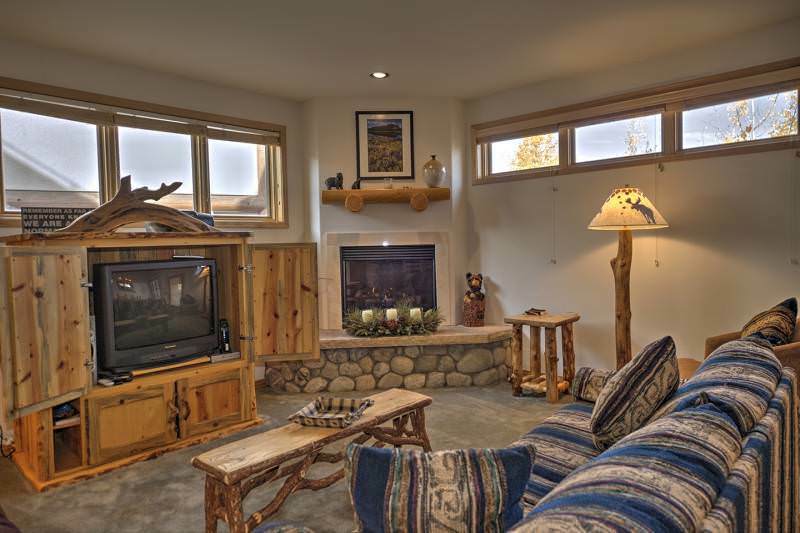 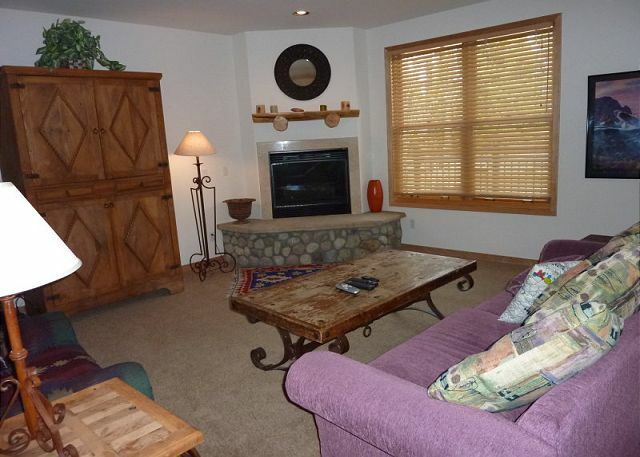 The open entryway includes plenty of storage for your ski clothing as well as a 1/2 bath. 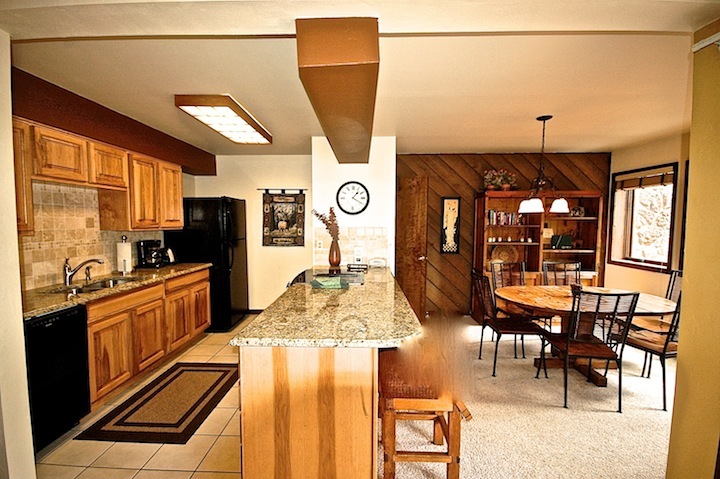 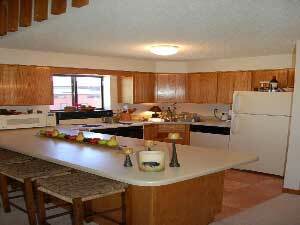 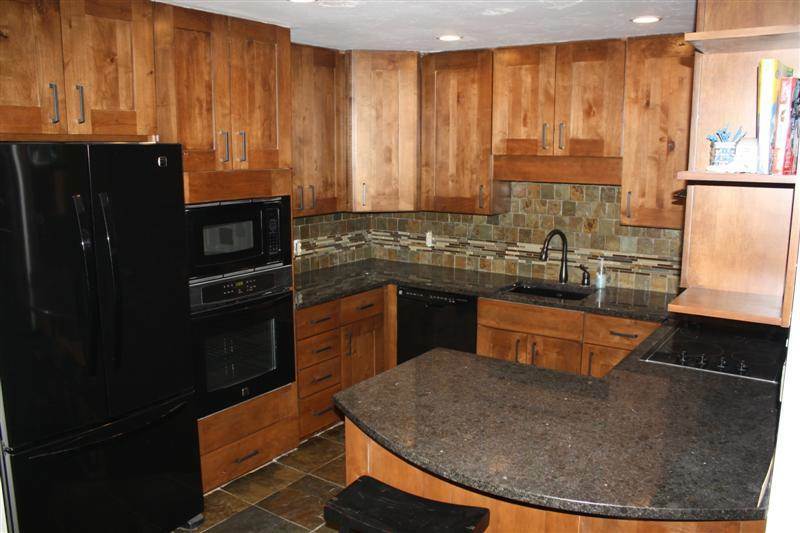 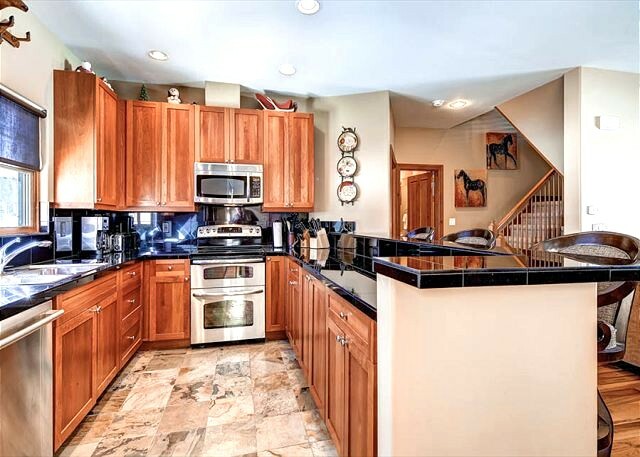 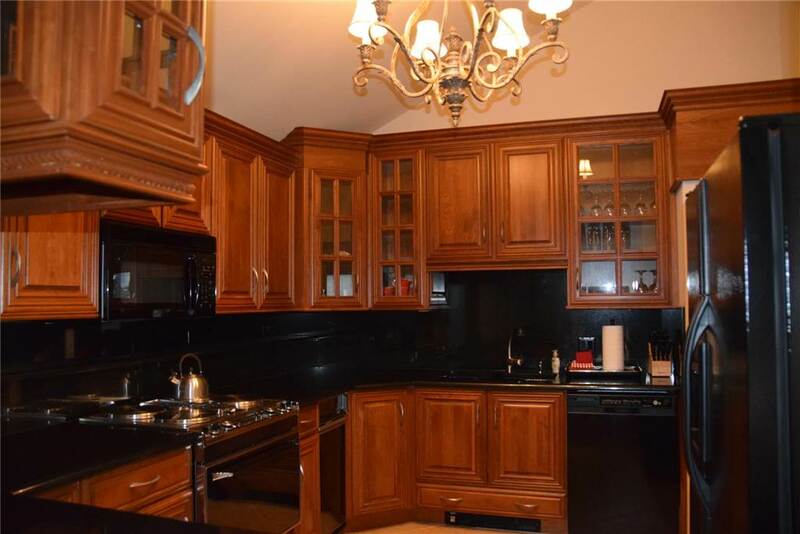 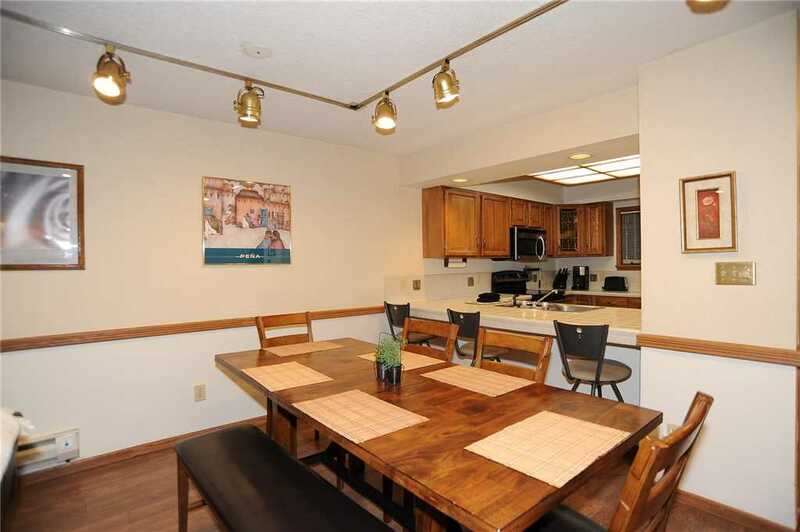 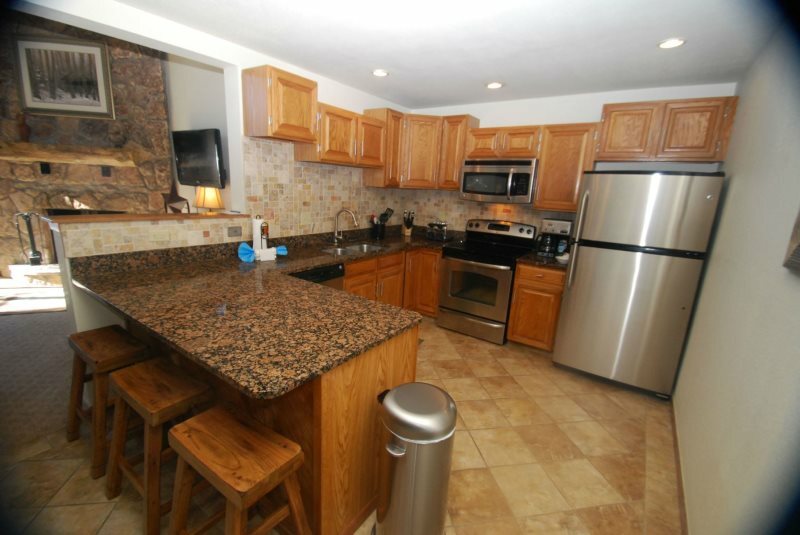 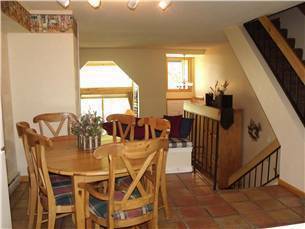 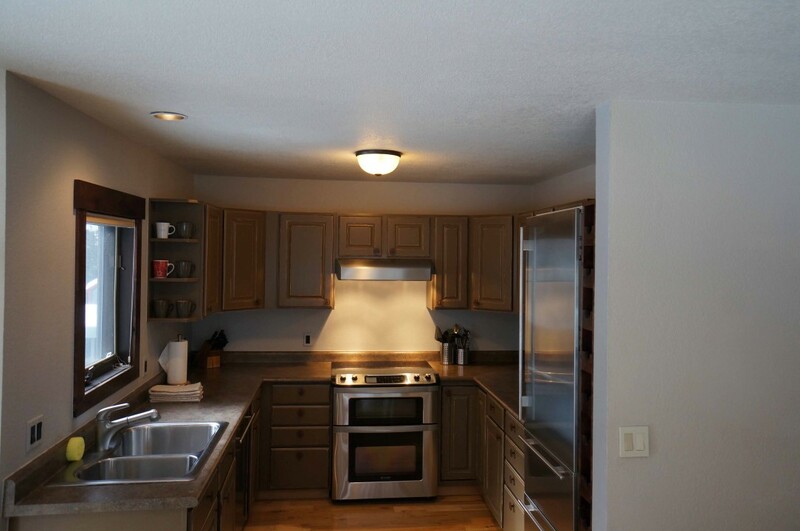 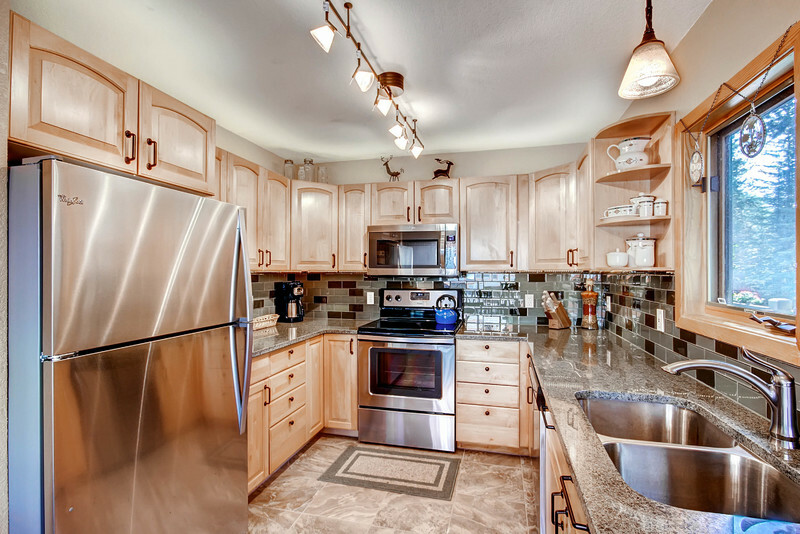 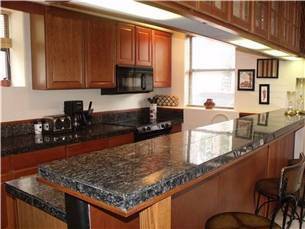 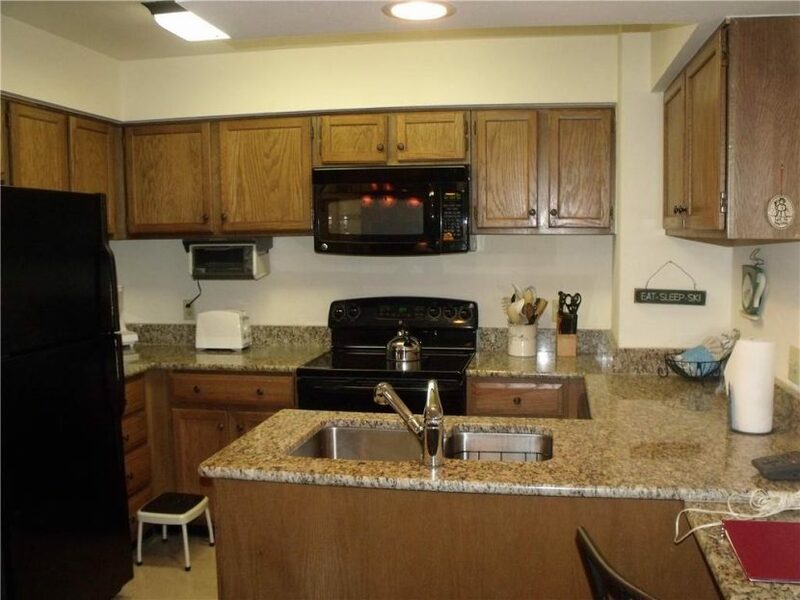 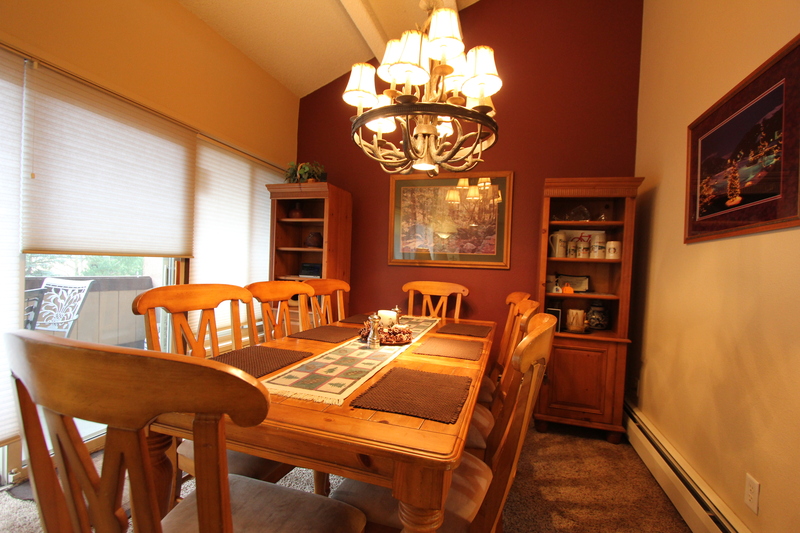 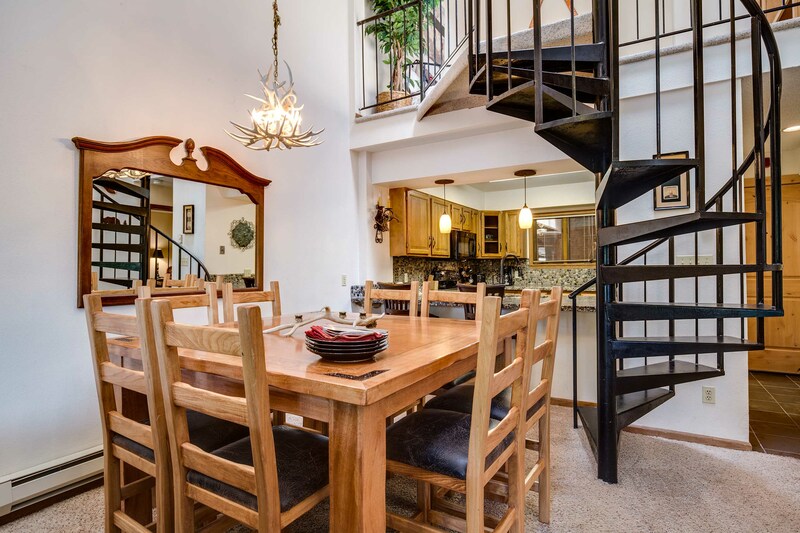 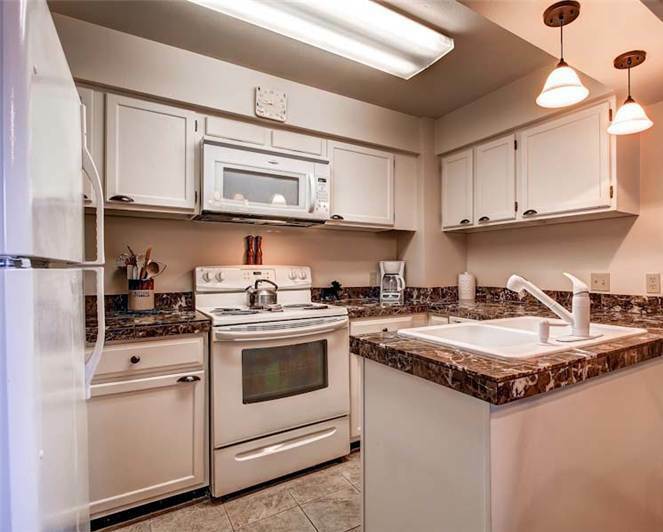 Continue down the short hallway and the fully remodeled kitchen is situated on the left. 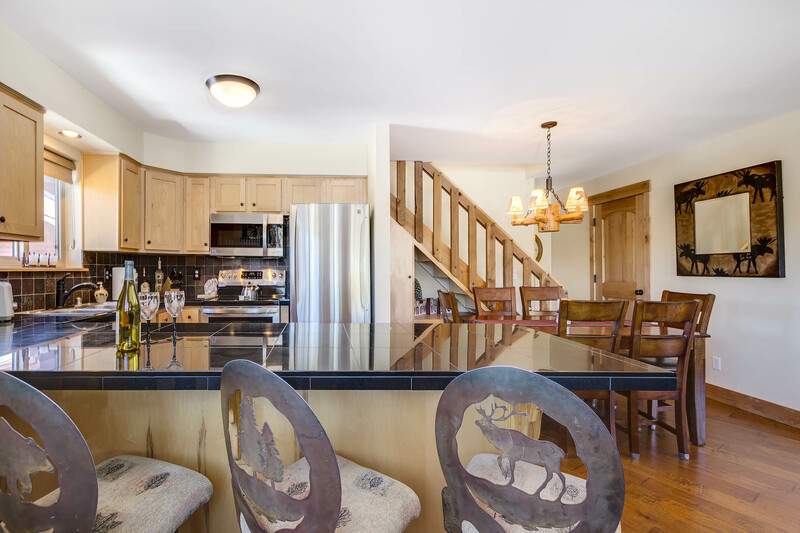 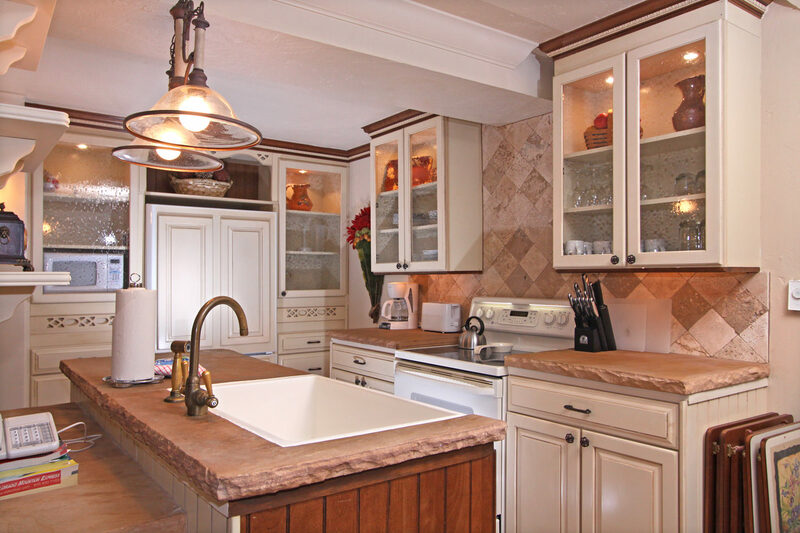 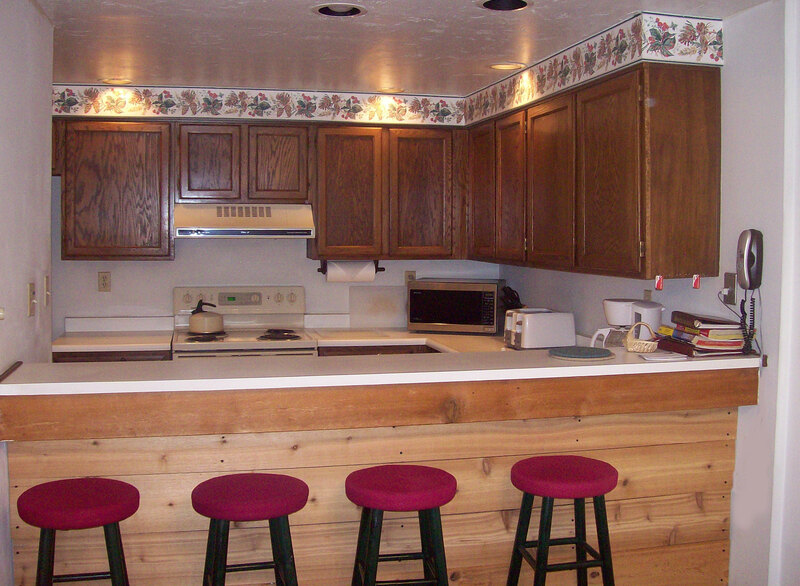 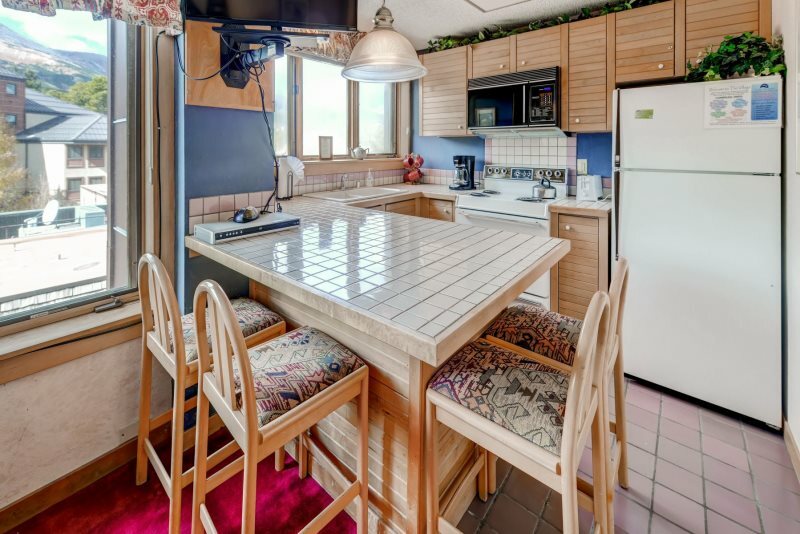 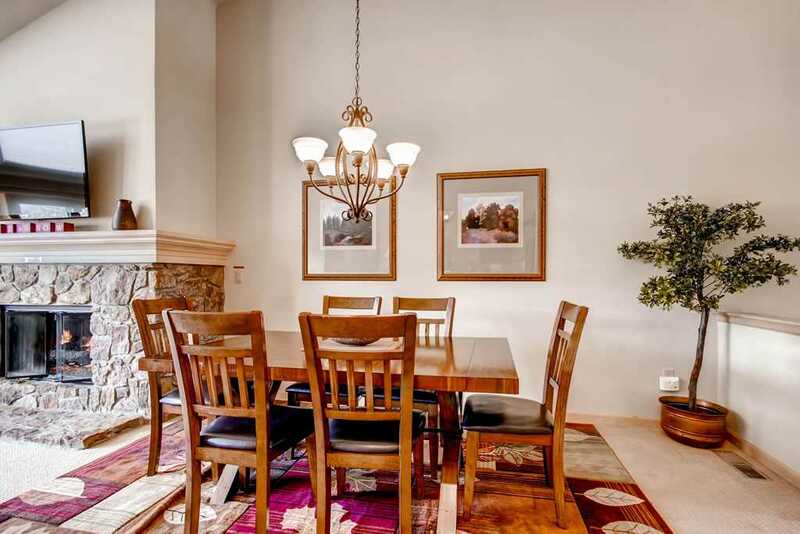 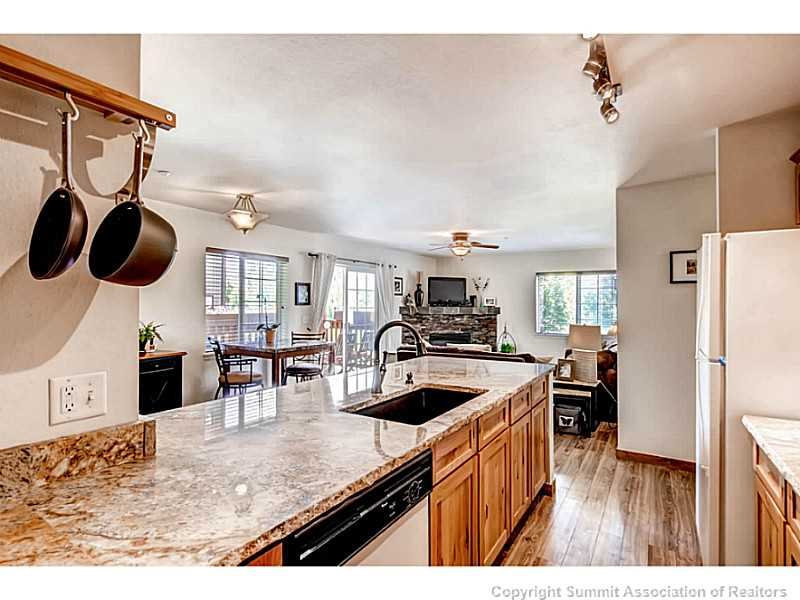 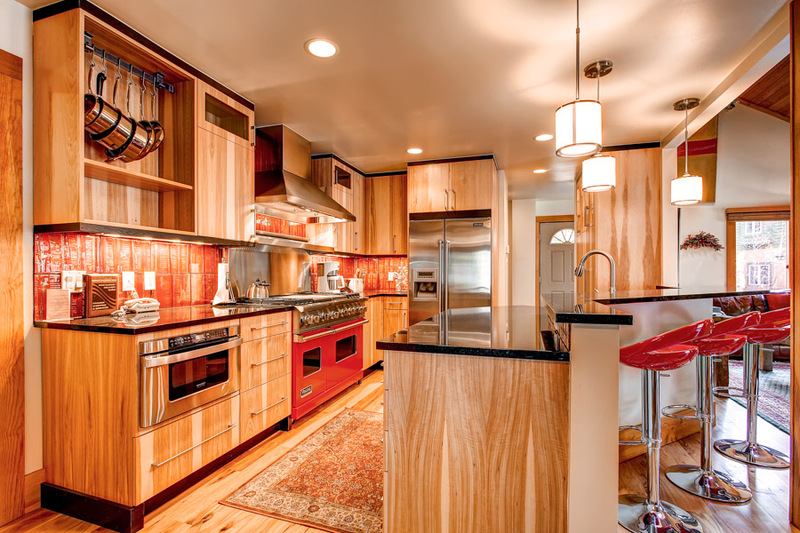 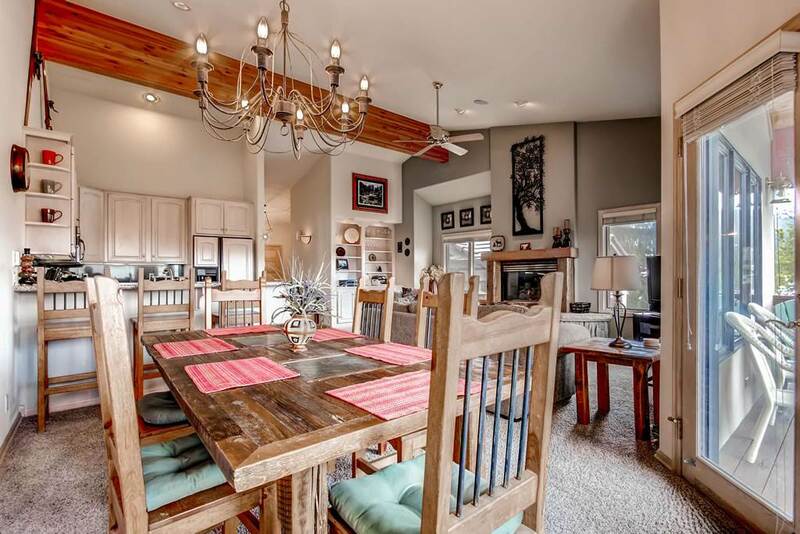 Four barstools at the breakfast bar and a dining table for eight offer plenty of seating. 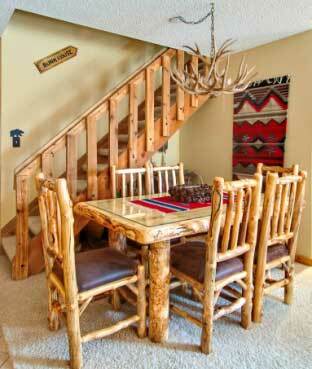 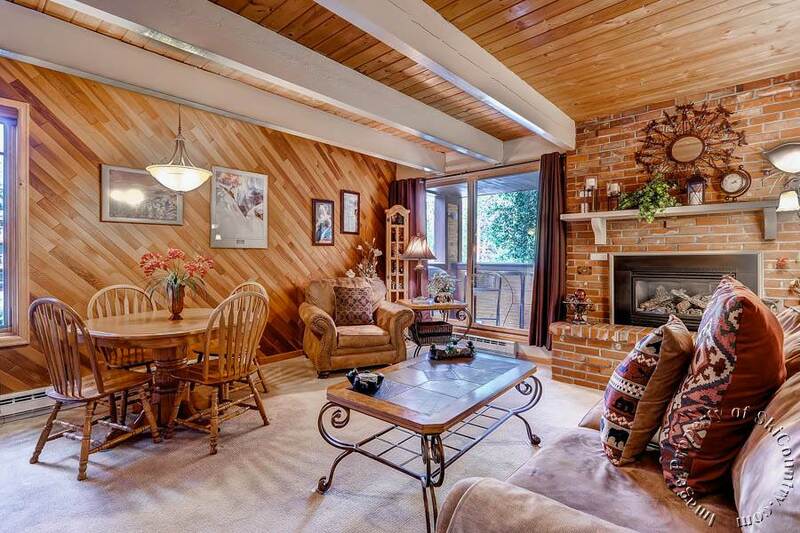 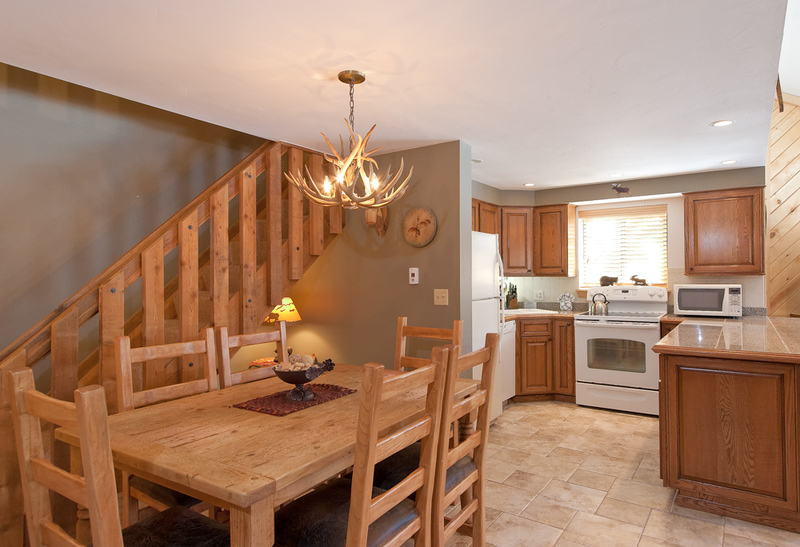 Off the dining area is a door to the deck, complete with seating, a gas grill and forest views. 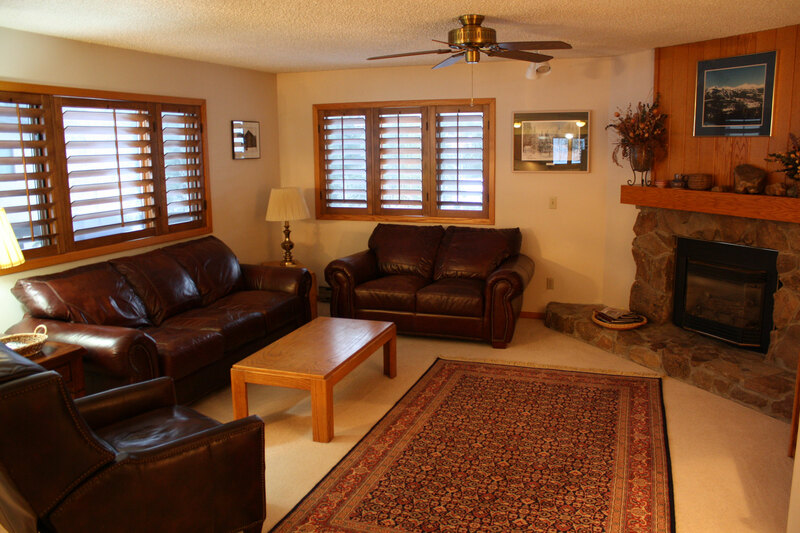 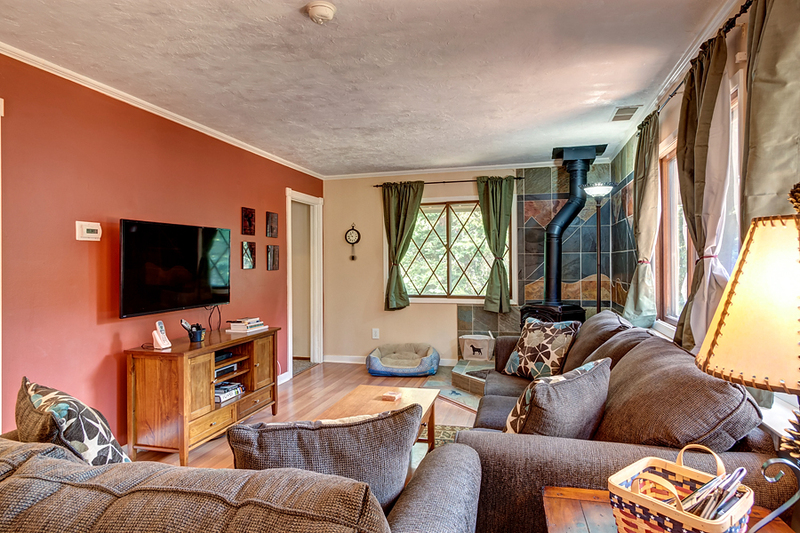 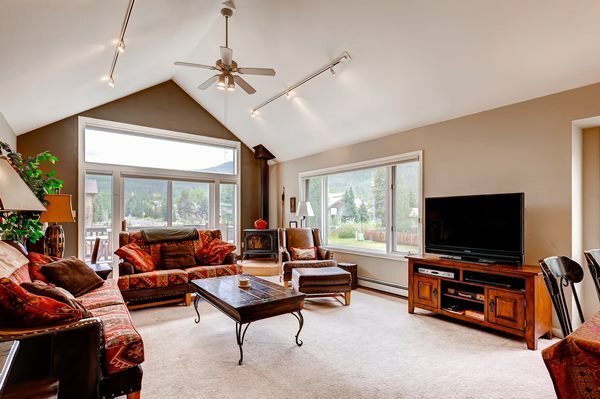 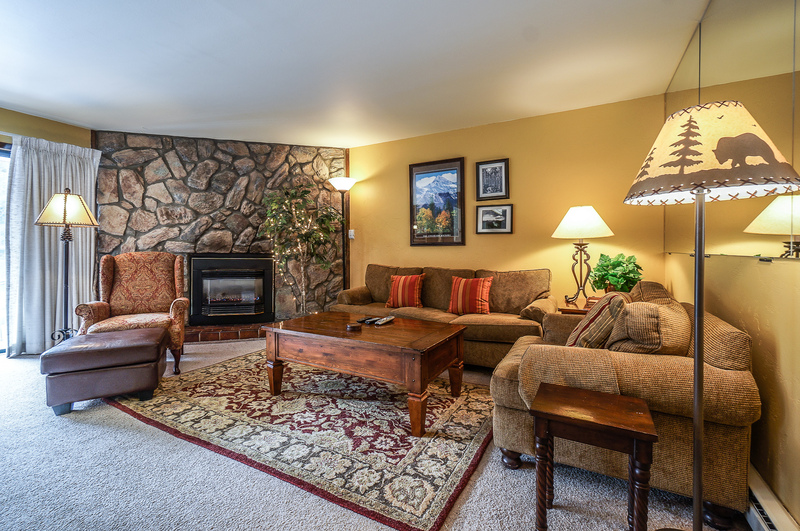 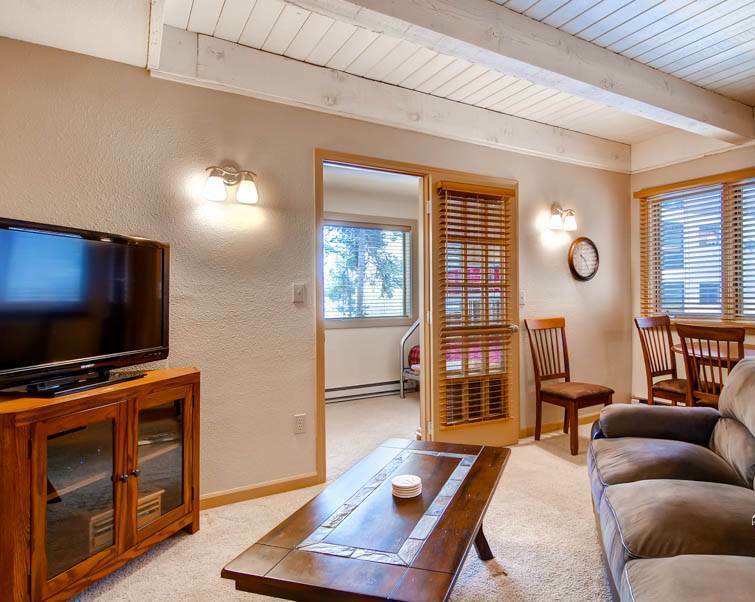 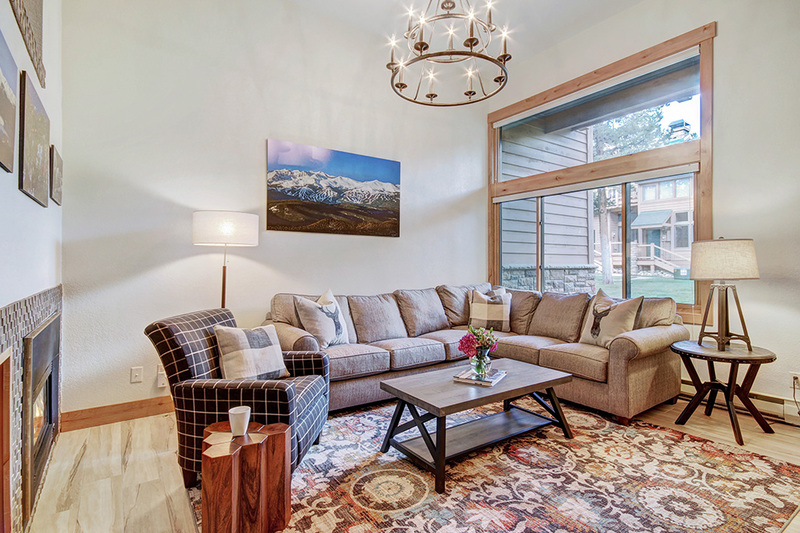 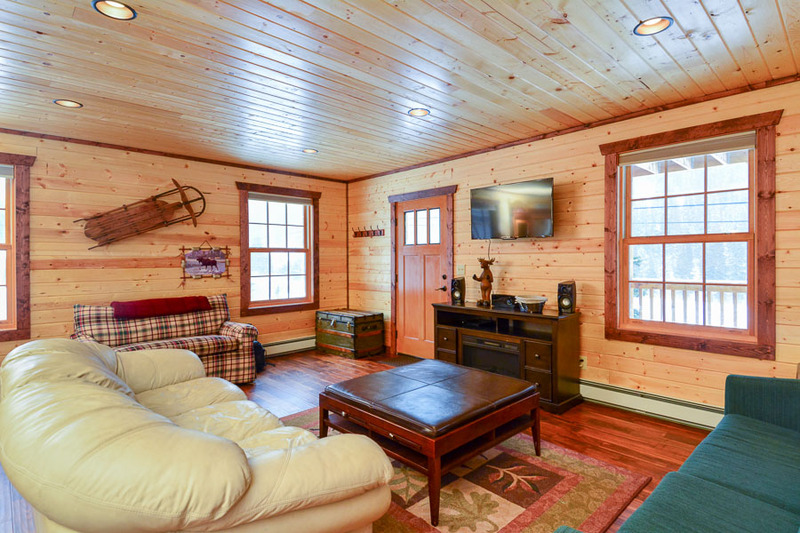 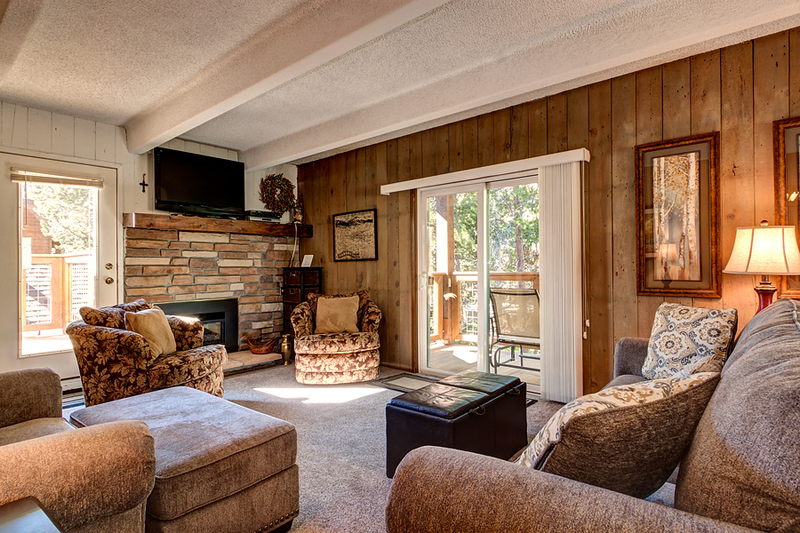 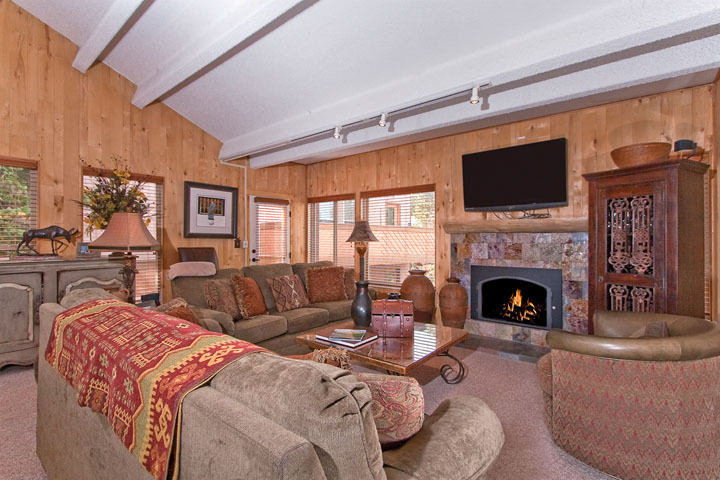 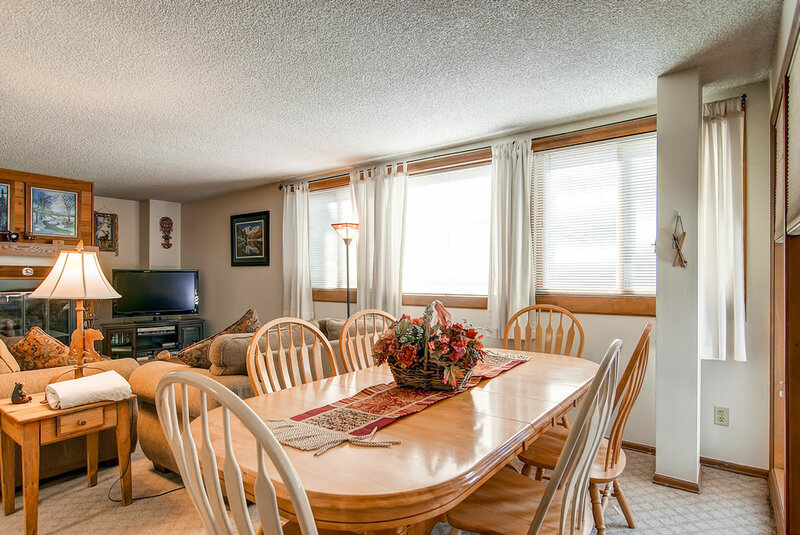 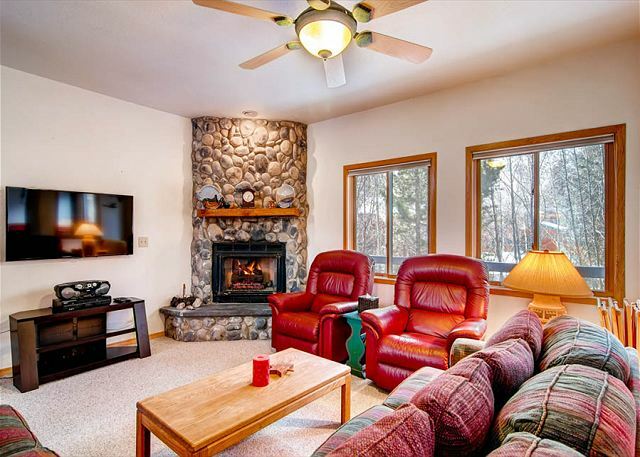 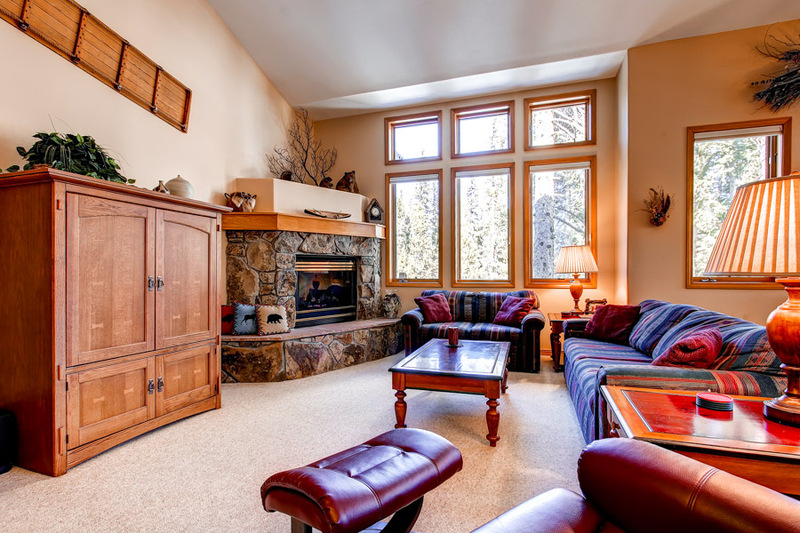 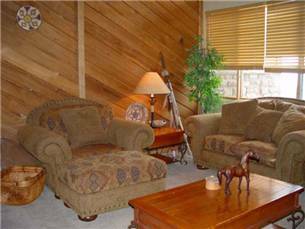 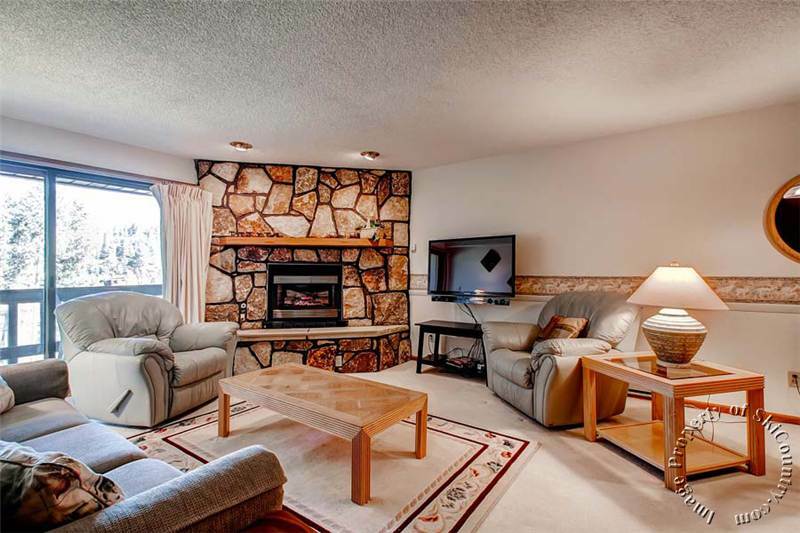 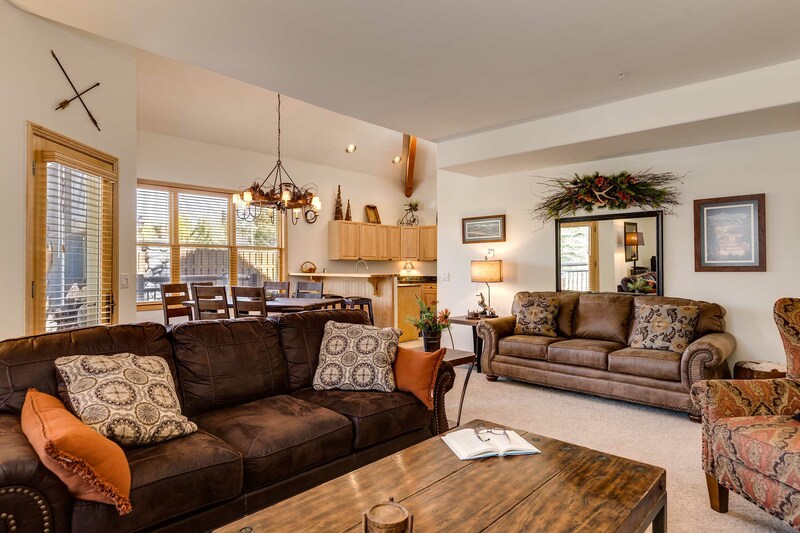 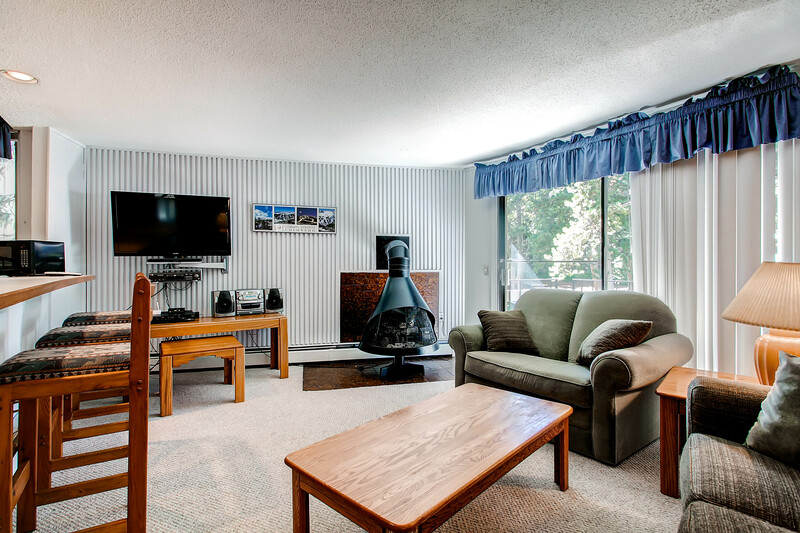 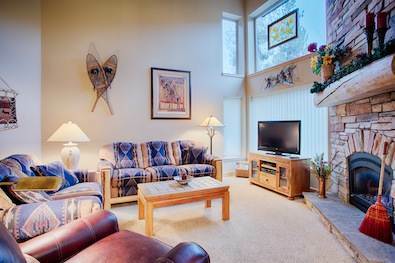 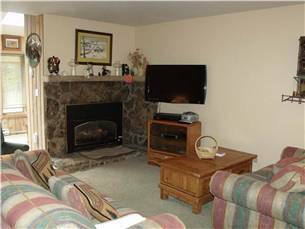 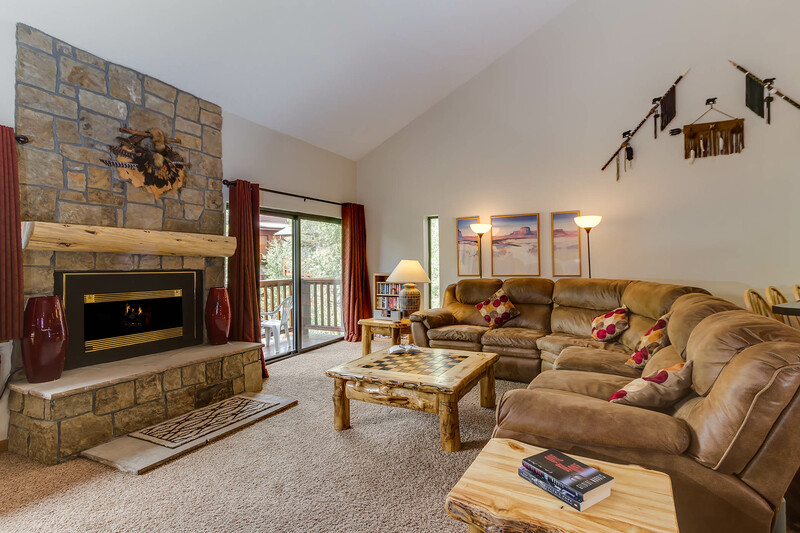 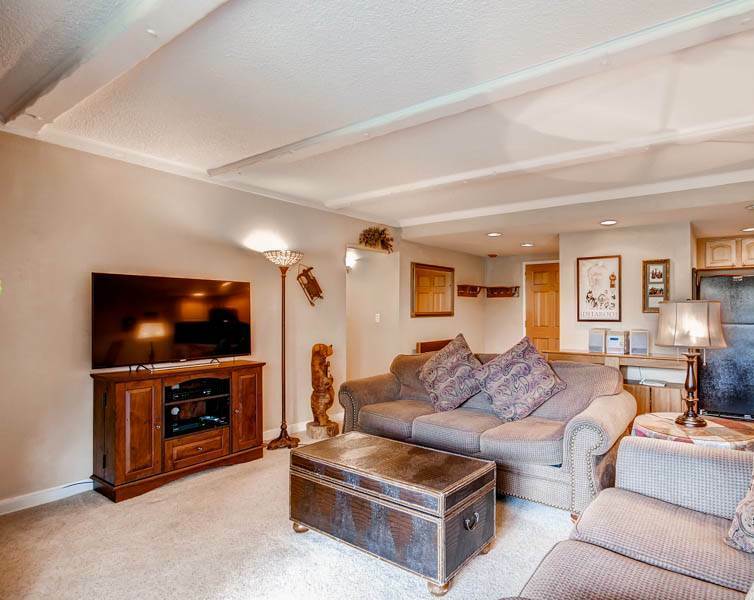 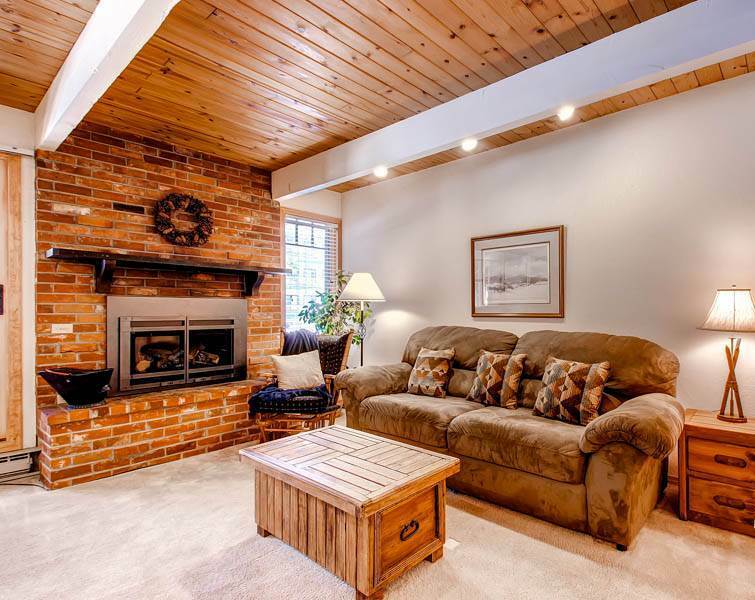 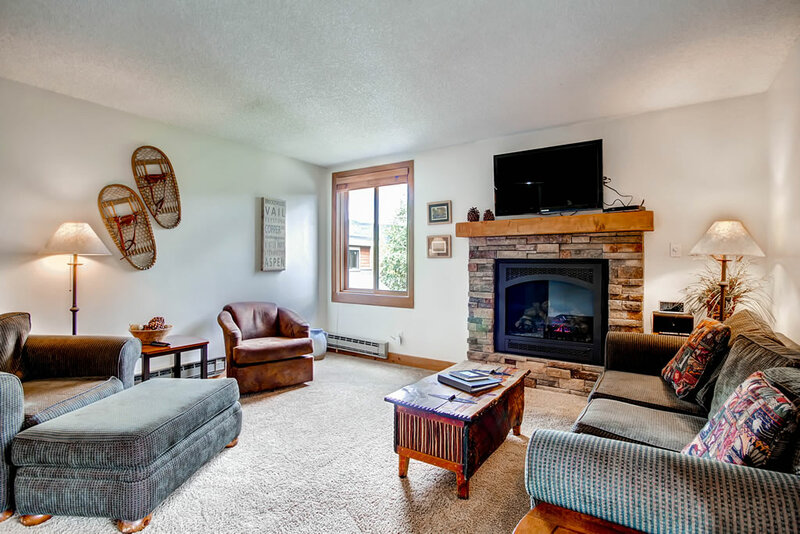 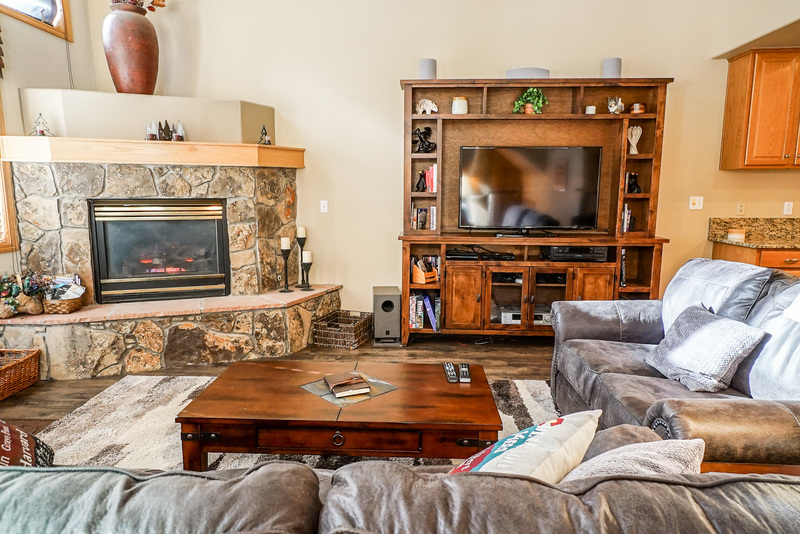 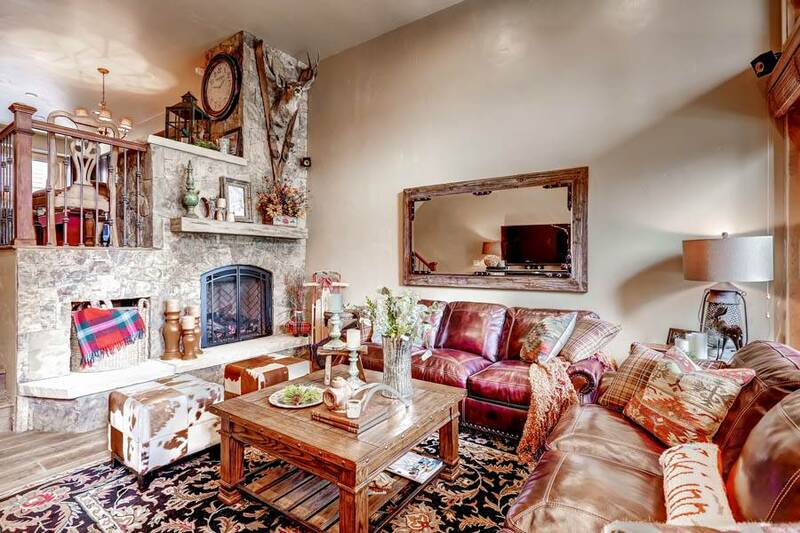 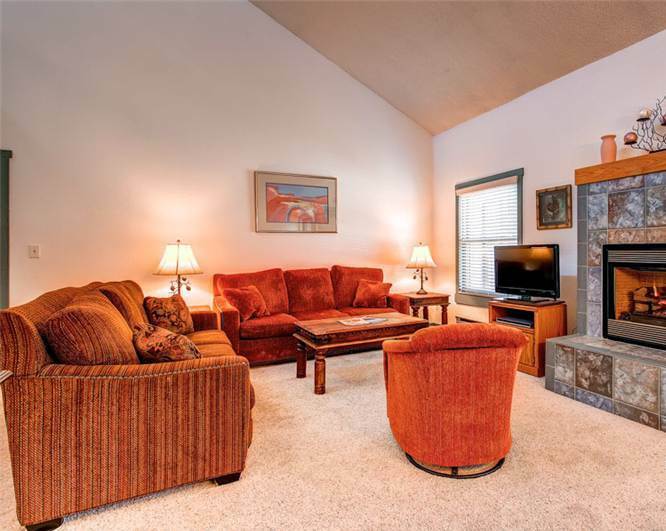 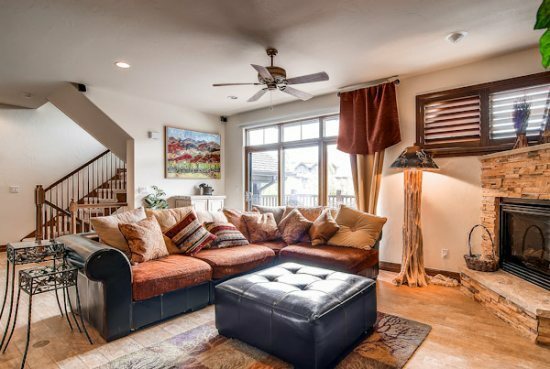 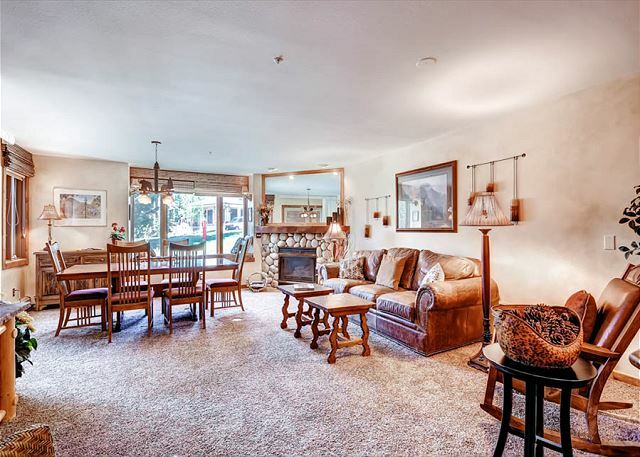 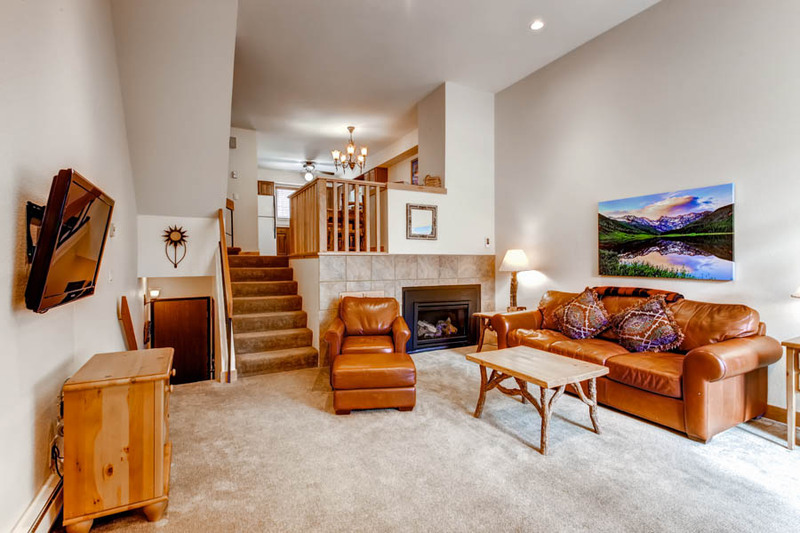 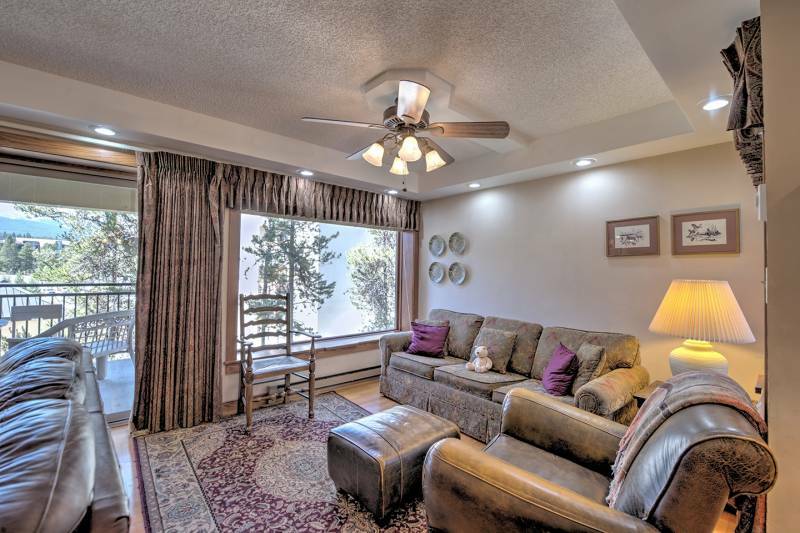 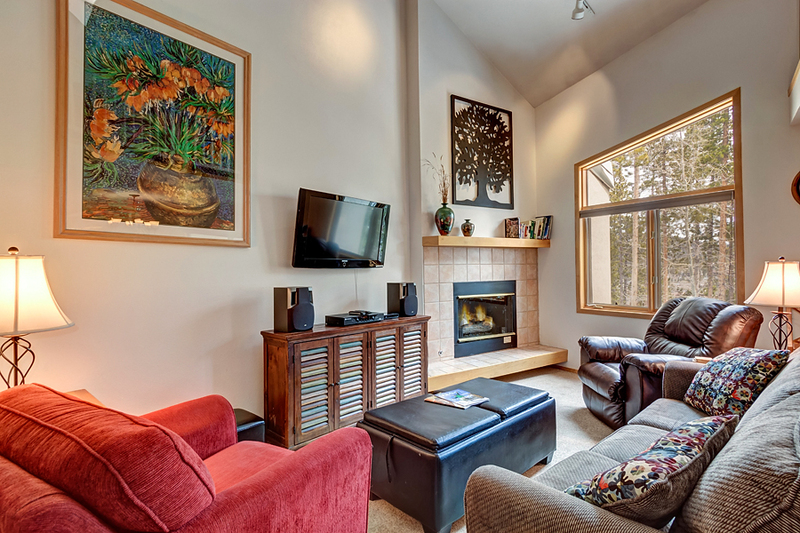 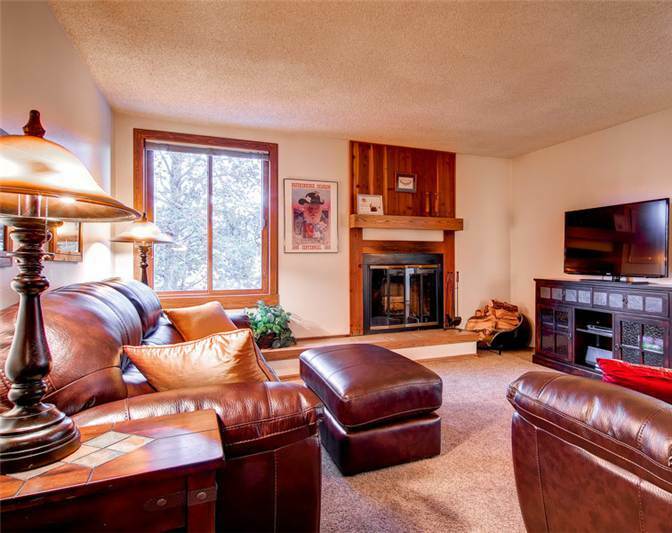 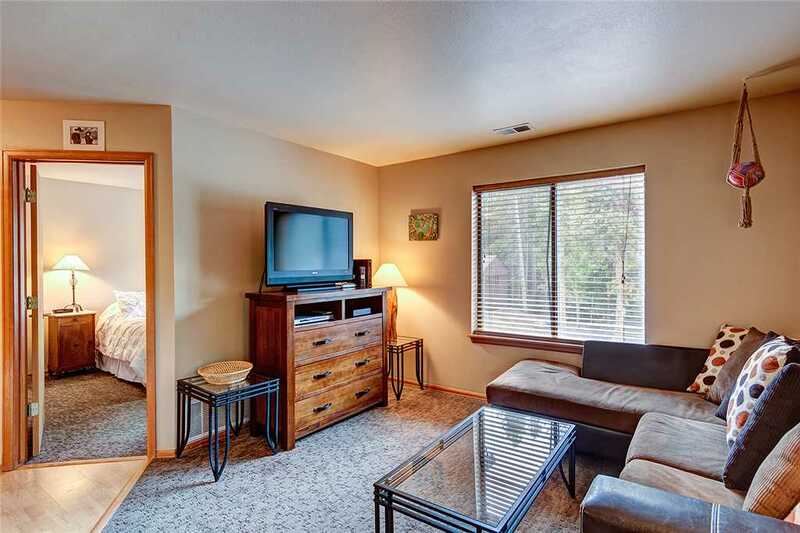 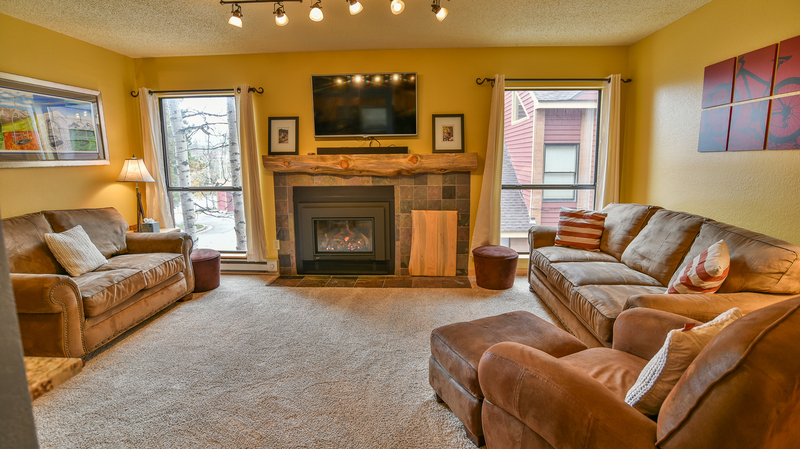 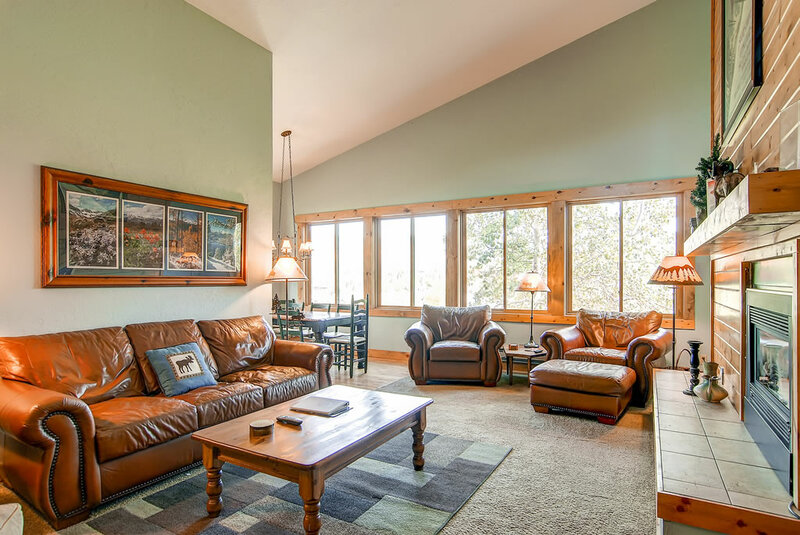 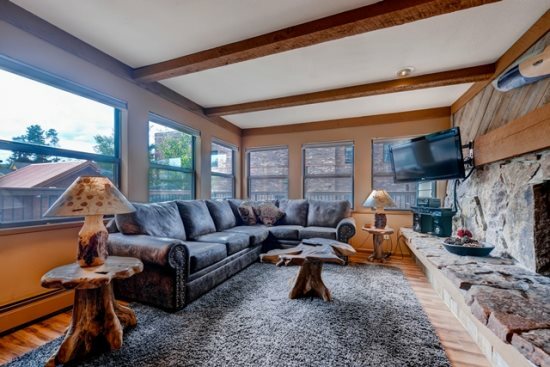 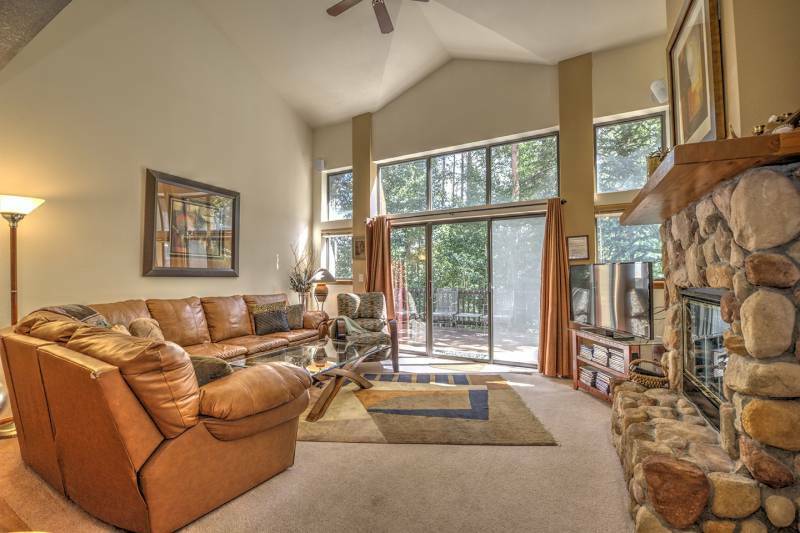 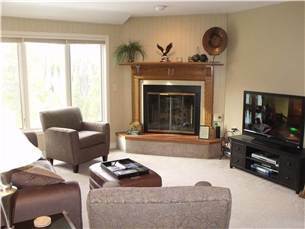 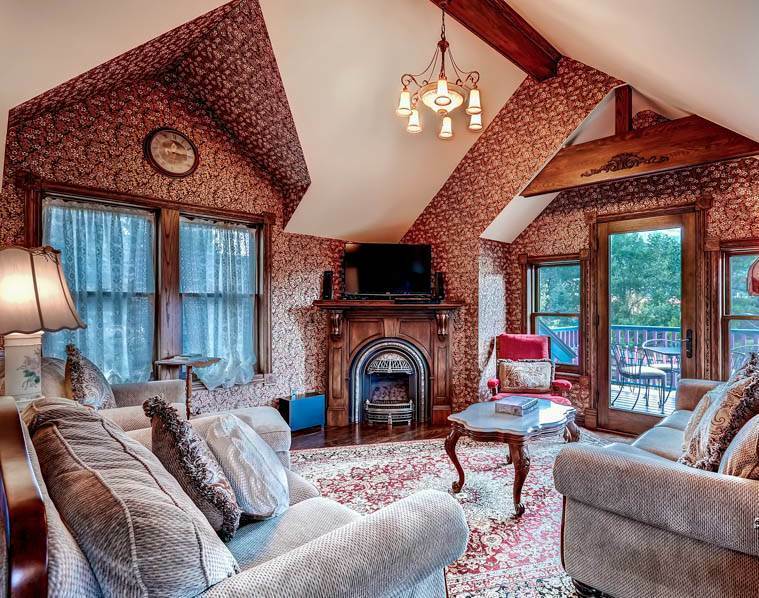 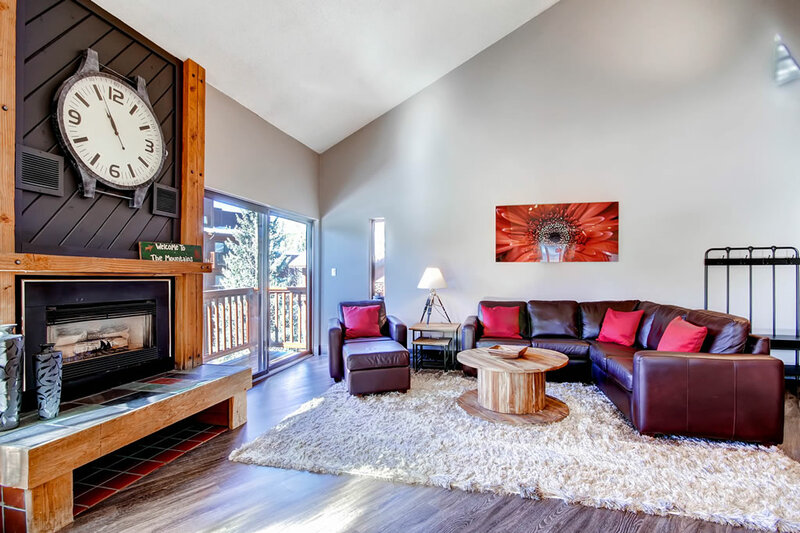 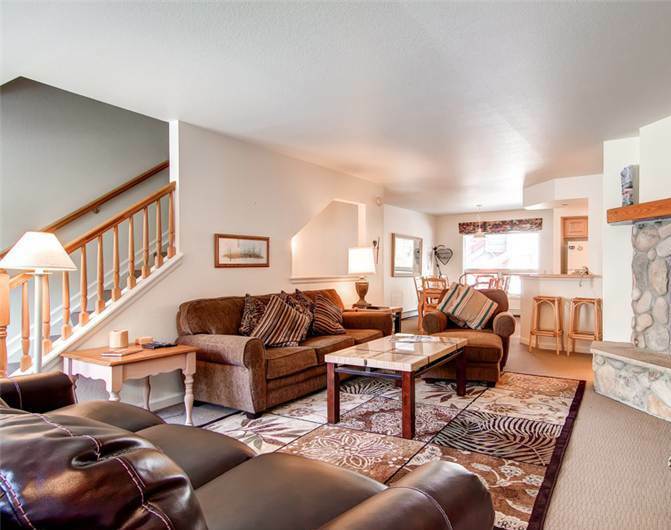 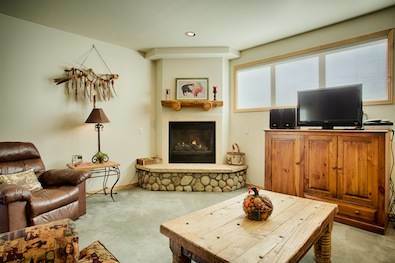 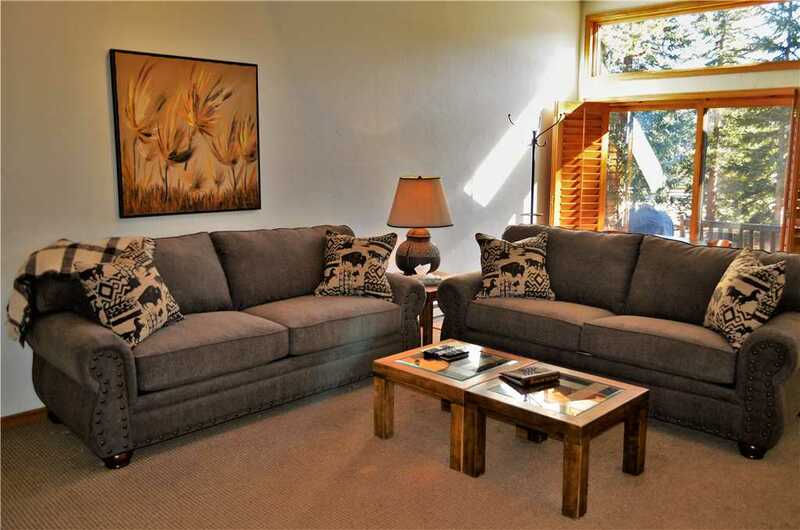 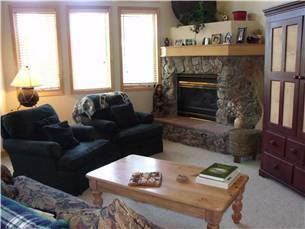 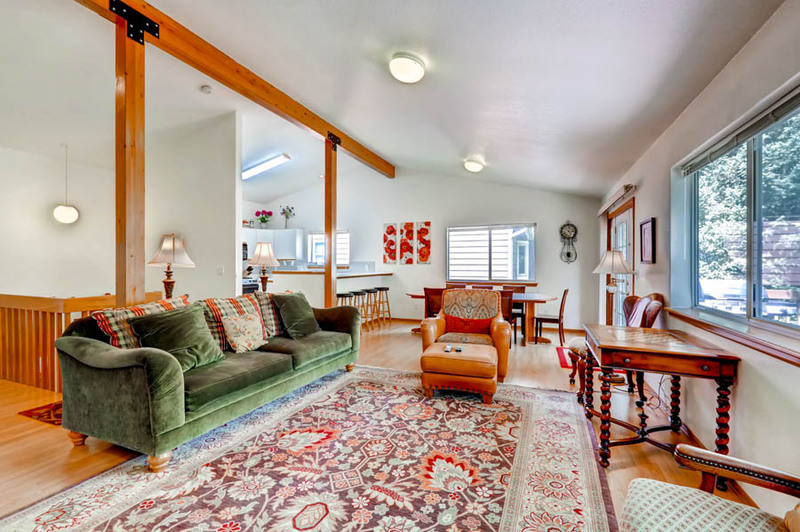 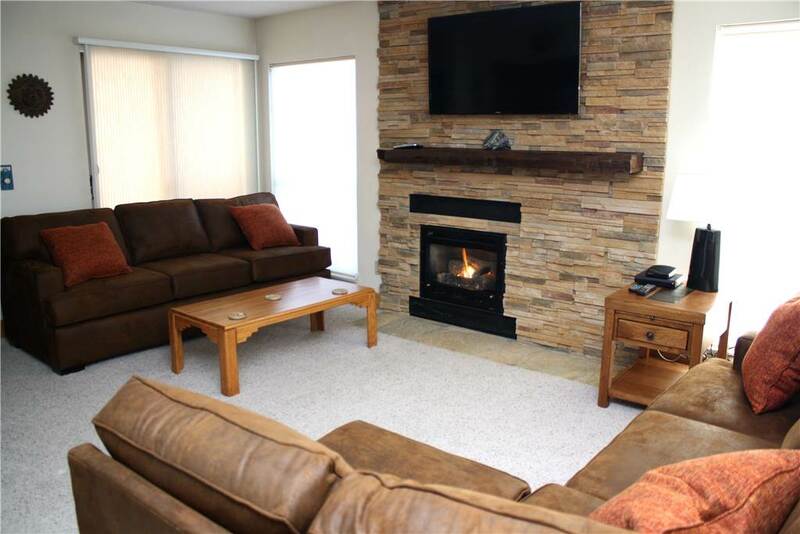 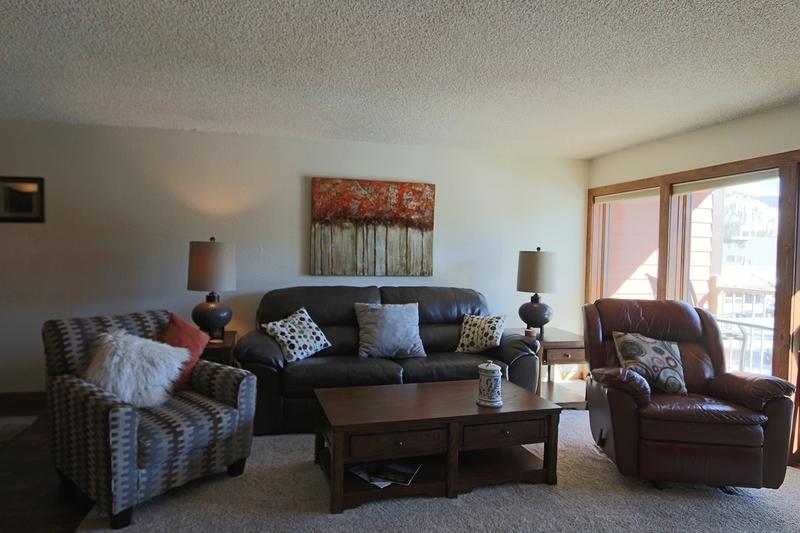 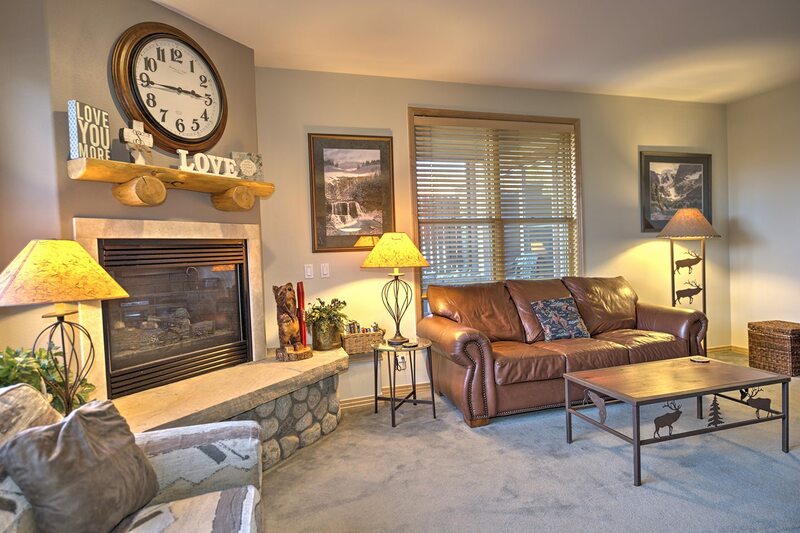 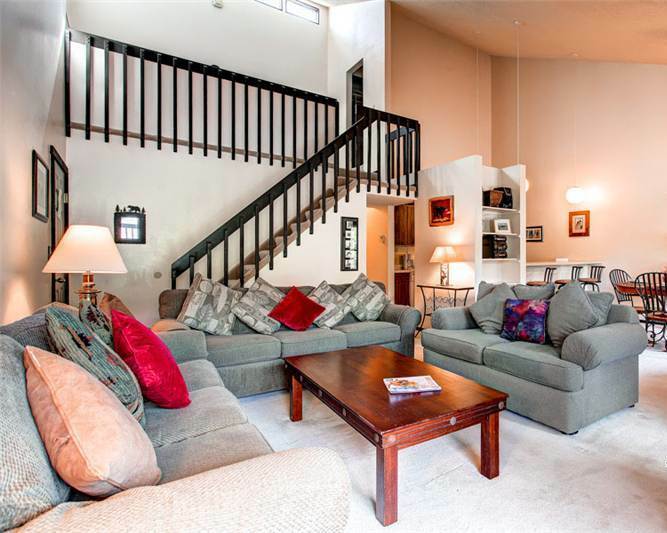 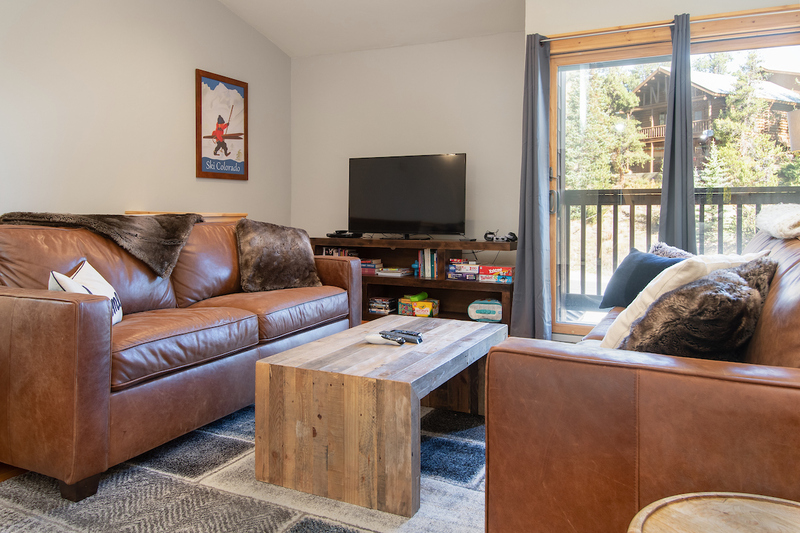 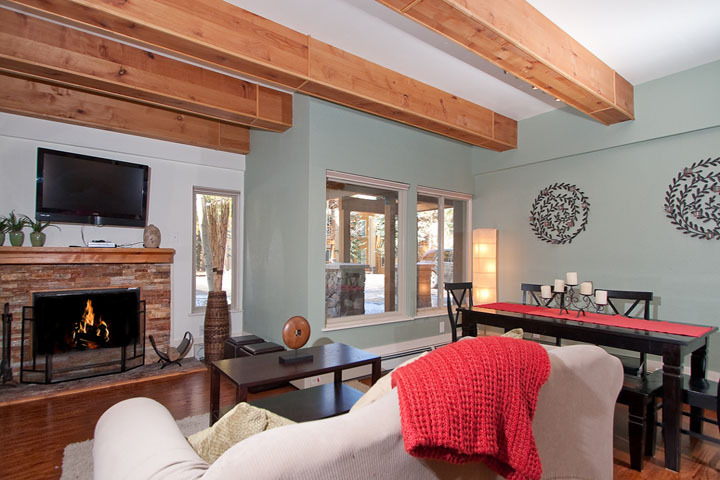 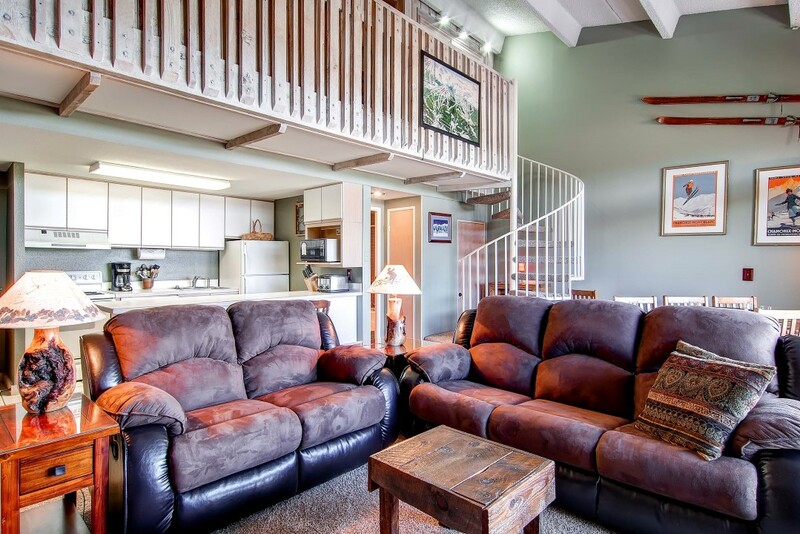 The living room is adjacent to the kitchen and dining area and offers vaulted ceilings, 45″ flat screen television, DVD player, sofa sleeper and plenty of natural sunlight. 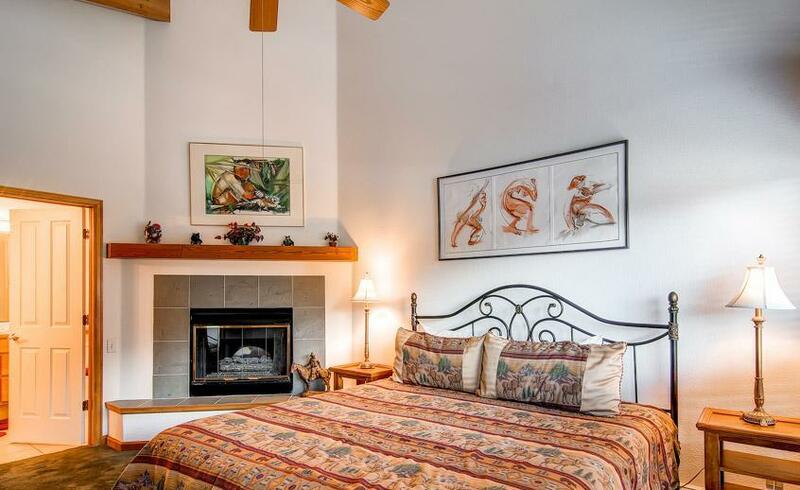 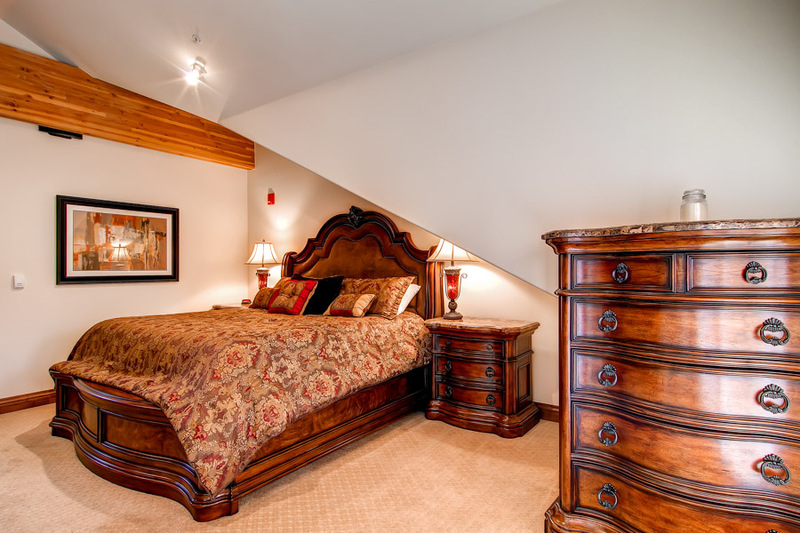 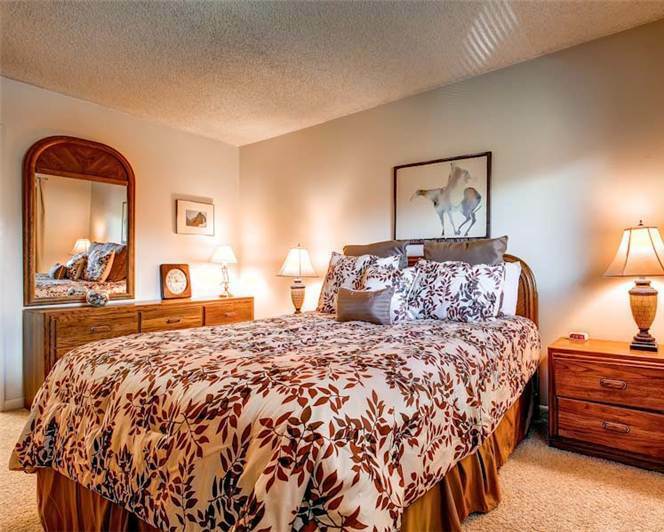 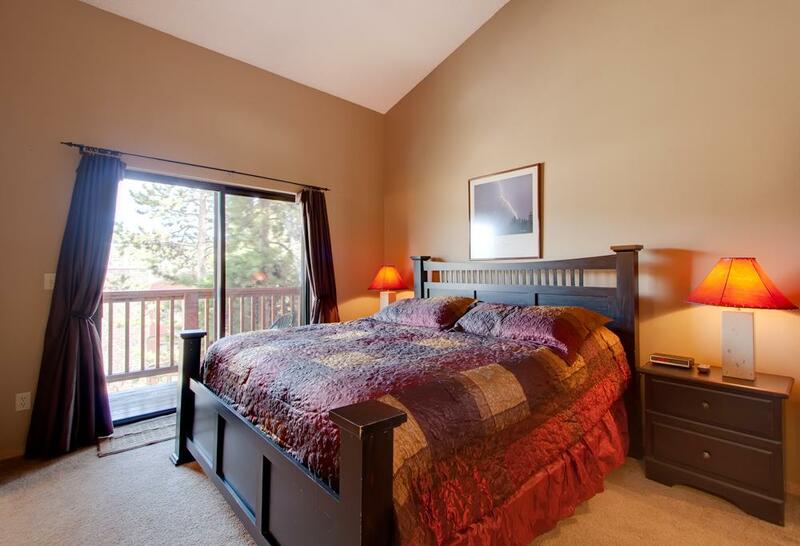 Head upstairs to the master bedroom with a king bed, flat screen television and en suite full bathroom. 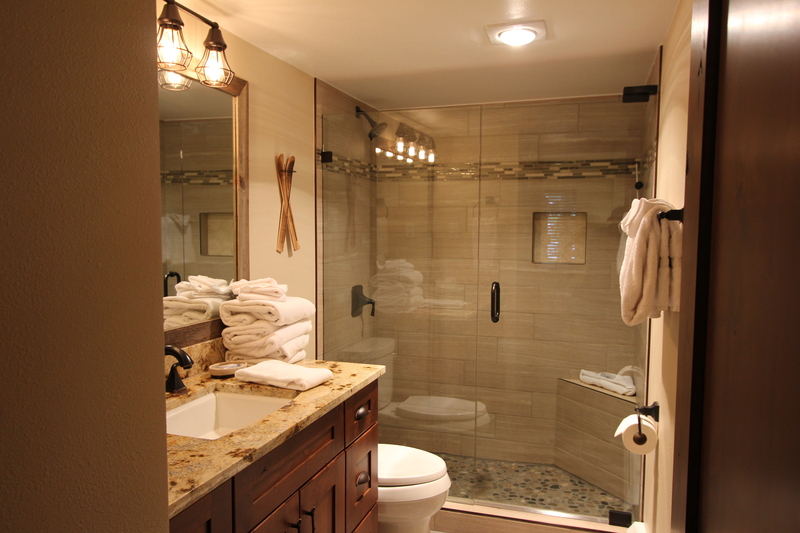 The master bathroom is spacious with a jetted tub, his and her sinks and separate glass enclosed shower. 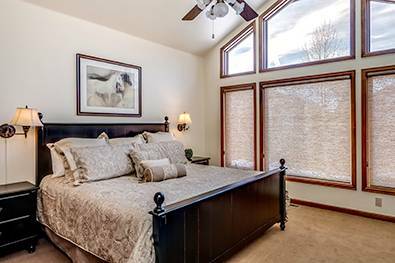 Also on the upper level is a guest bedroom with two twin beds, flat screen television and en suite 3/4 bathroom with shower. 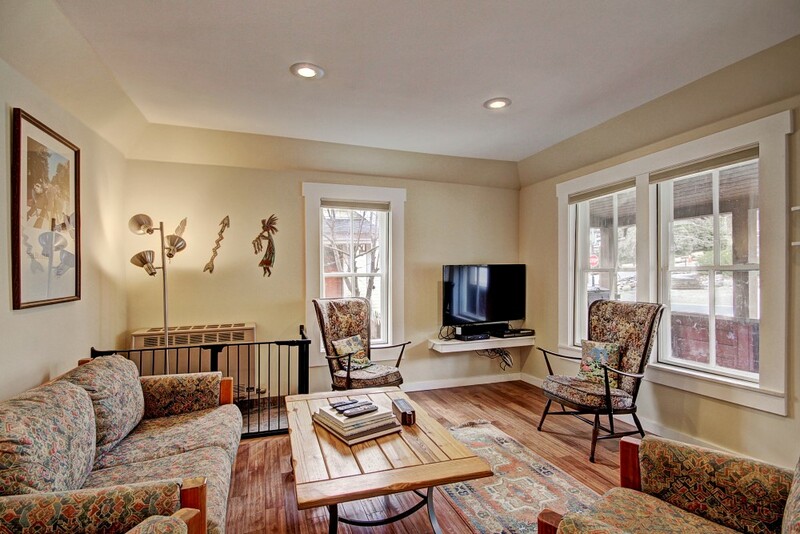 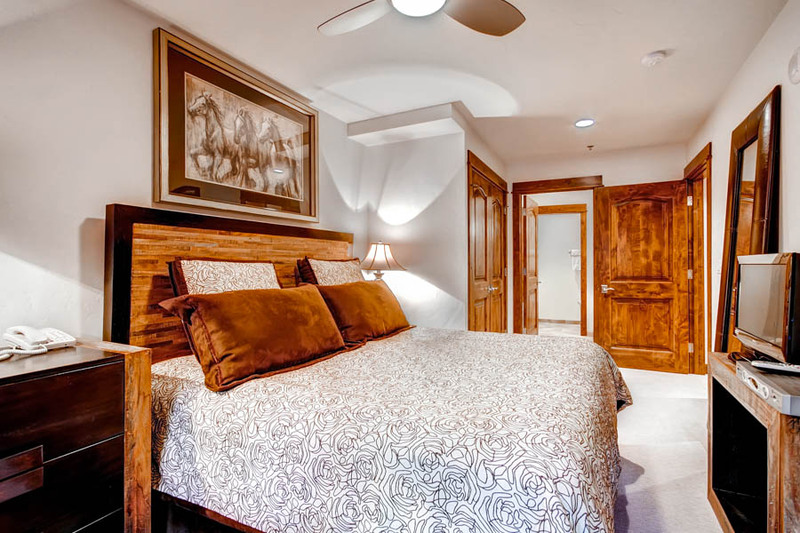 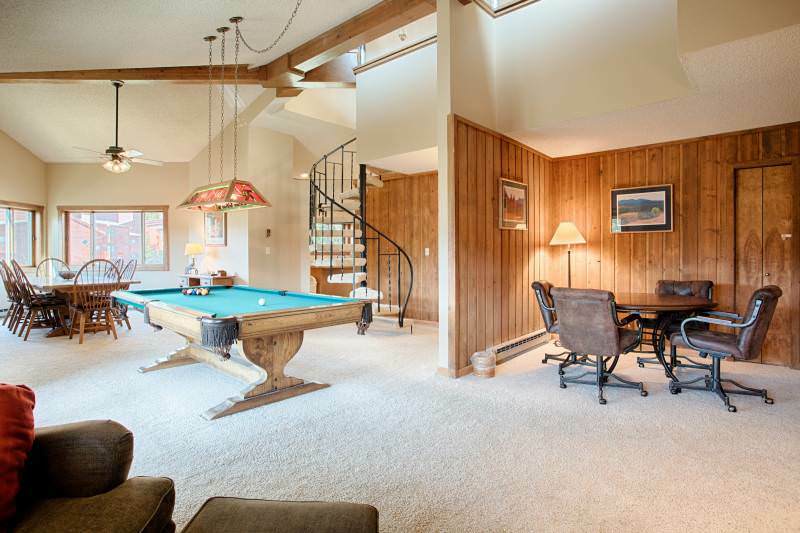 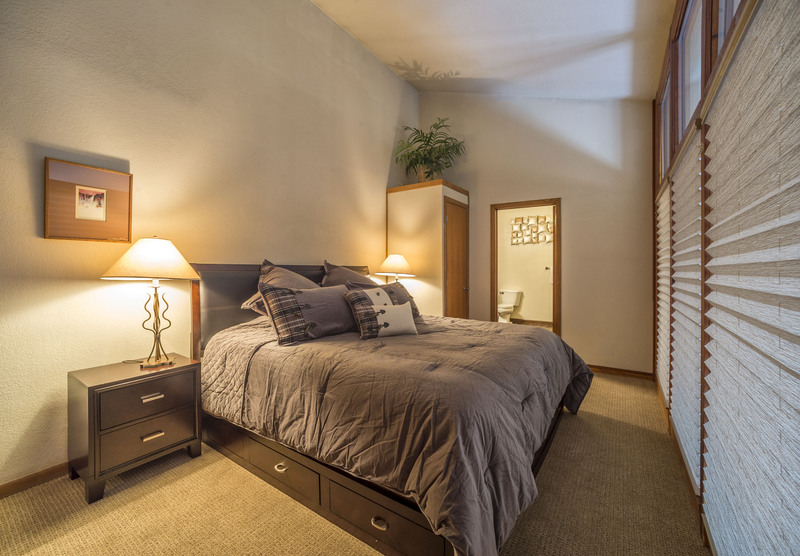 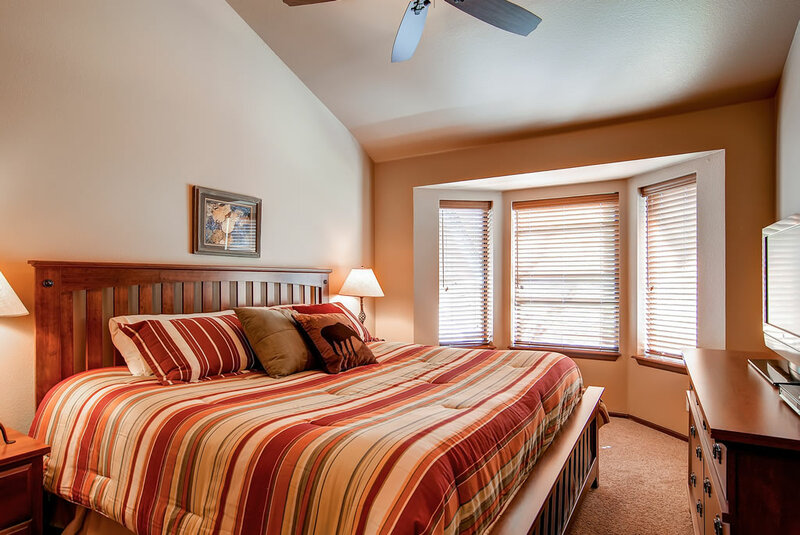 On the lower level you will find two additional guest bedrooms. 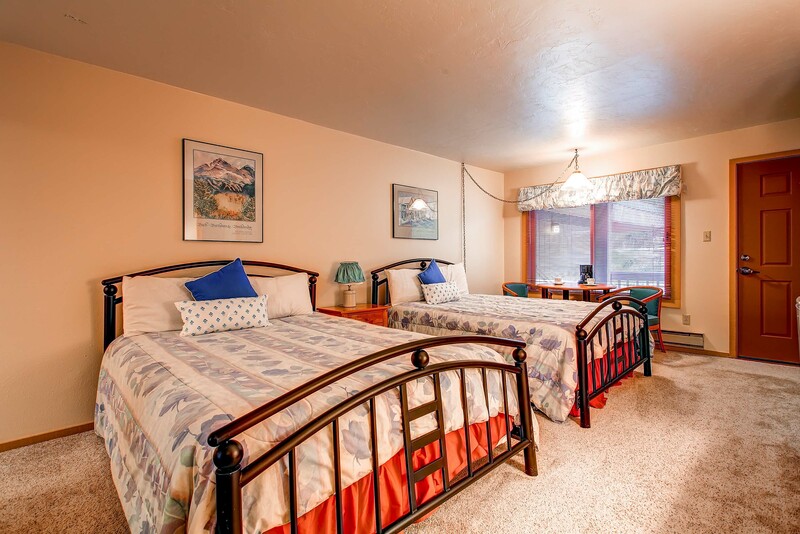 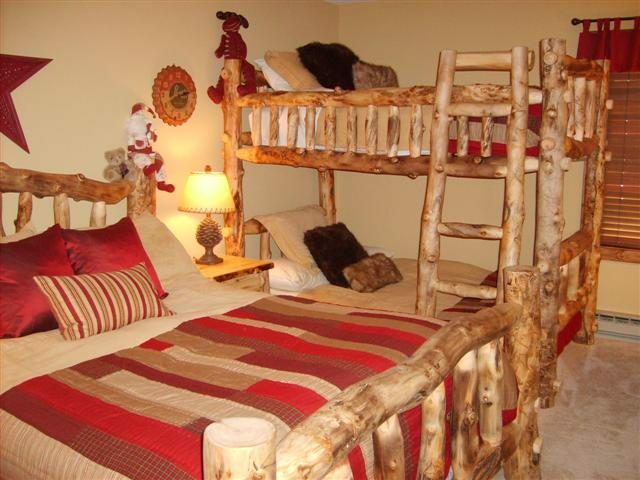 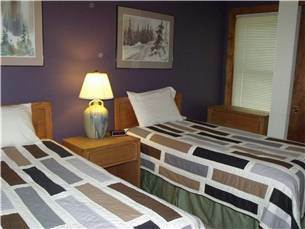 One is furnished with two twin beds and the other is furnished with a queen bed. 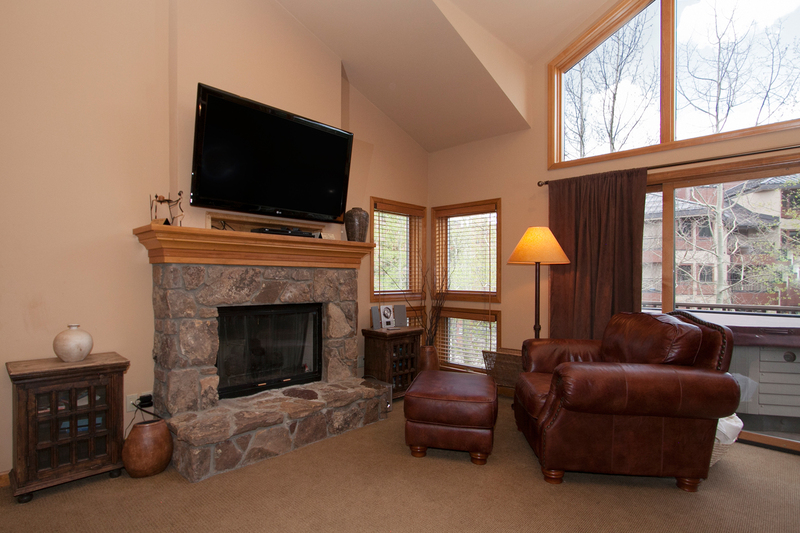 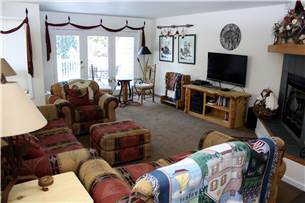 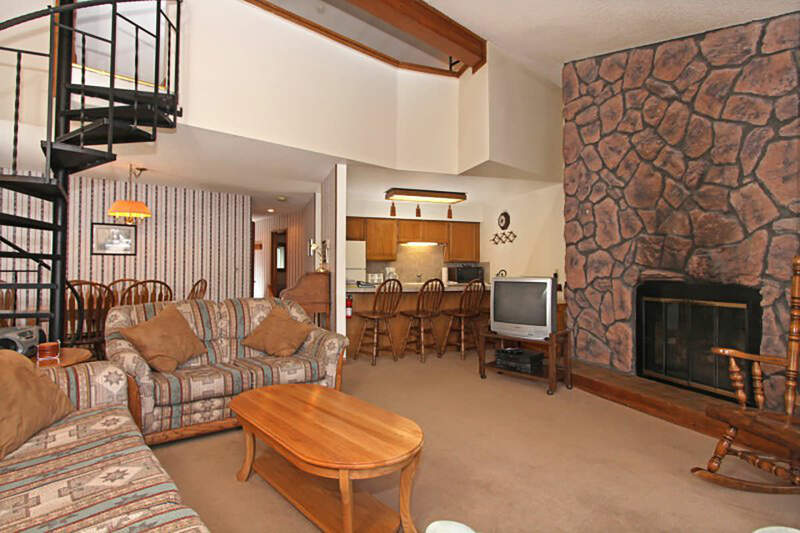 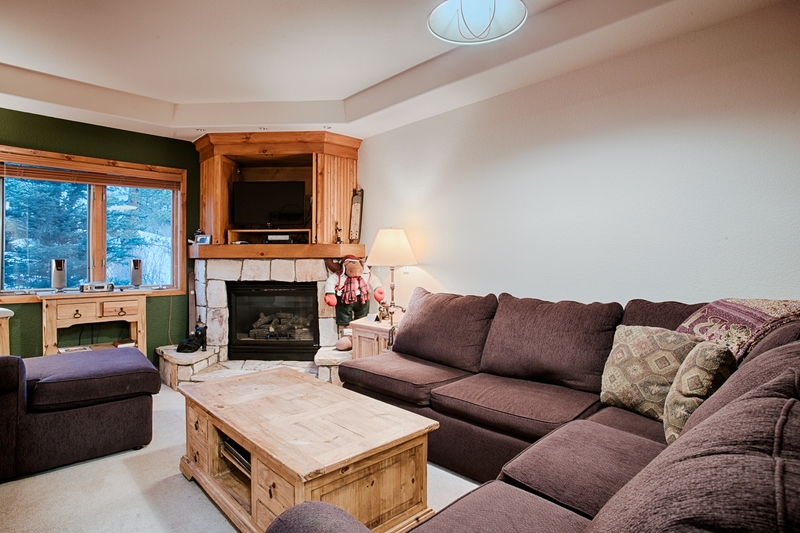 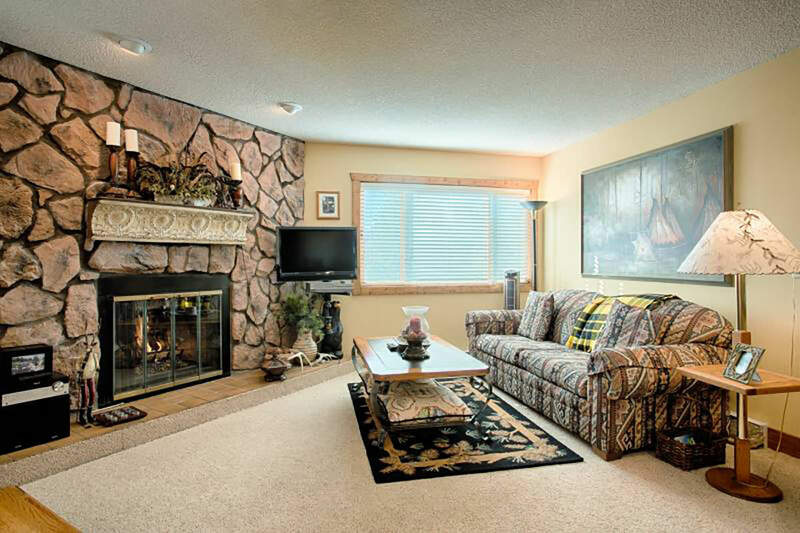 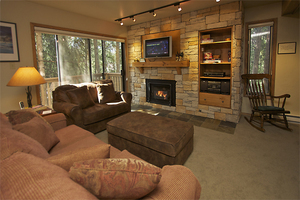 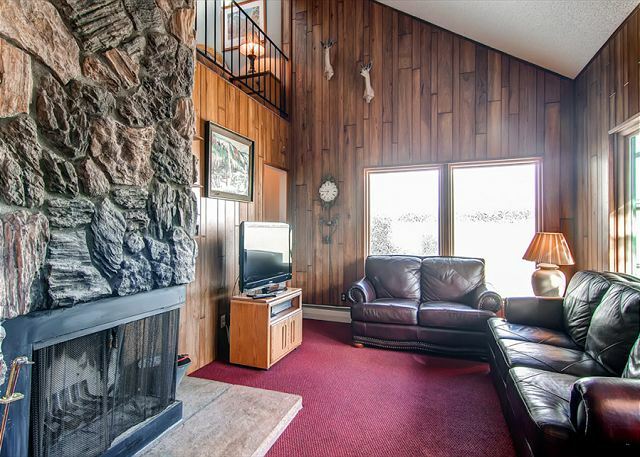 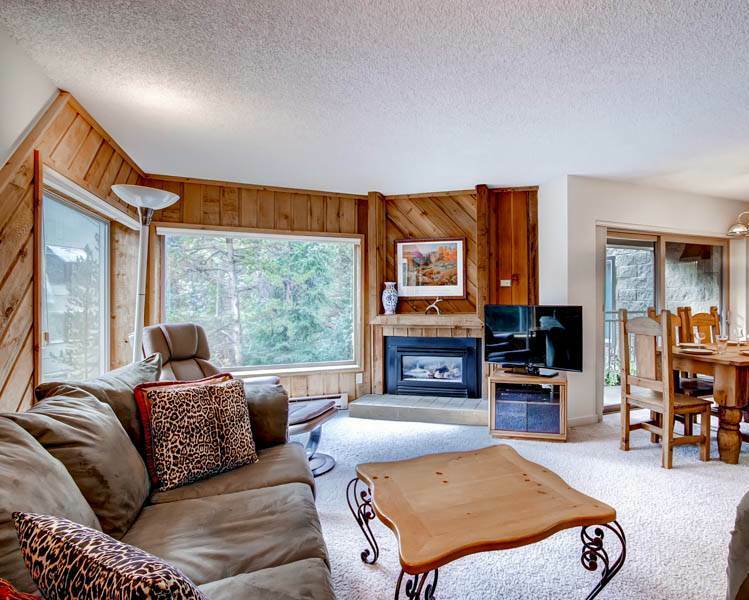 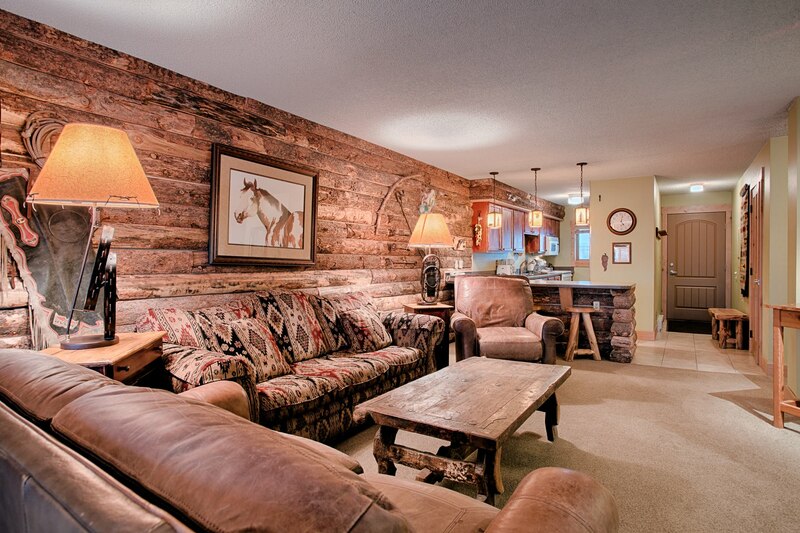 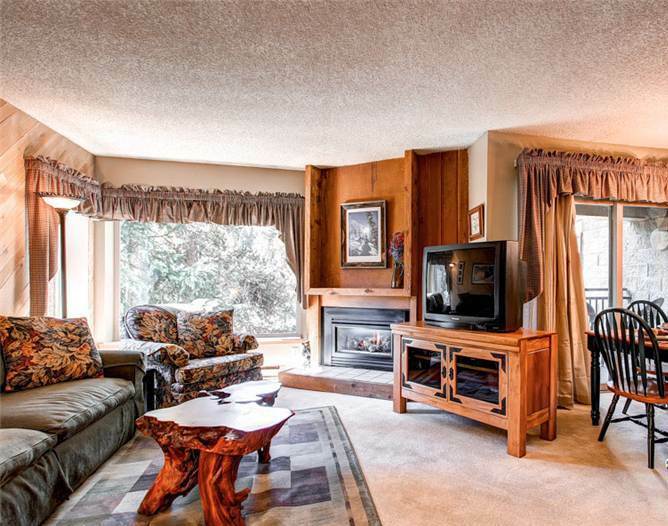 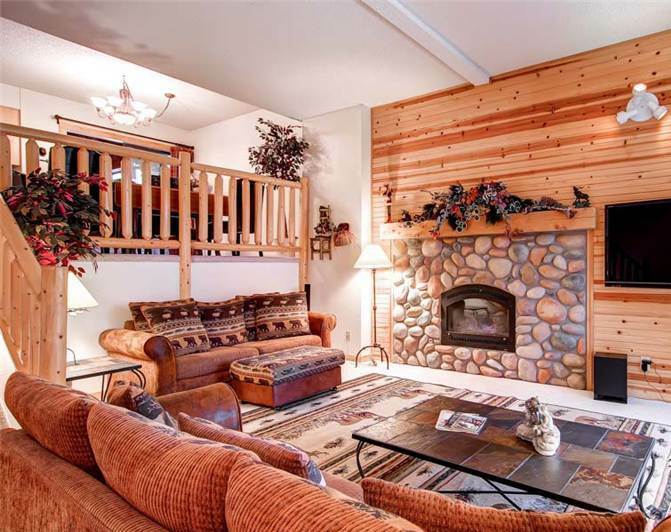 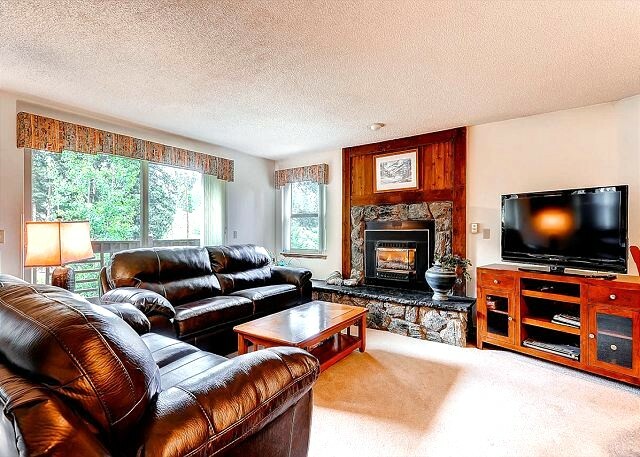 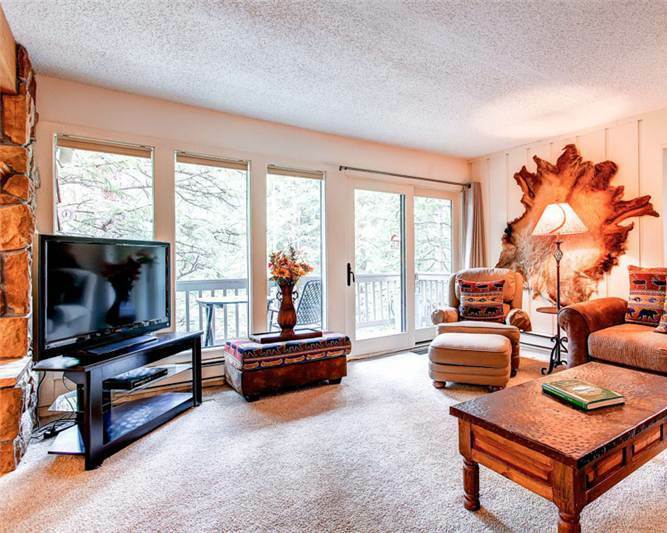 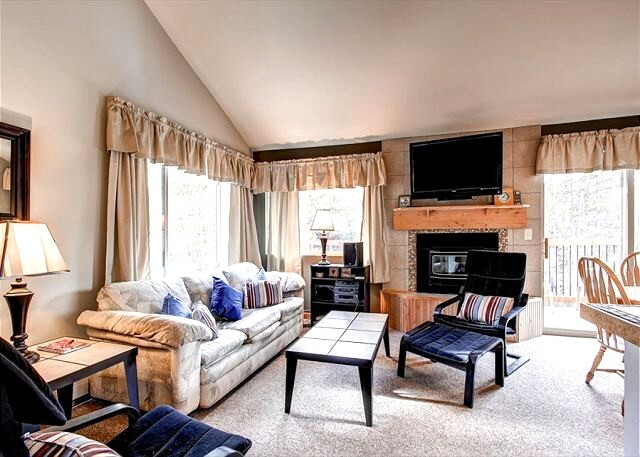 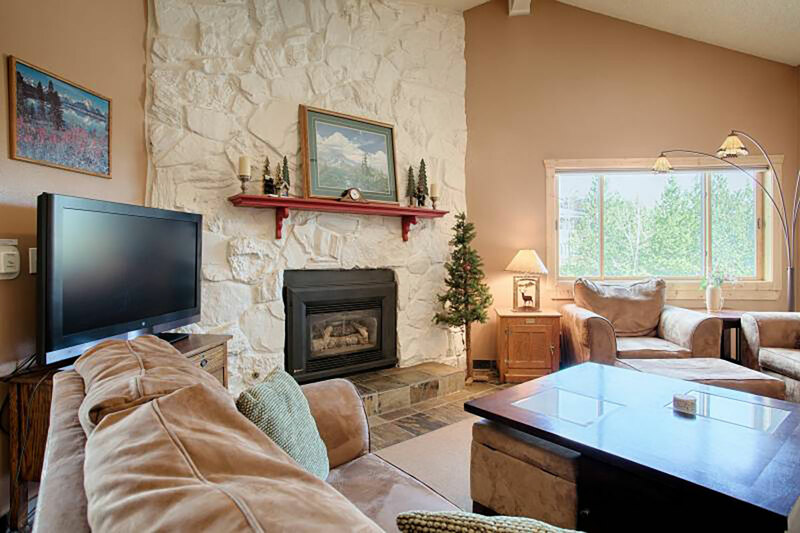 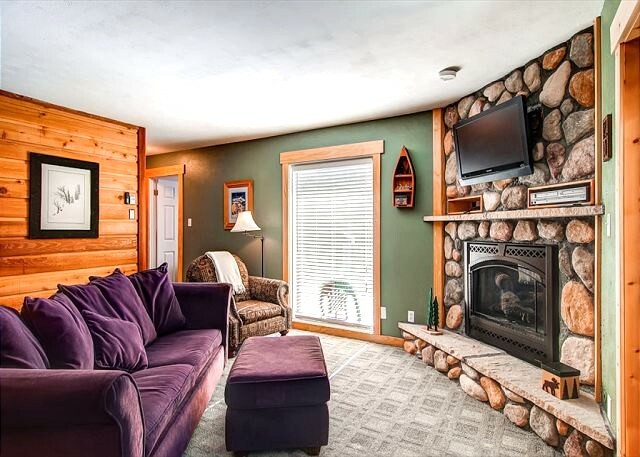 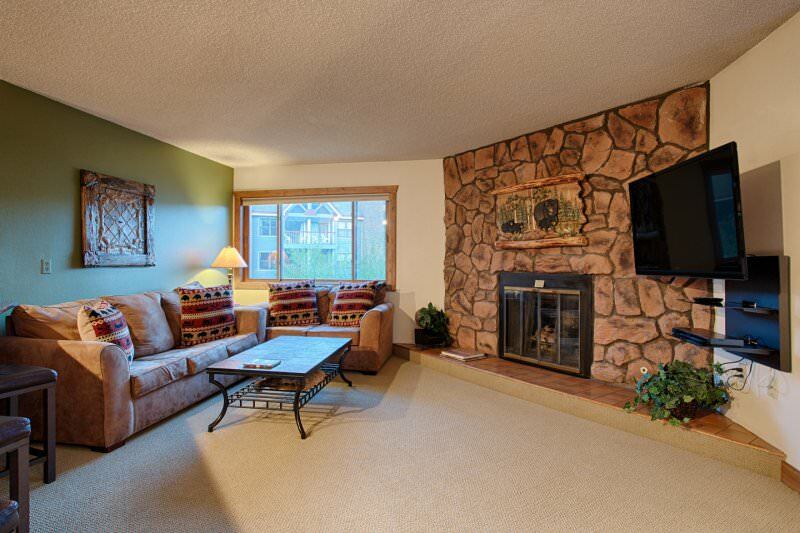 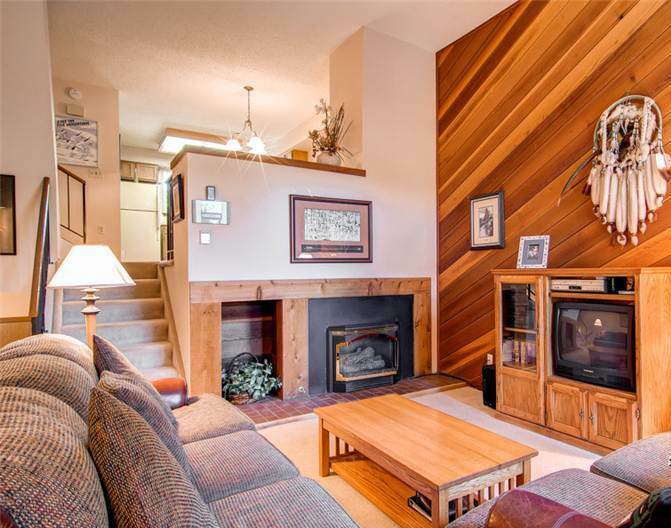 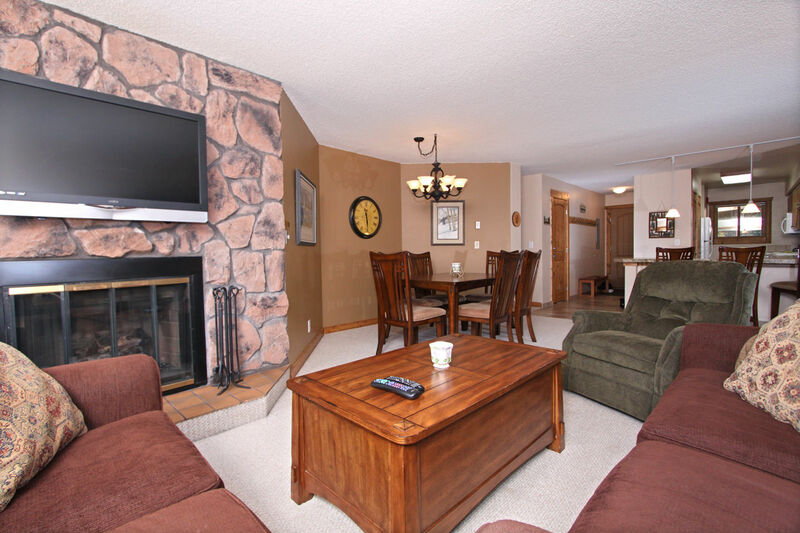 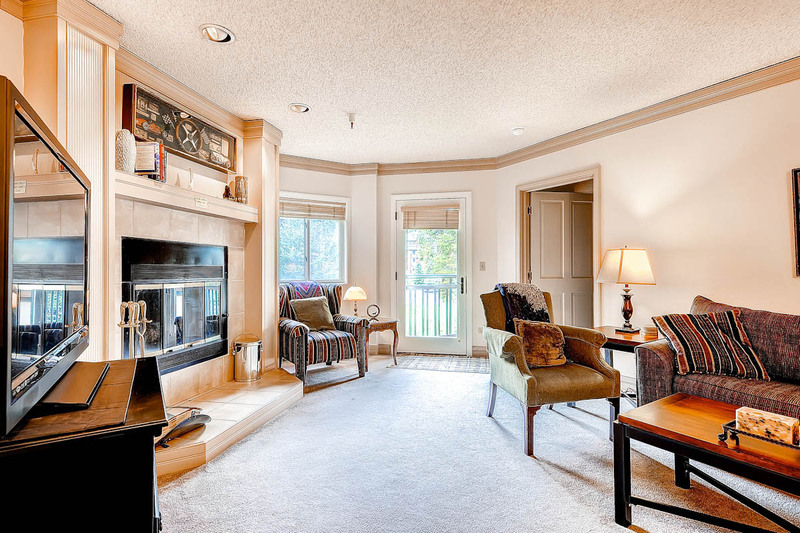 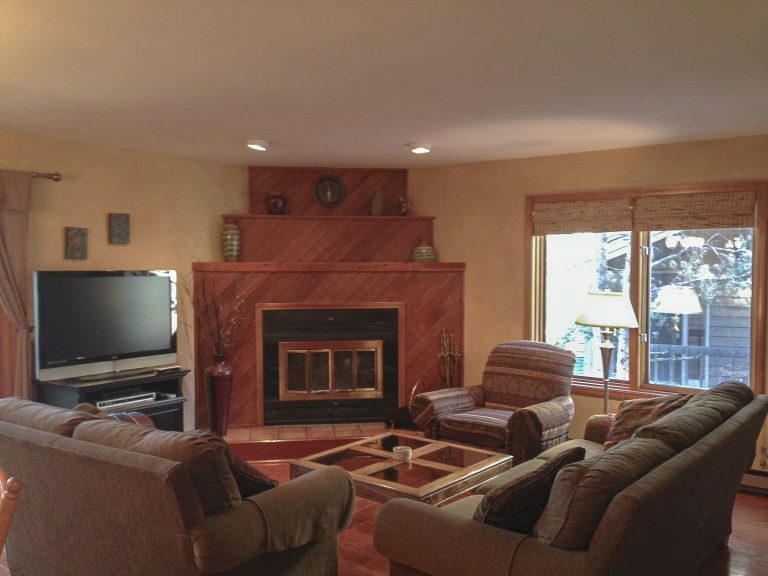 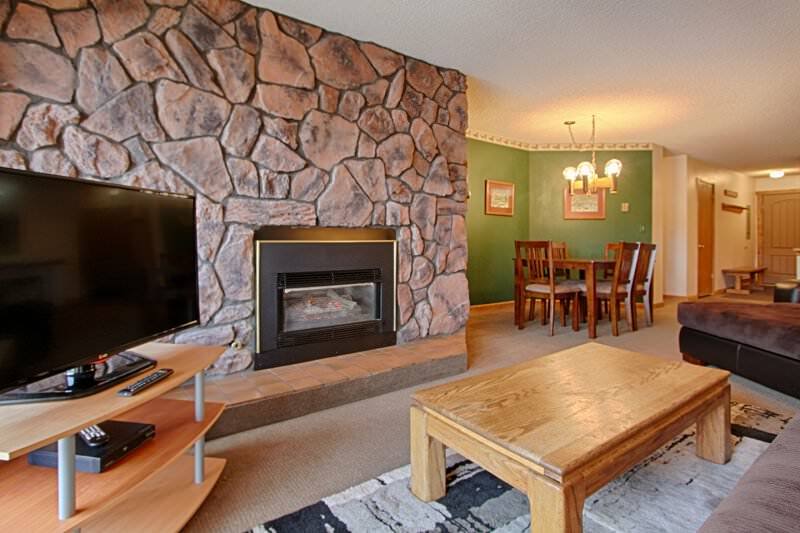 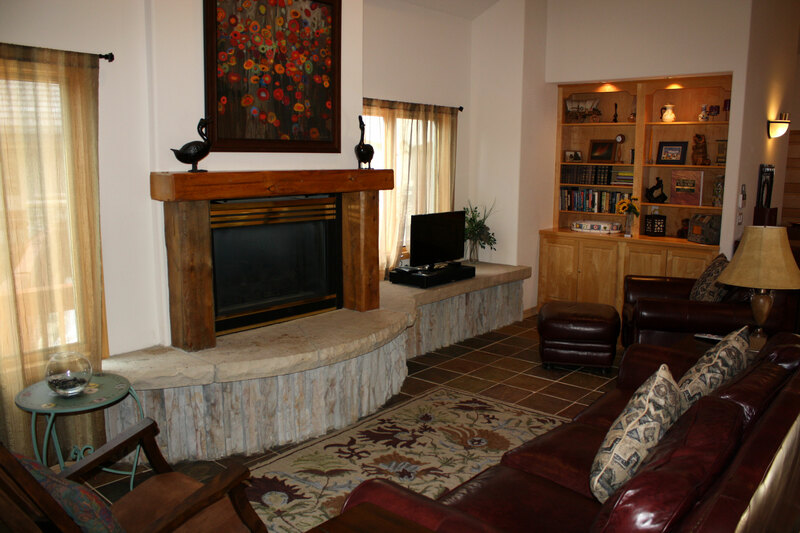 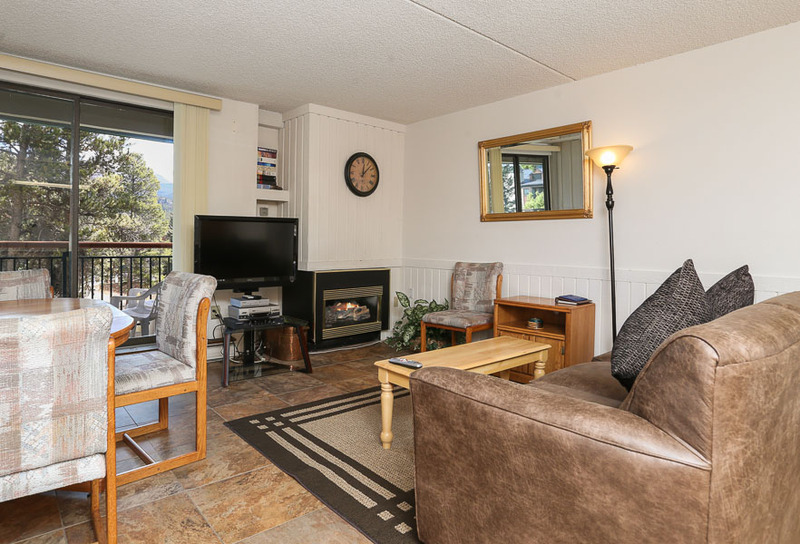 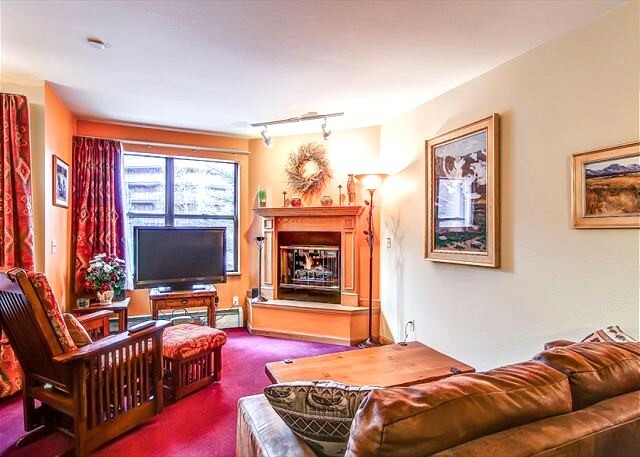 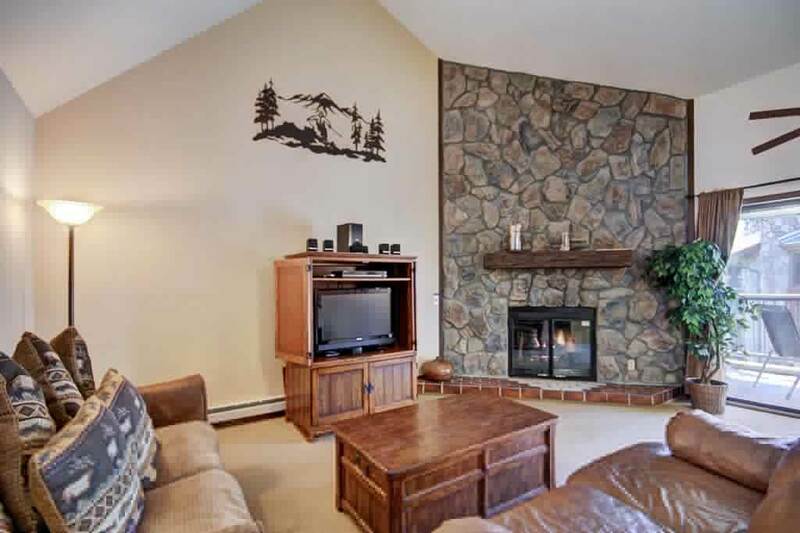 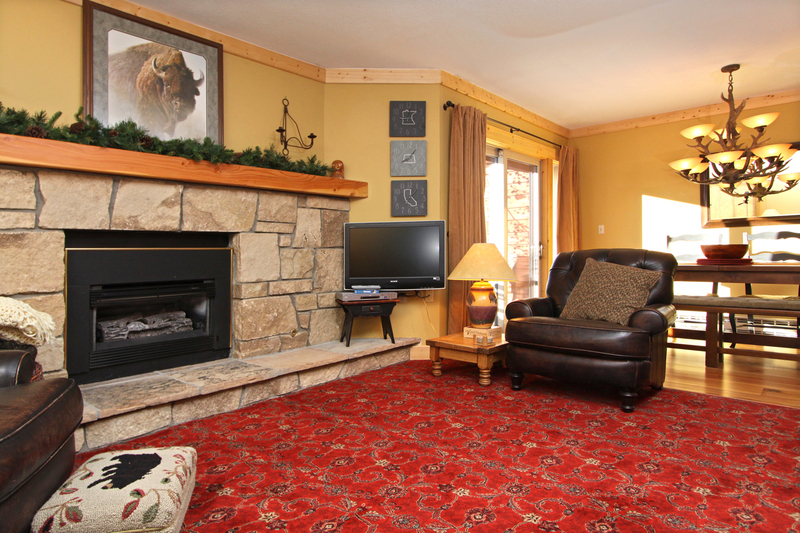 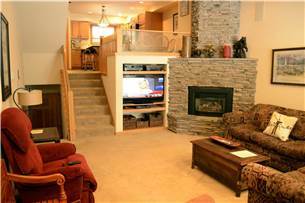 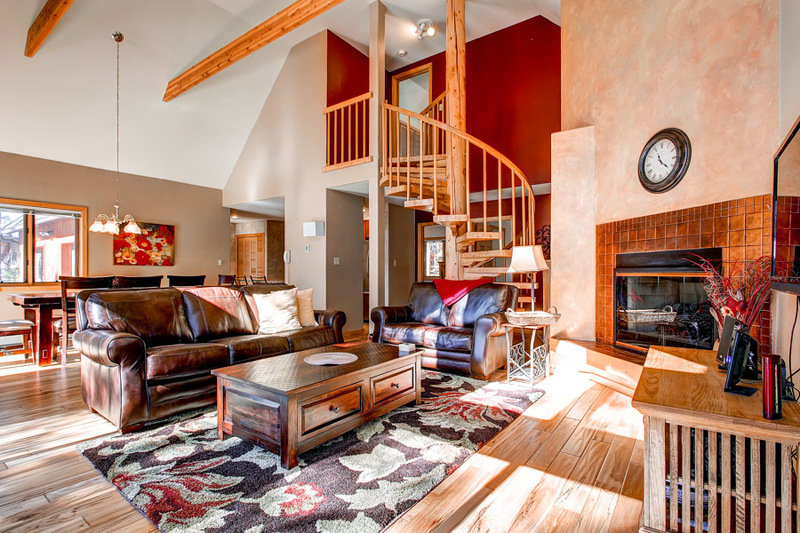 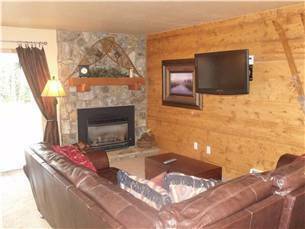 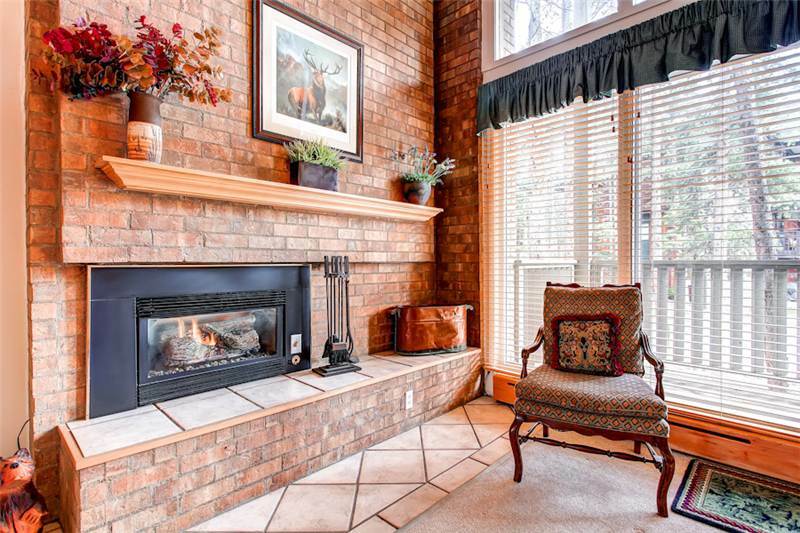 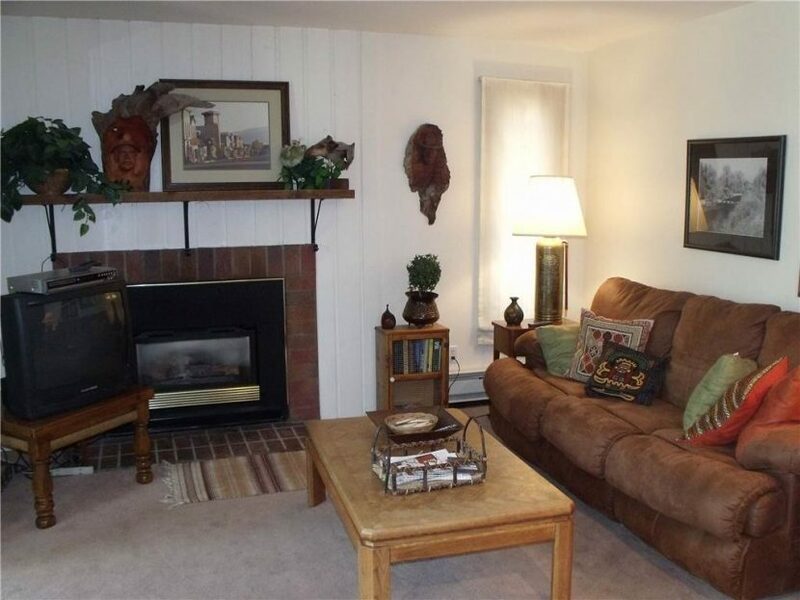 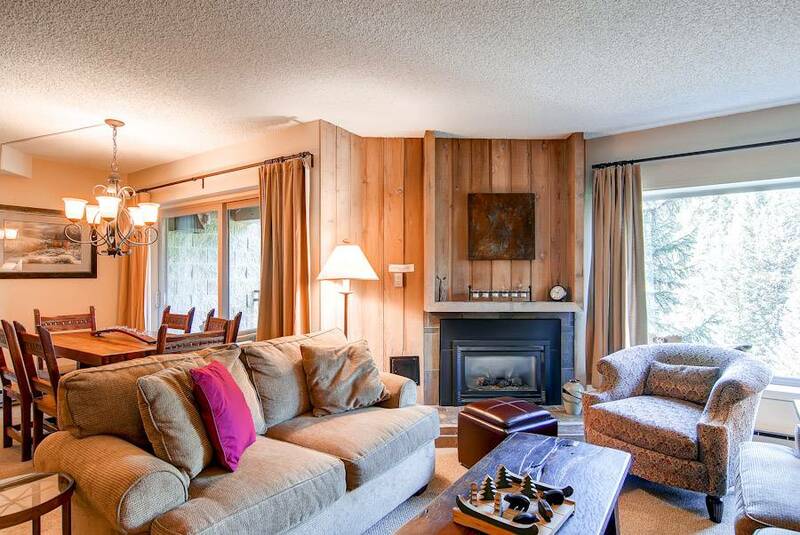 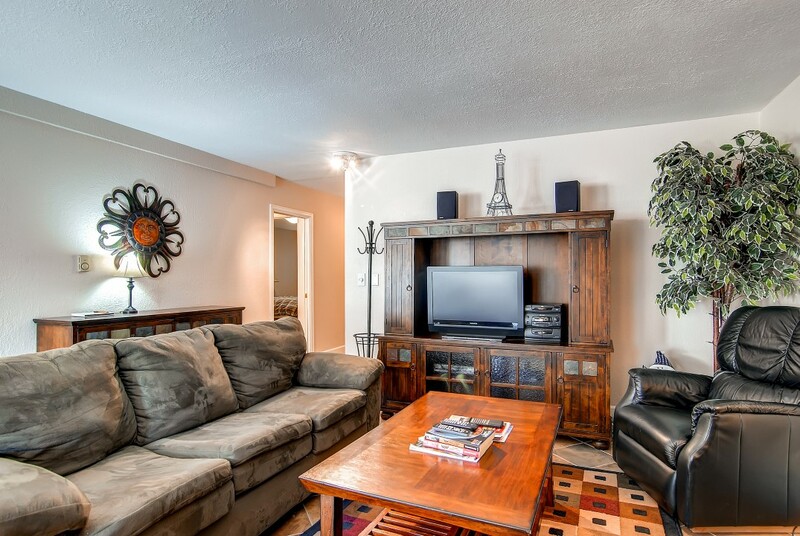 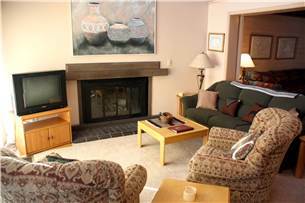 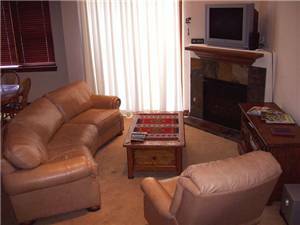 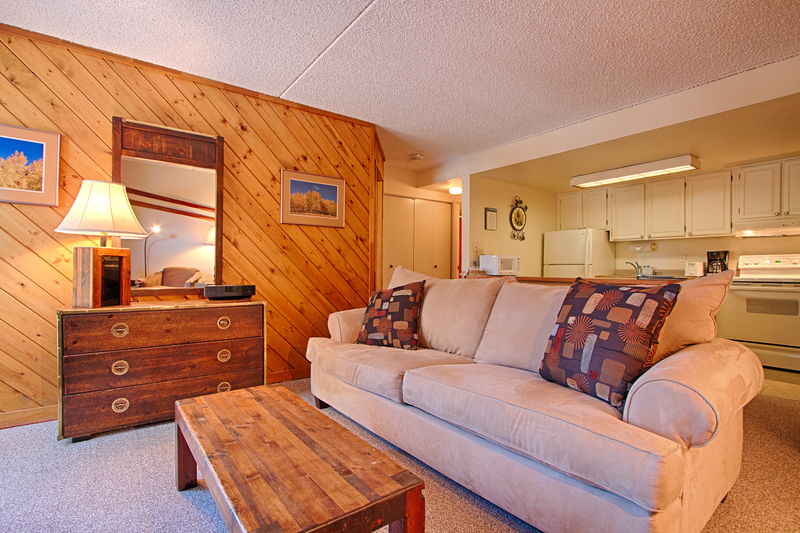 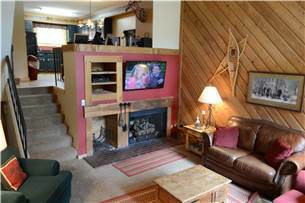 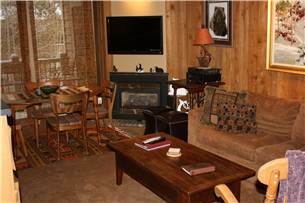 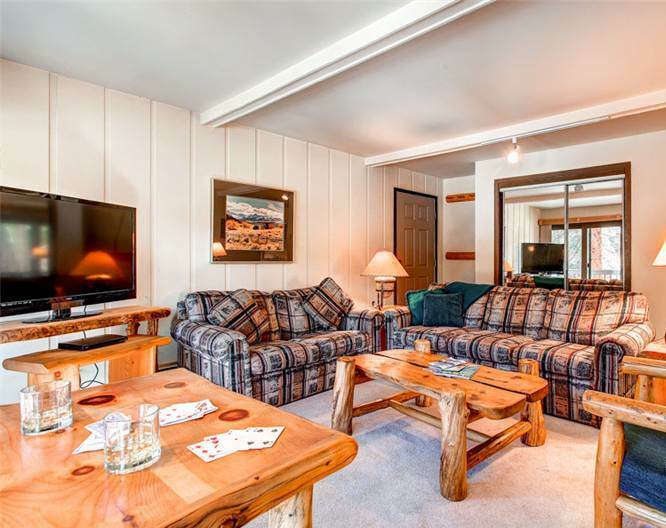 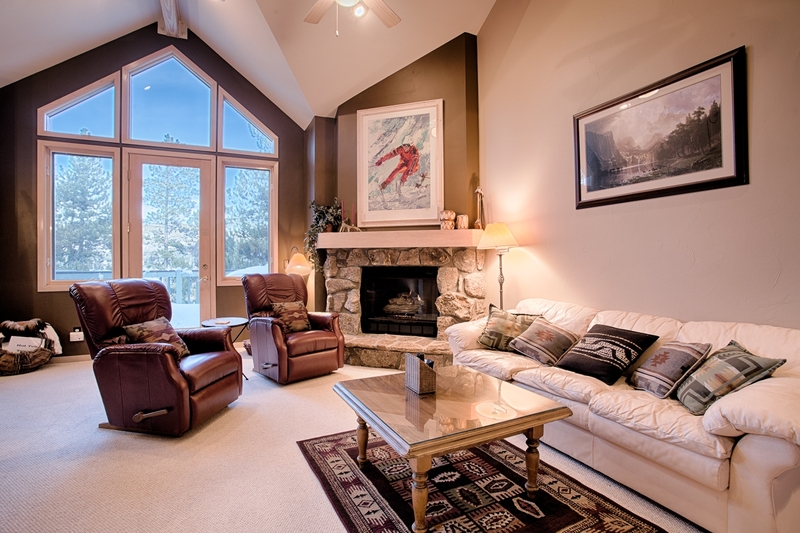 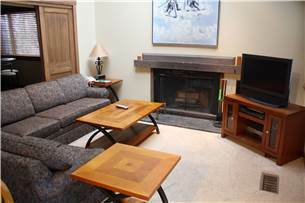 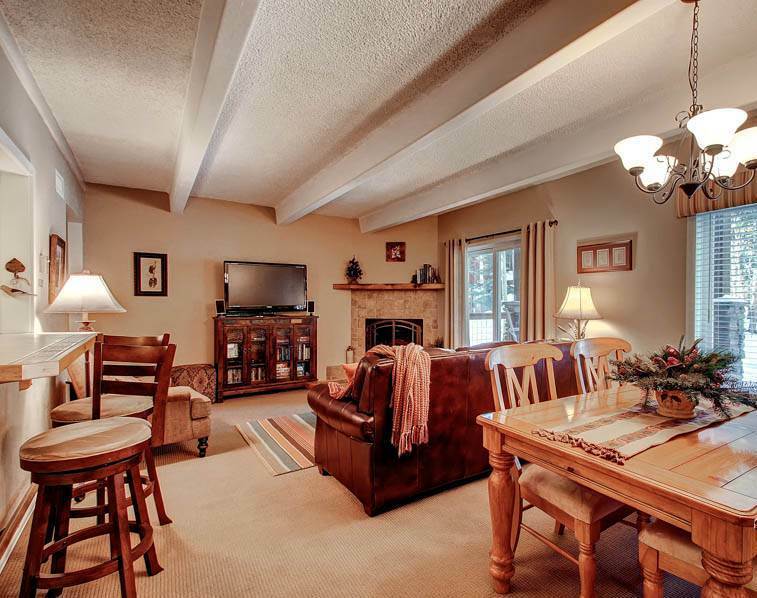 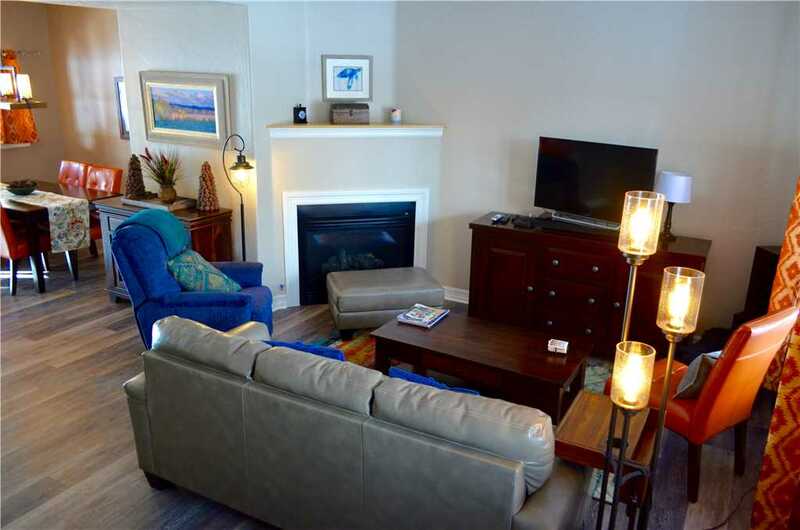 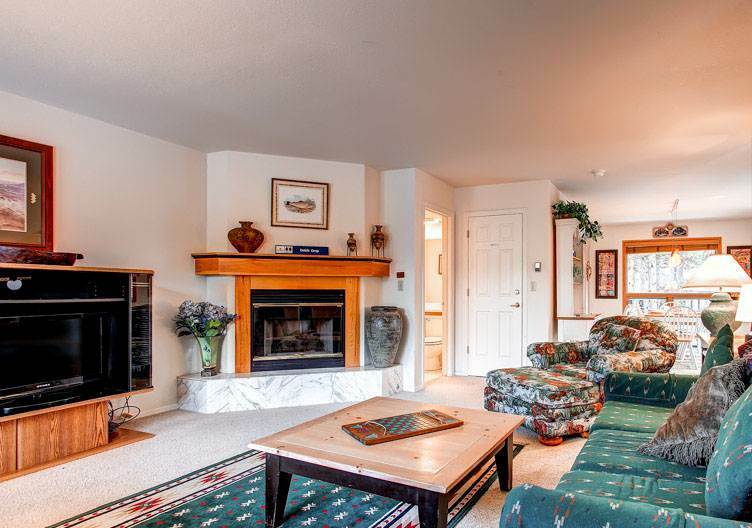 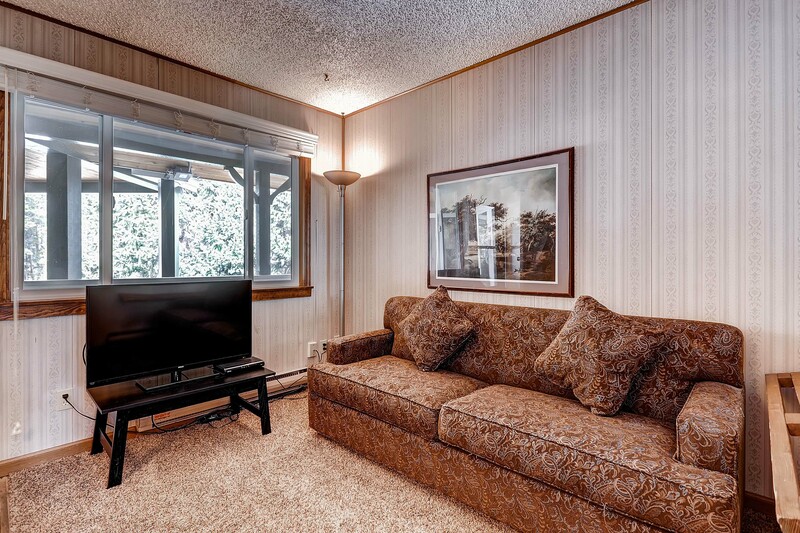 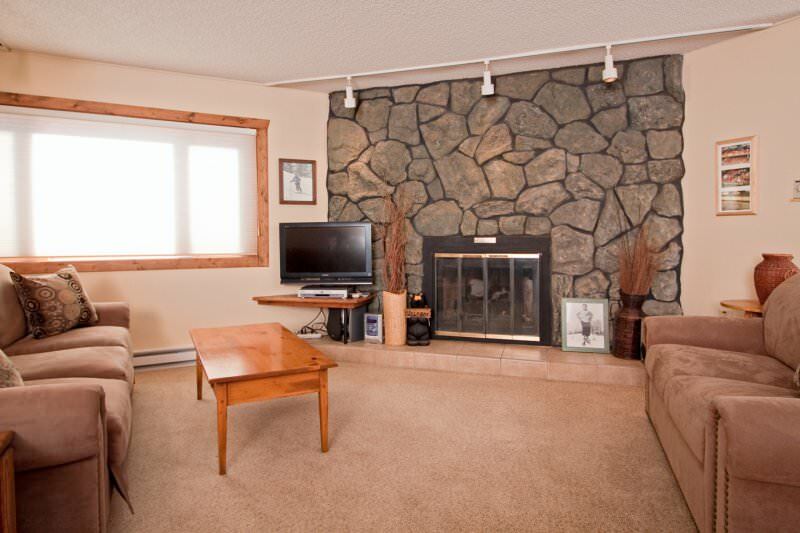 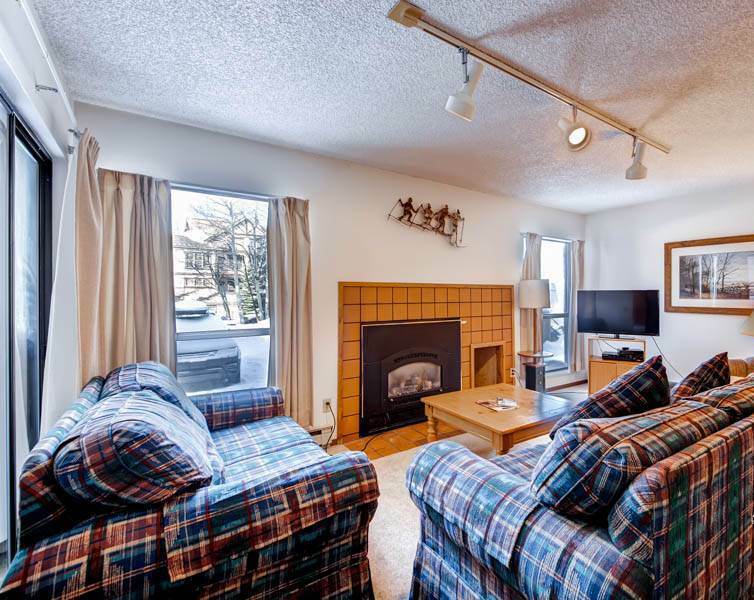 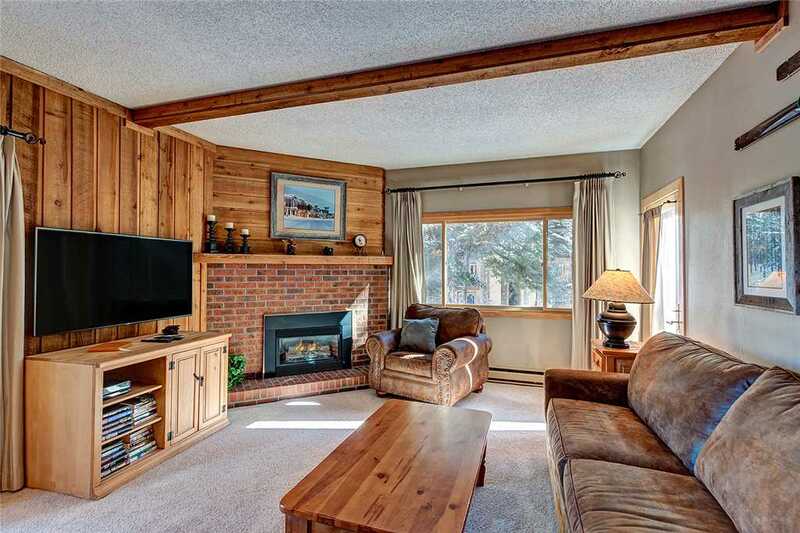 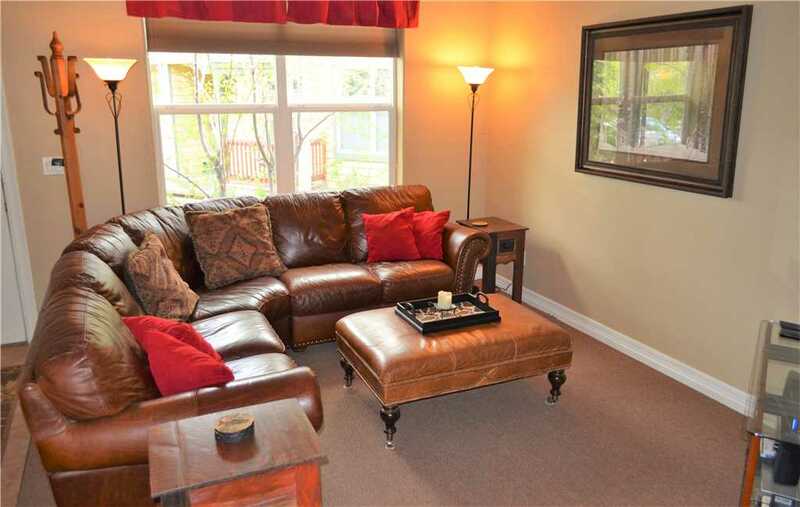 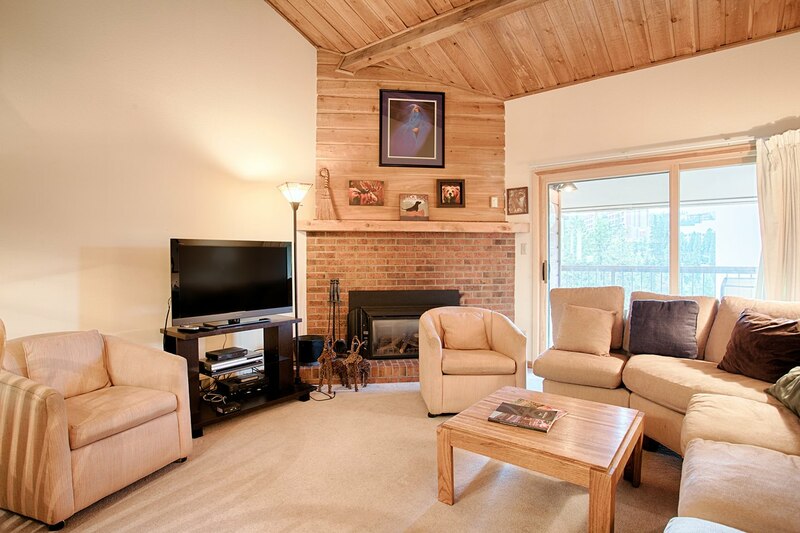 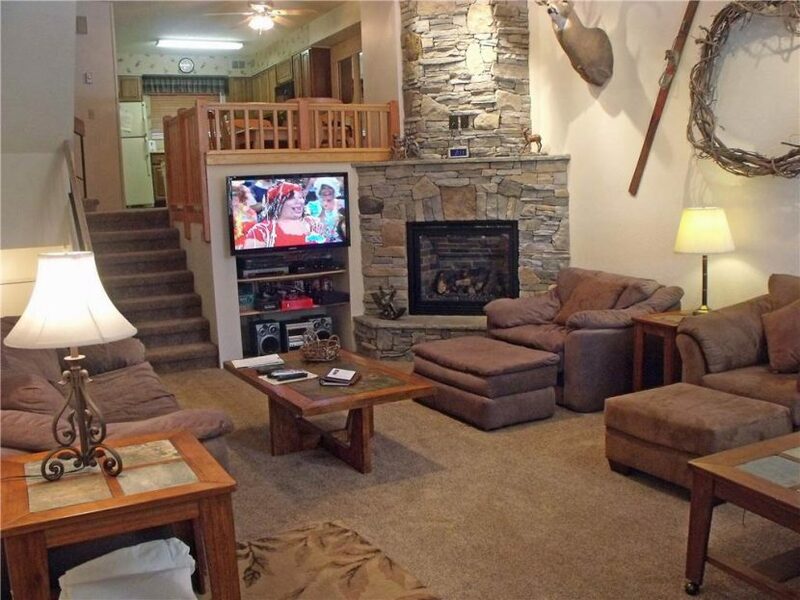 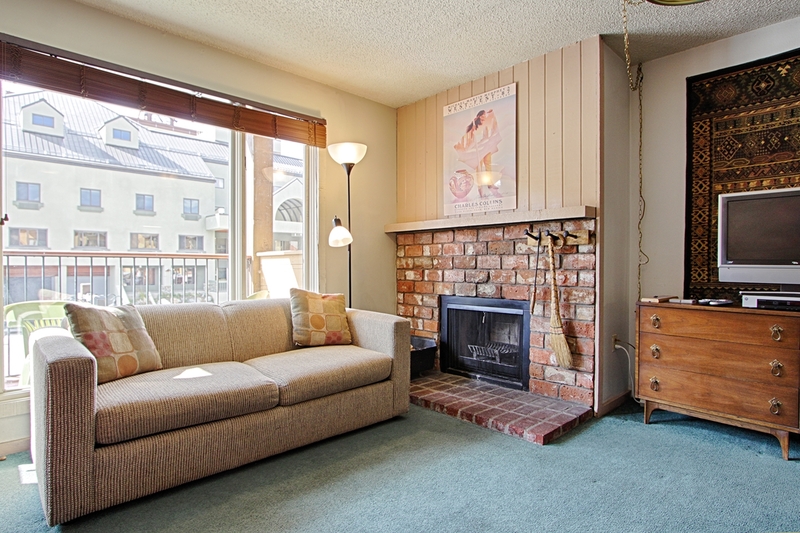 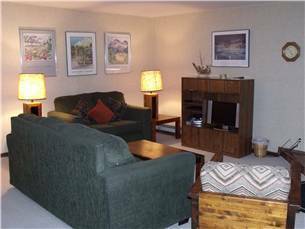 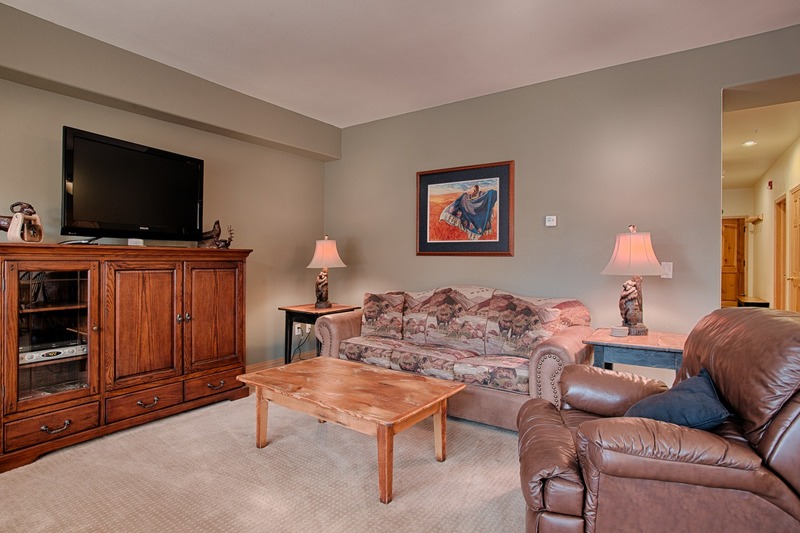 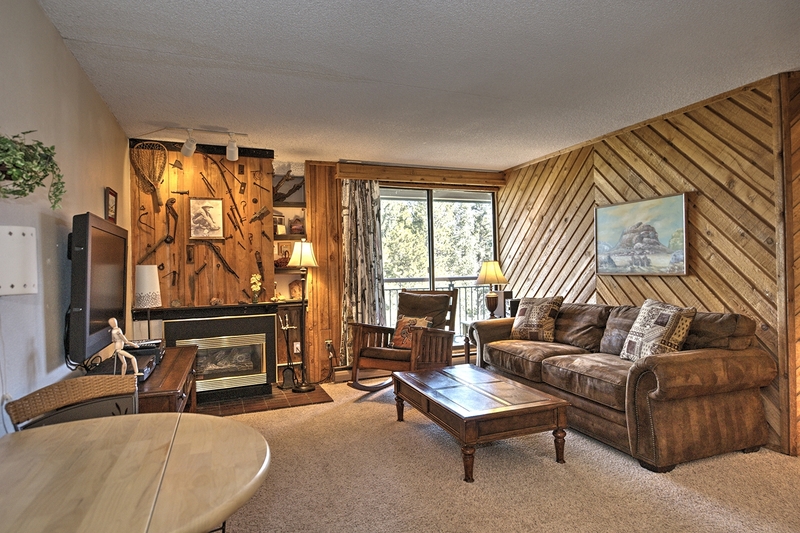 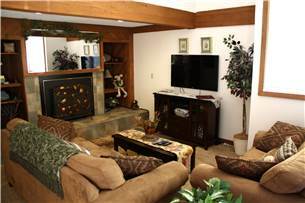 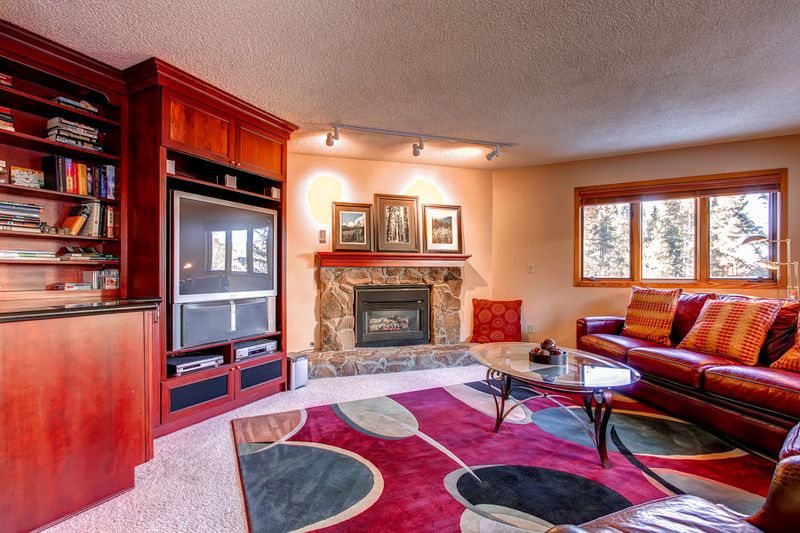 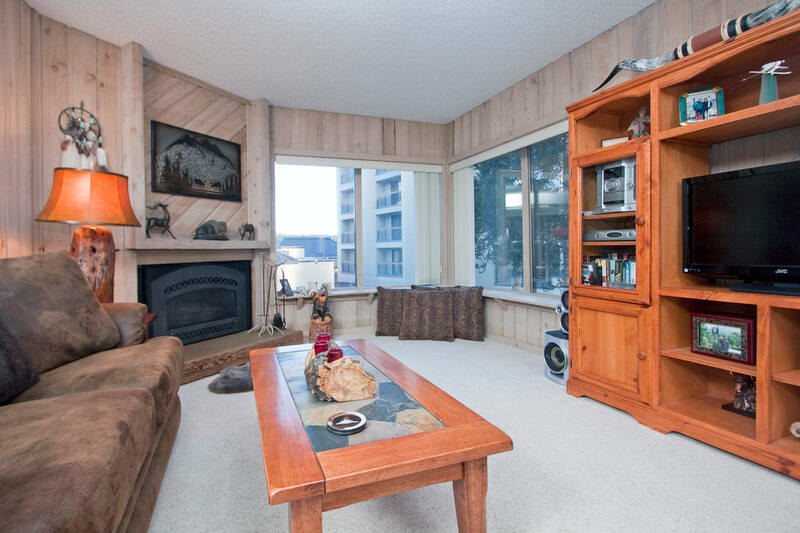 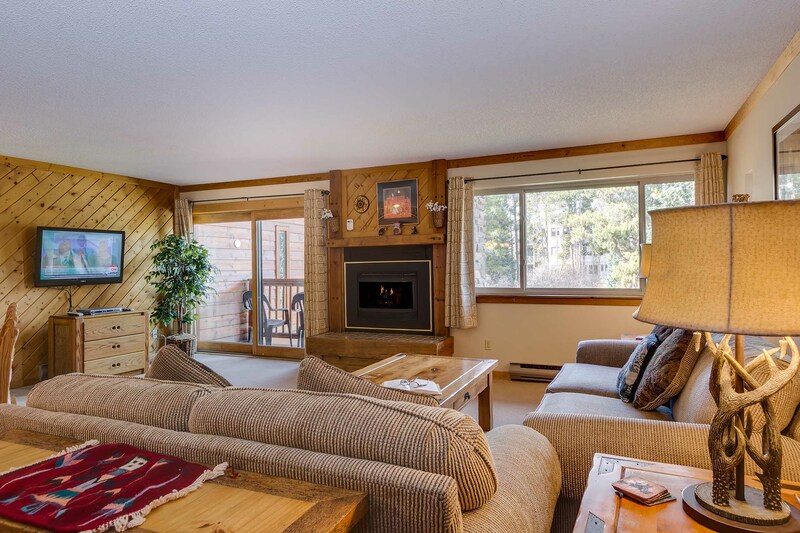 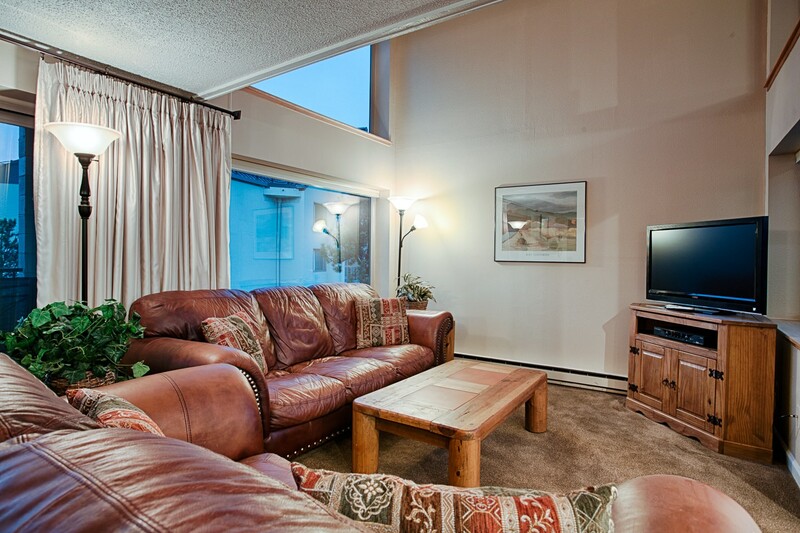 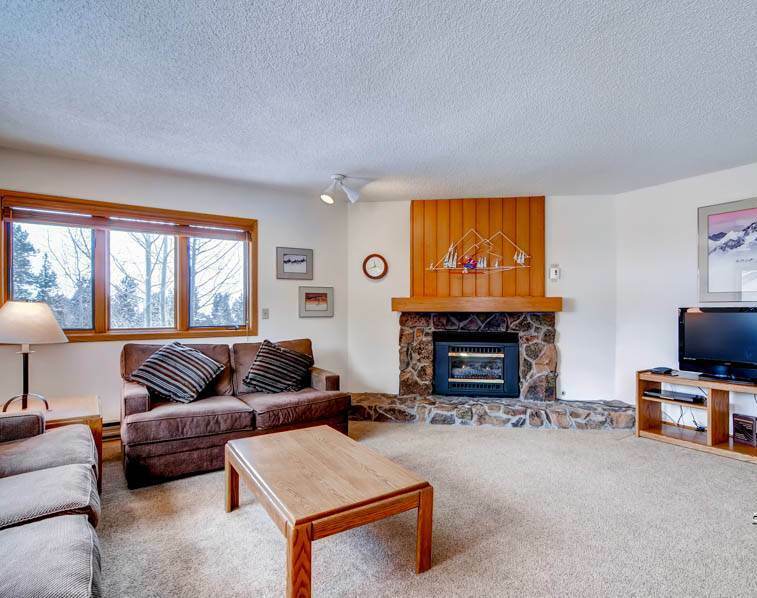 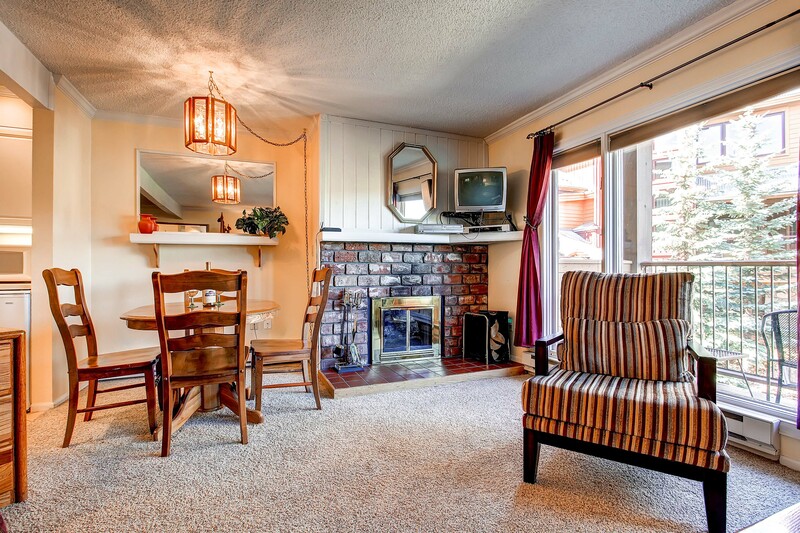 Both offer flat screen televisions, en suite full bathrooms and a walk out patio. 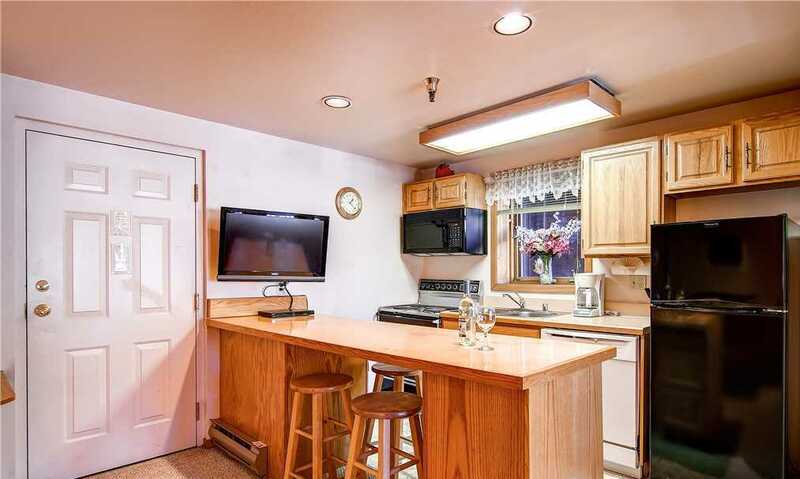 Also on this level is a stackable washer and dryer. 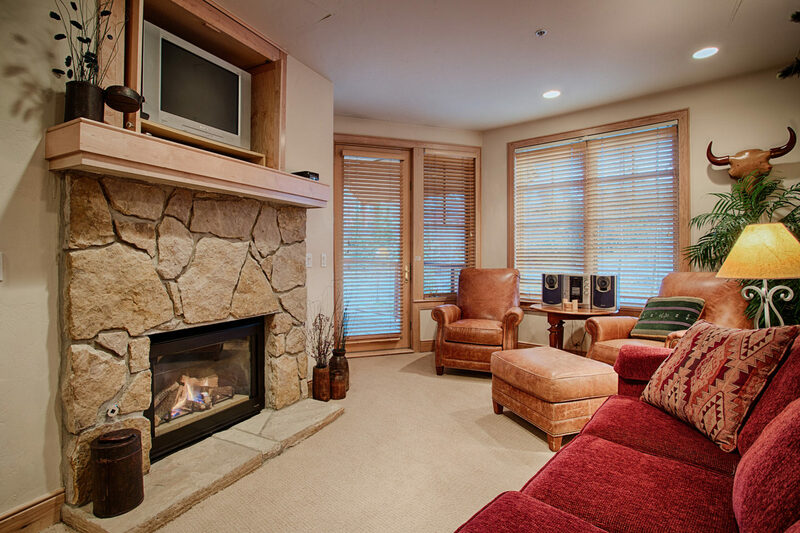 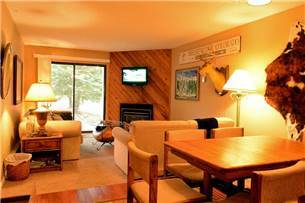 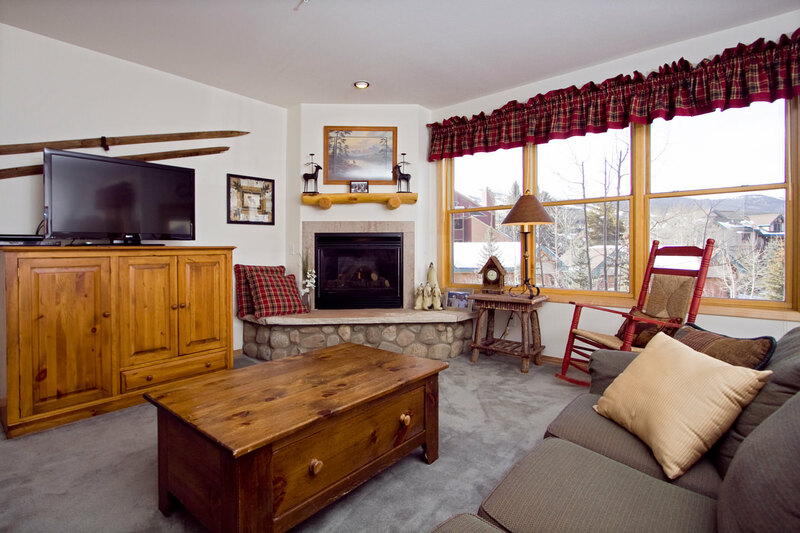 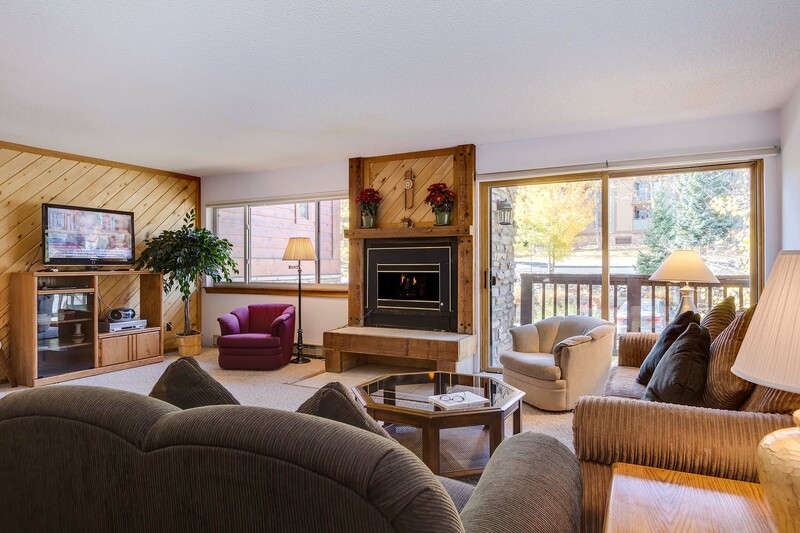 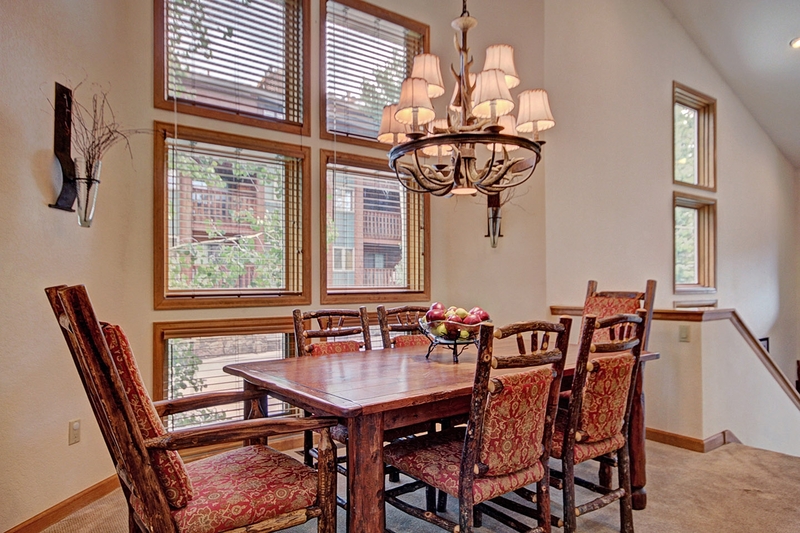 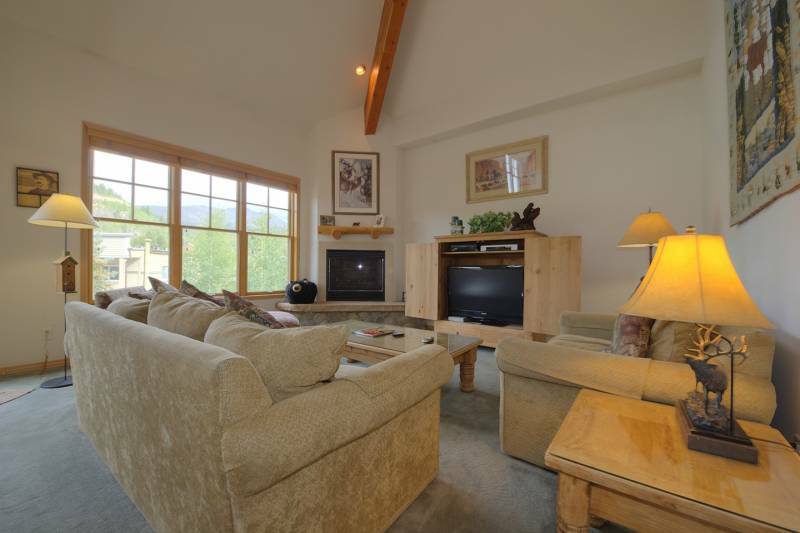 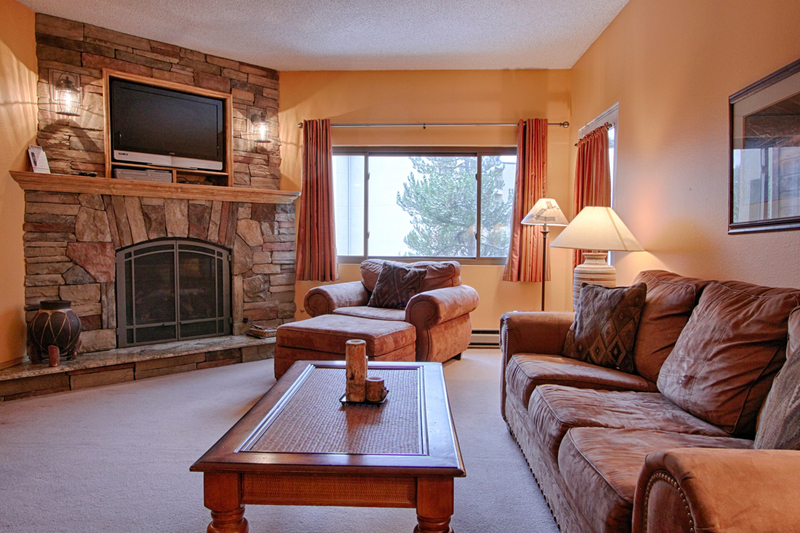 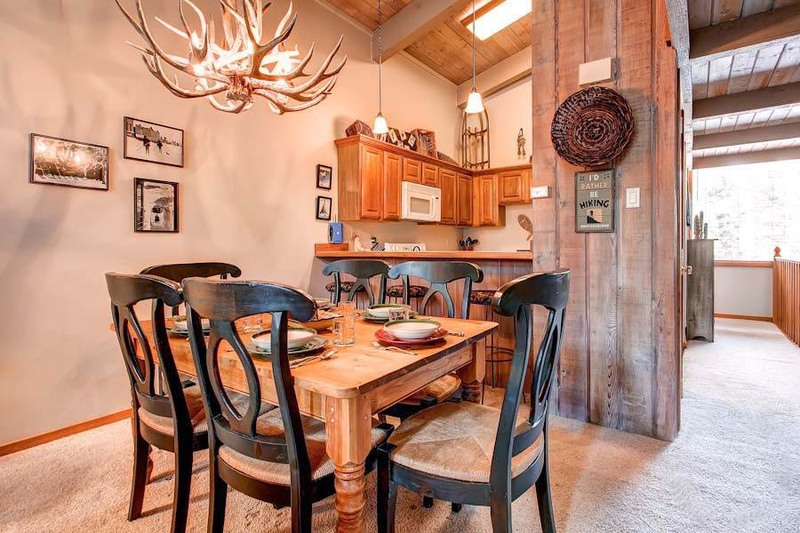 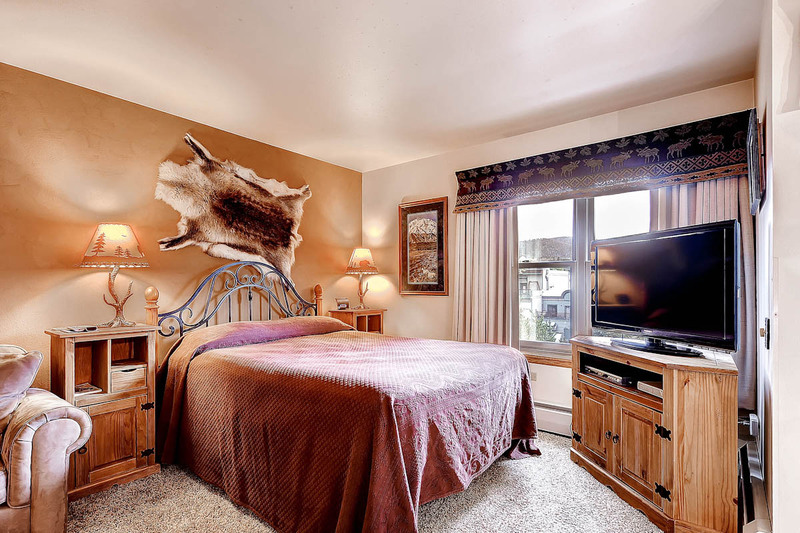 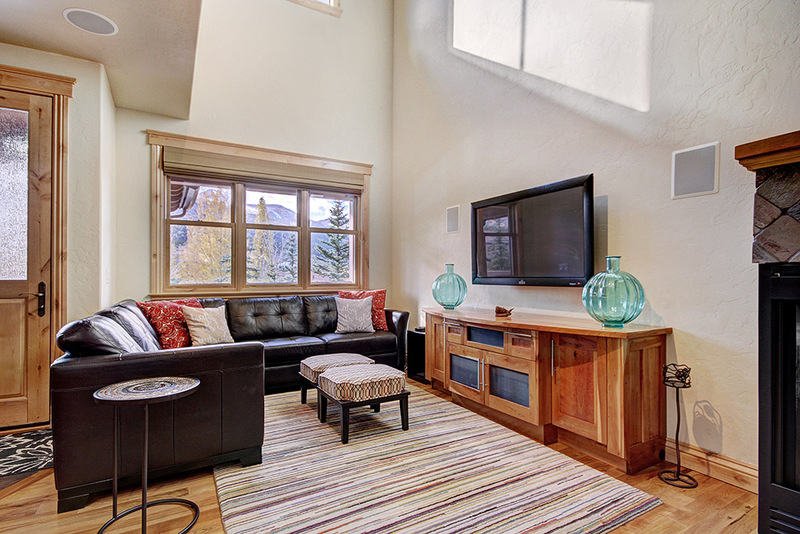 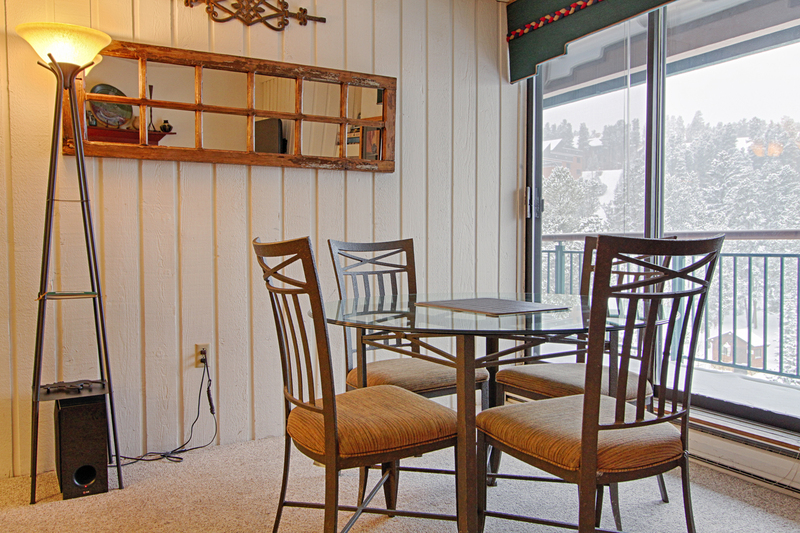 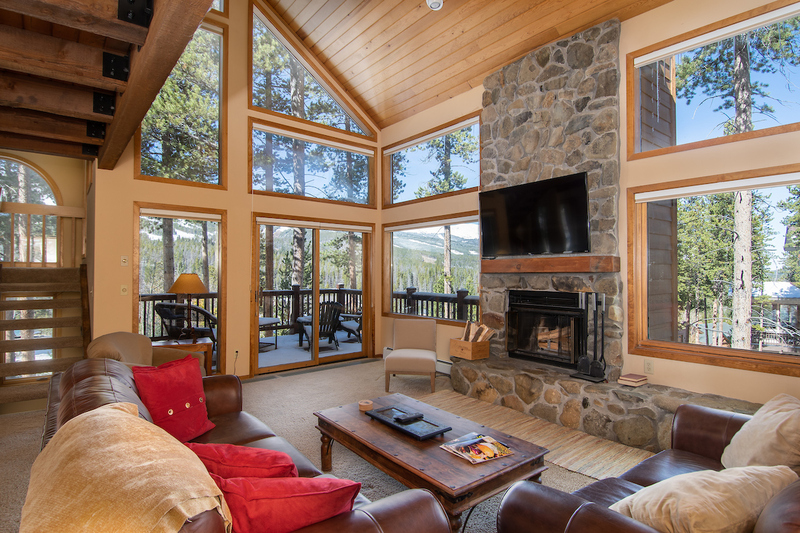 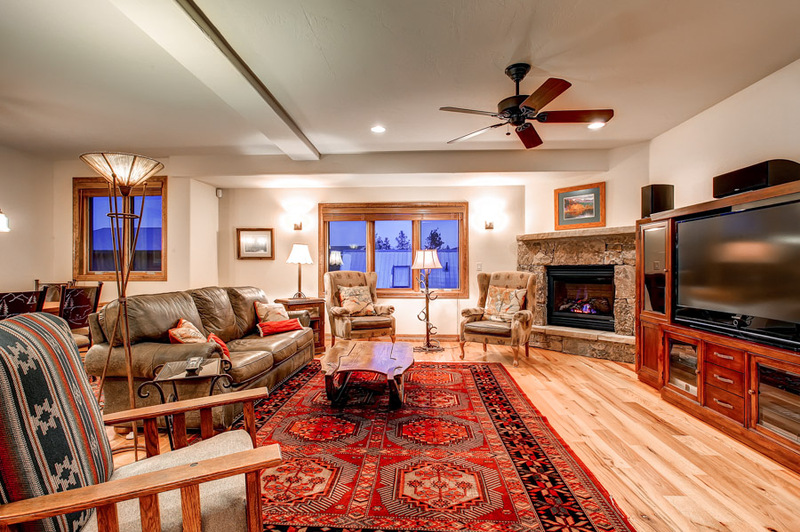 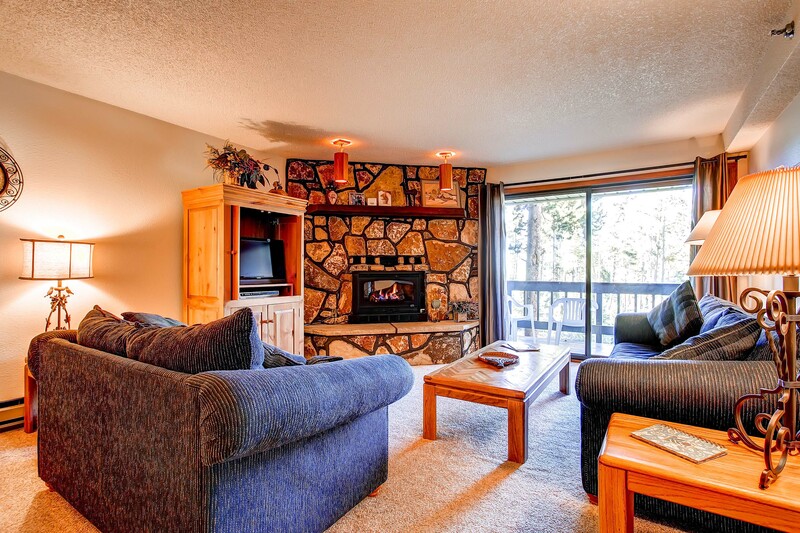 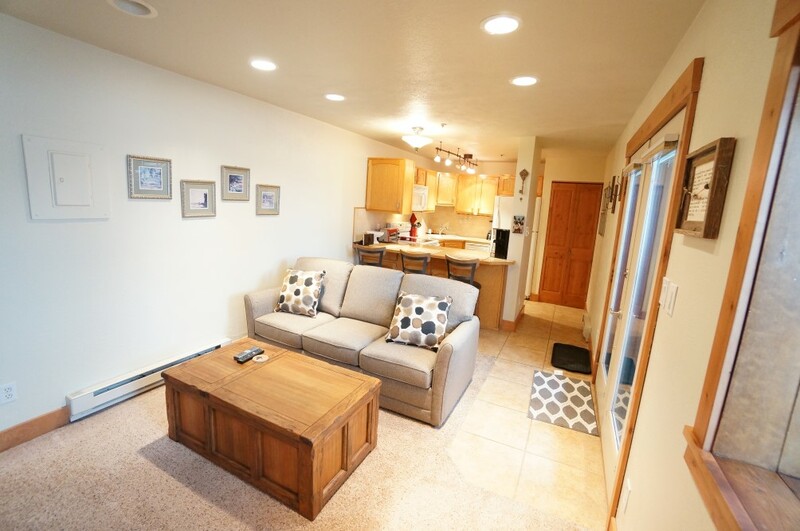 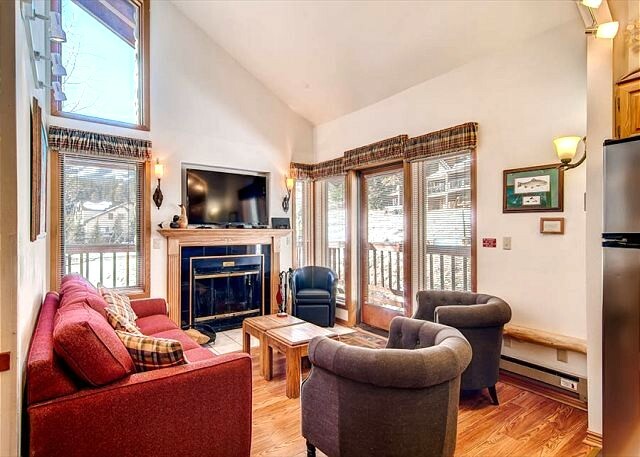 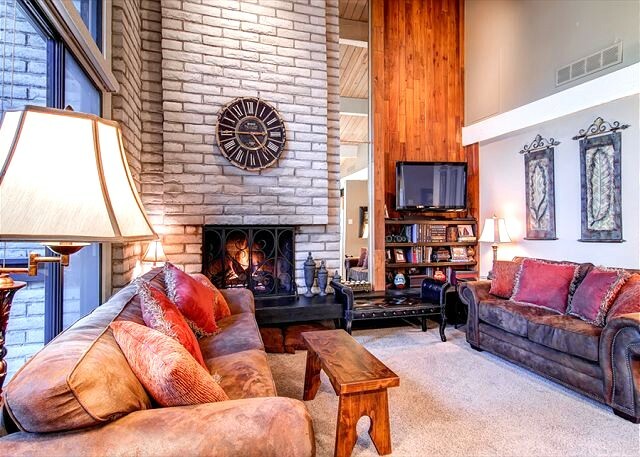 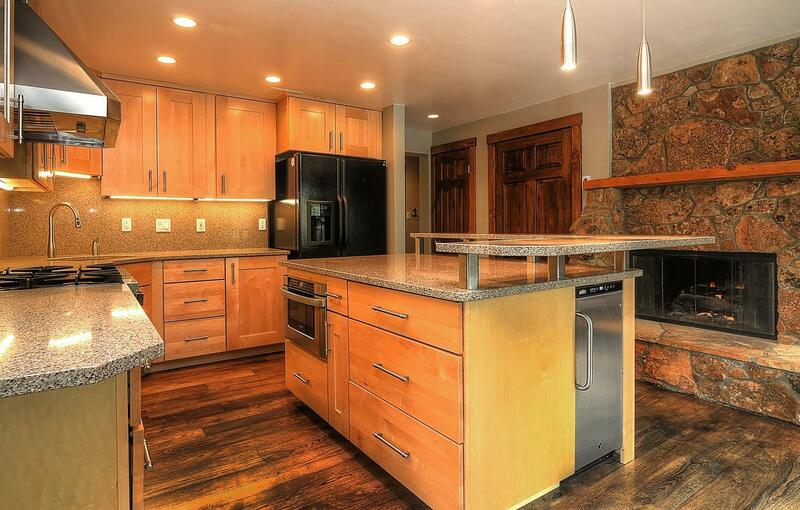 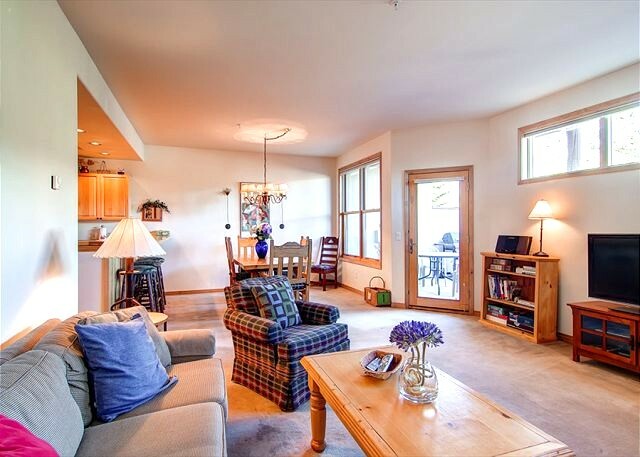 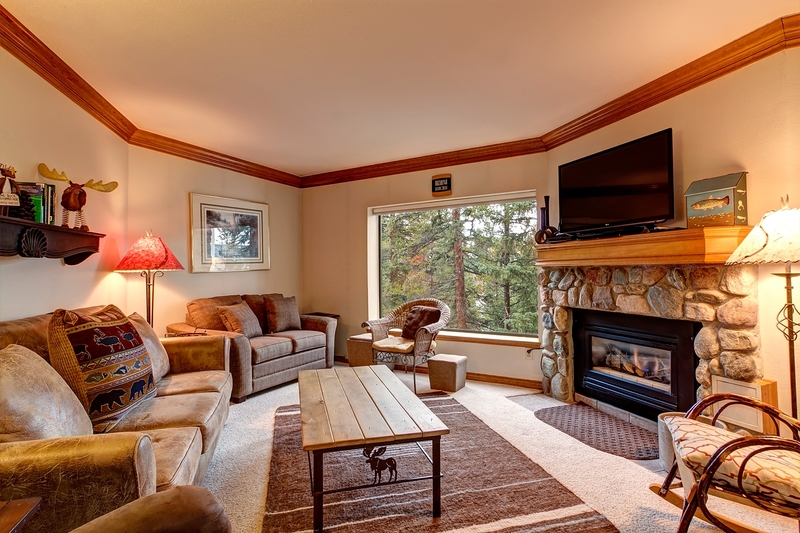 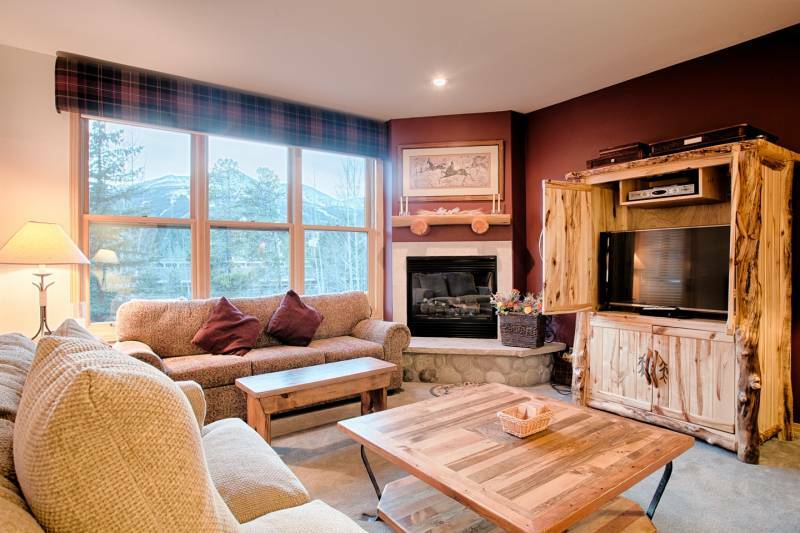 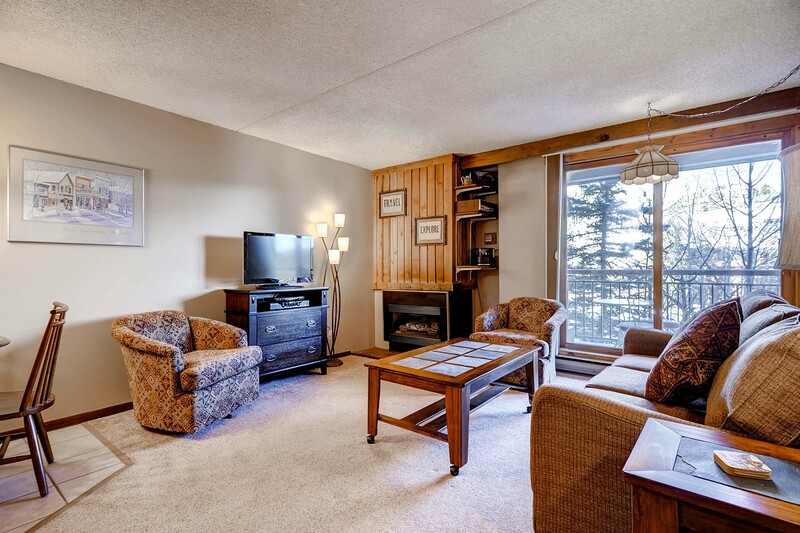 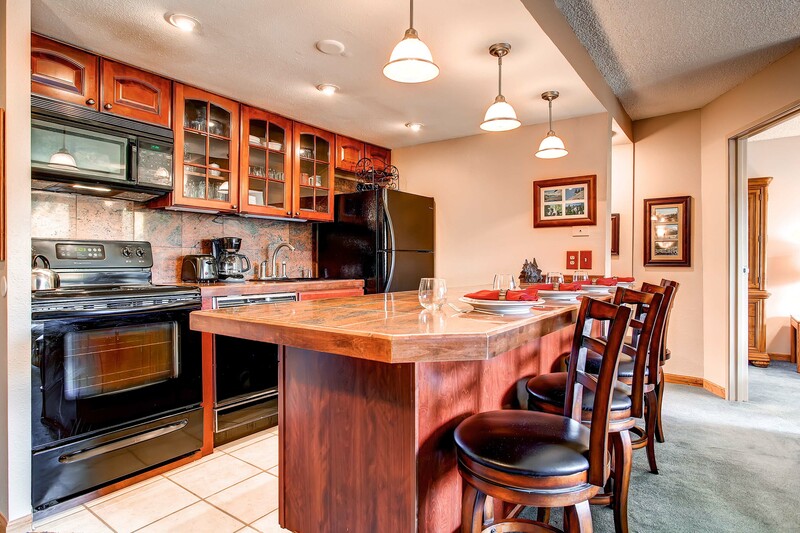 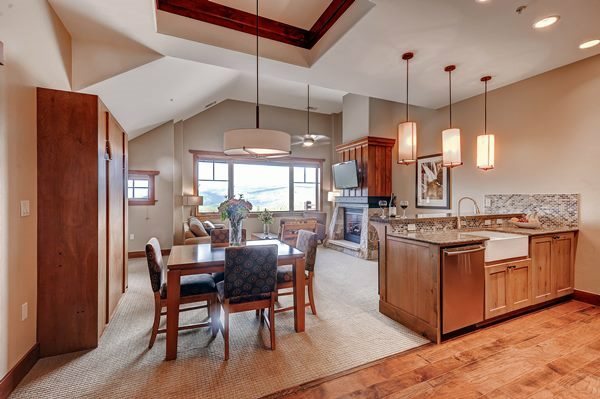 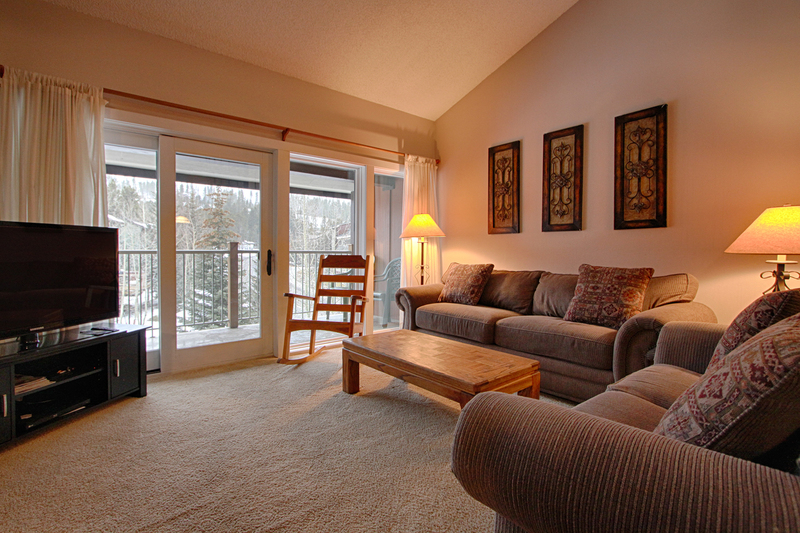 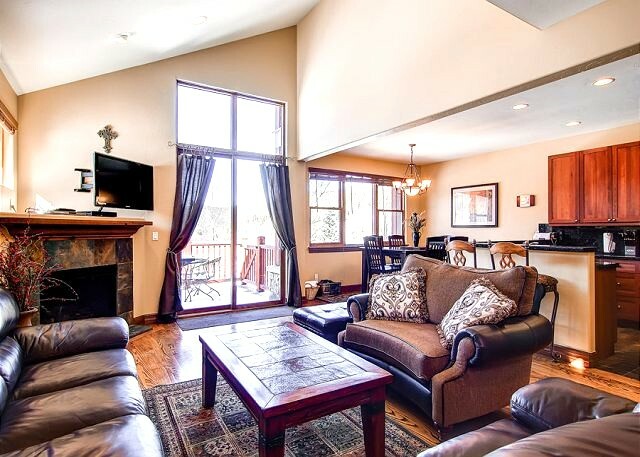 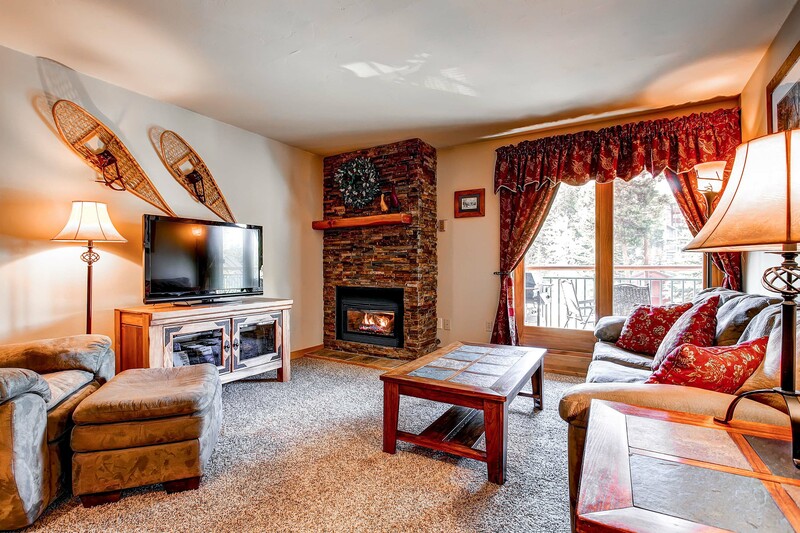 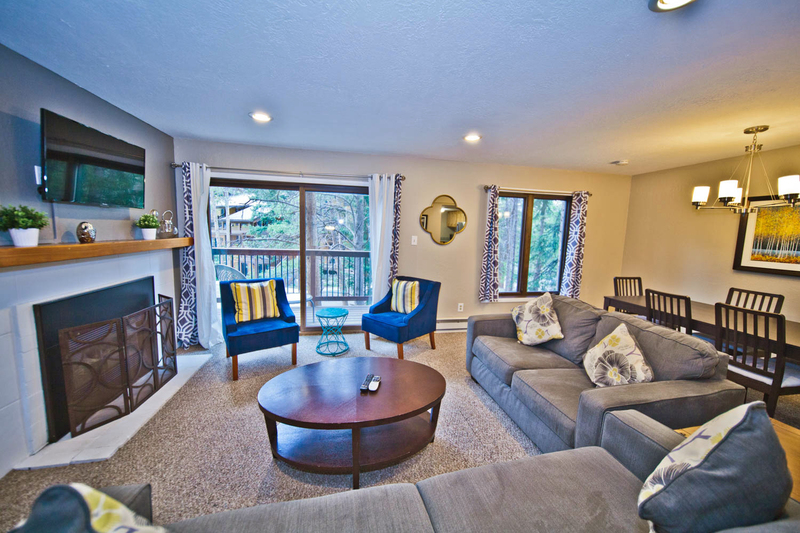 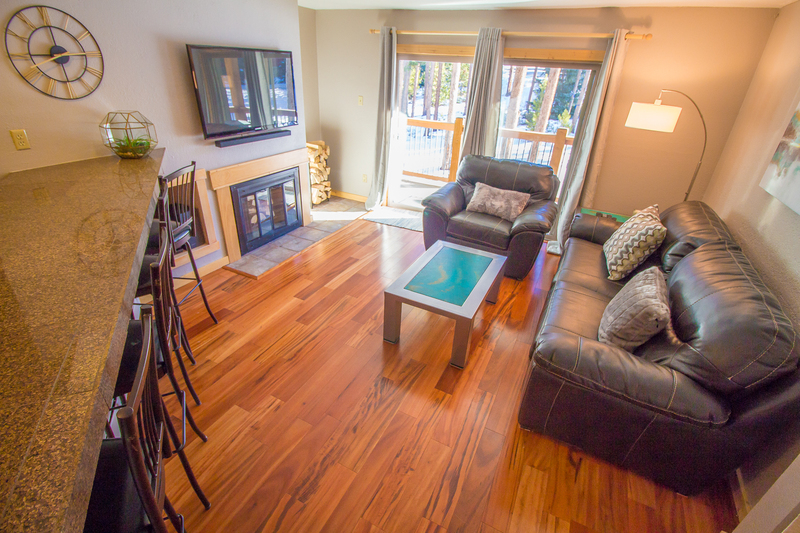 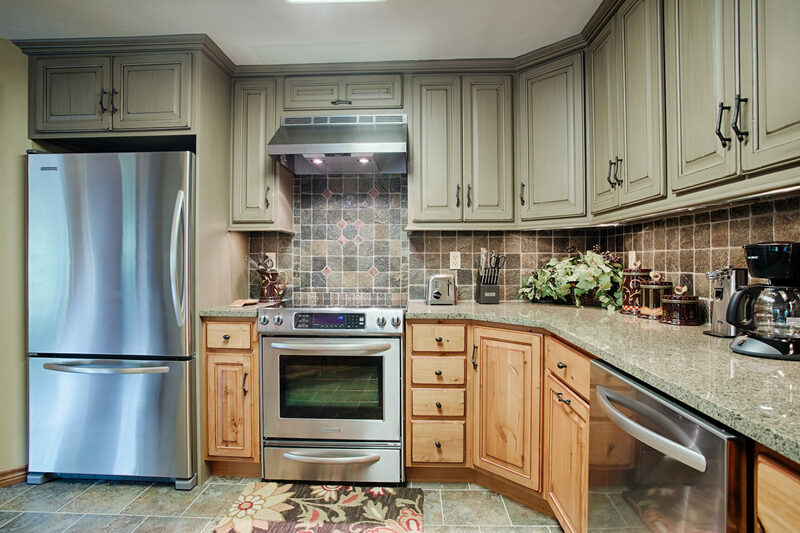 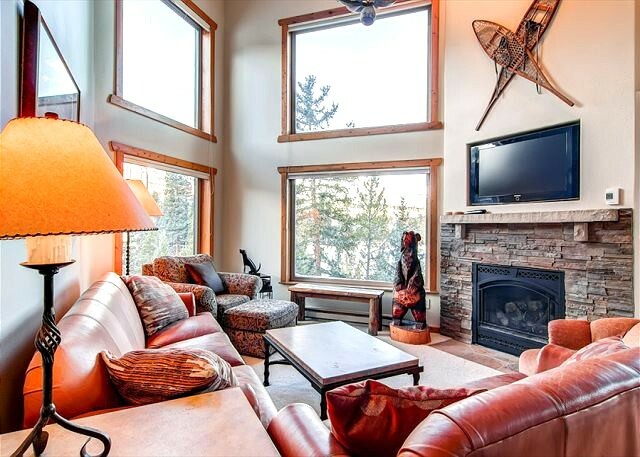 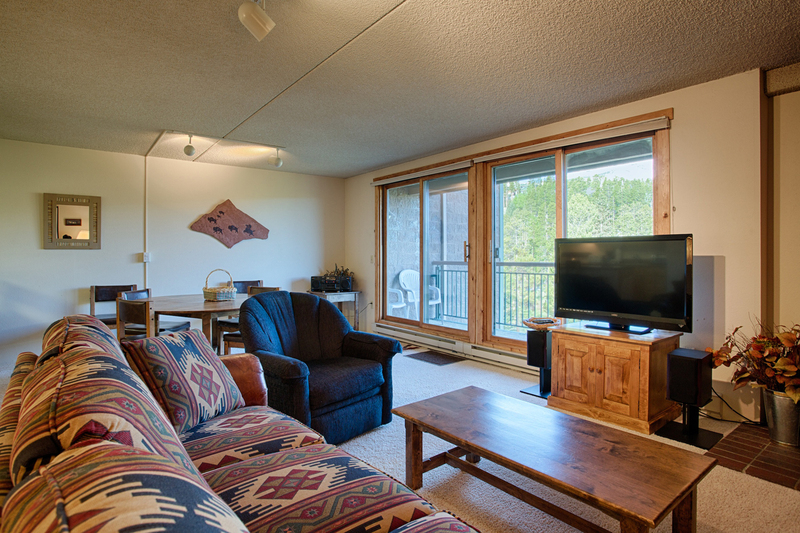 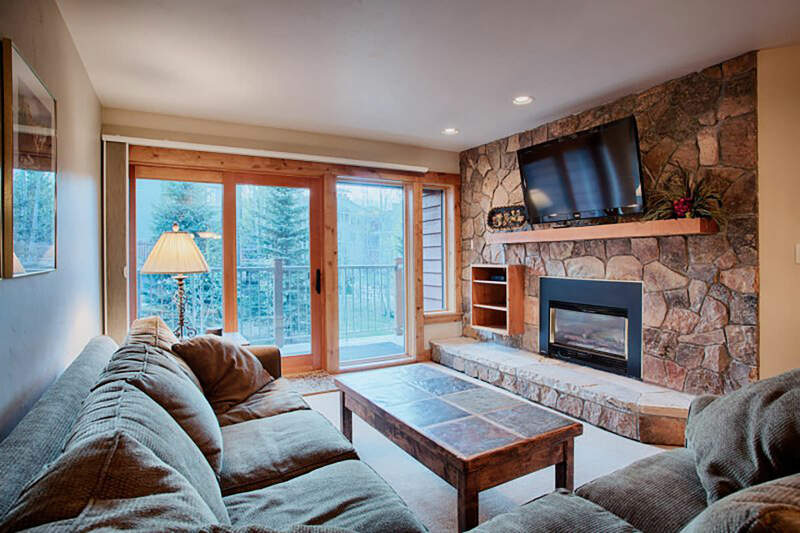 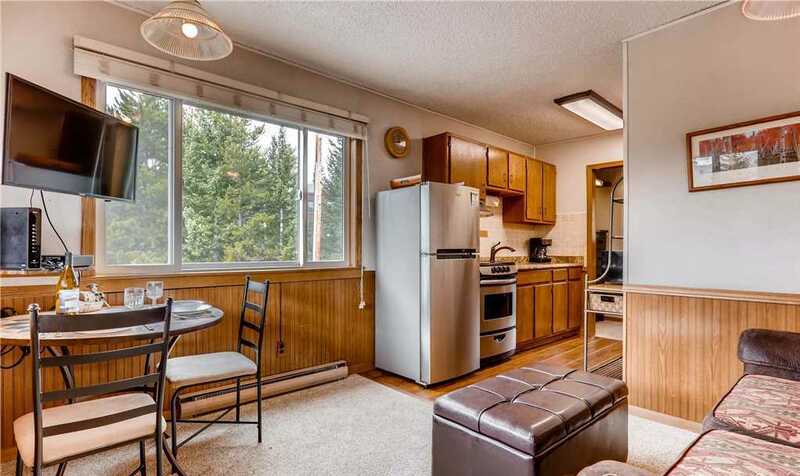 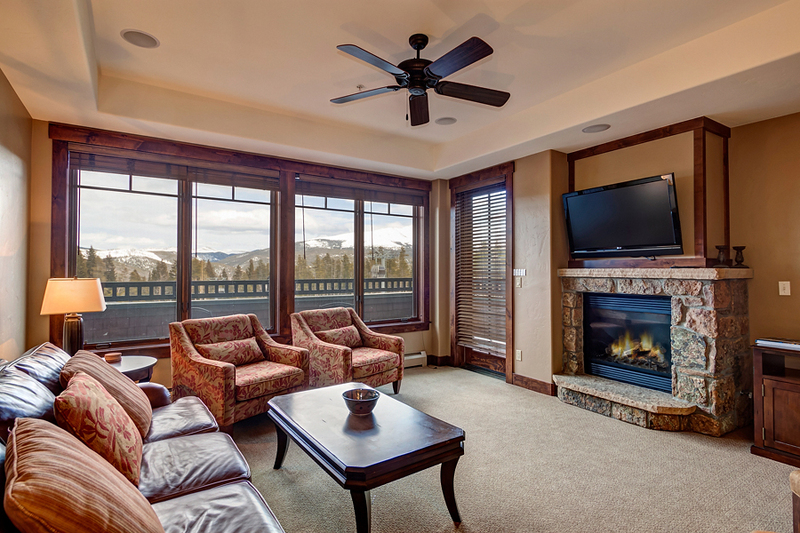 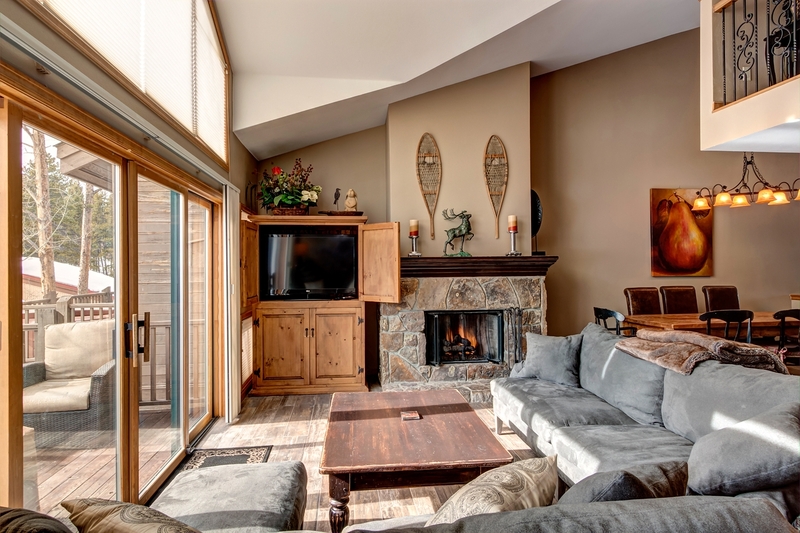 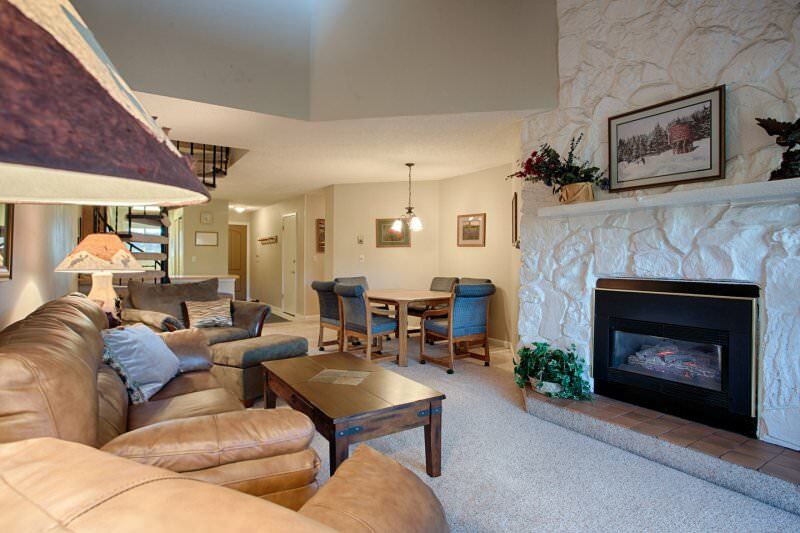 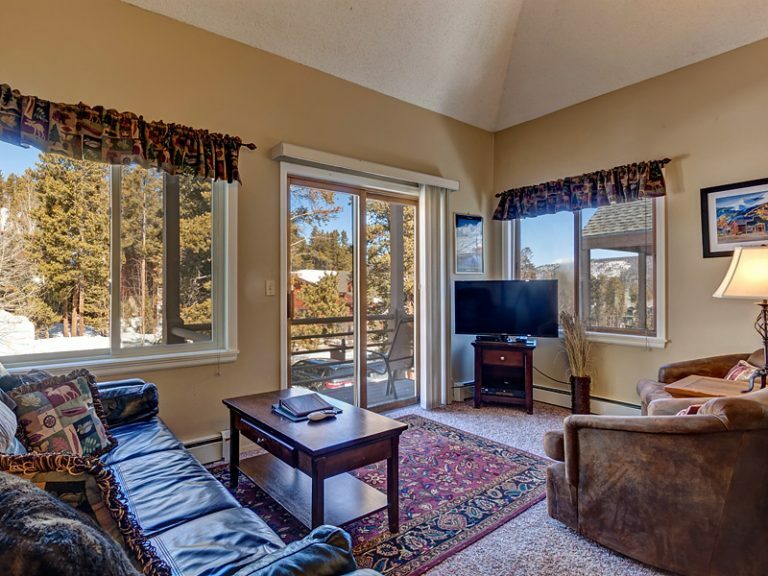 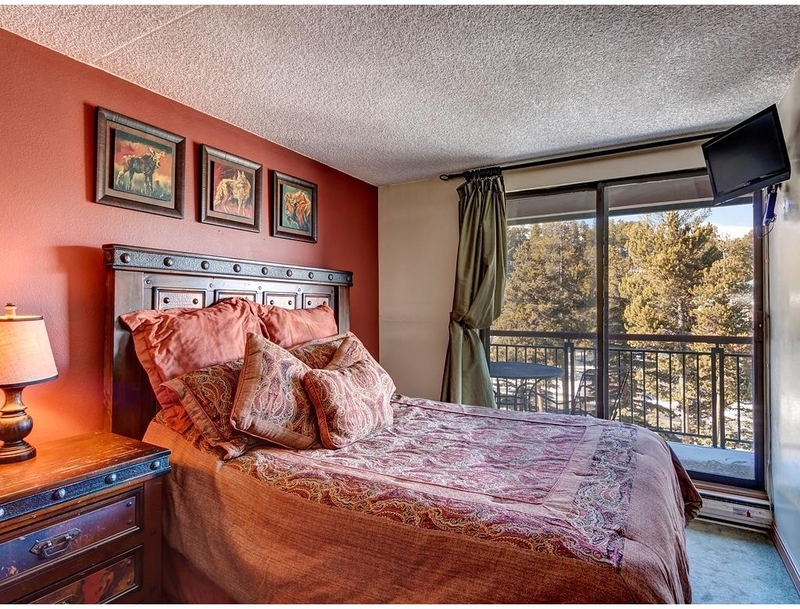 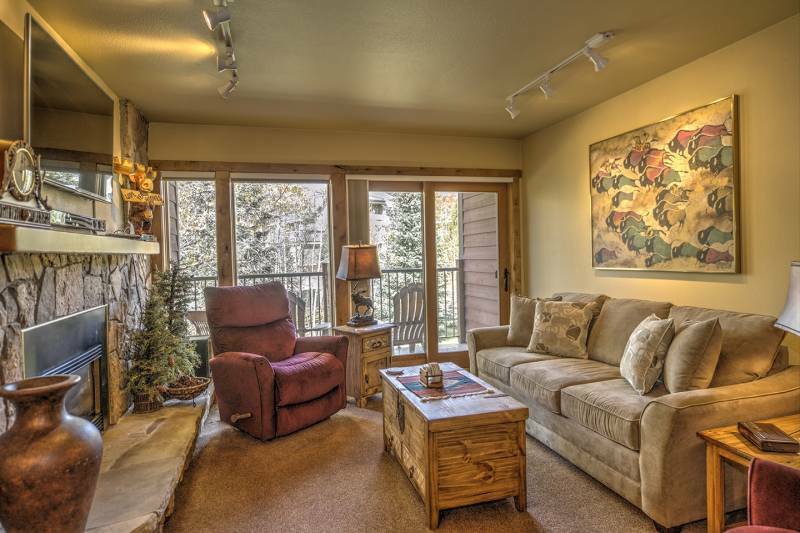 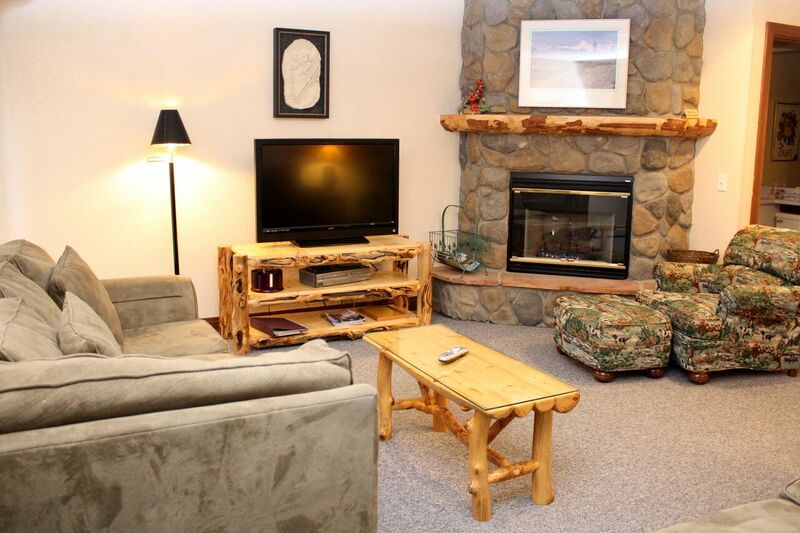 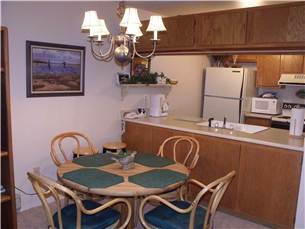 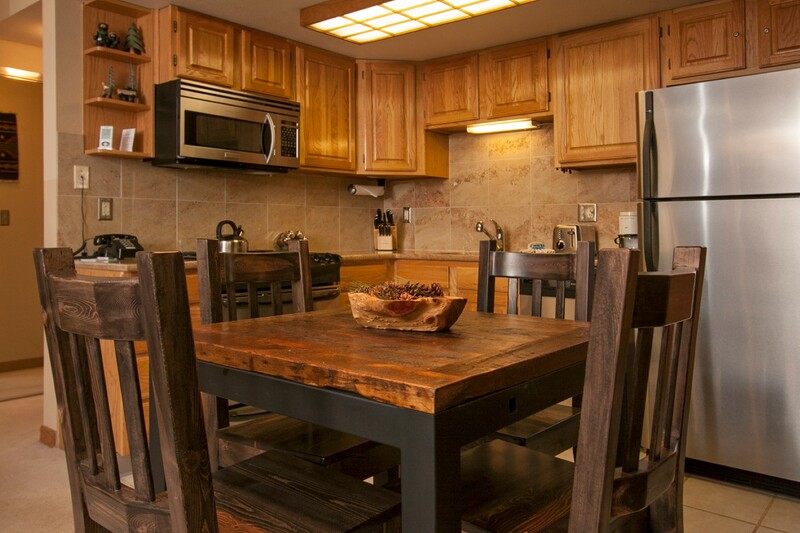 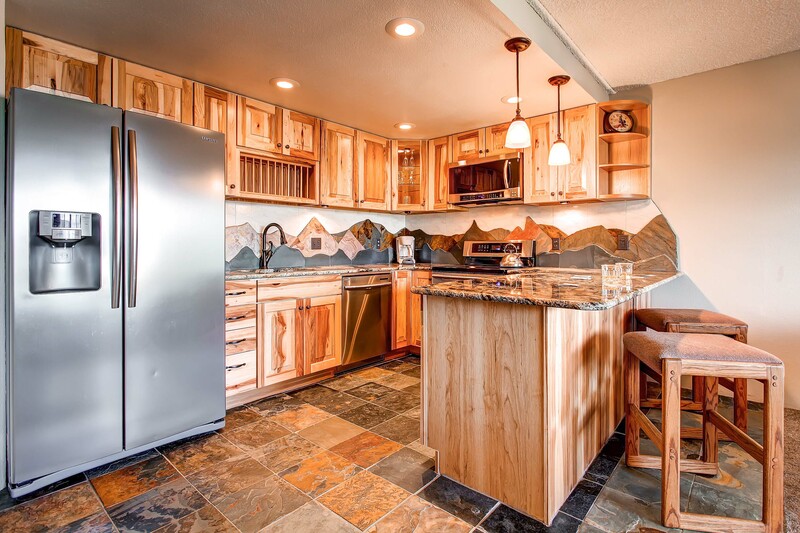 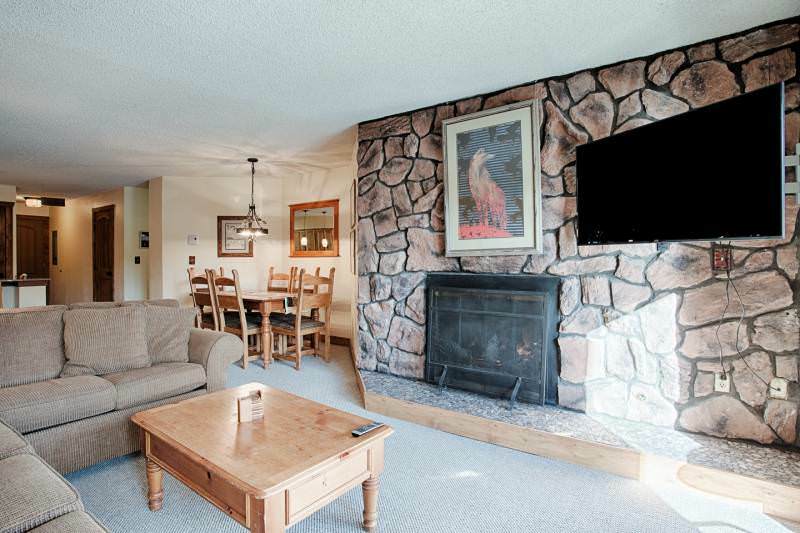 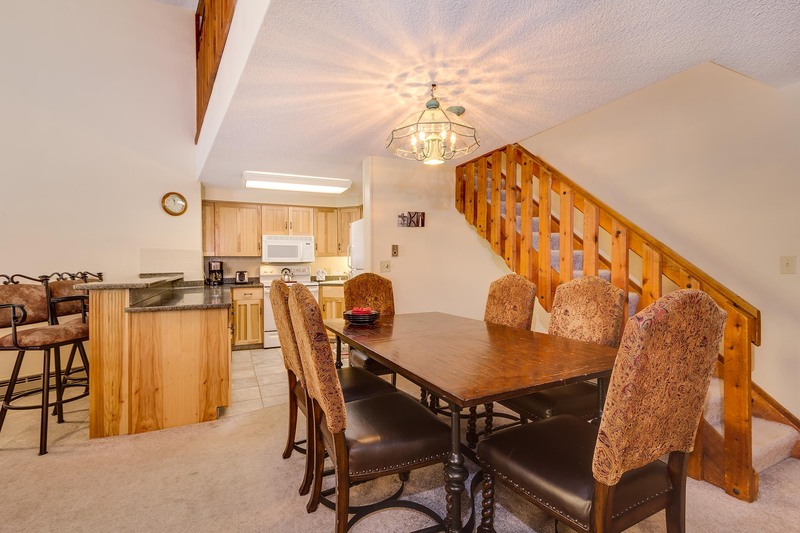 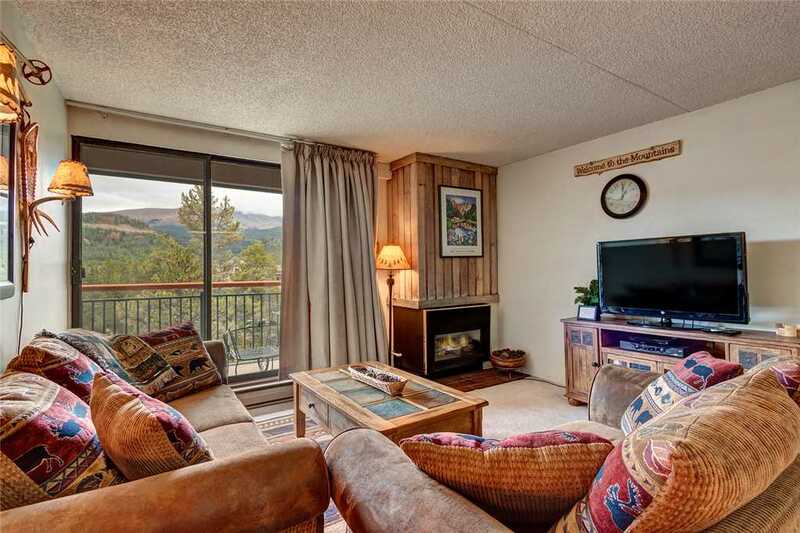 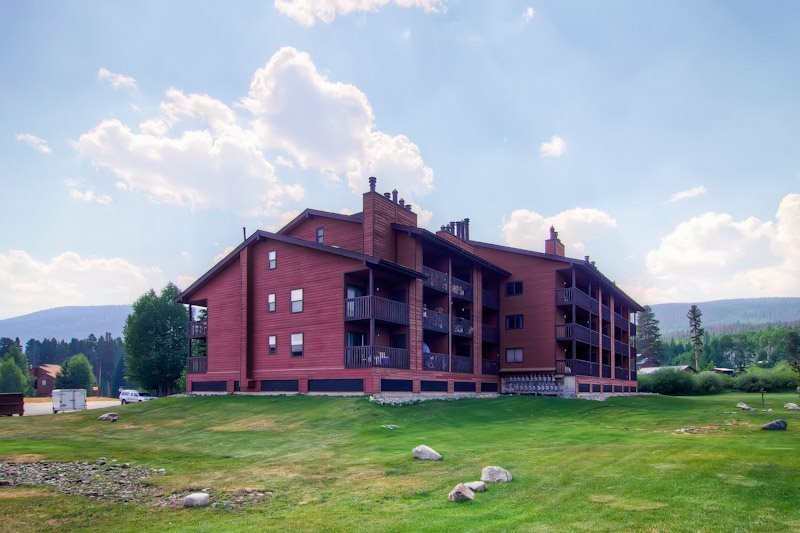 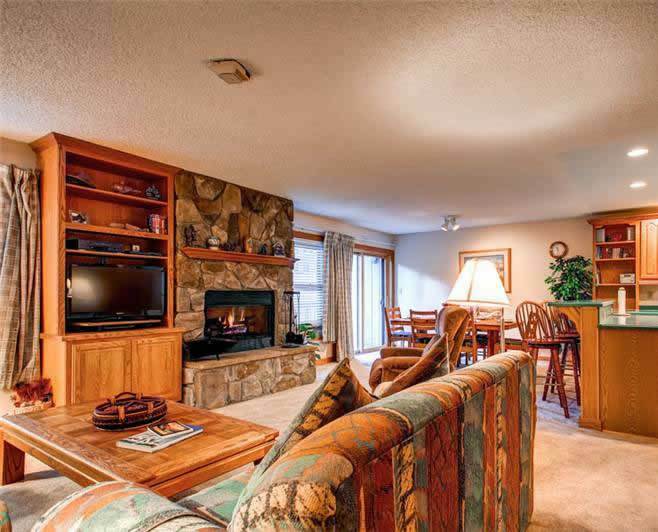 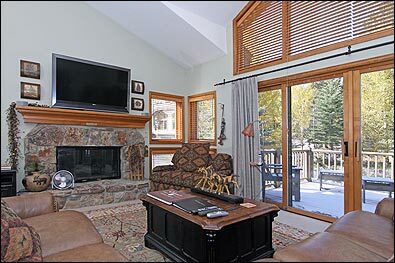 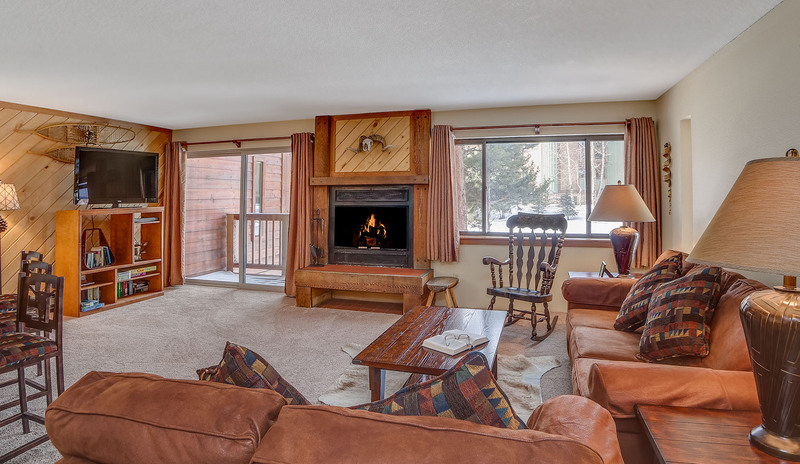 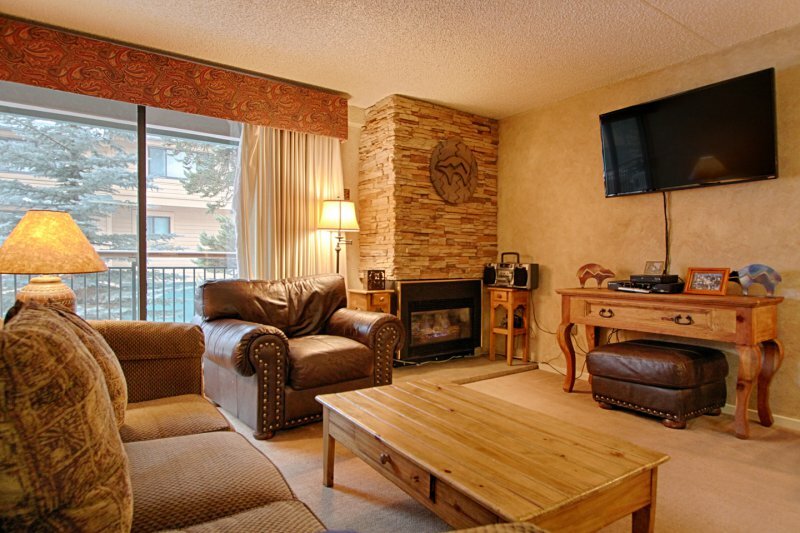 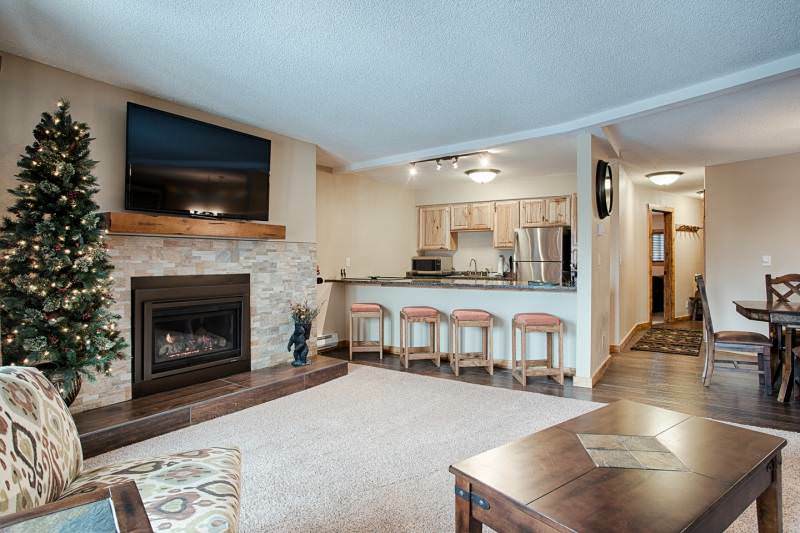 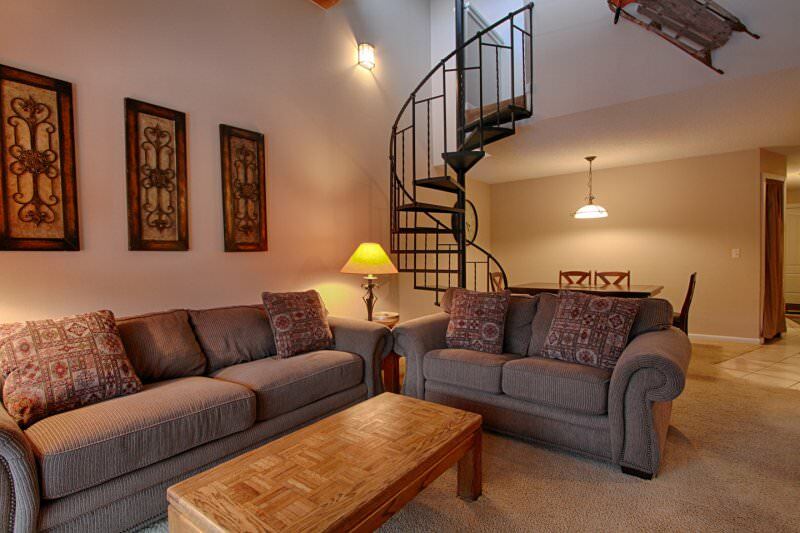 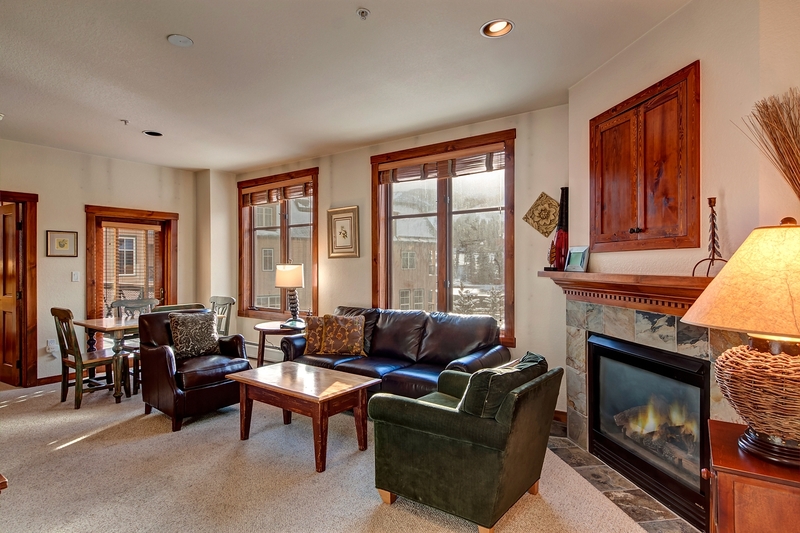 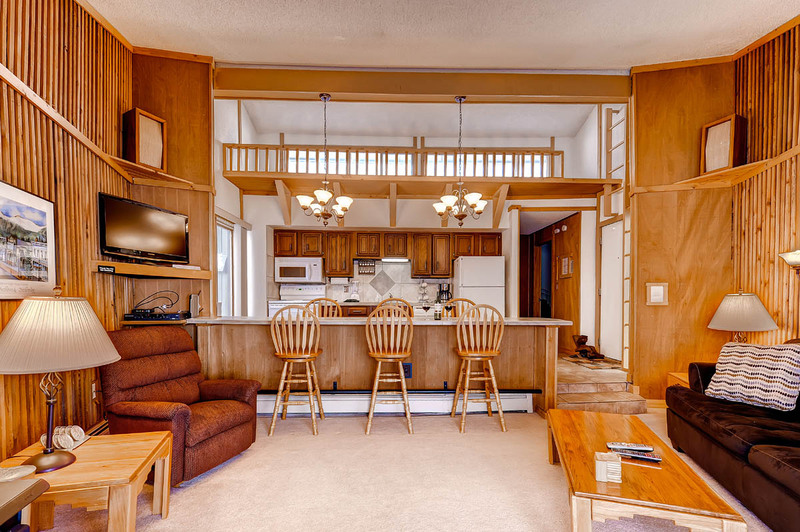 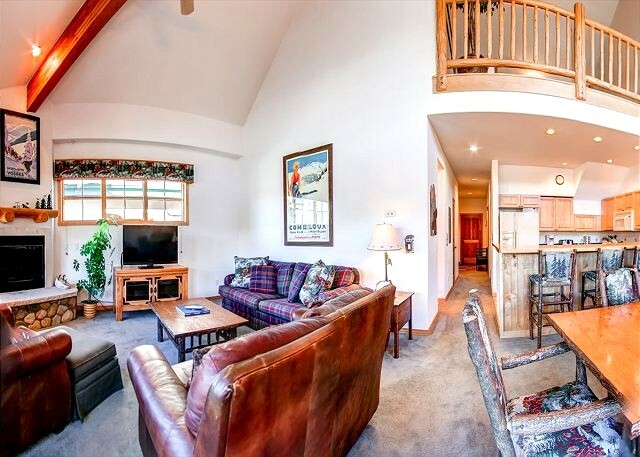 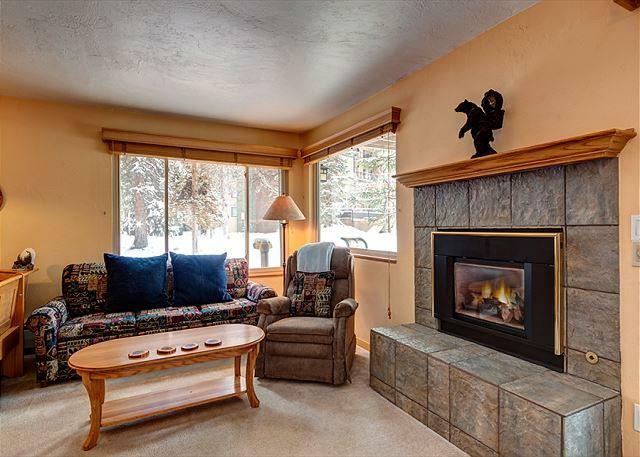 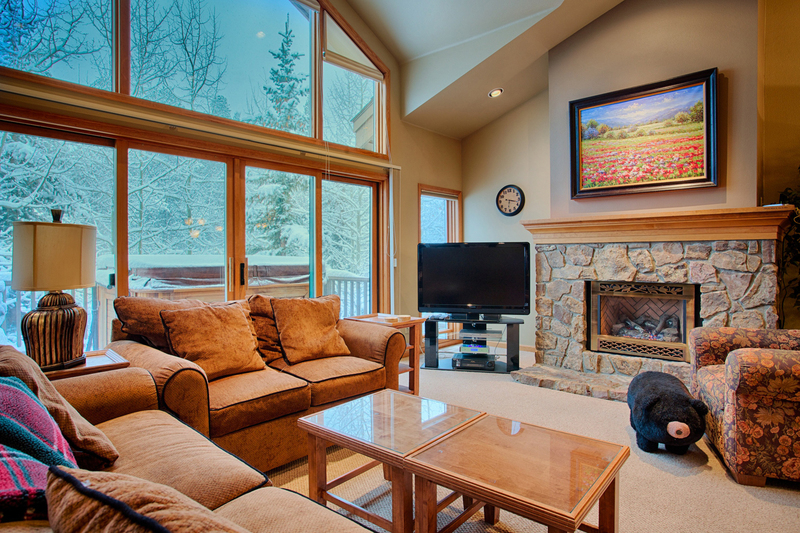 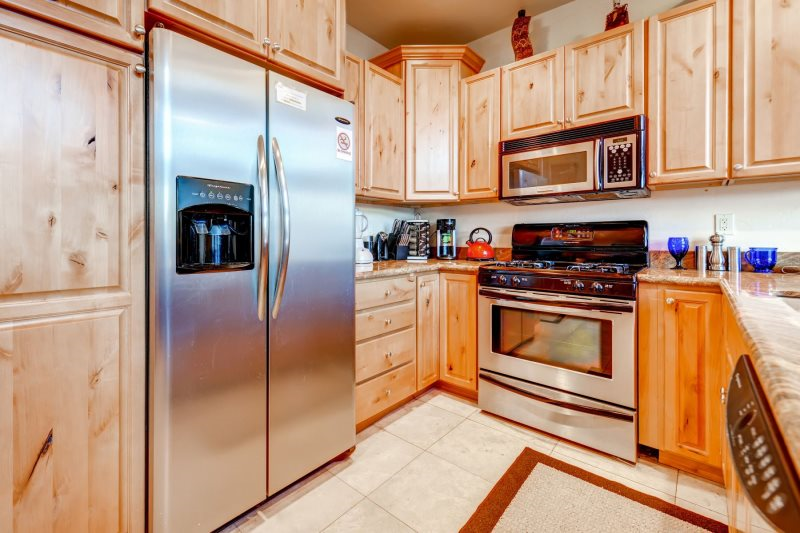 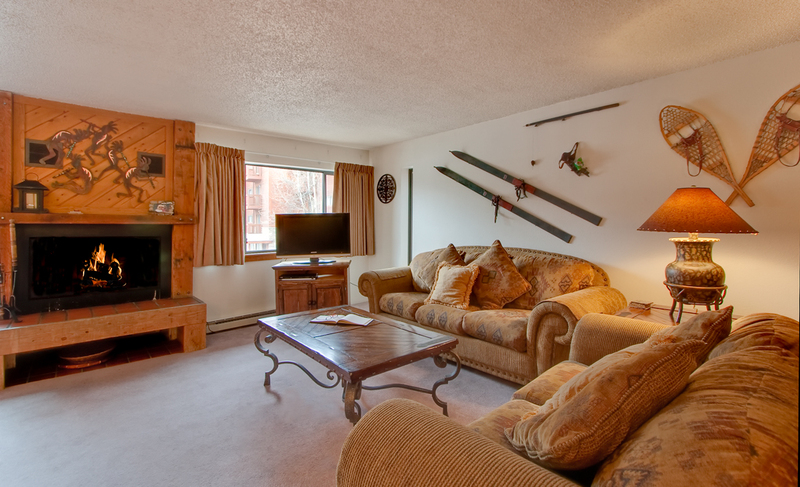 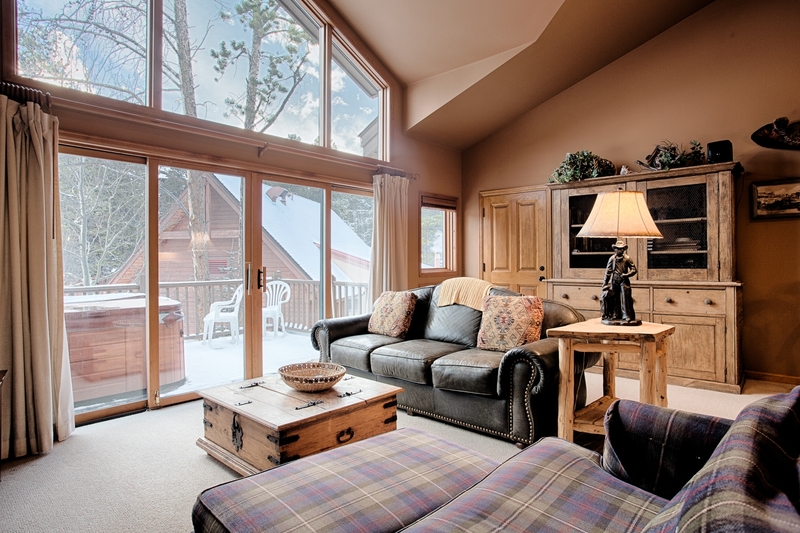 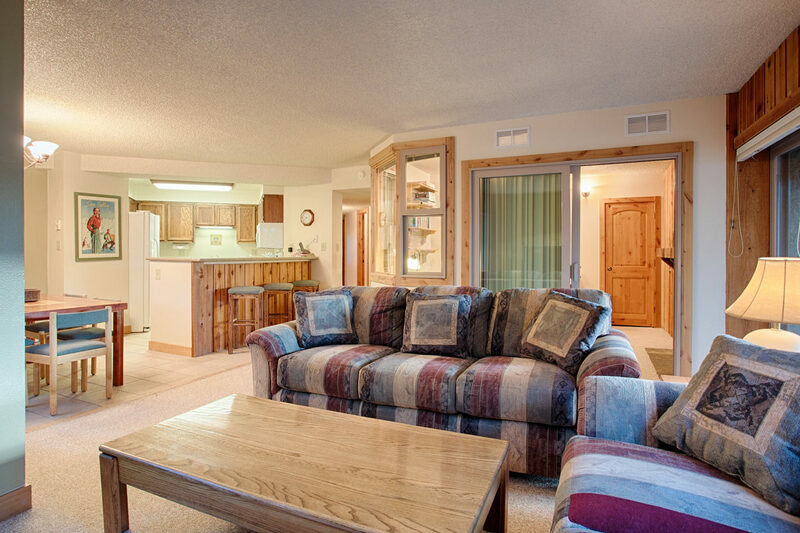 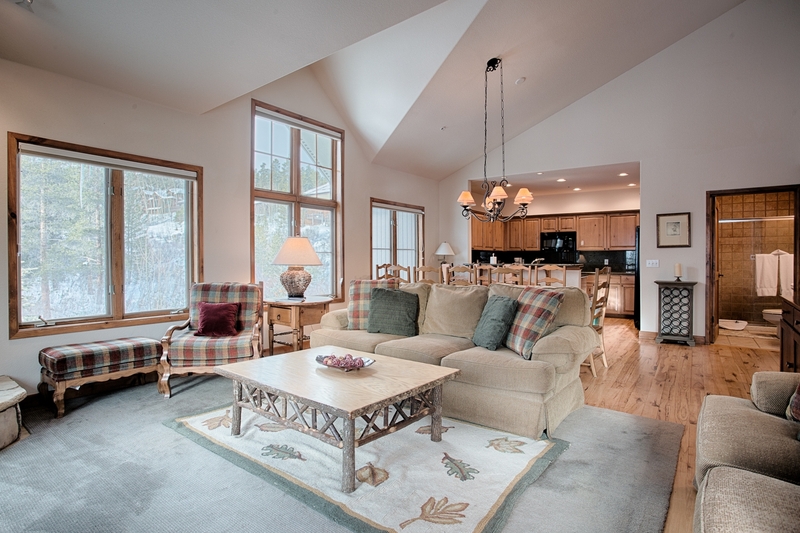 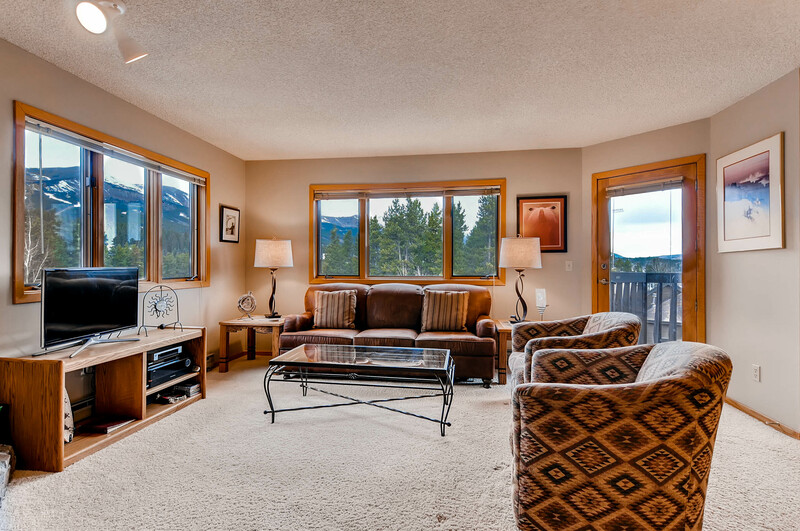 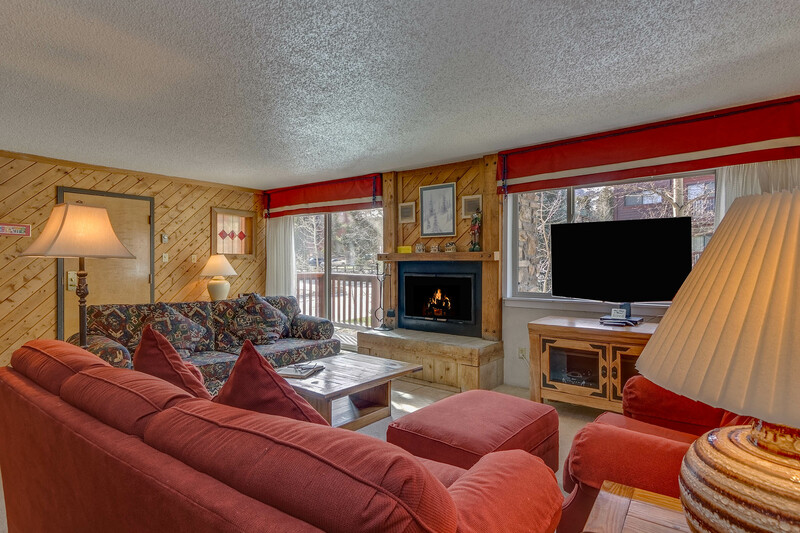 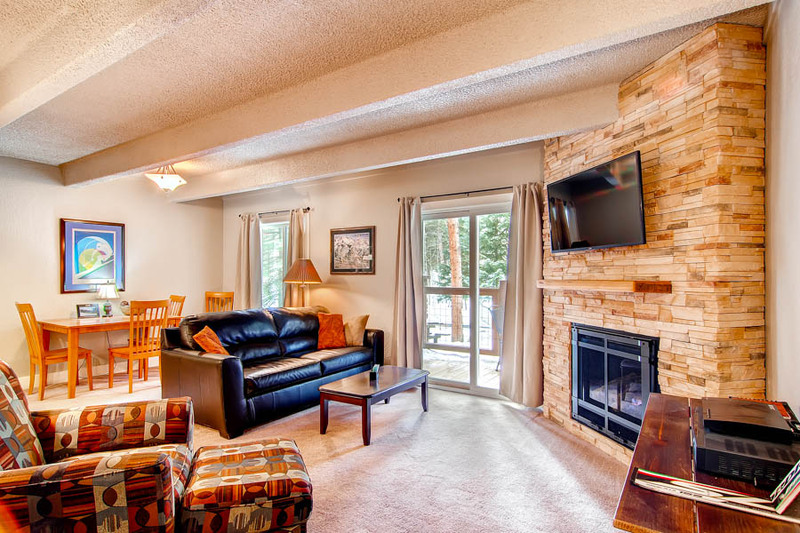 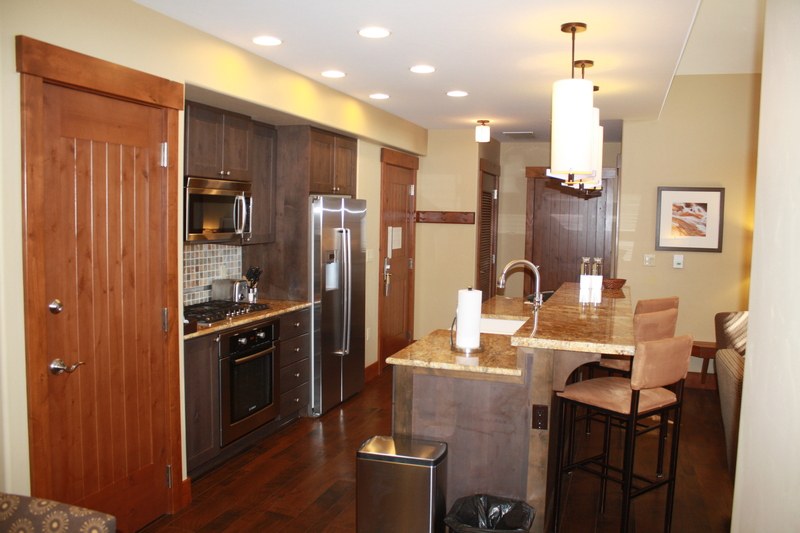 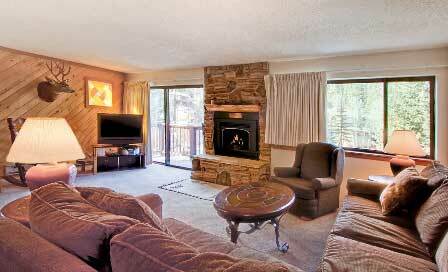 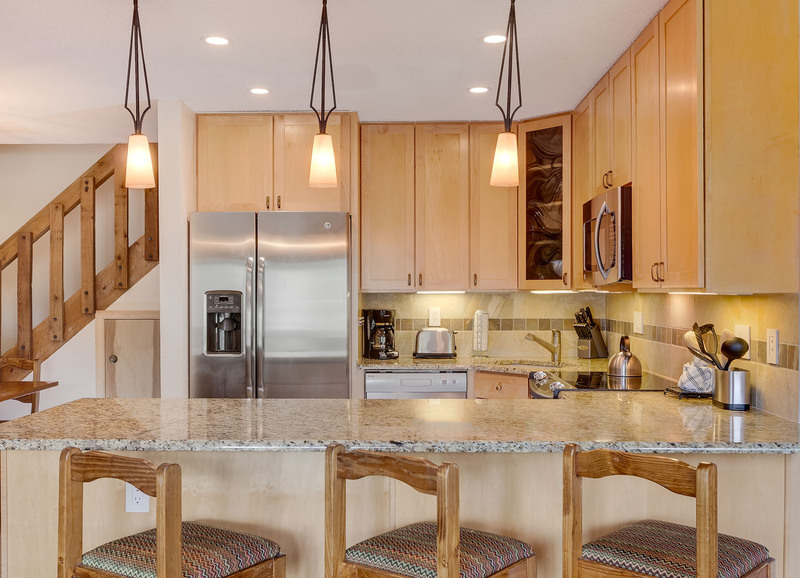 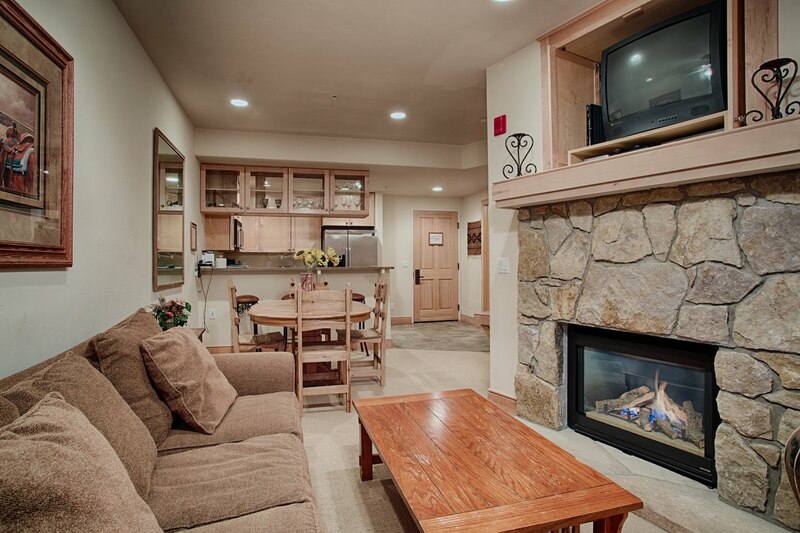 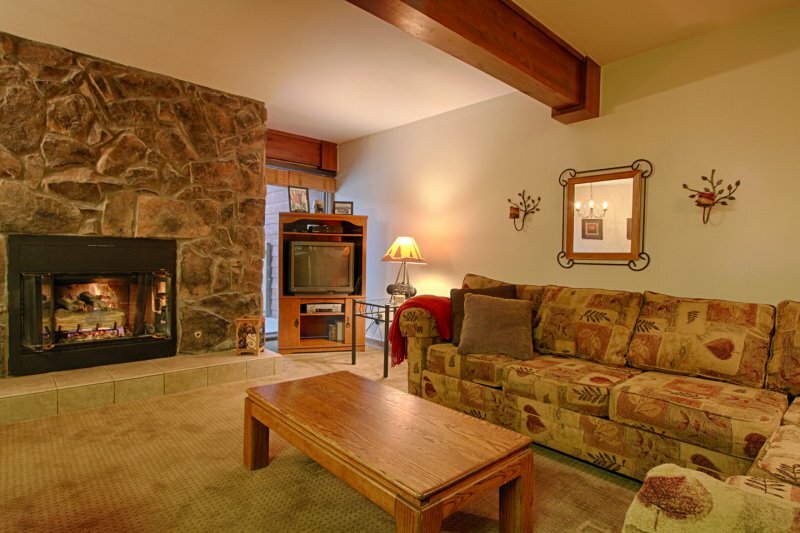 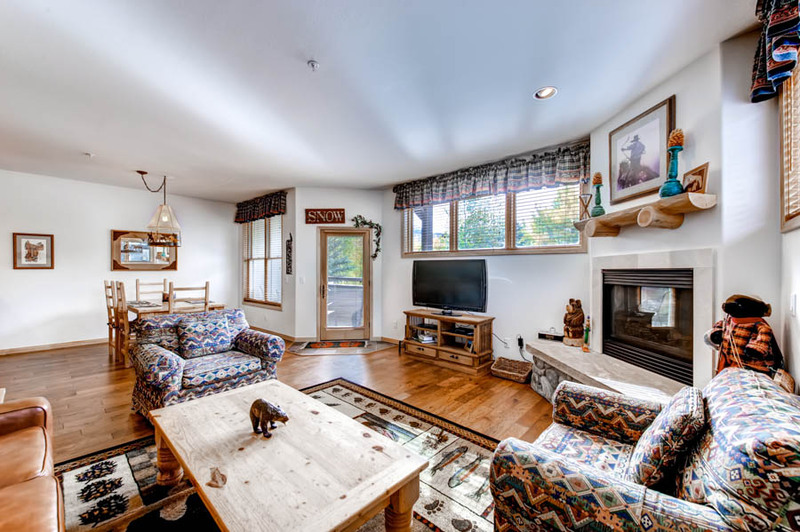 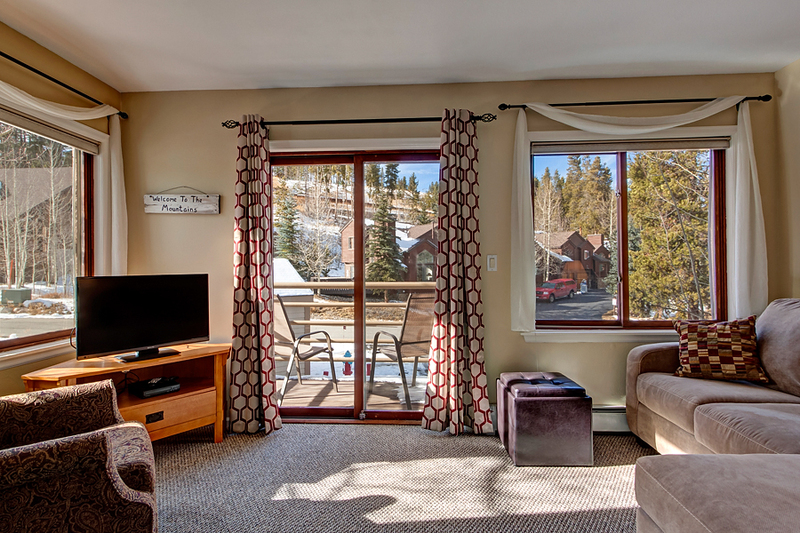 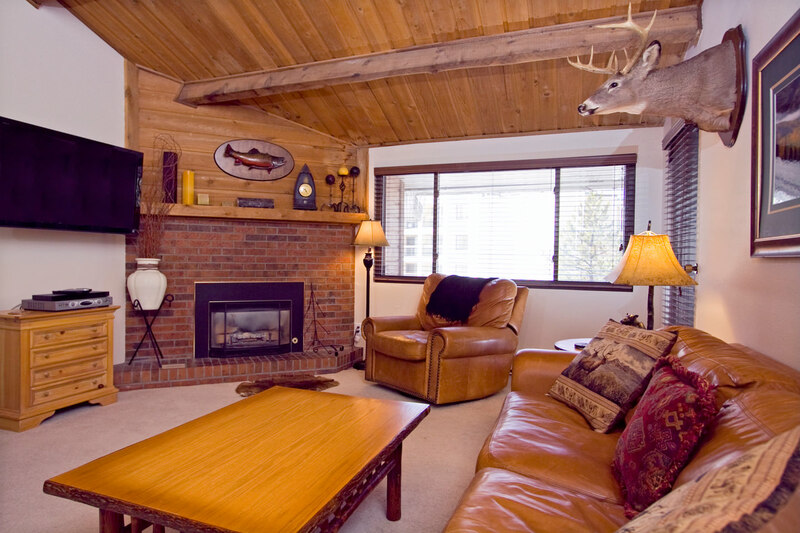 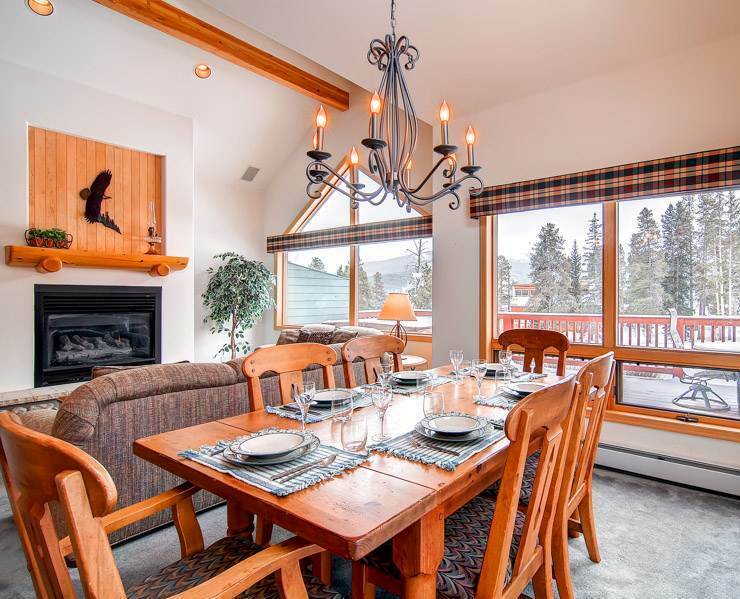 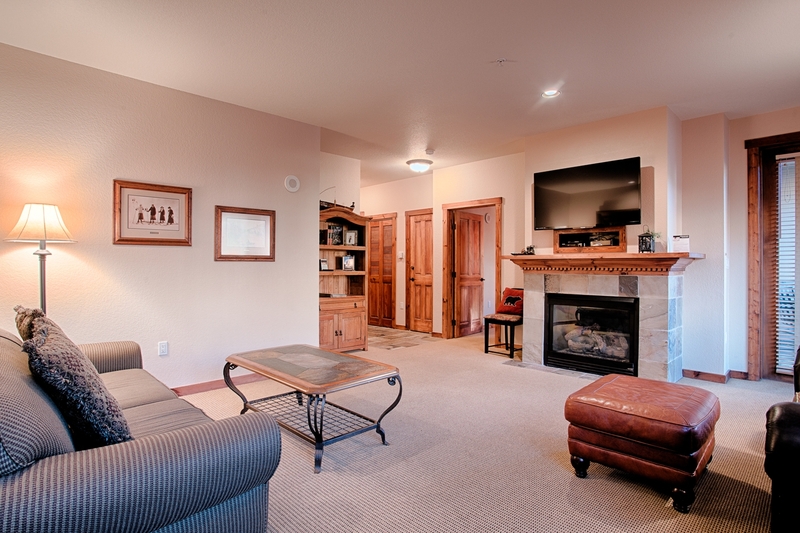 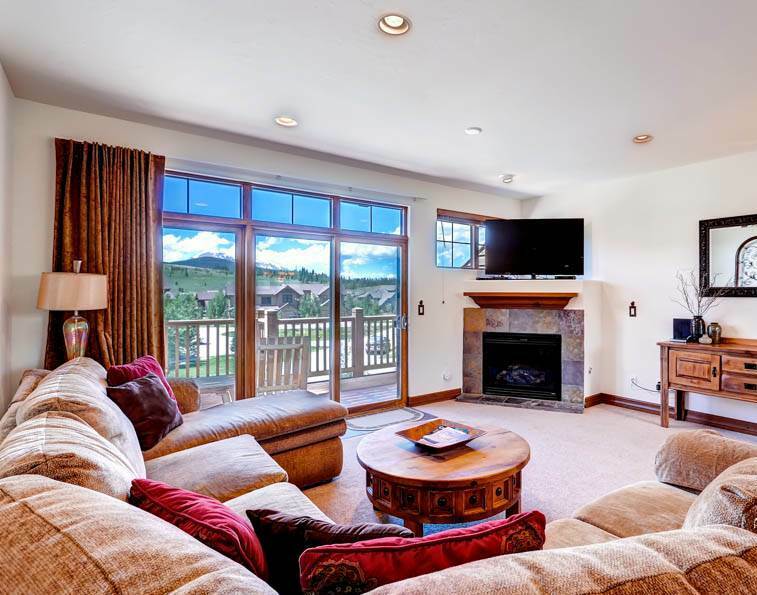 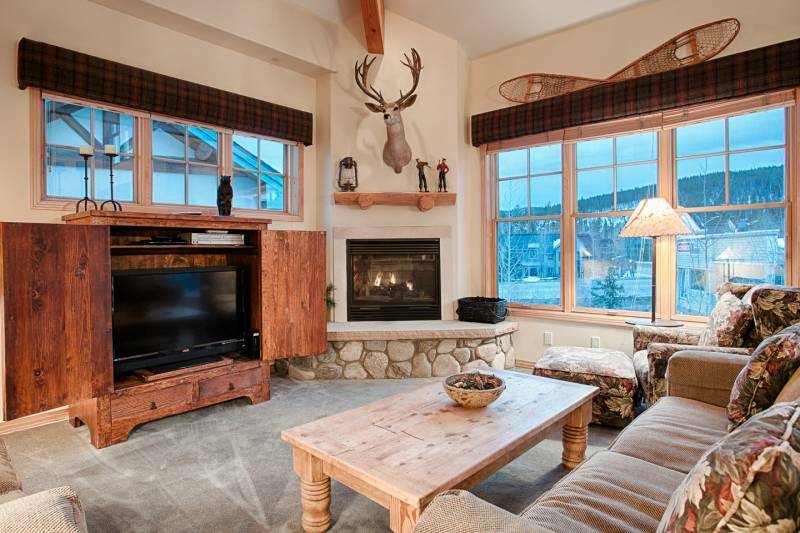 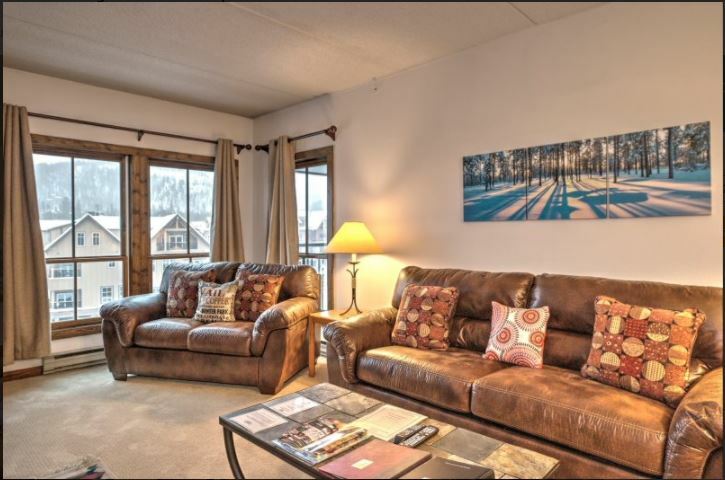 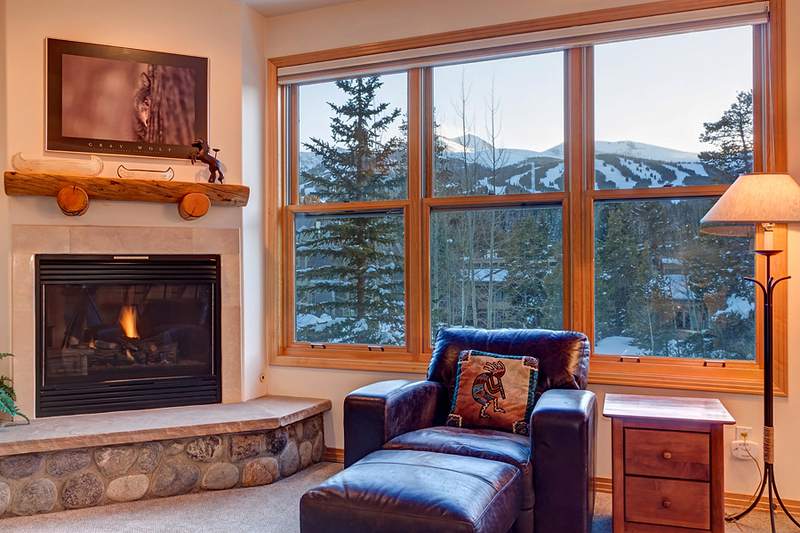 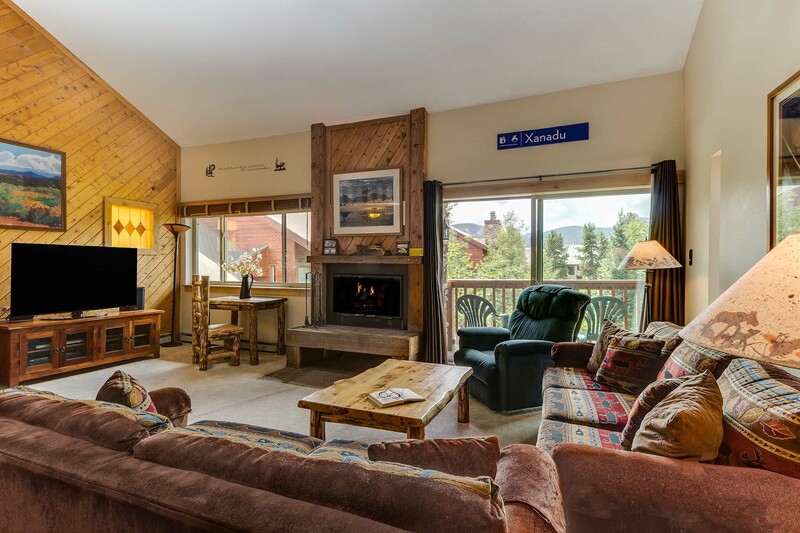 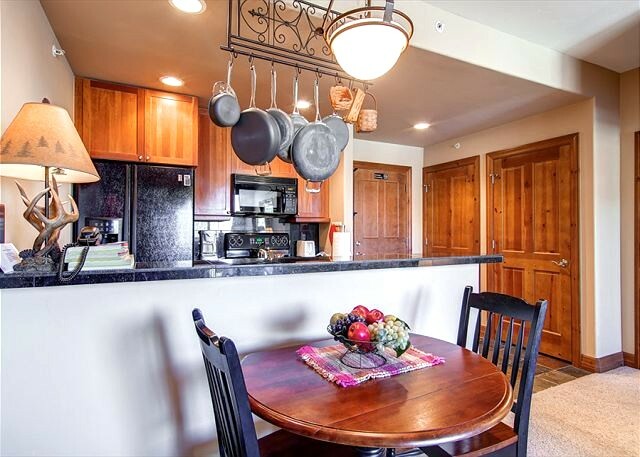 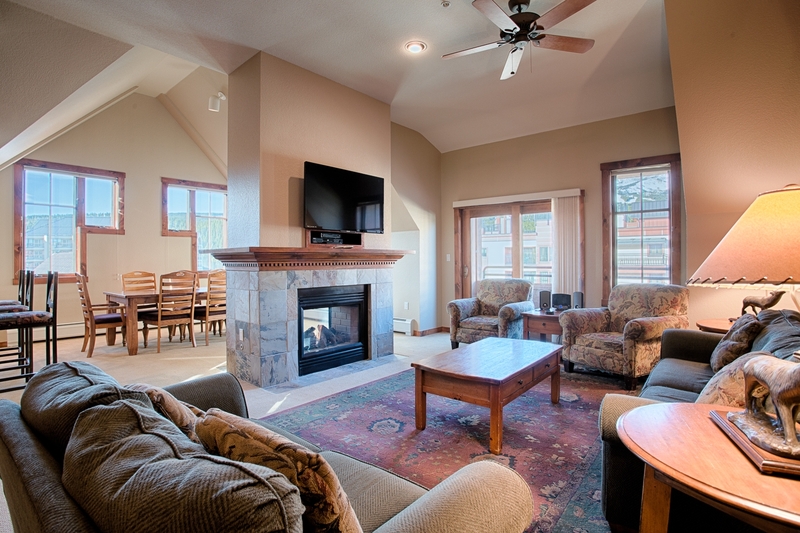 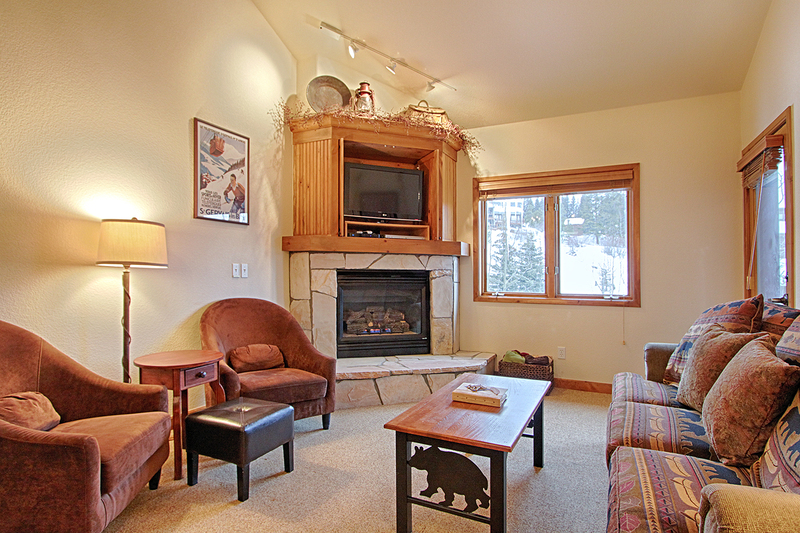 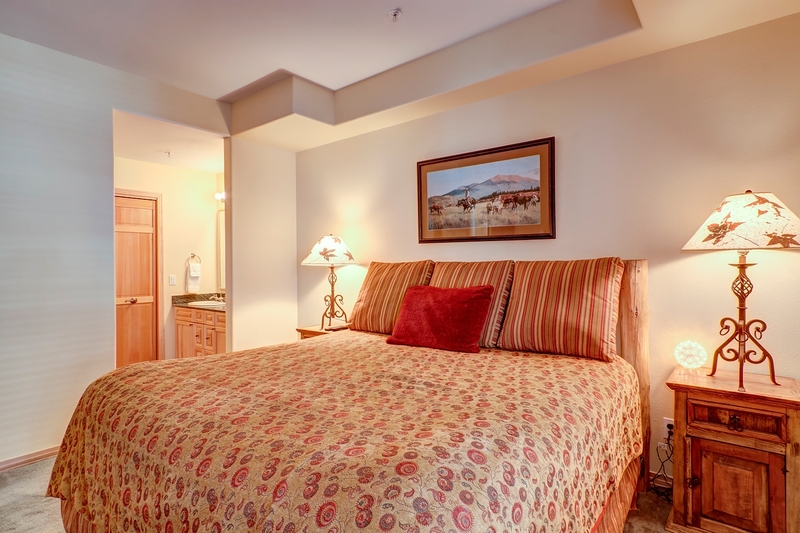 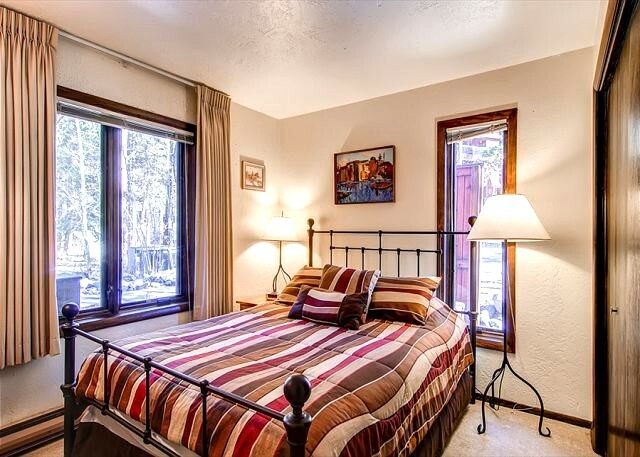 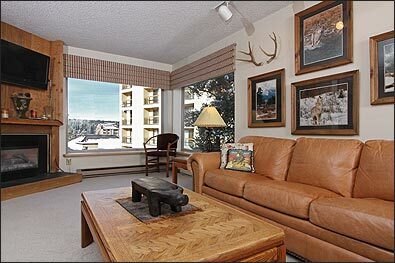 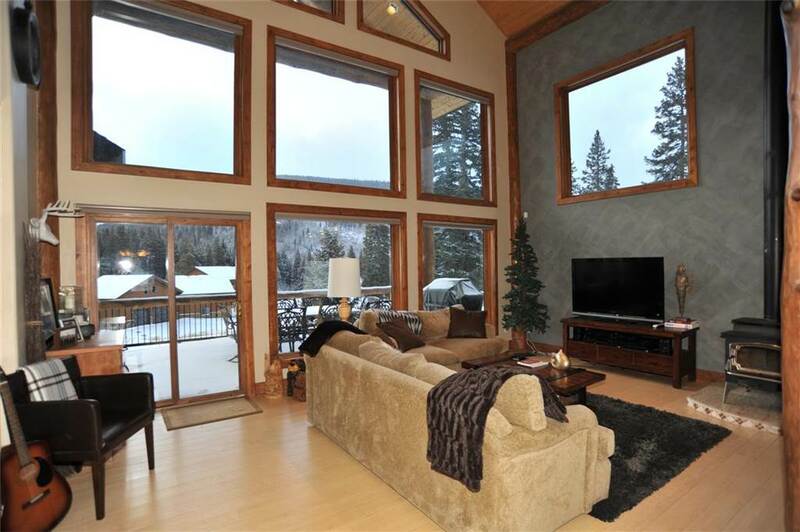 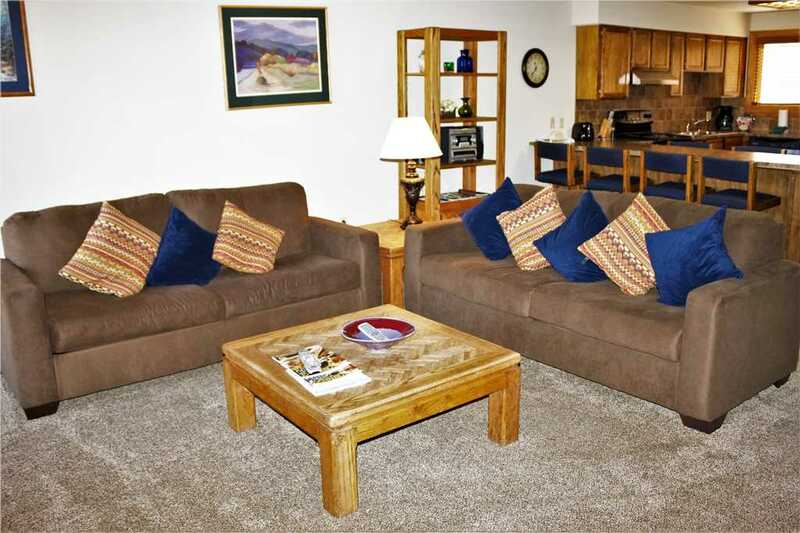 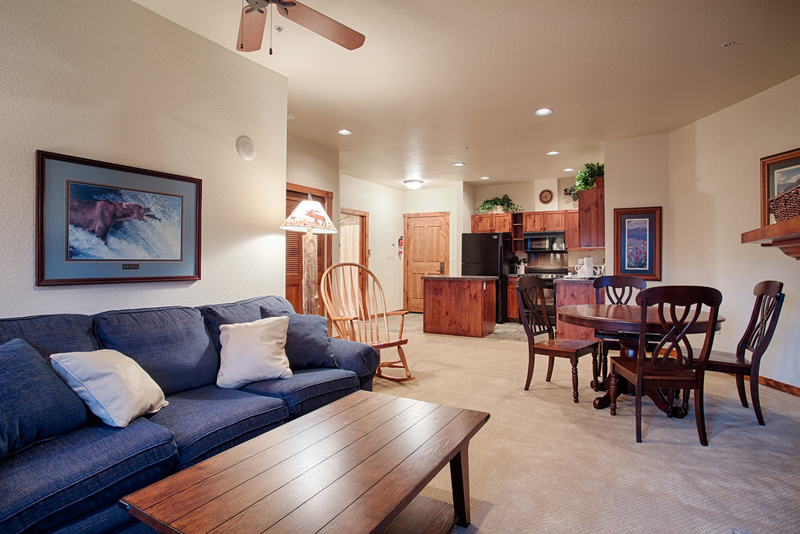 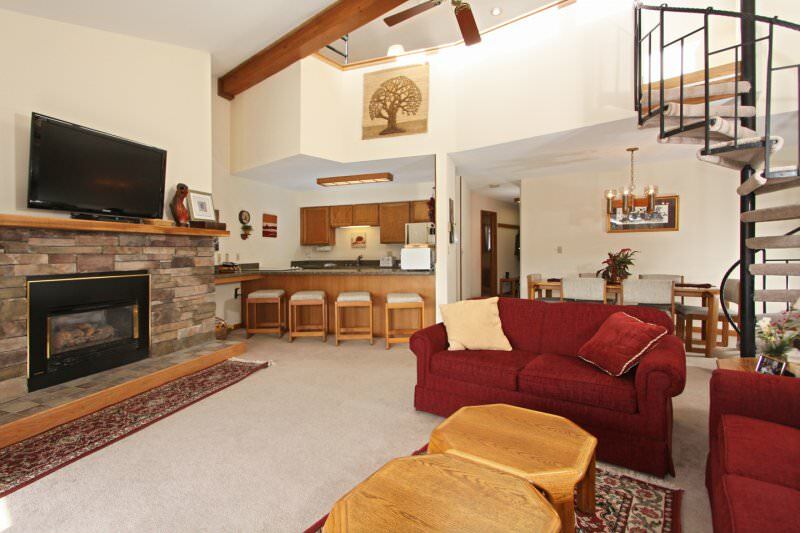 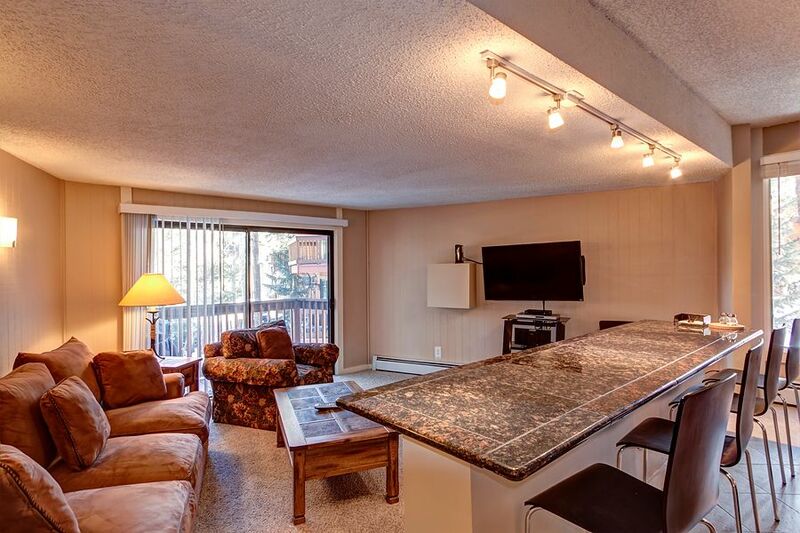 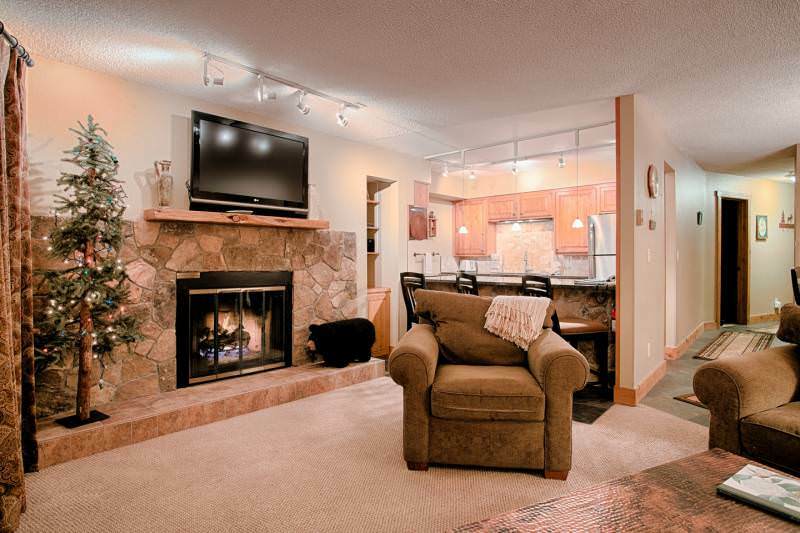 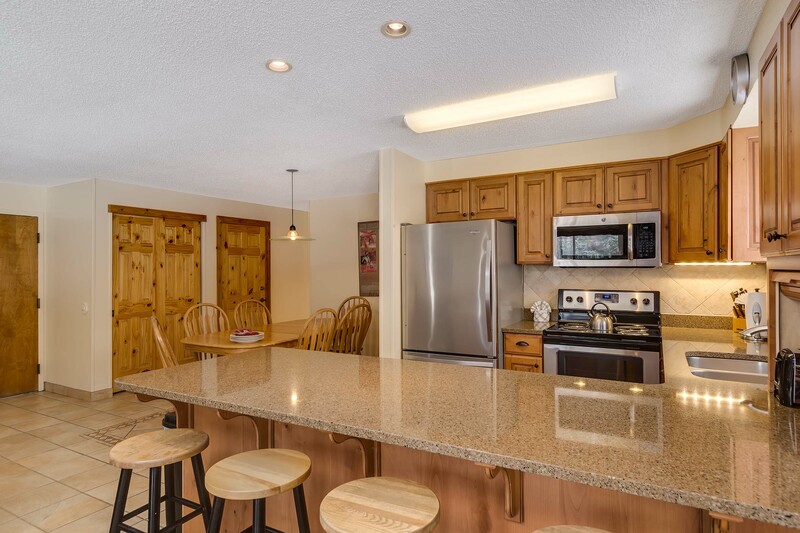 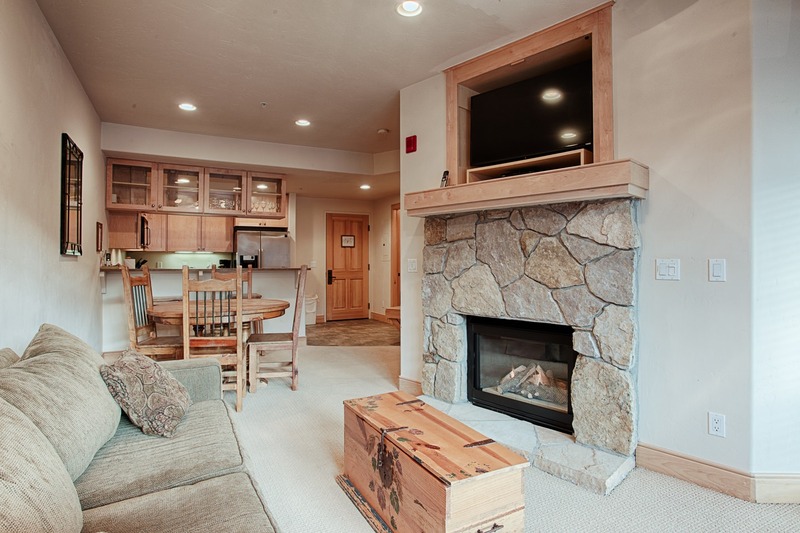 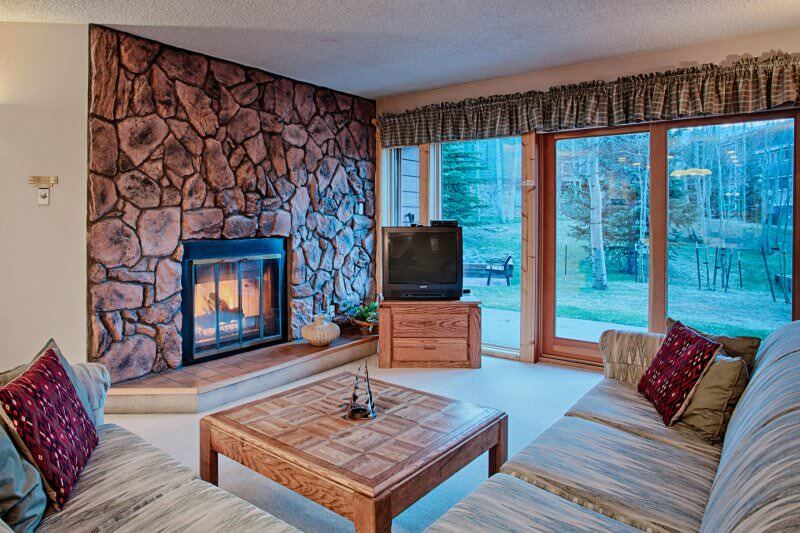 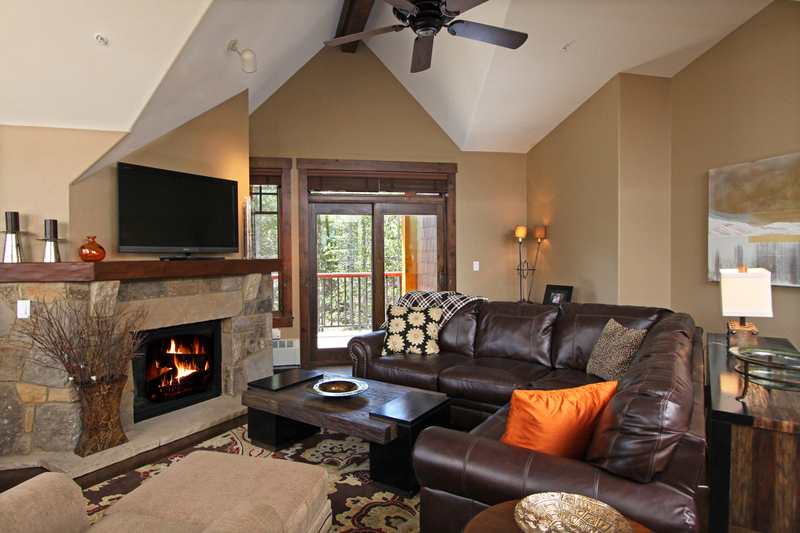 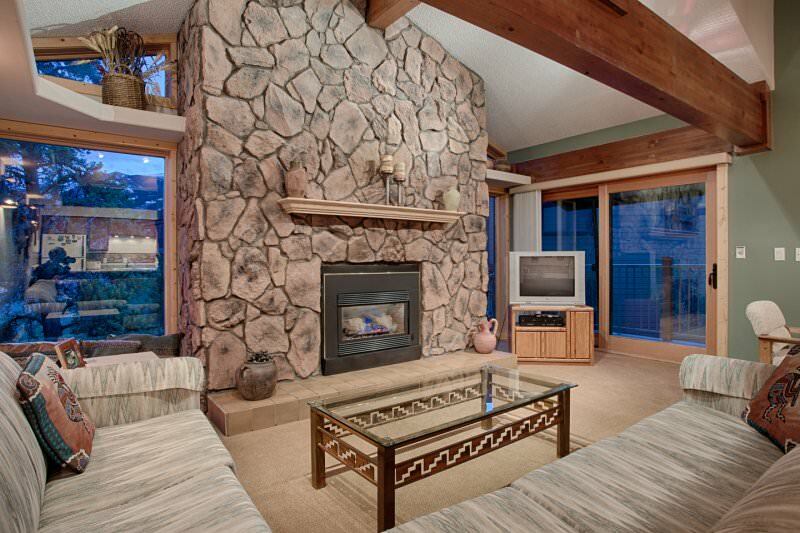 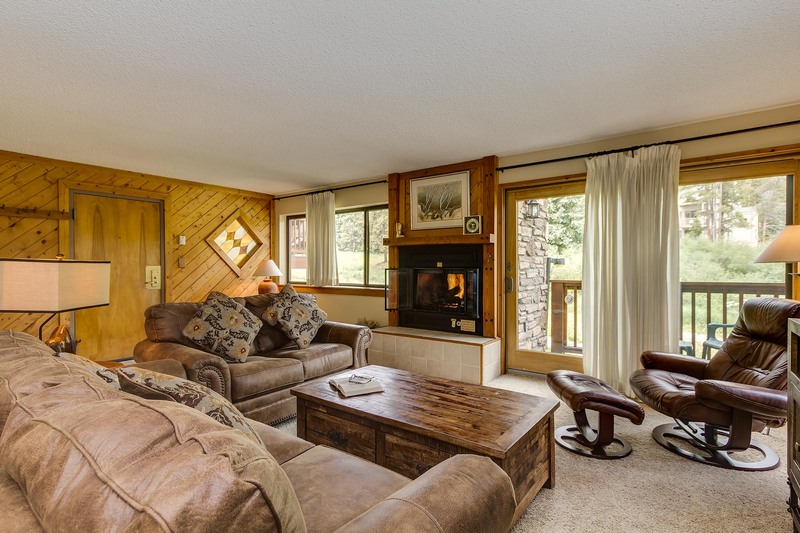 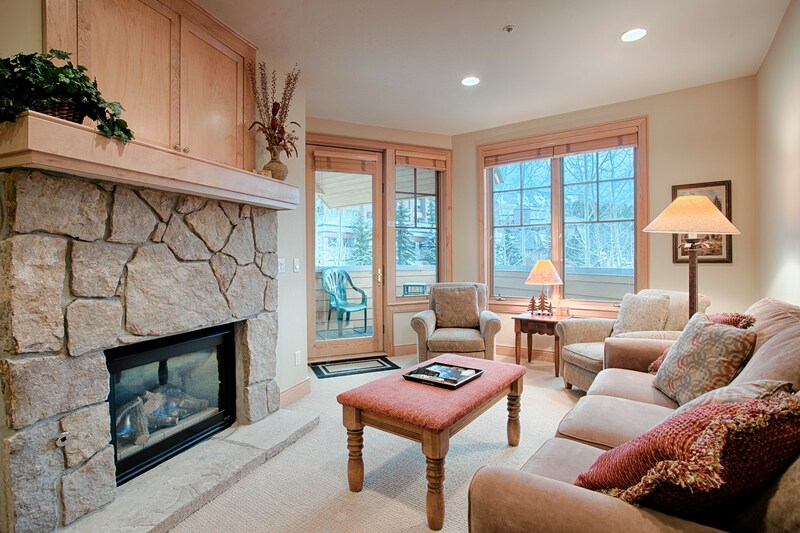 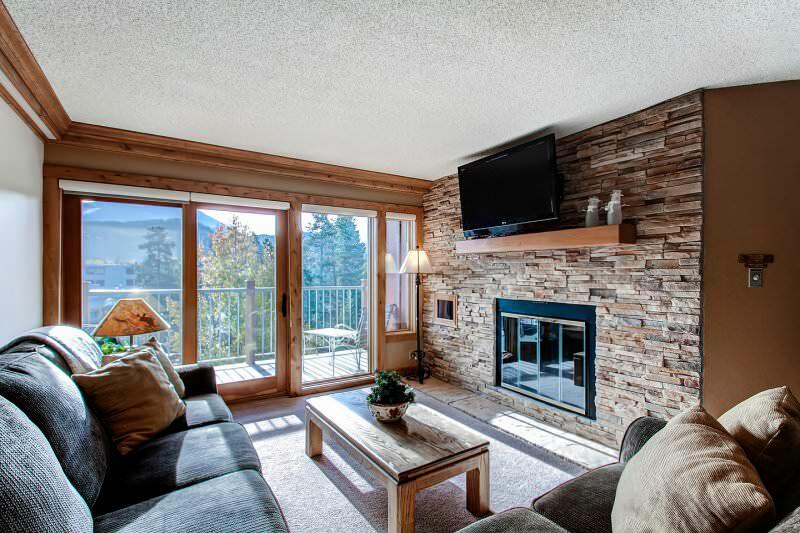 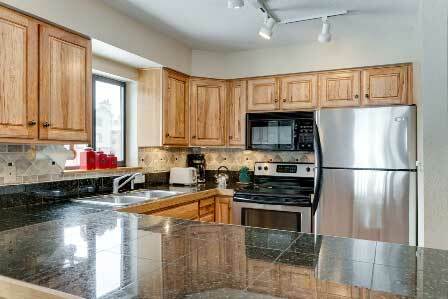 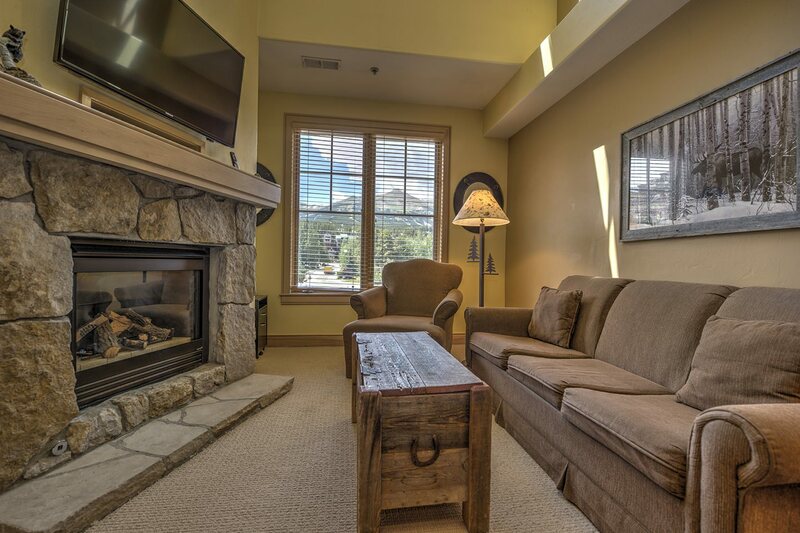 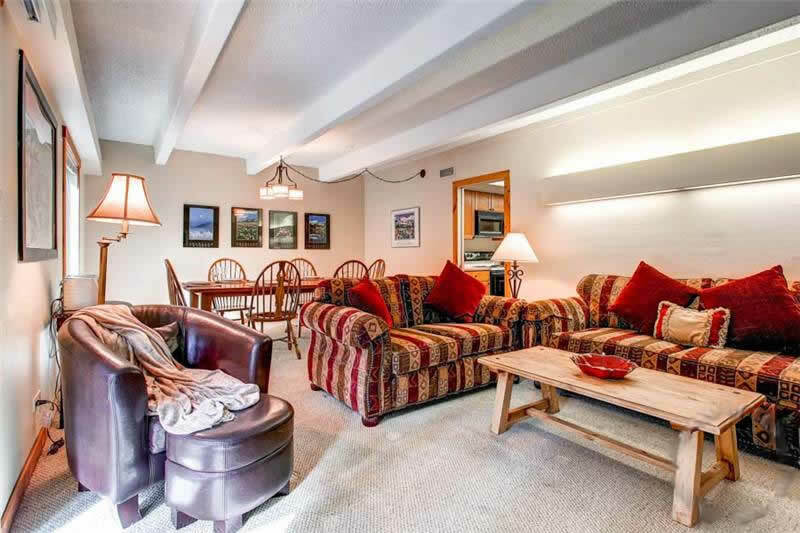 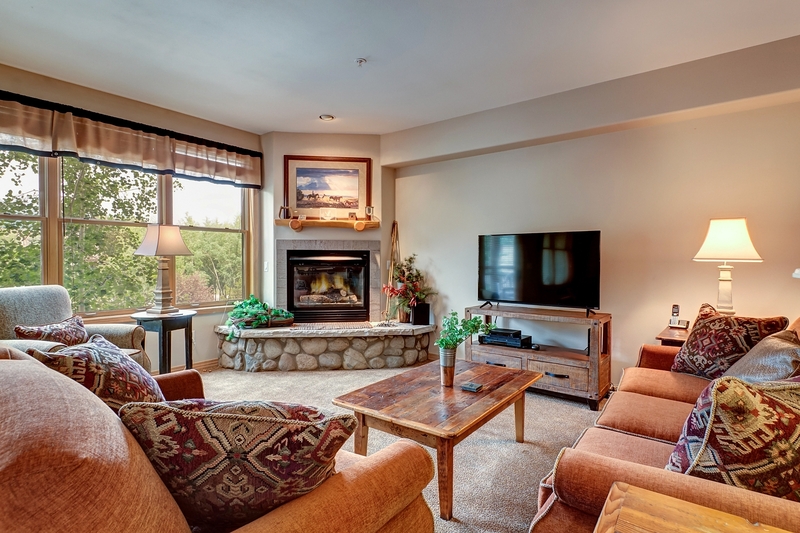 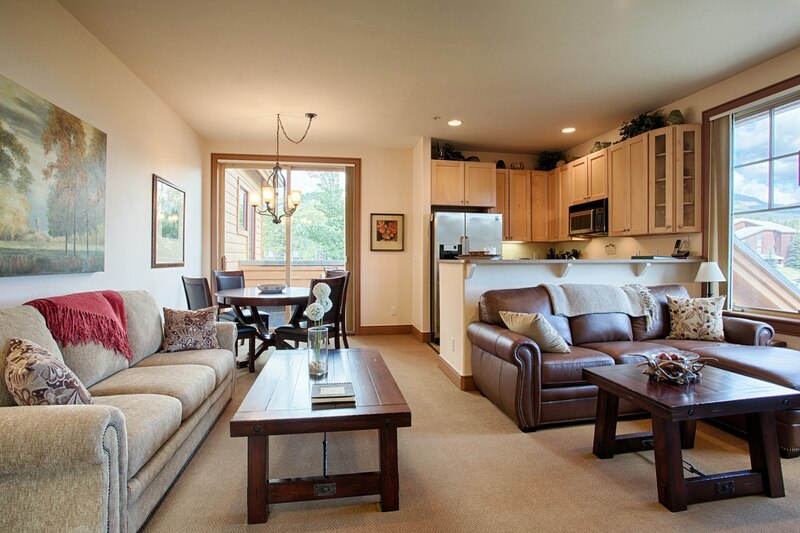 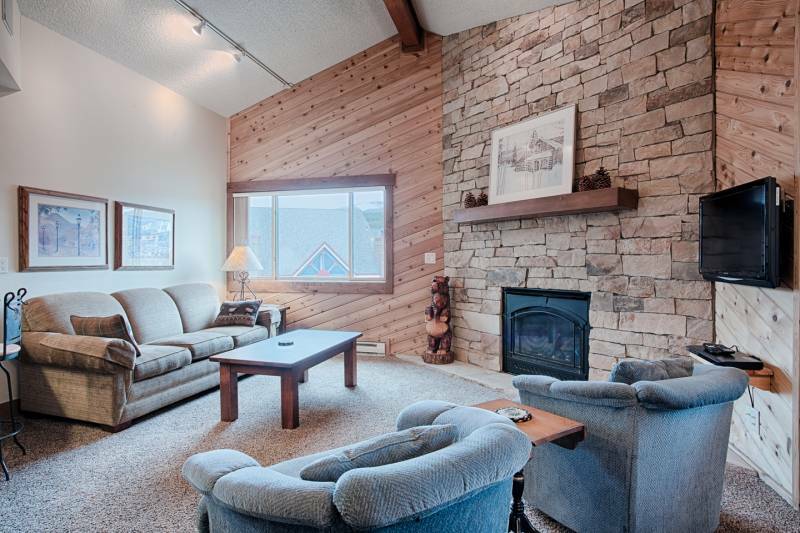 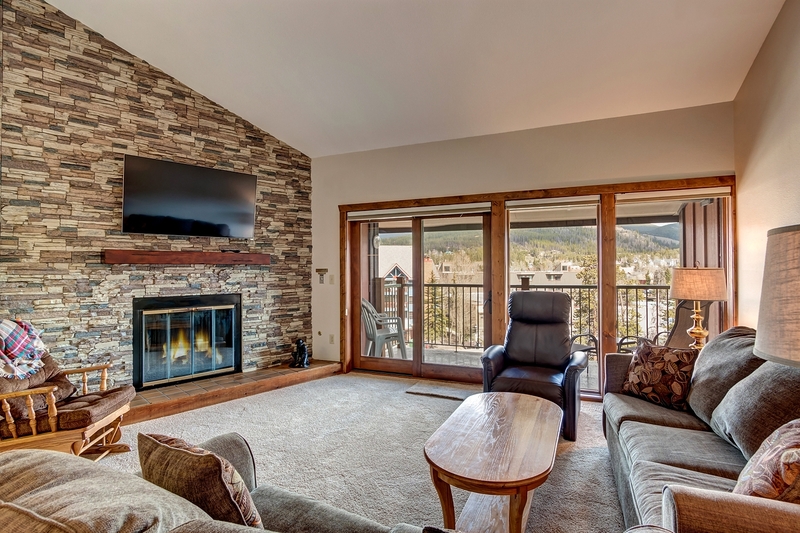 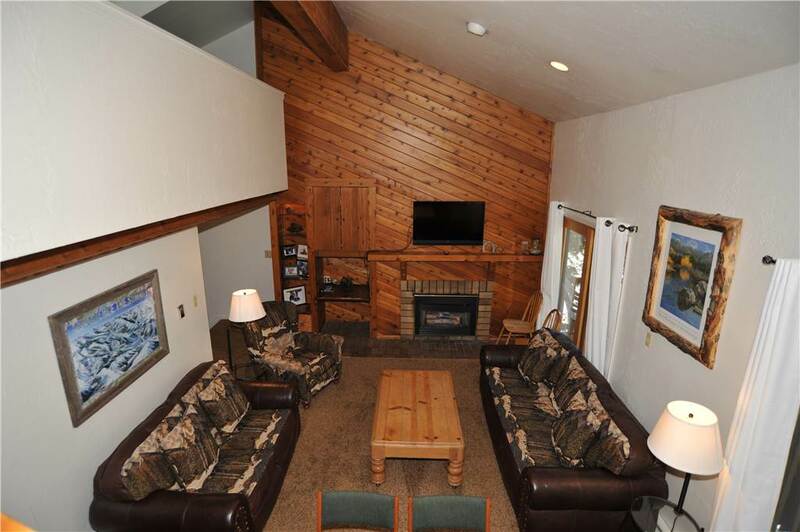 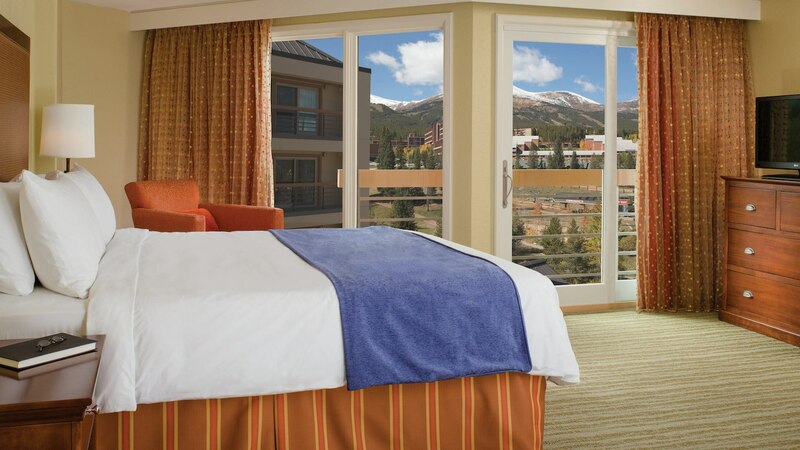 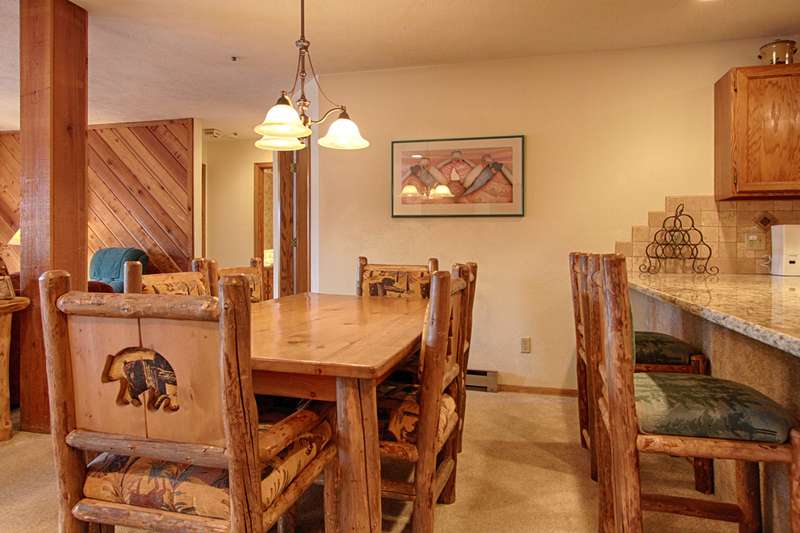 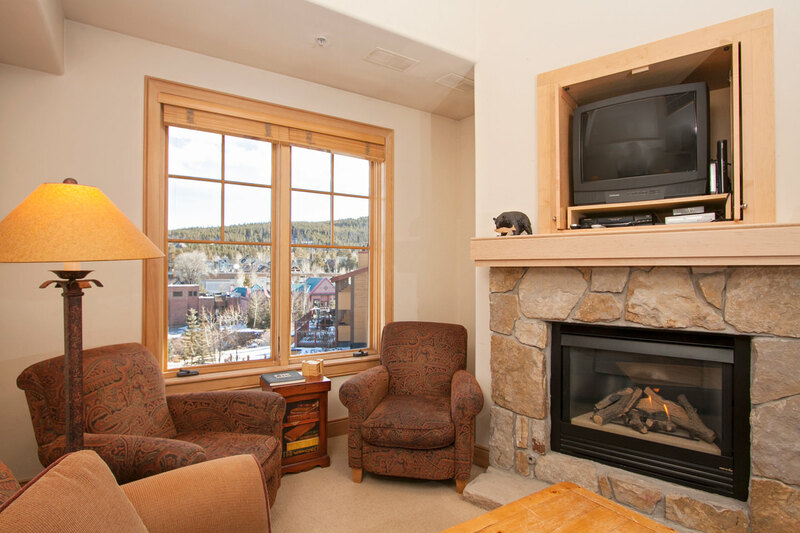 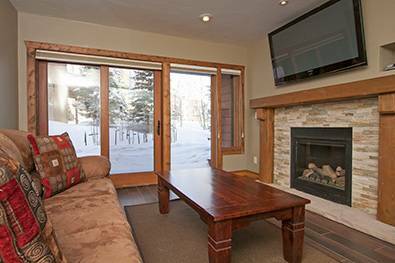 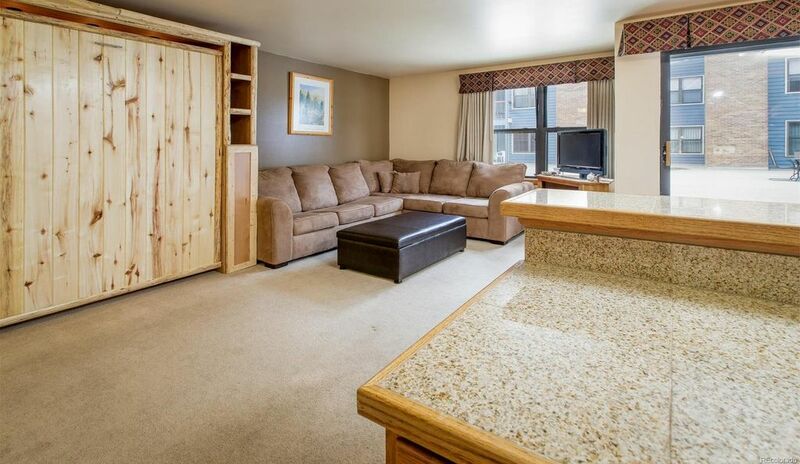 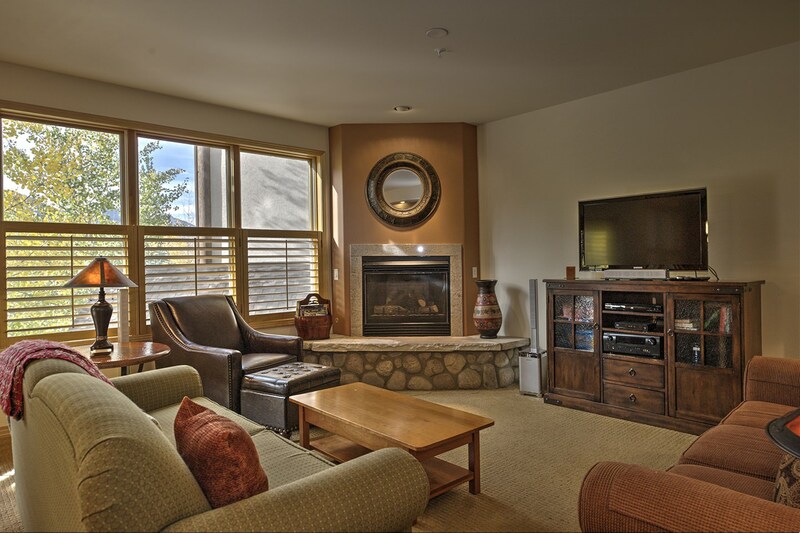 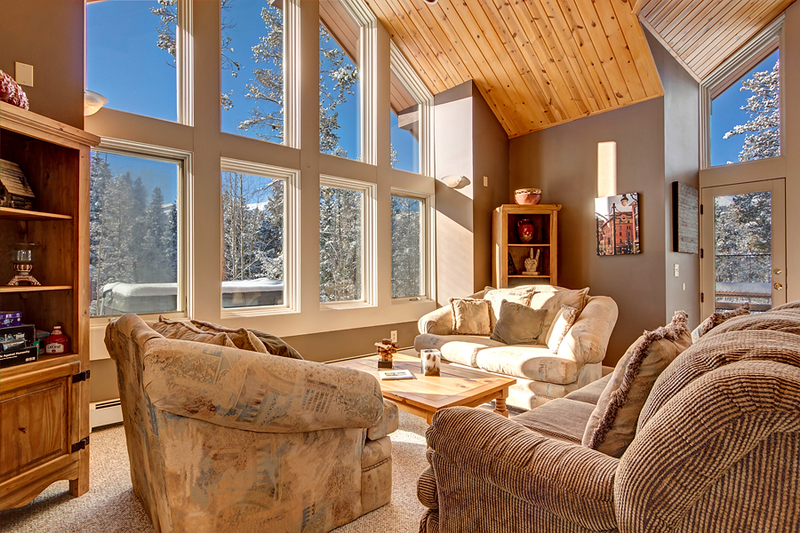 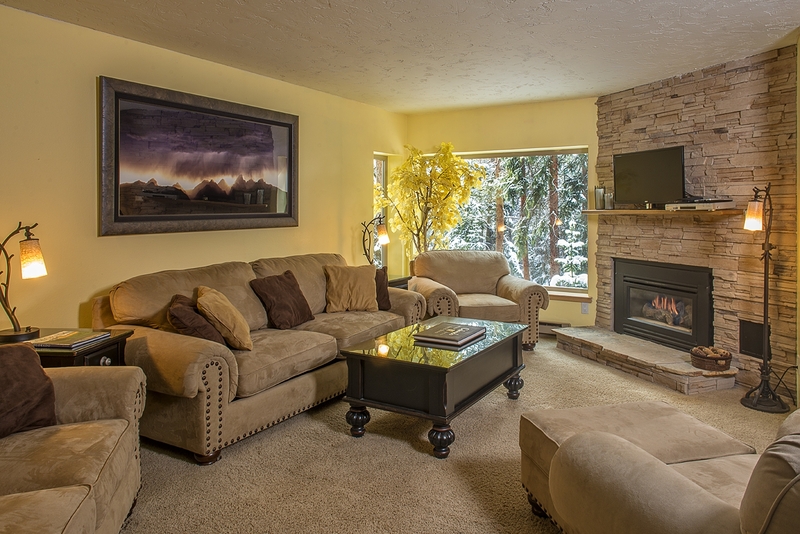 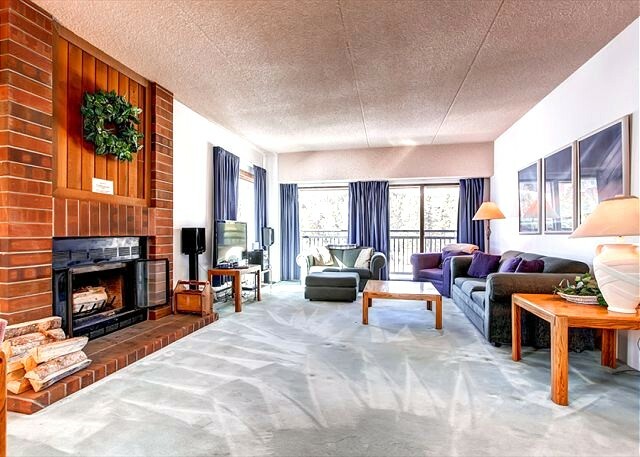 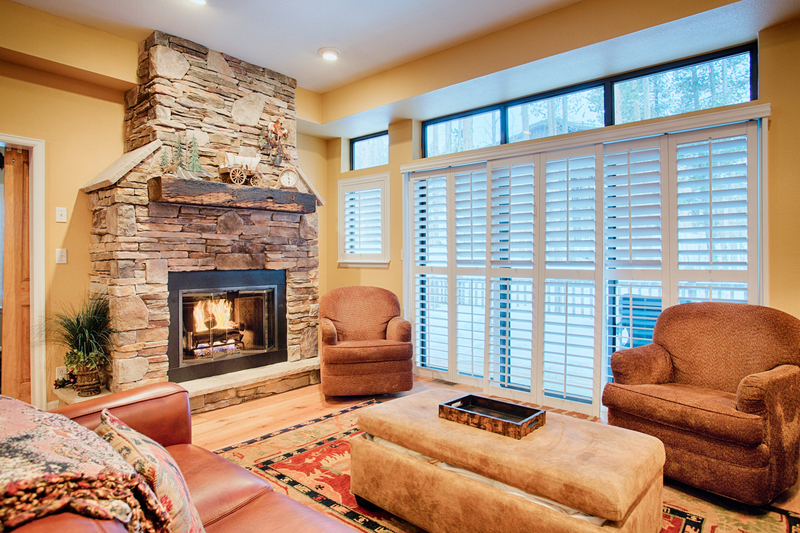 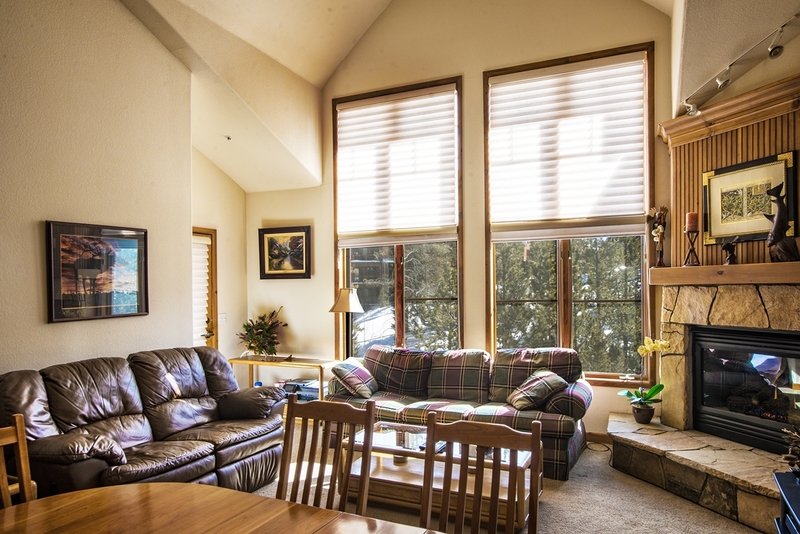 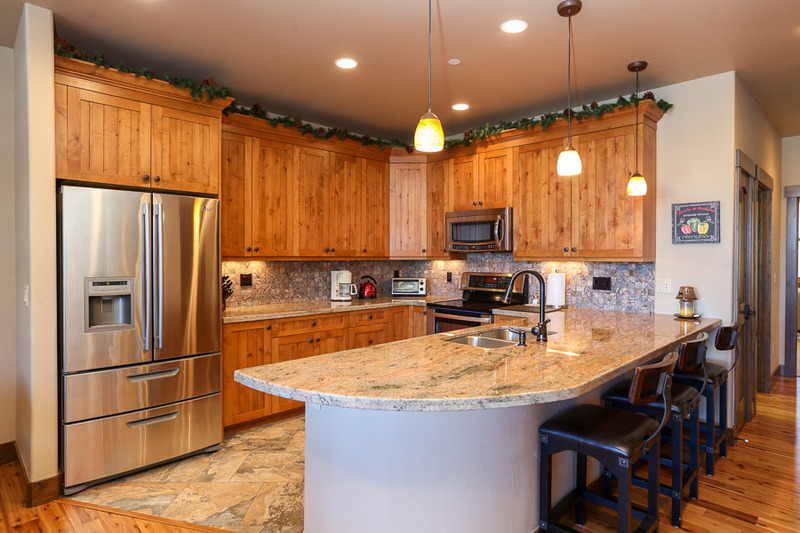 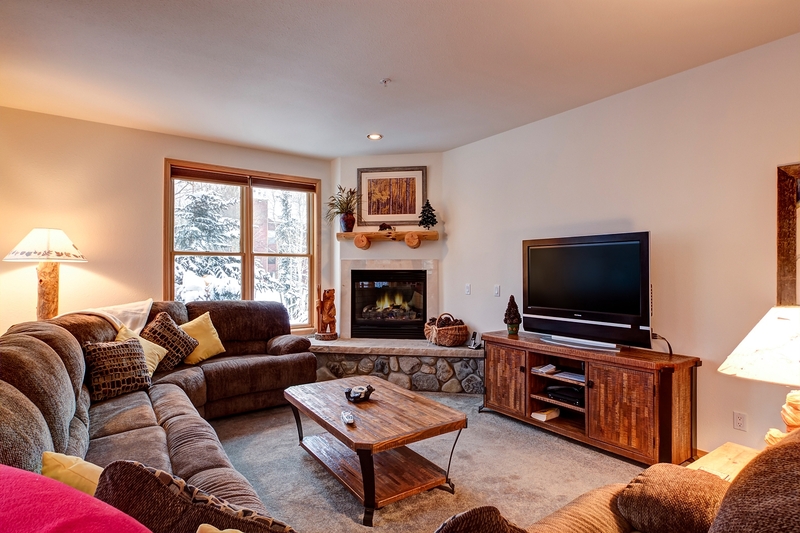 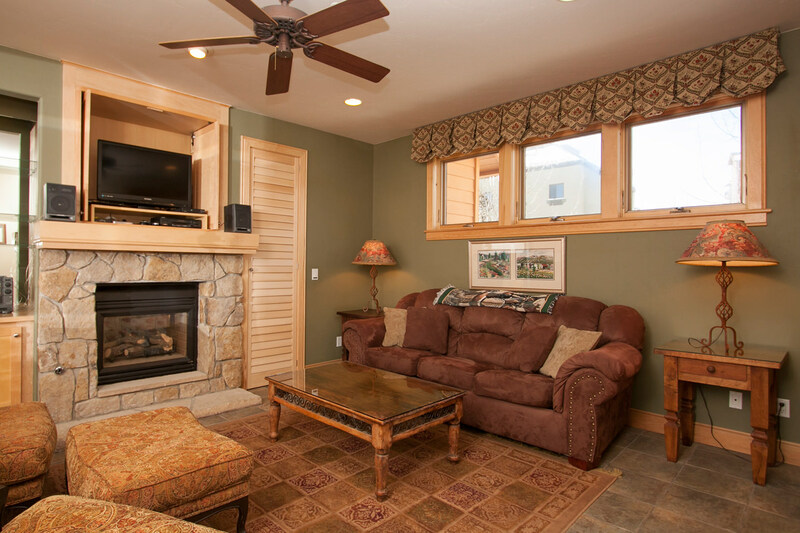 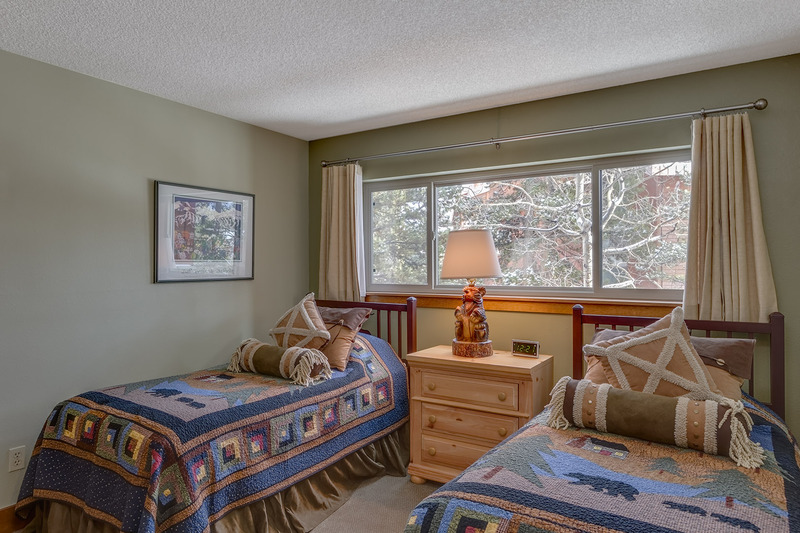 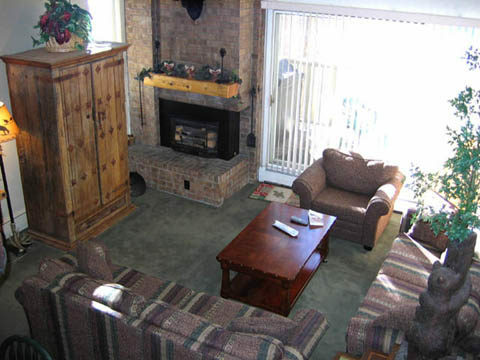 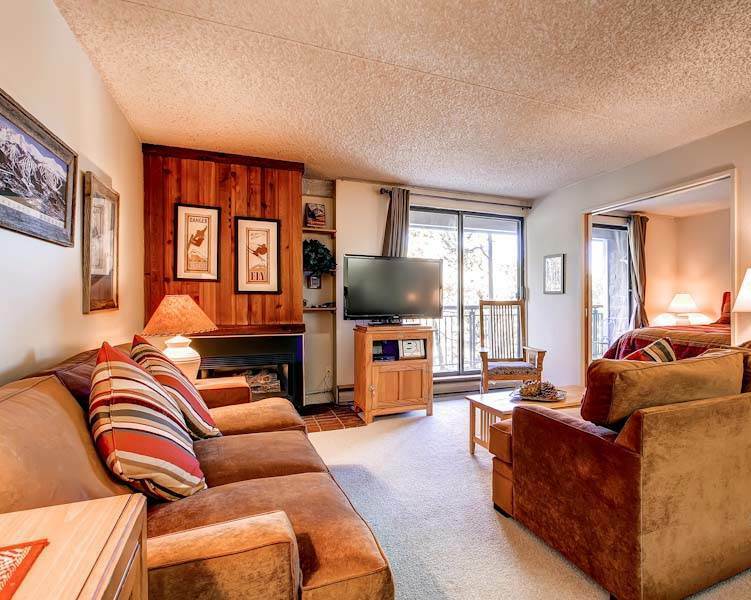 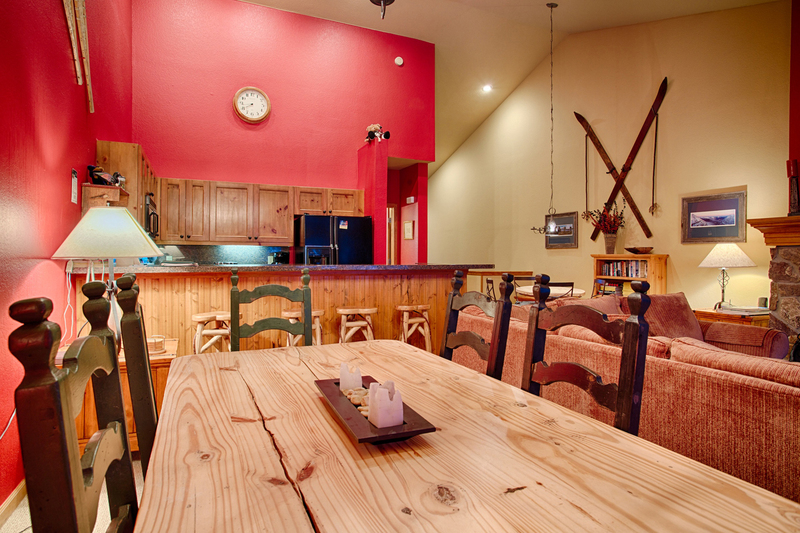 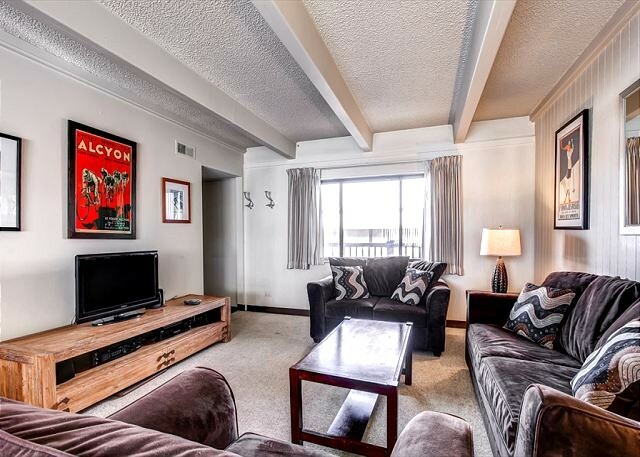 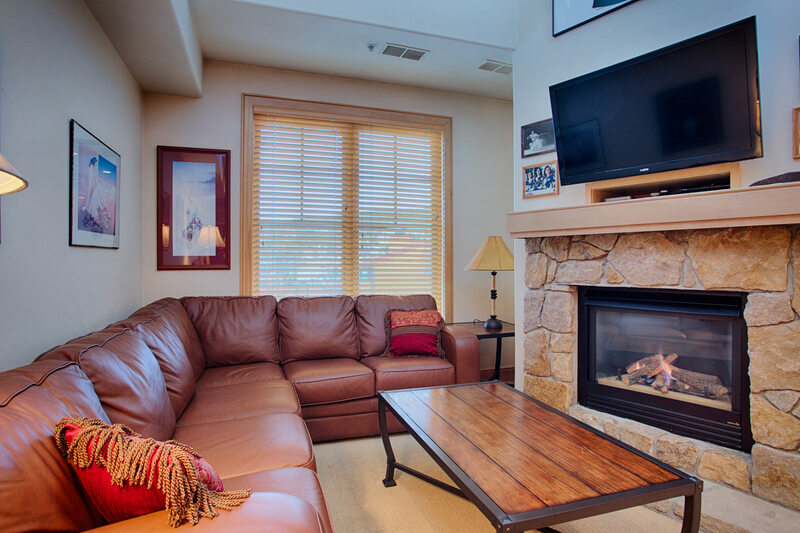 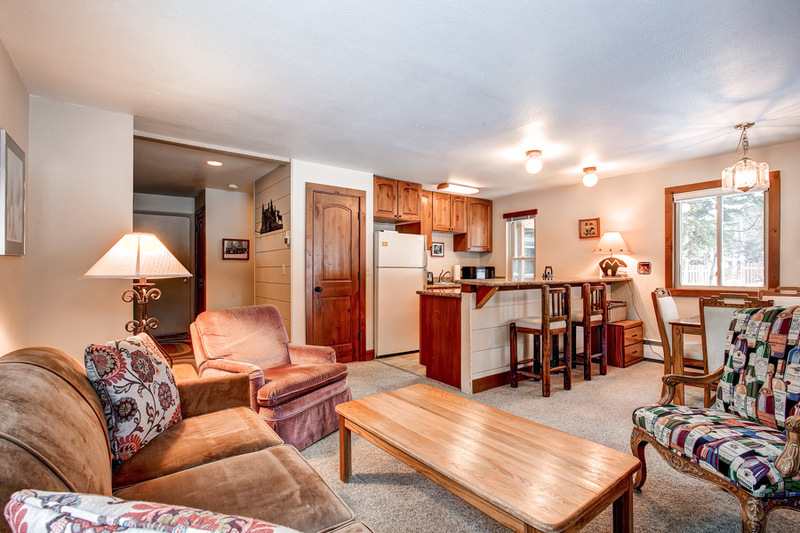 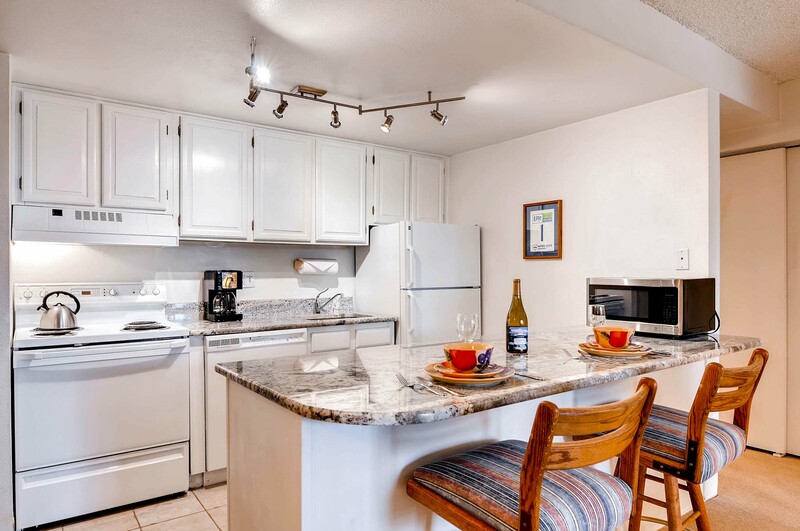 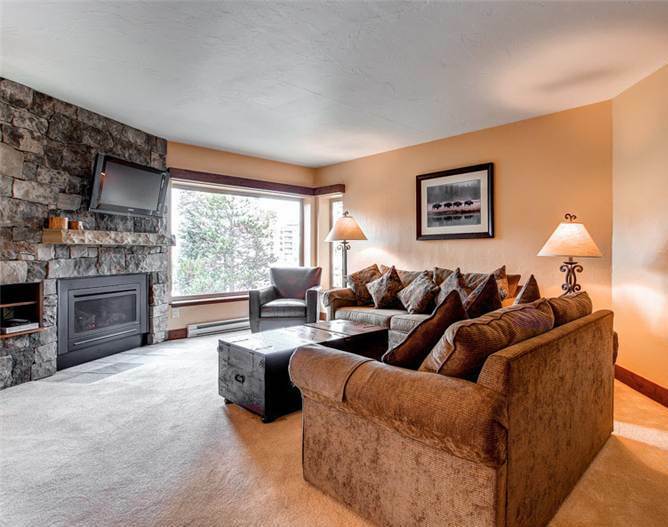 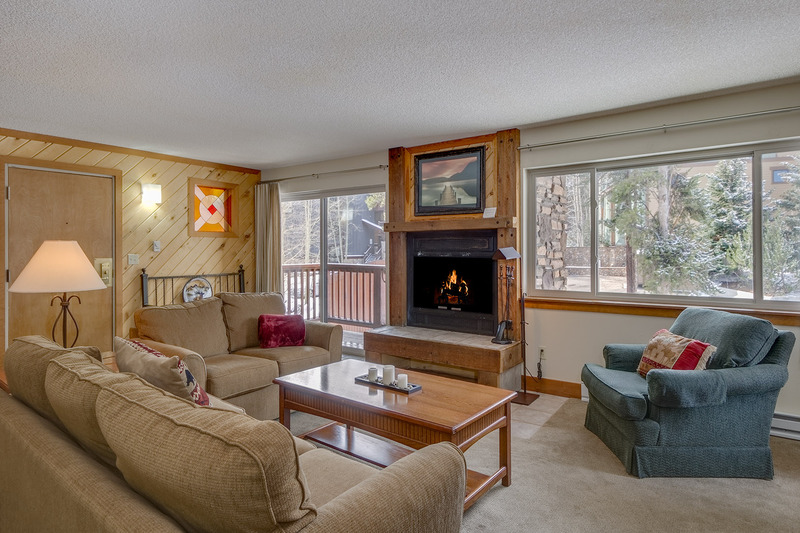 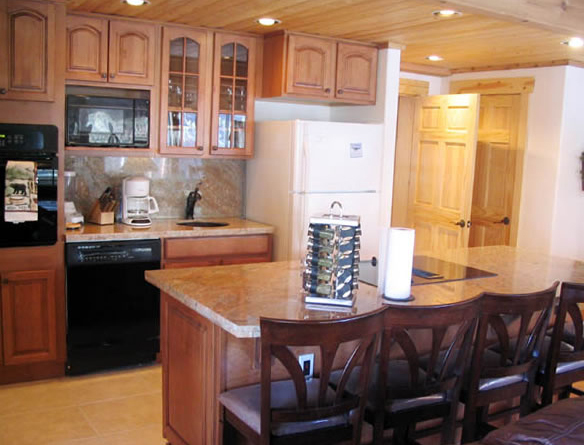 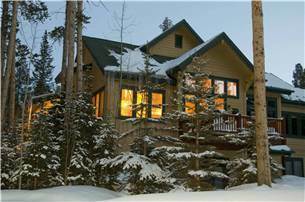 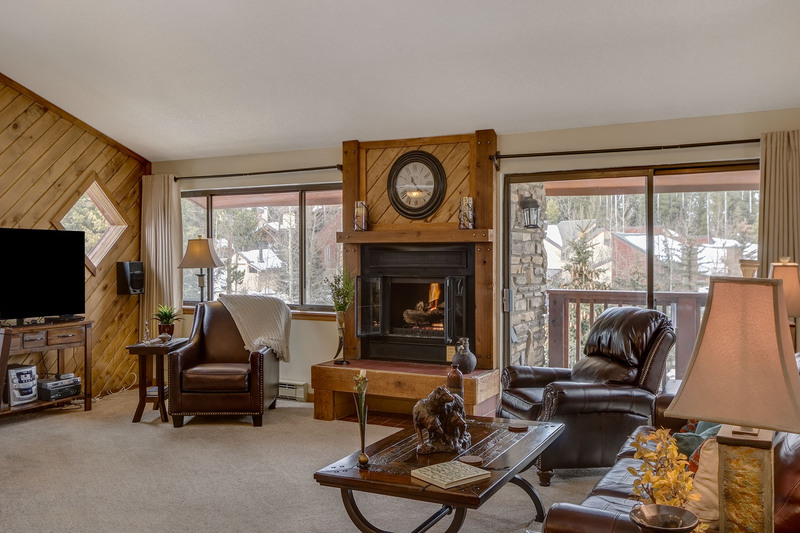 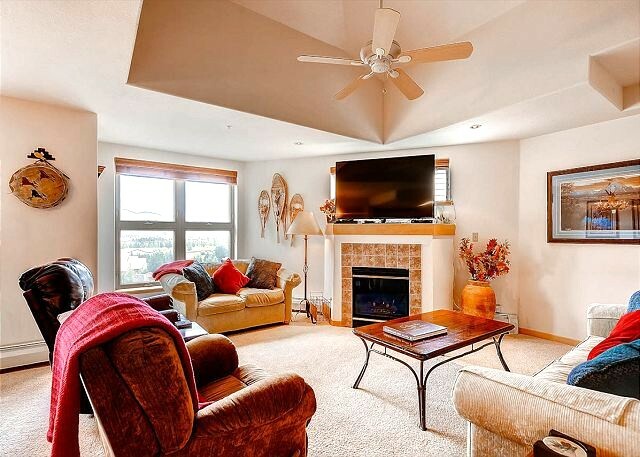 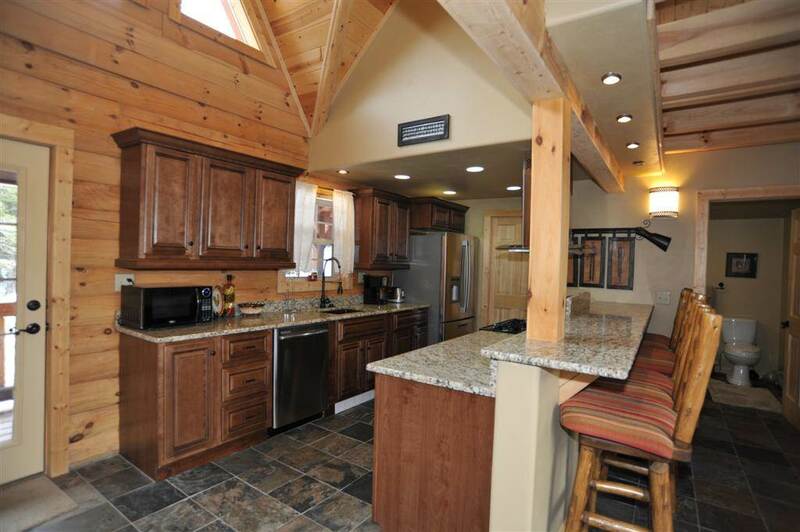 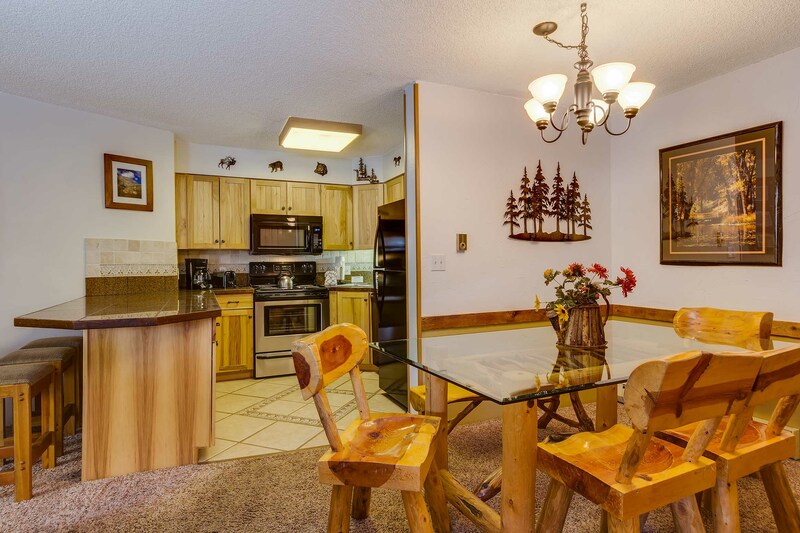 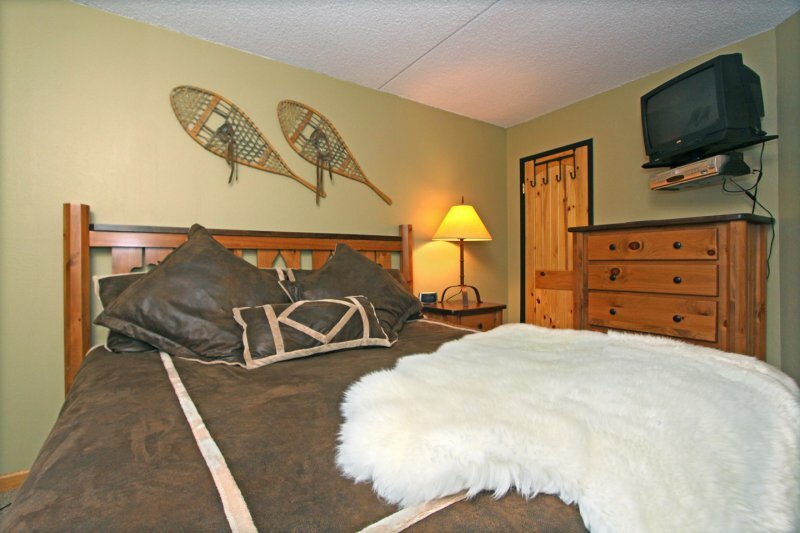 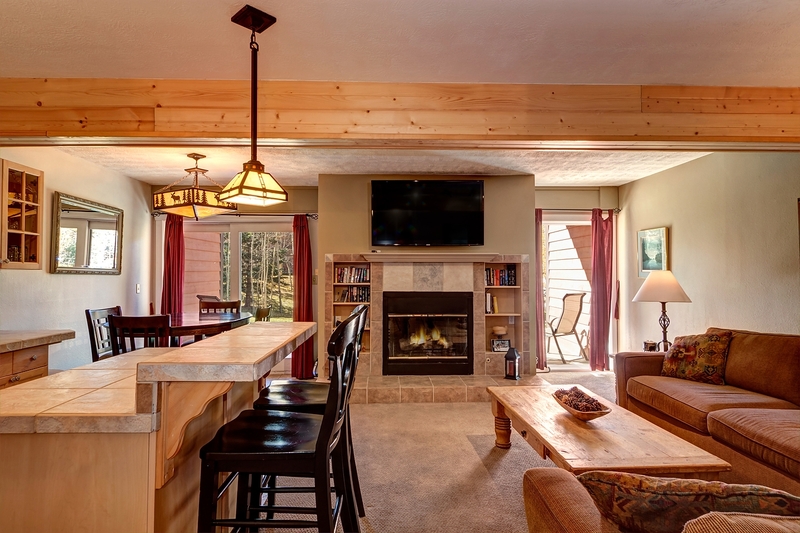 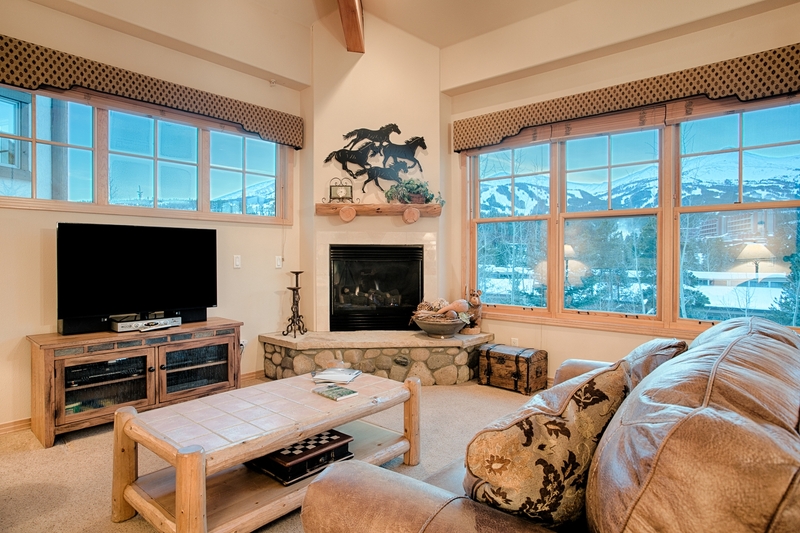 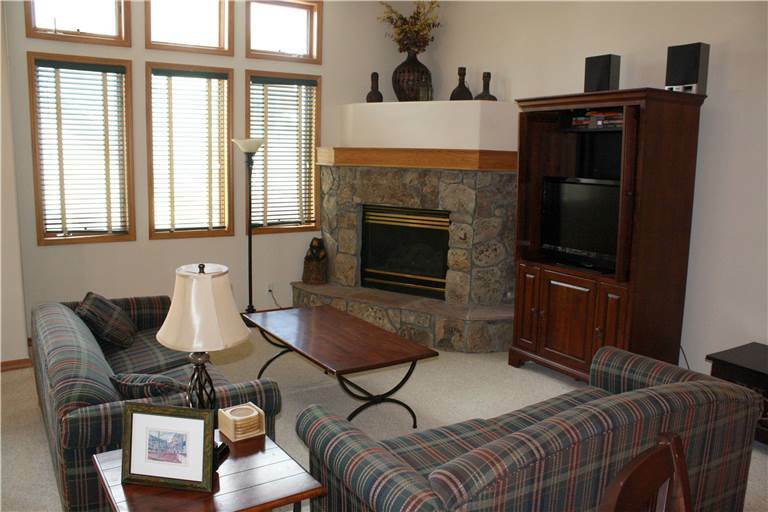 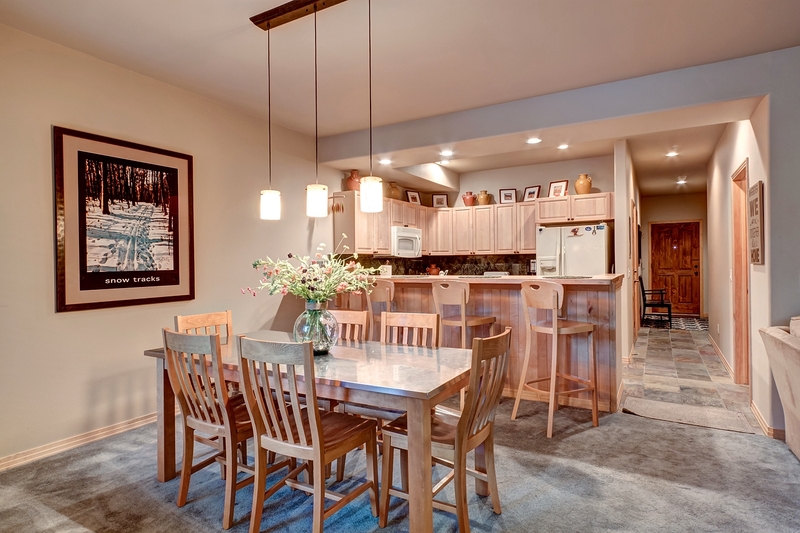 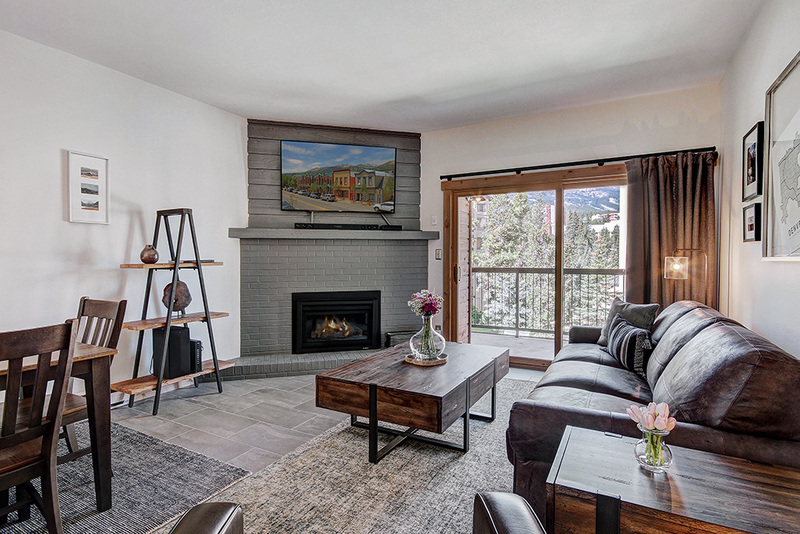 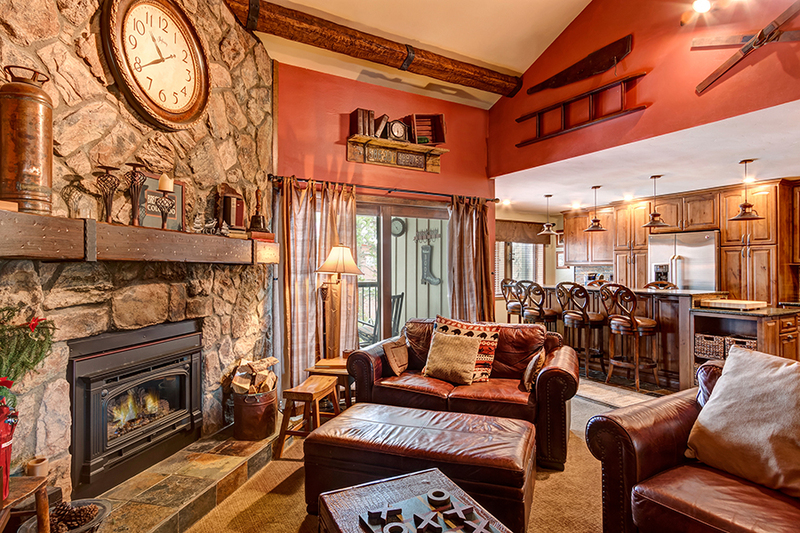 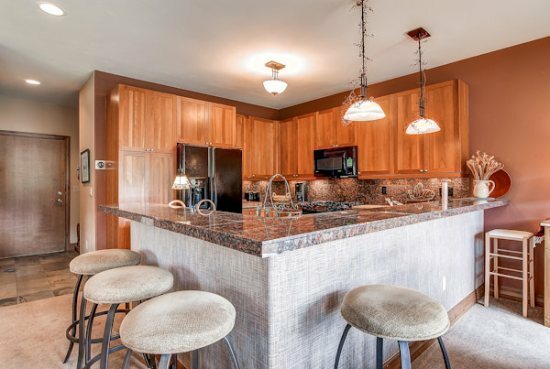 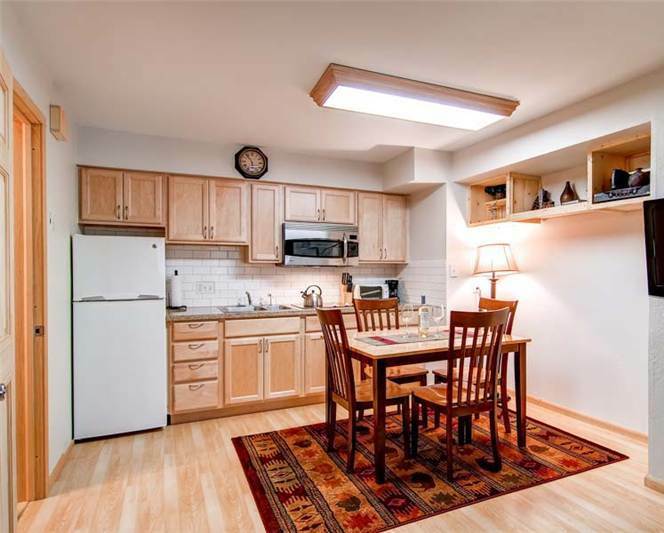 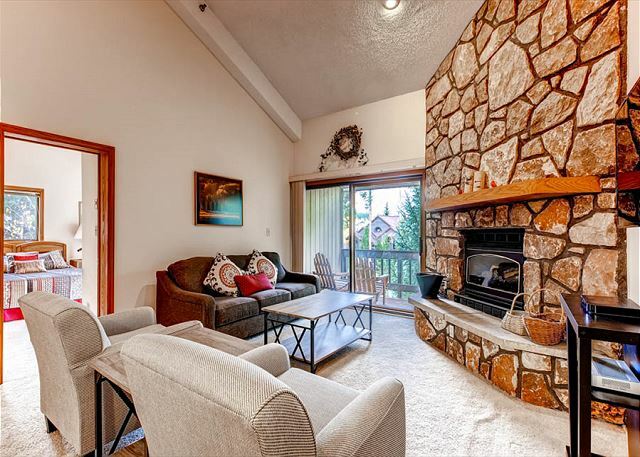 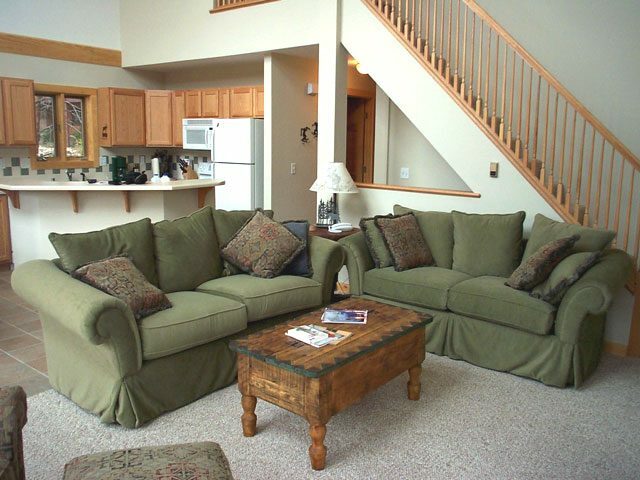 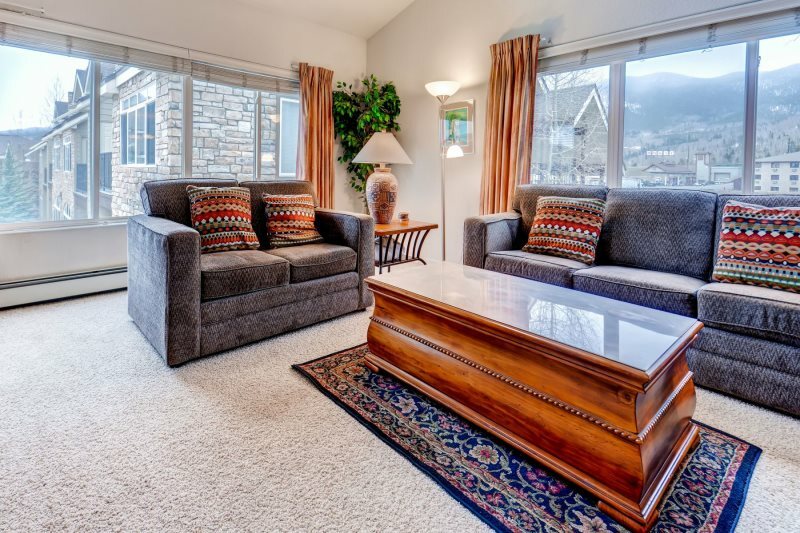 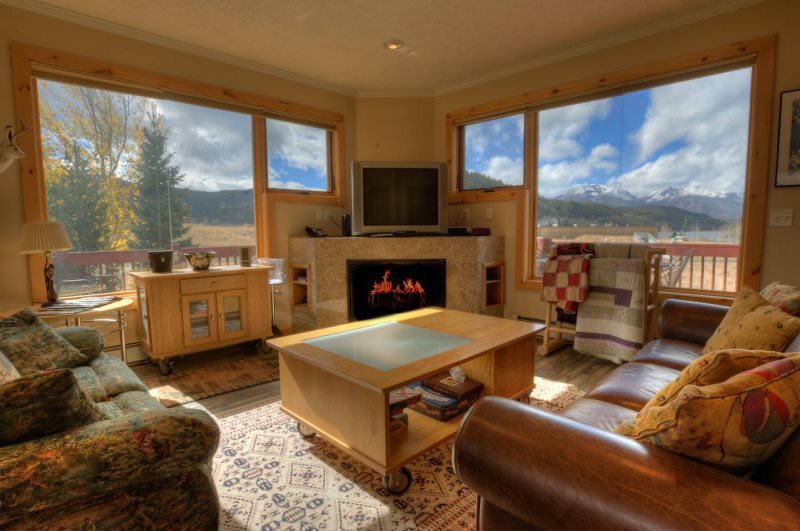 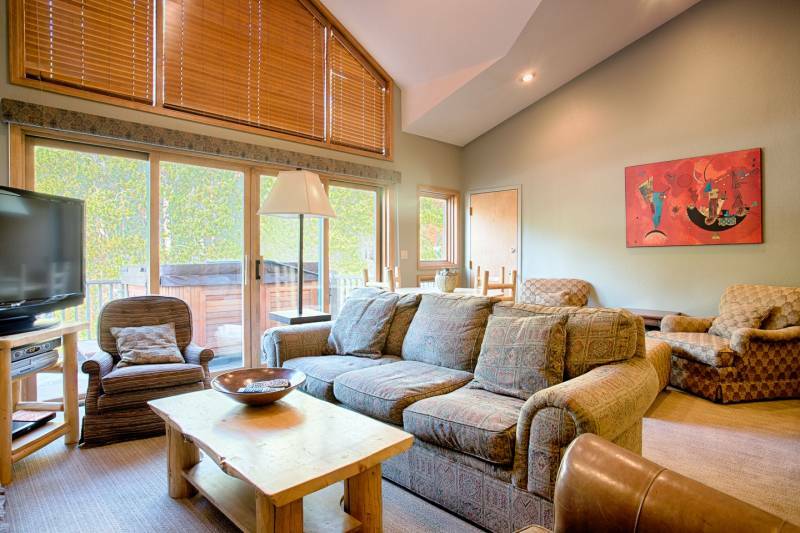 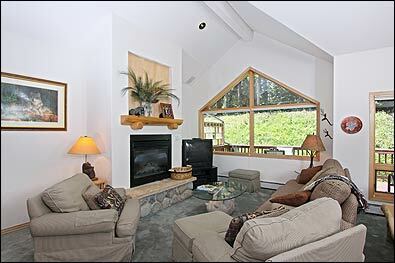 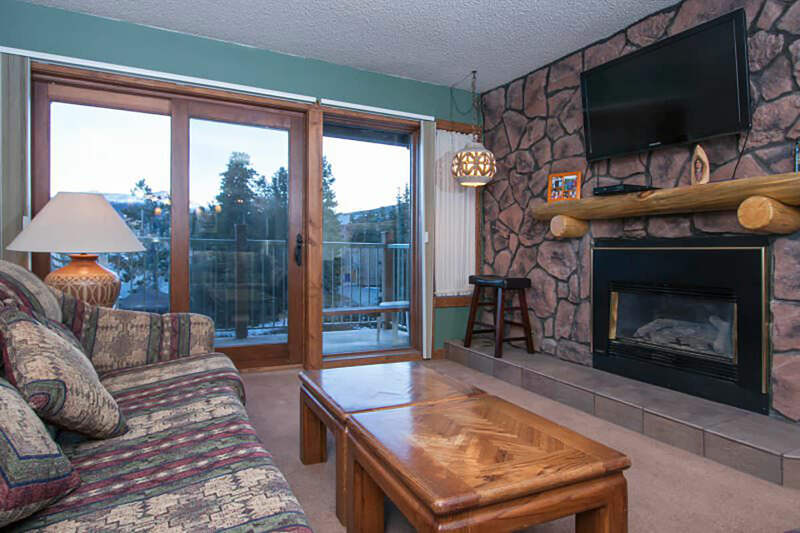 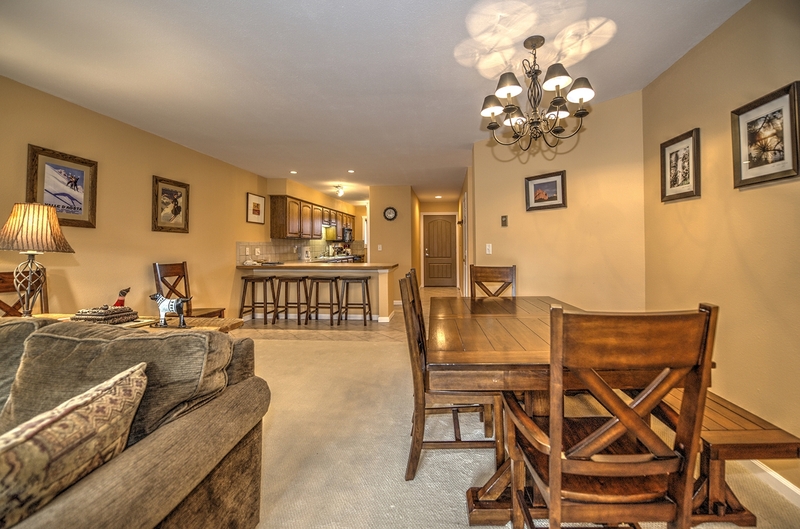 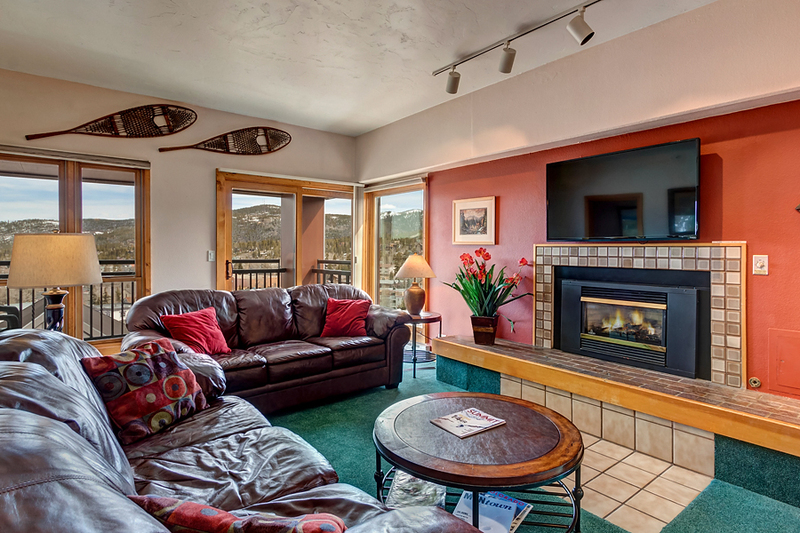 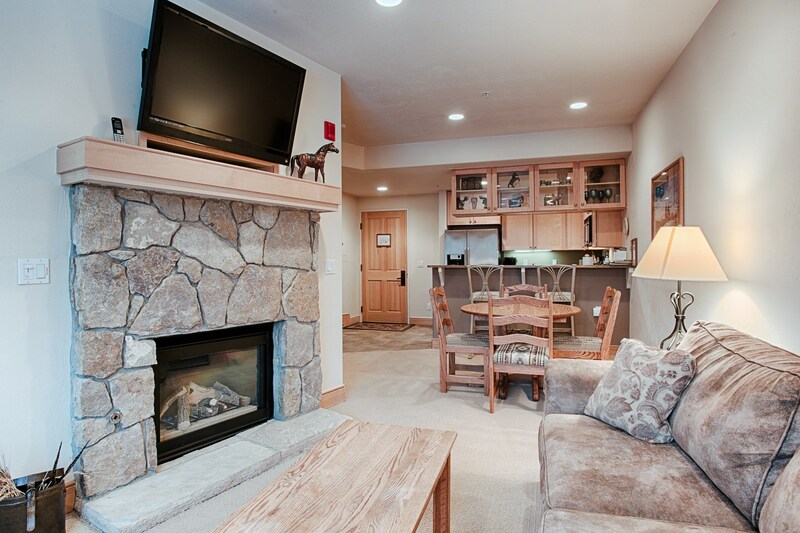 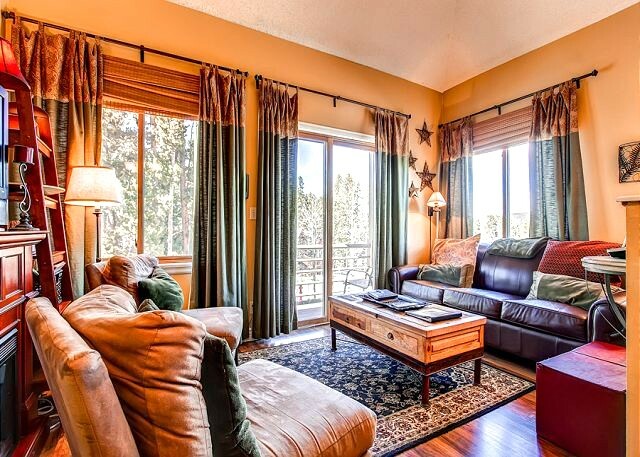 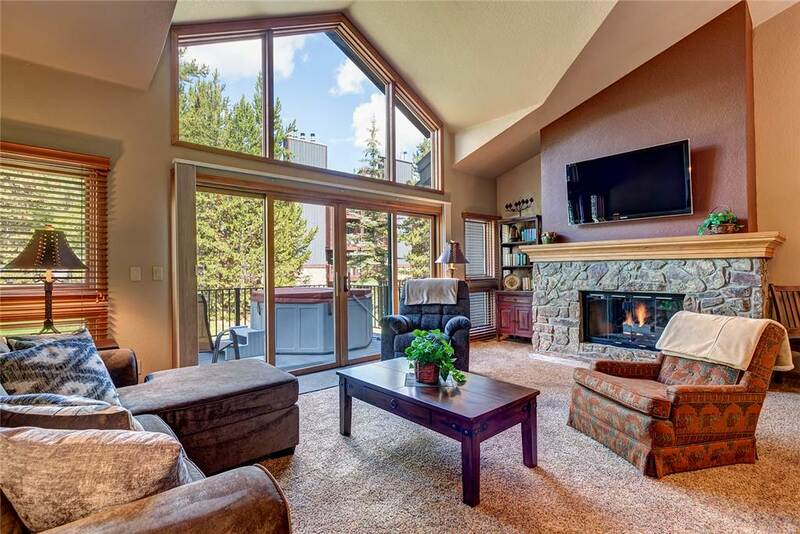 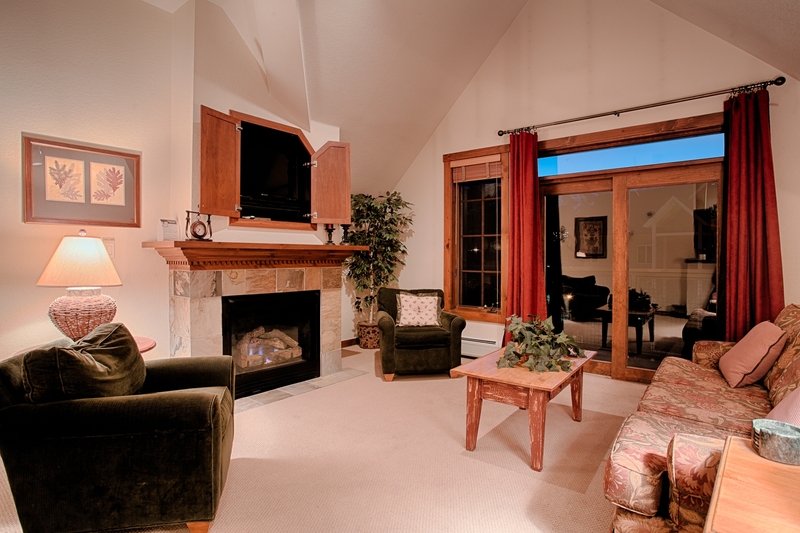 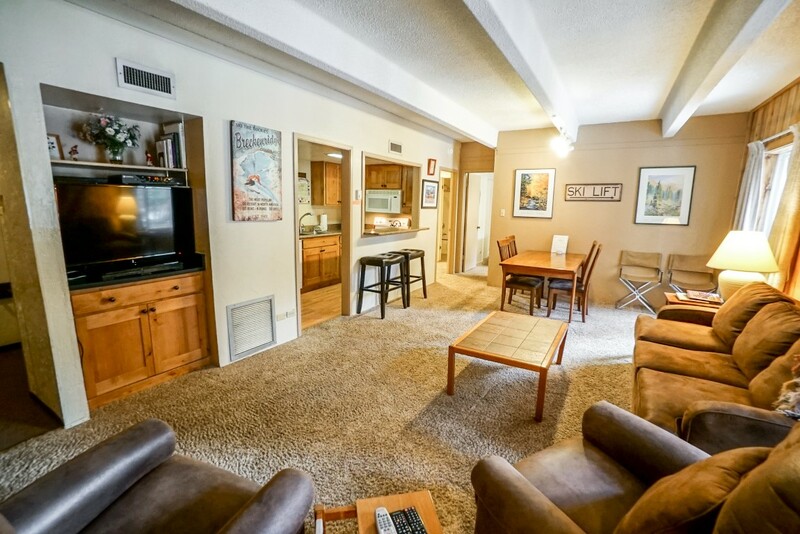 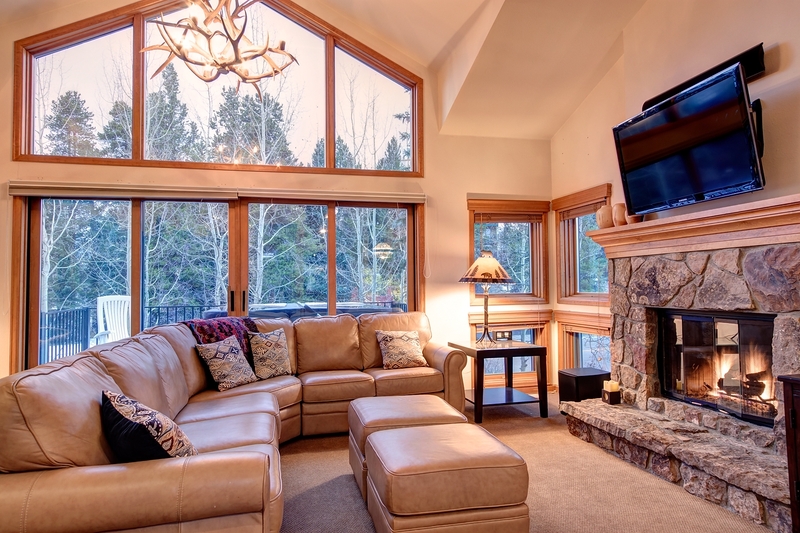 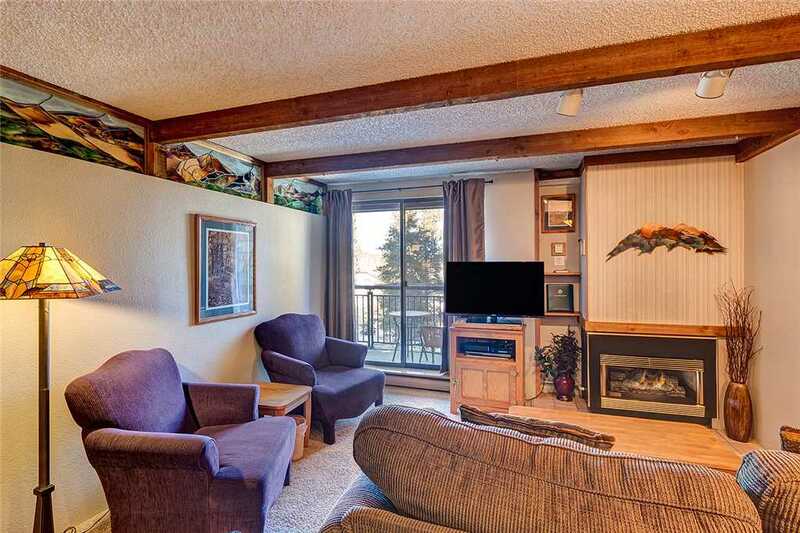 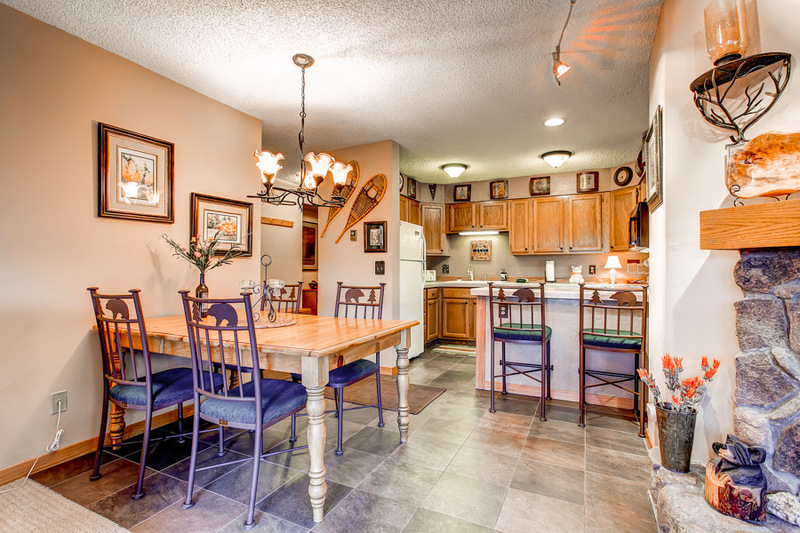 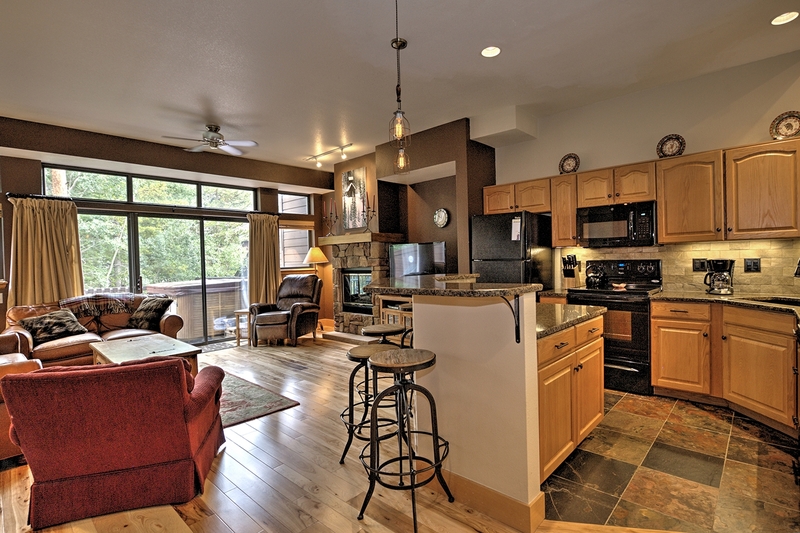 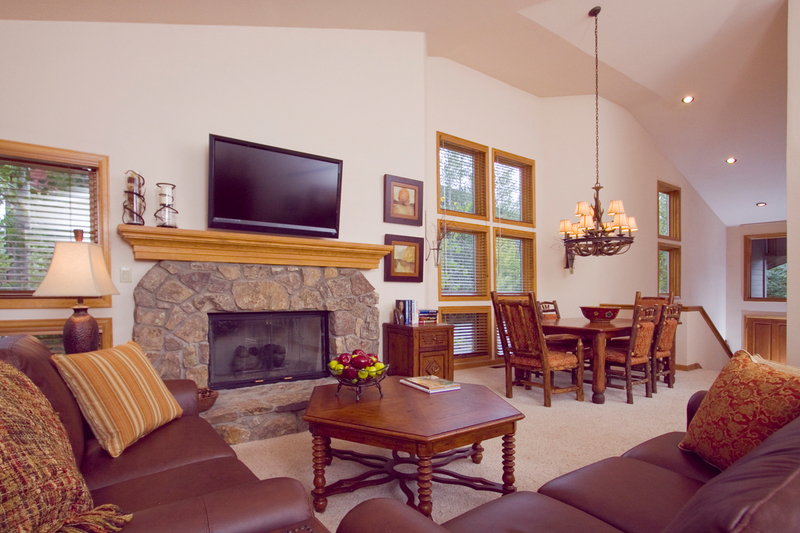 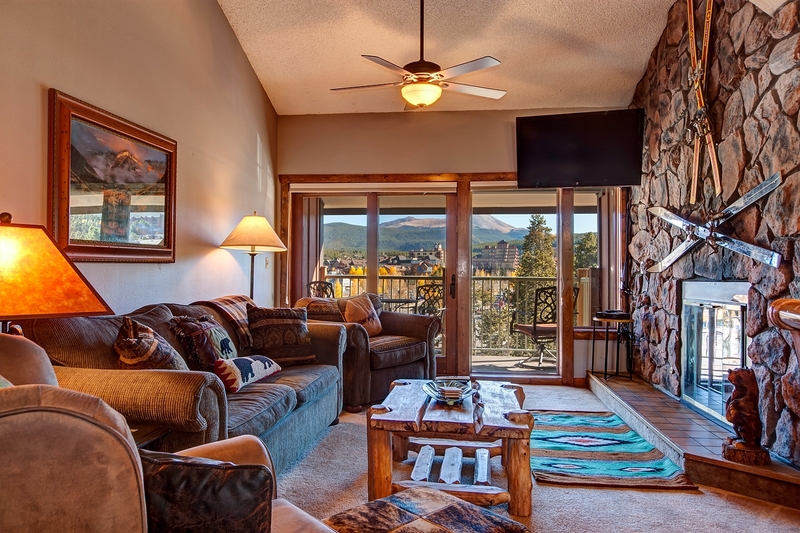 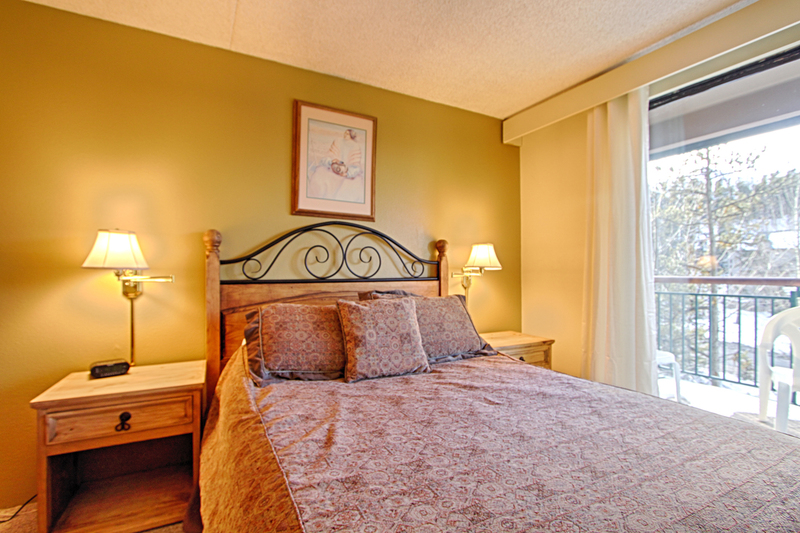 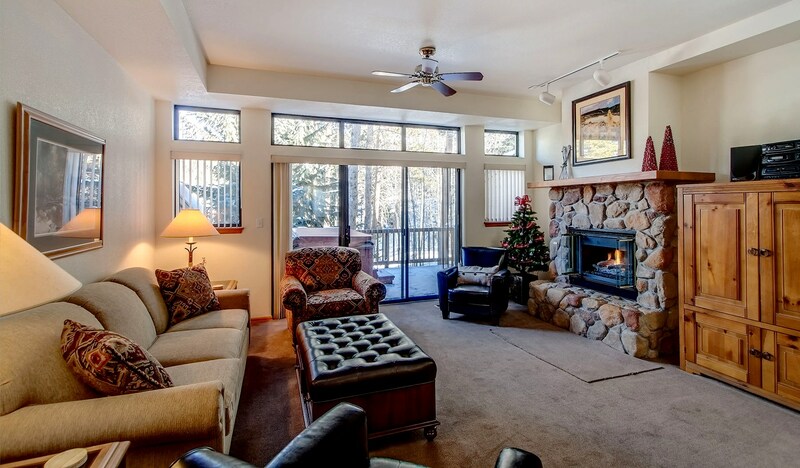 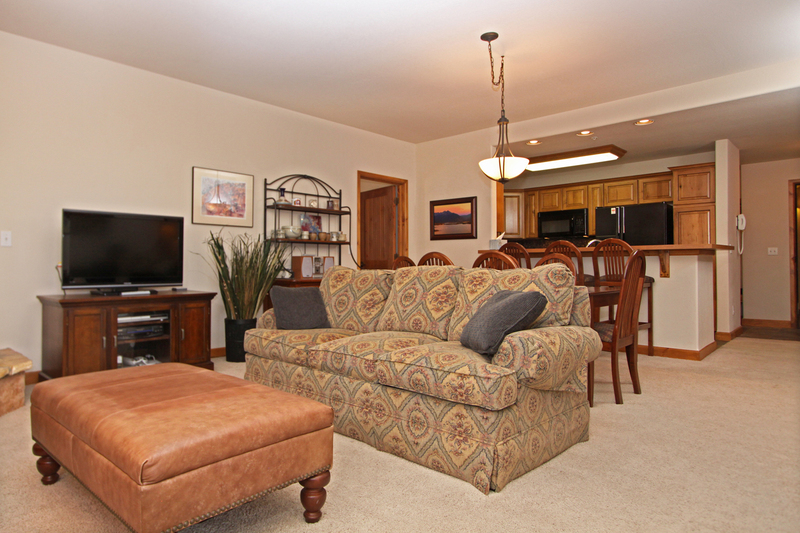 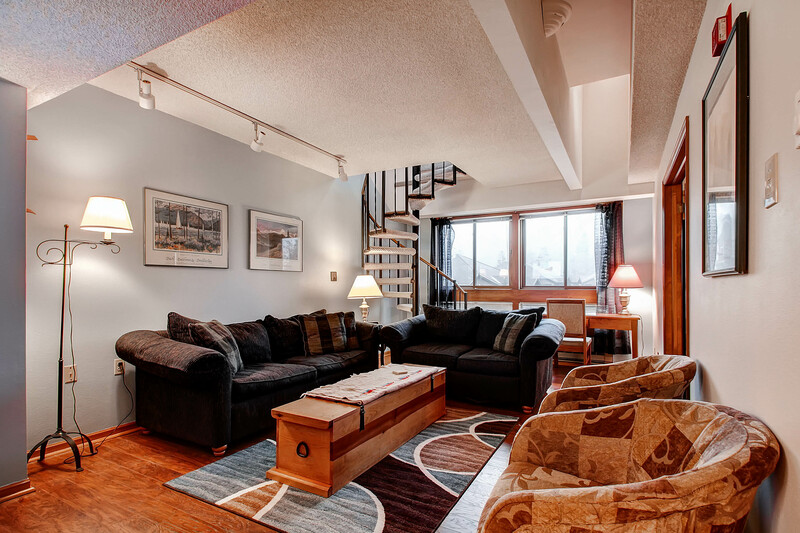 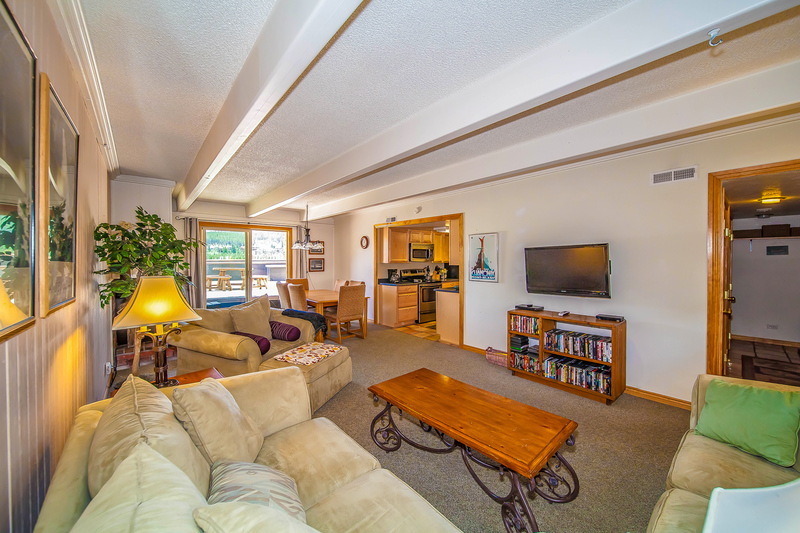 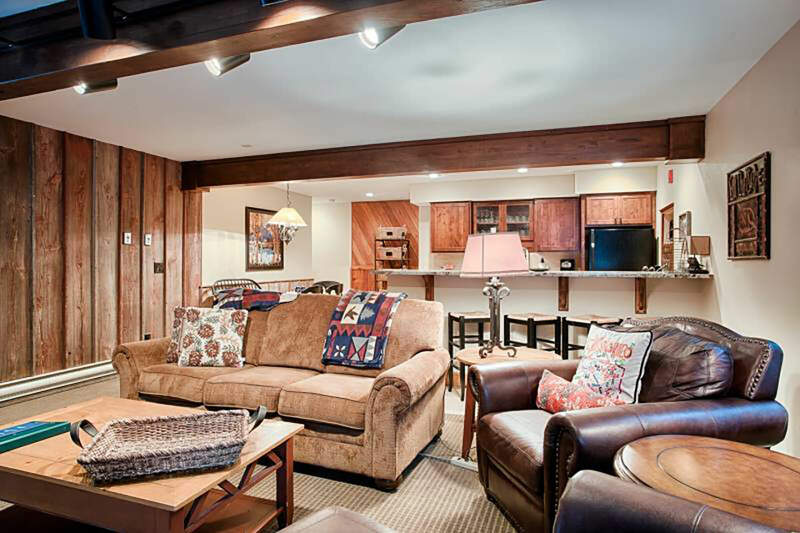 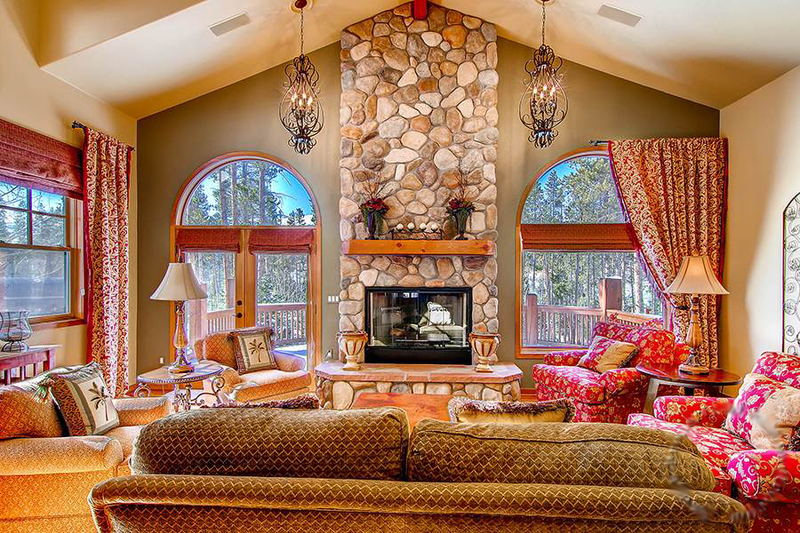 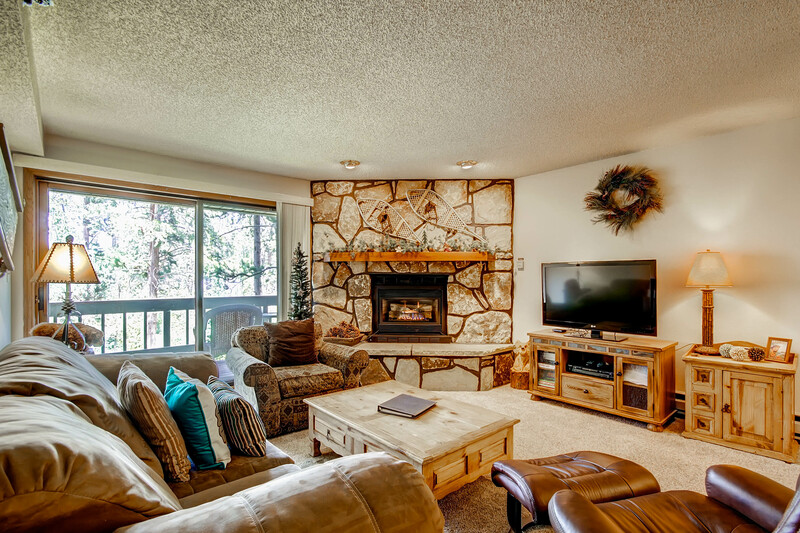 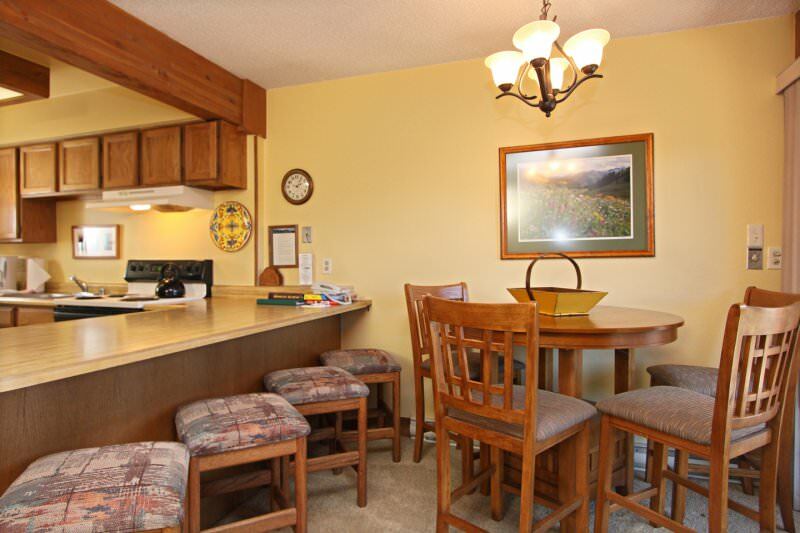 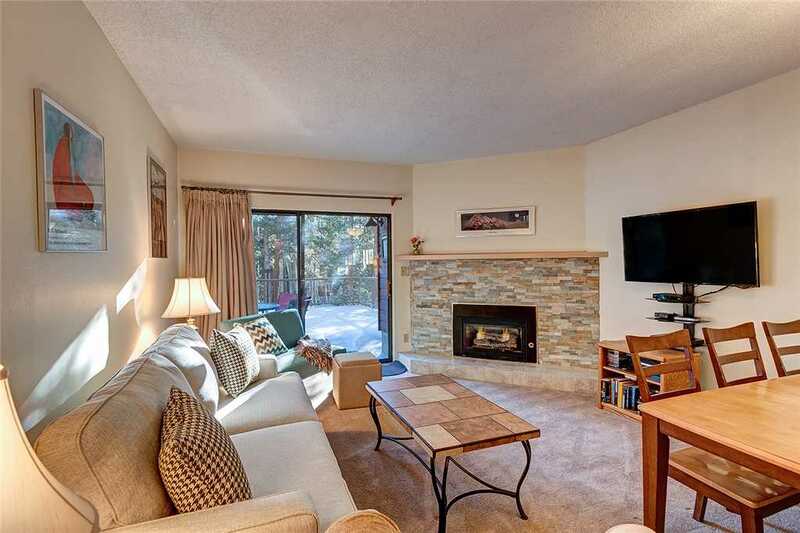 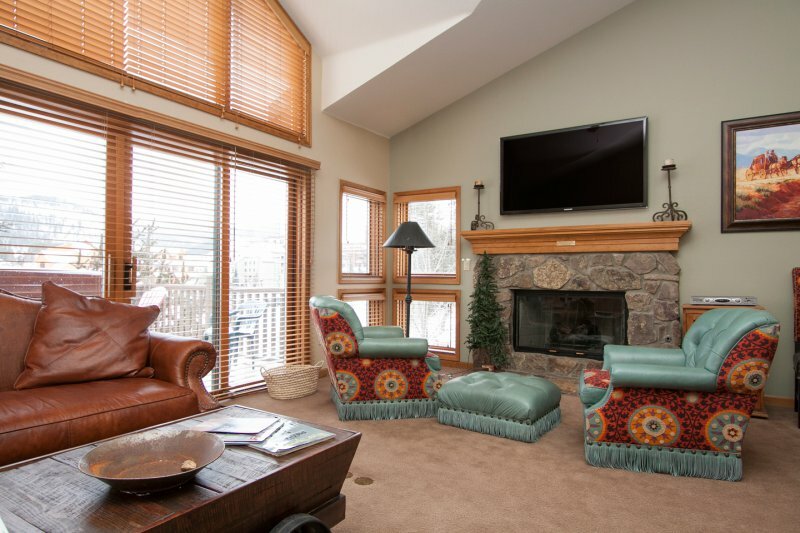 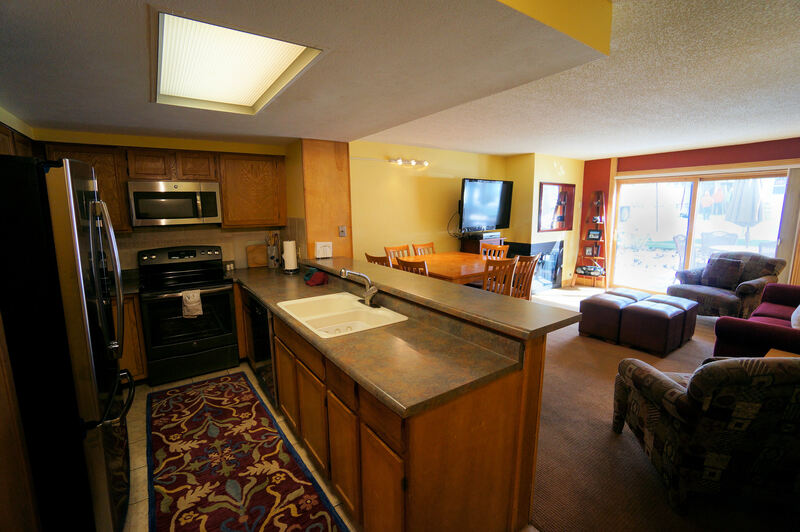 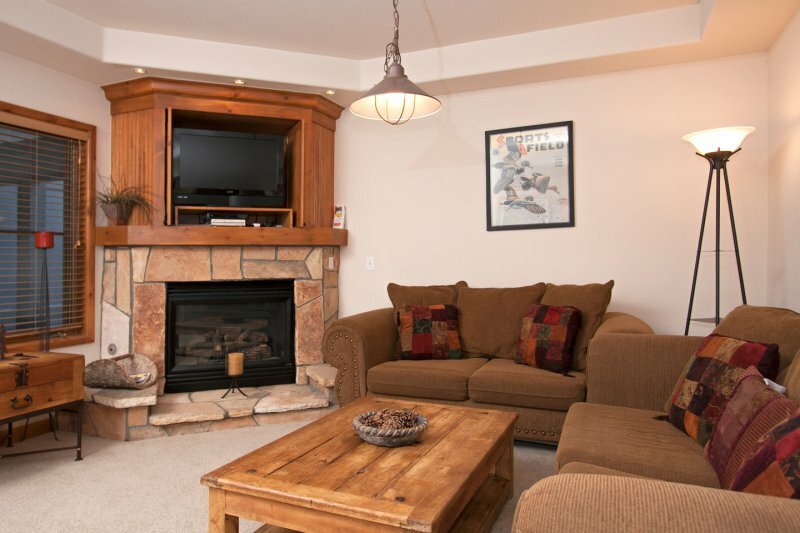 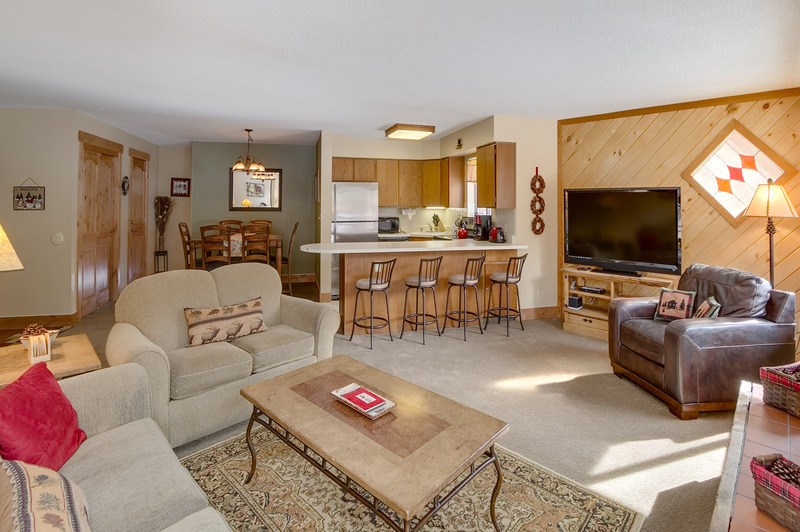 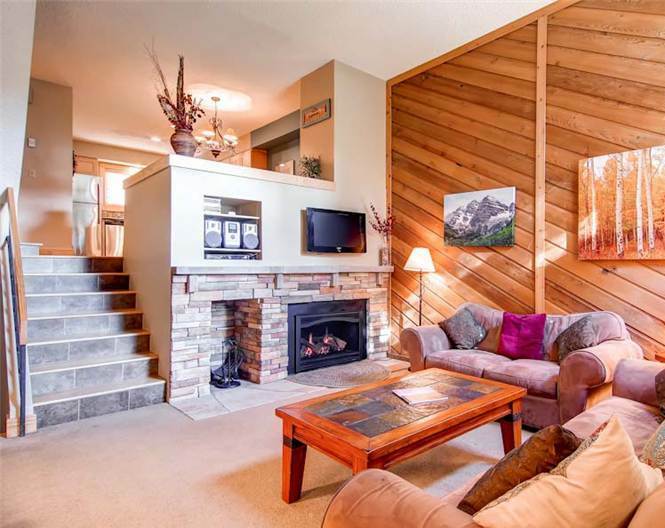 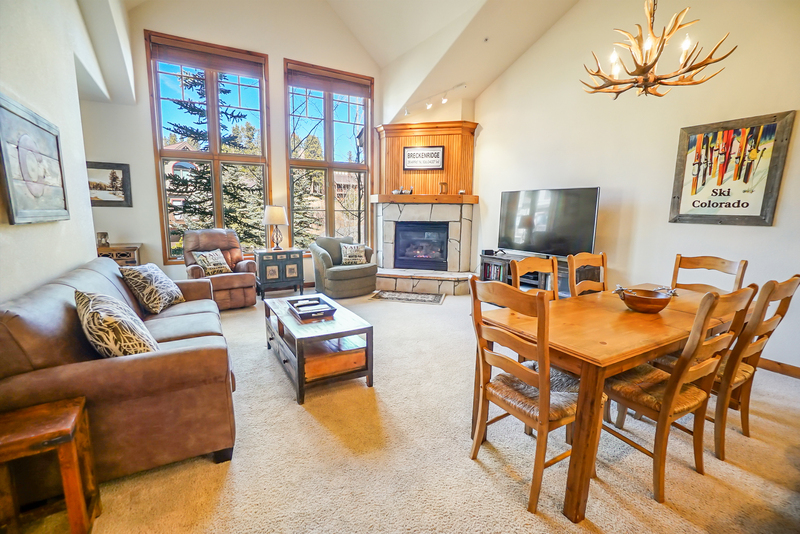 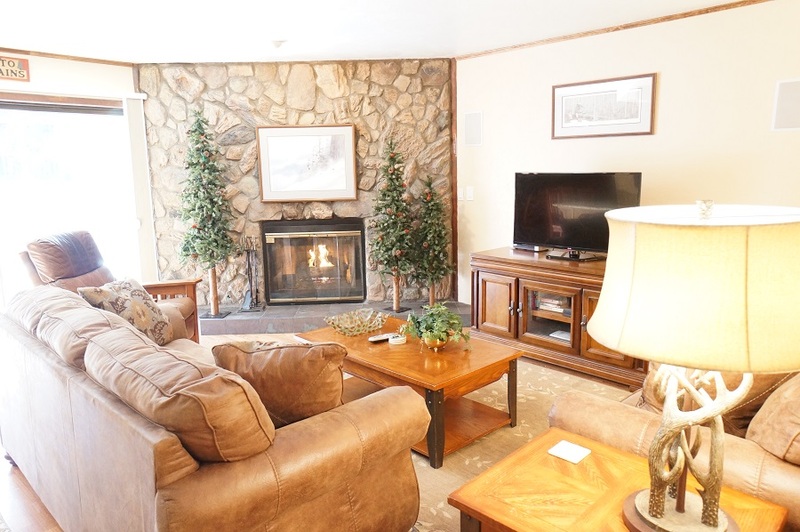 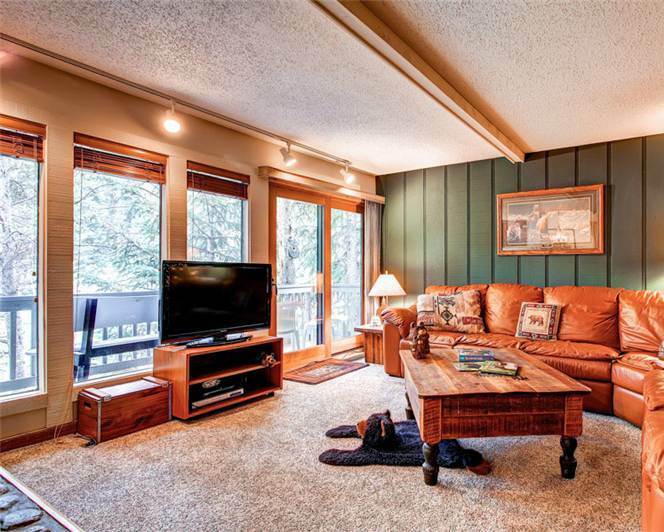 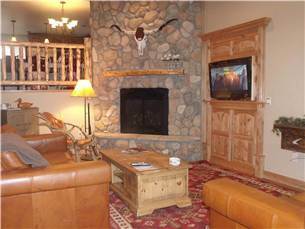 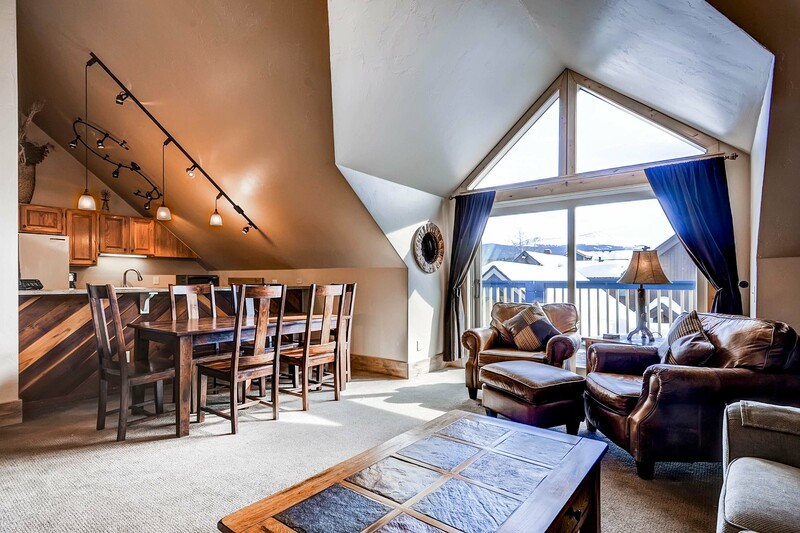 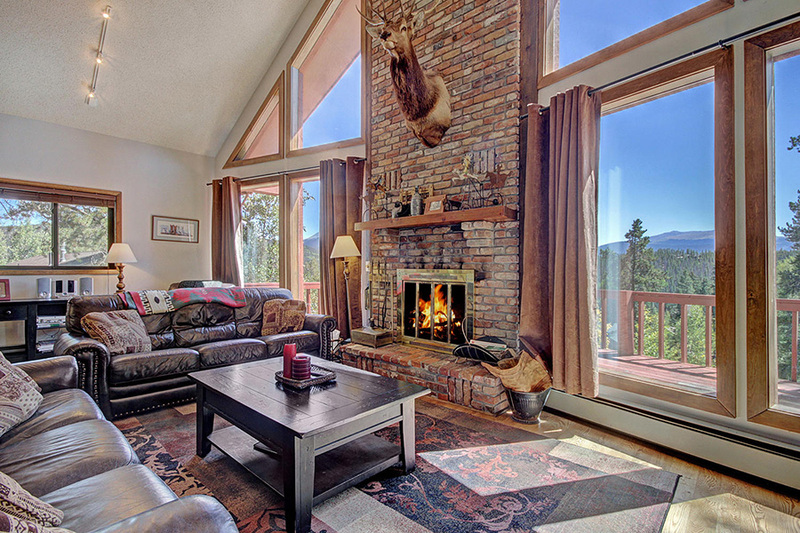 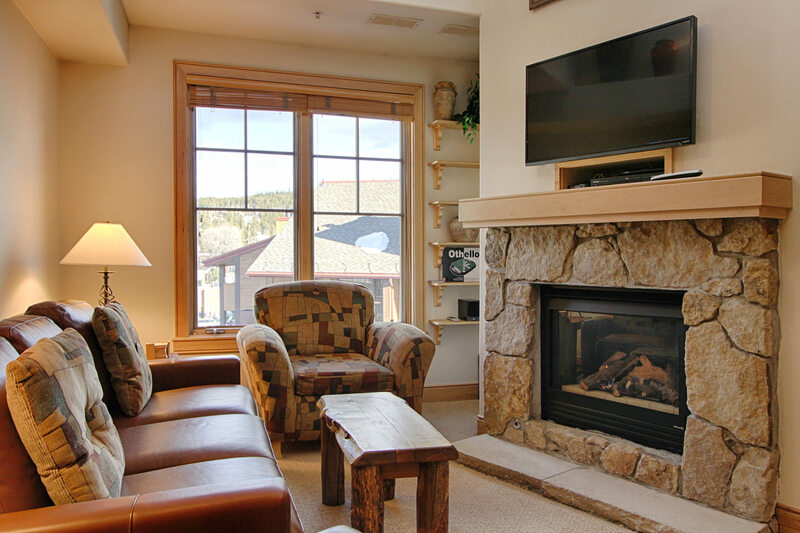 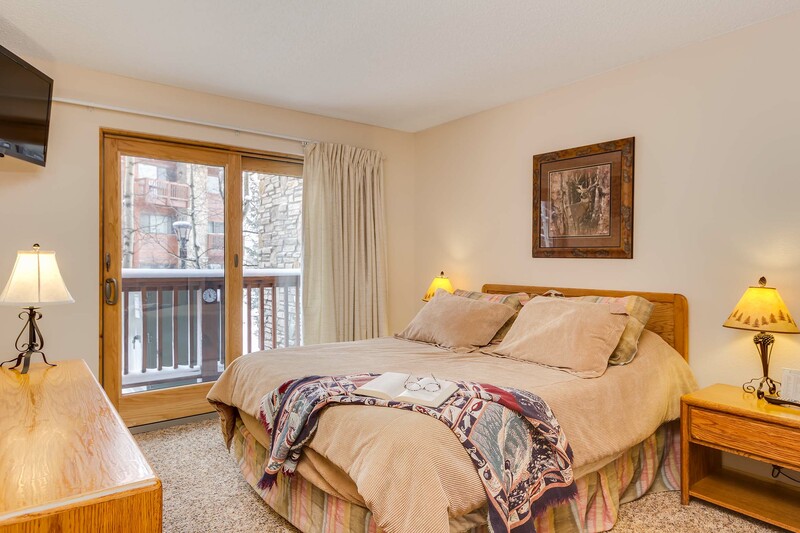 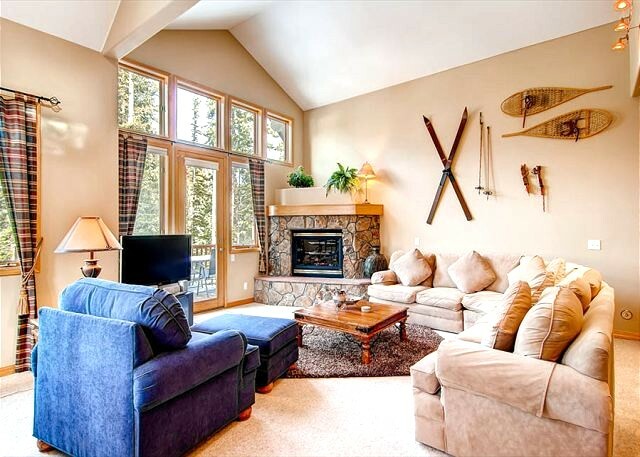 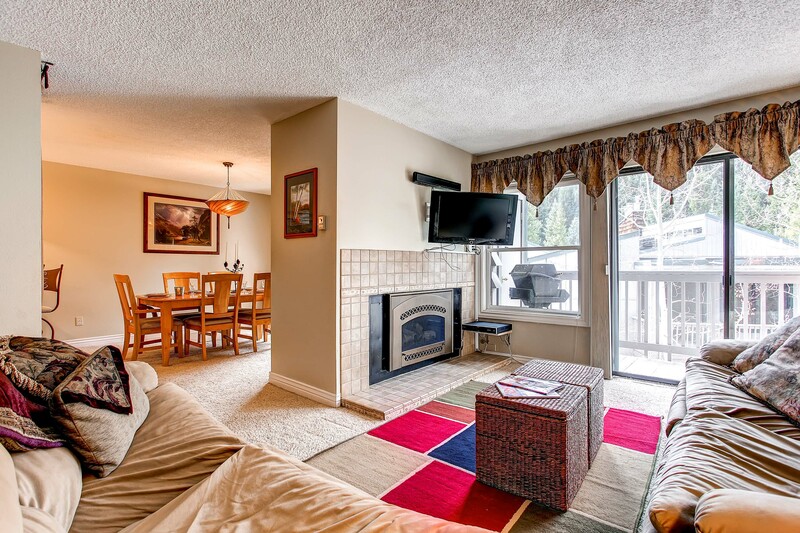 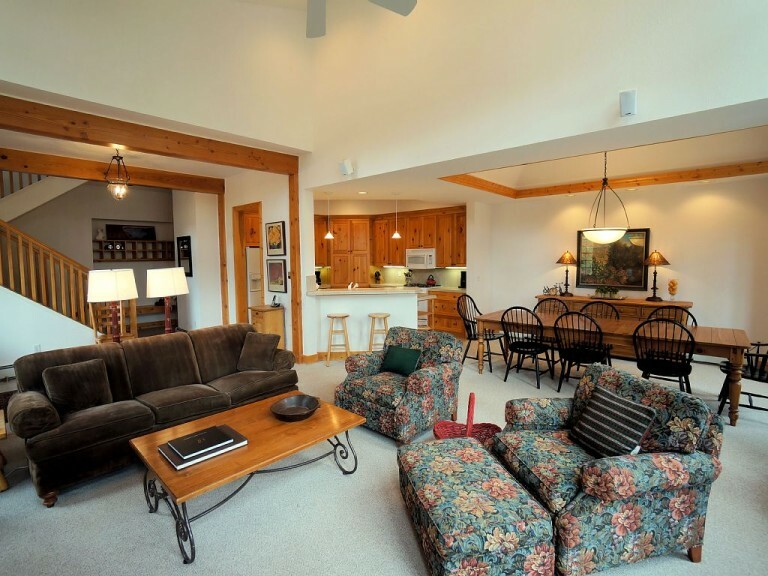 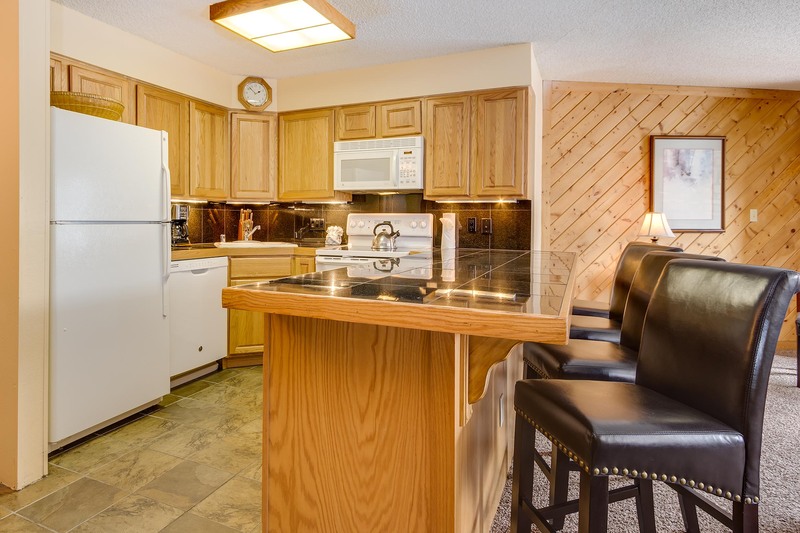 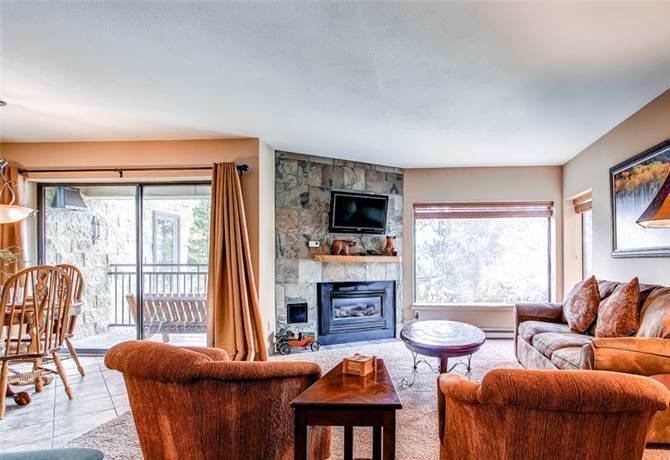 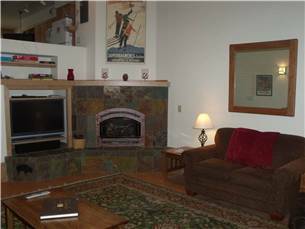 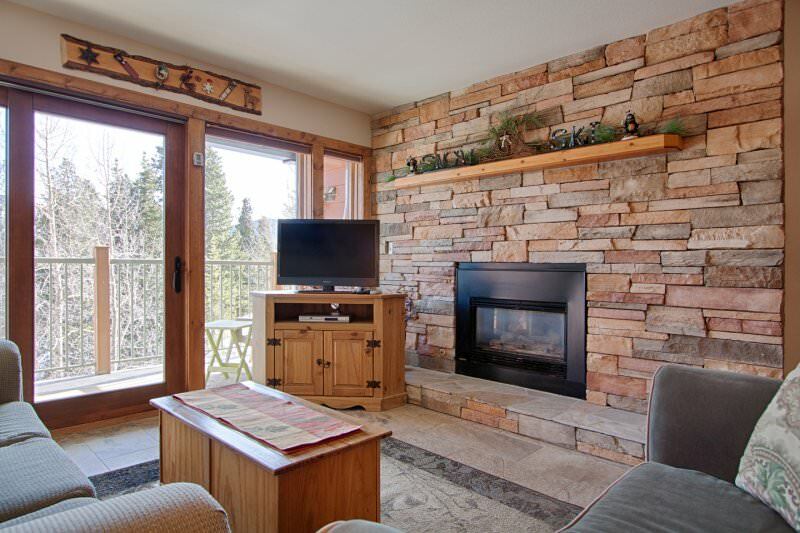 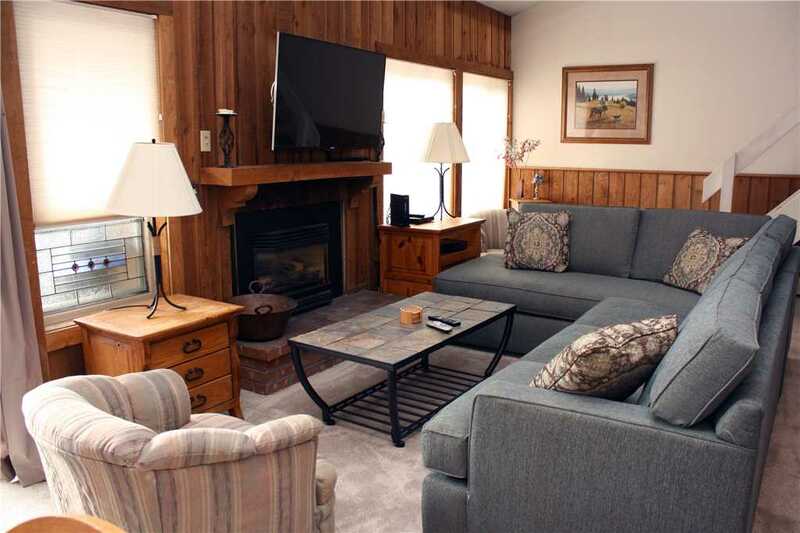 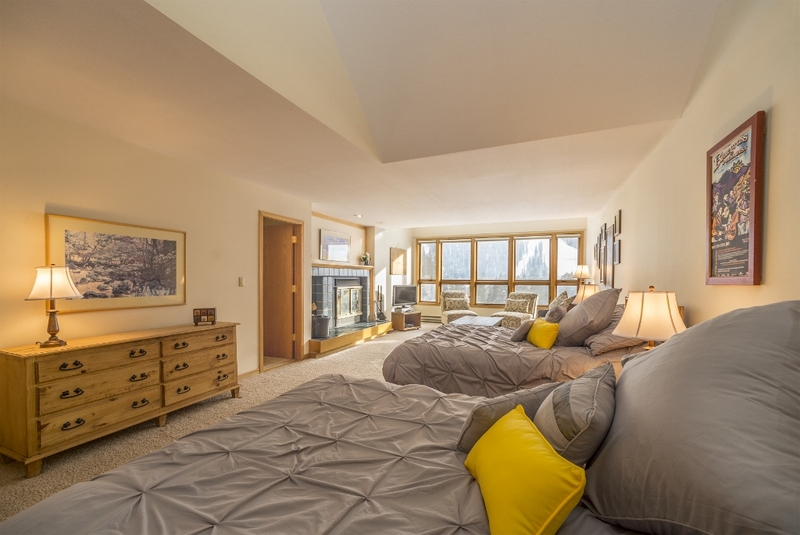 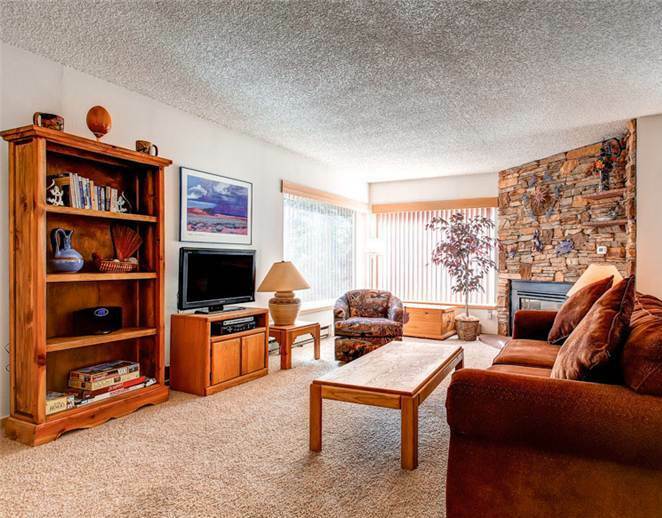 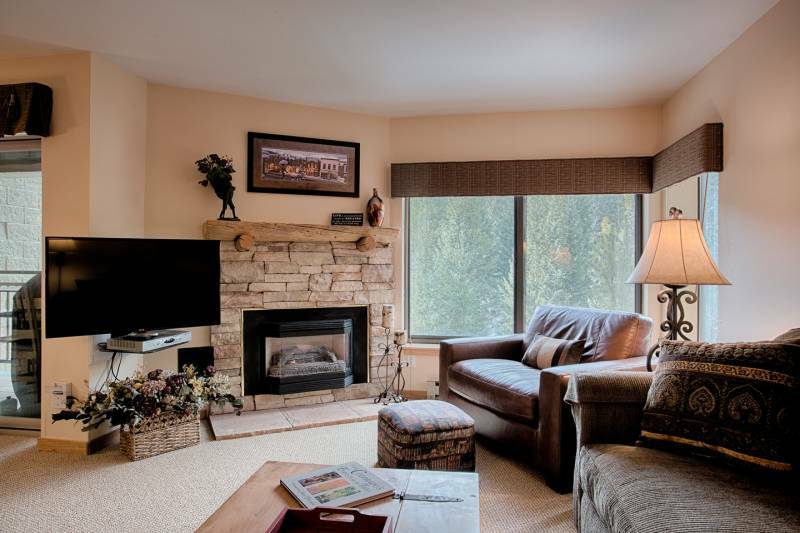 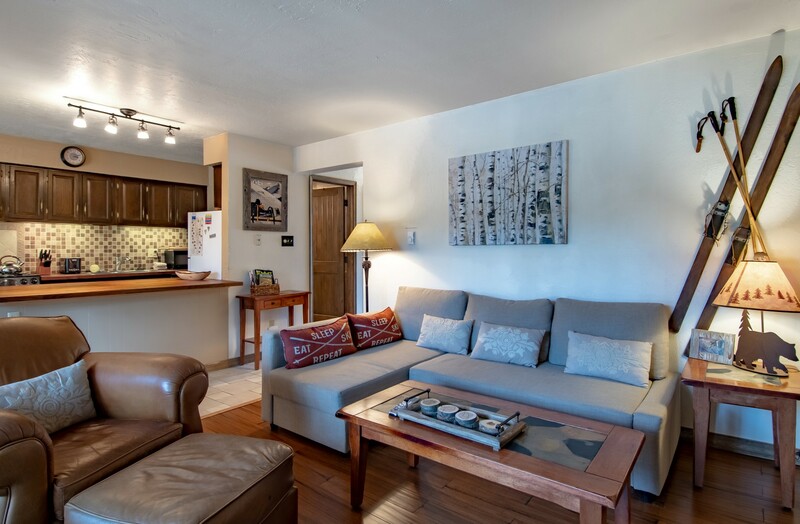 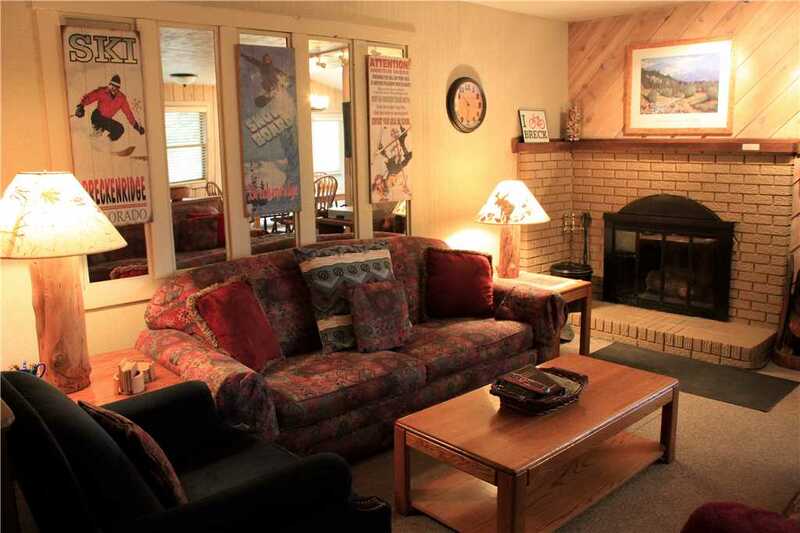 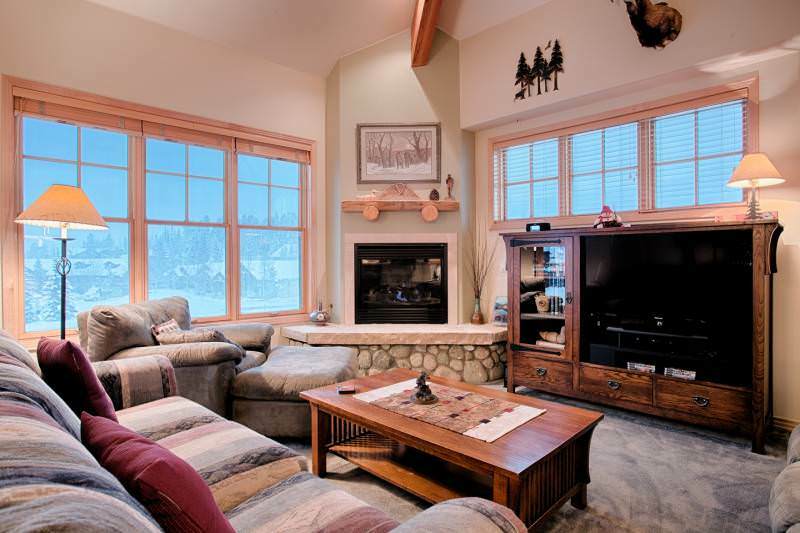 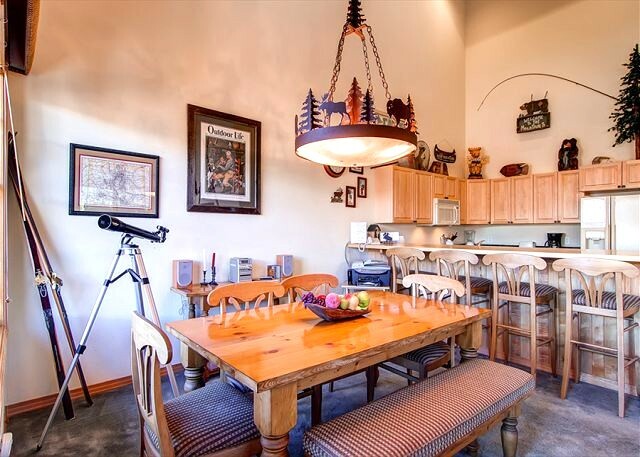 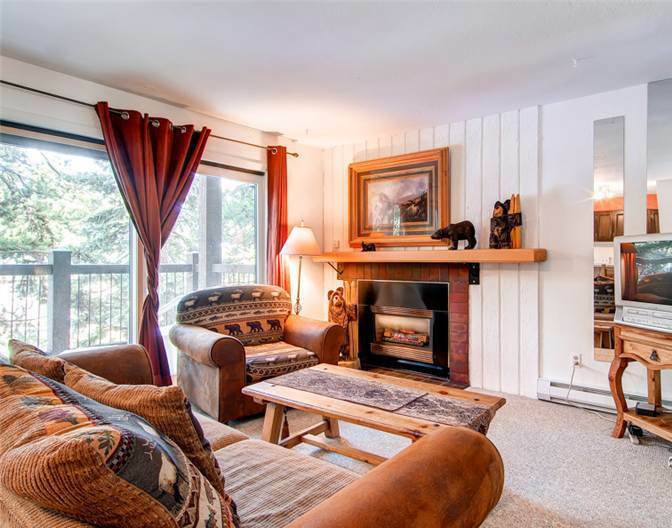 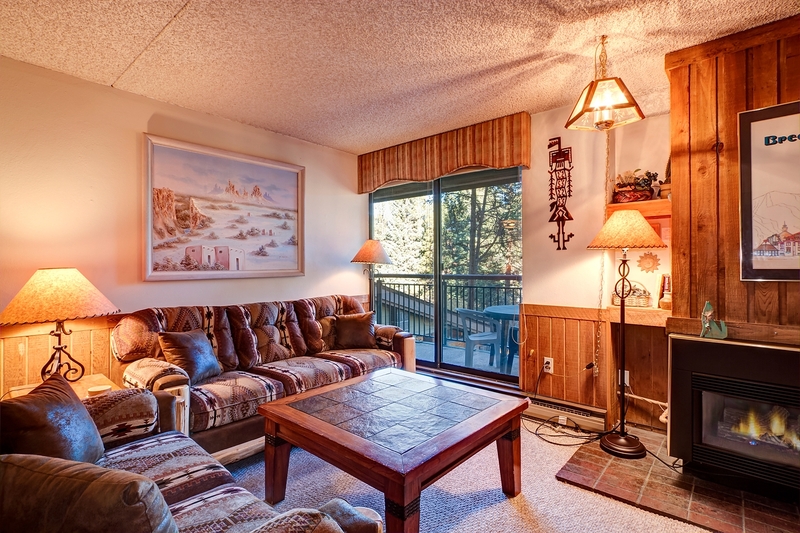 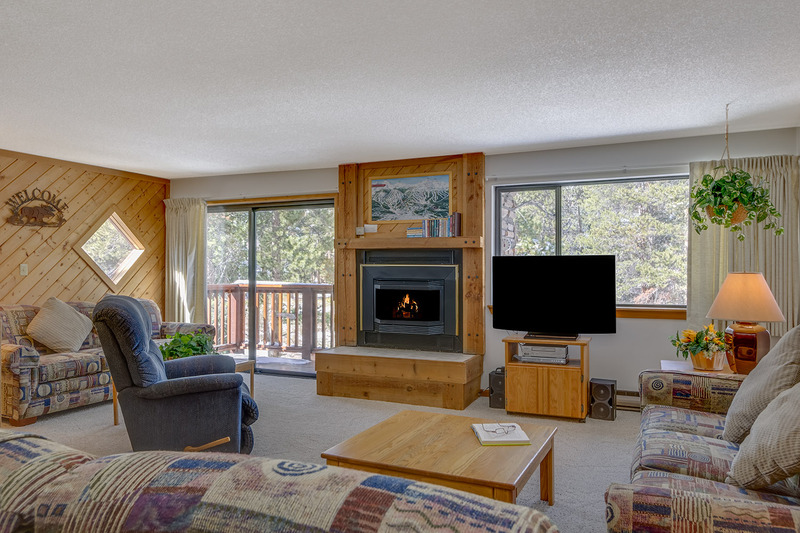 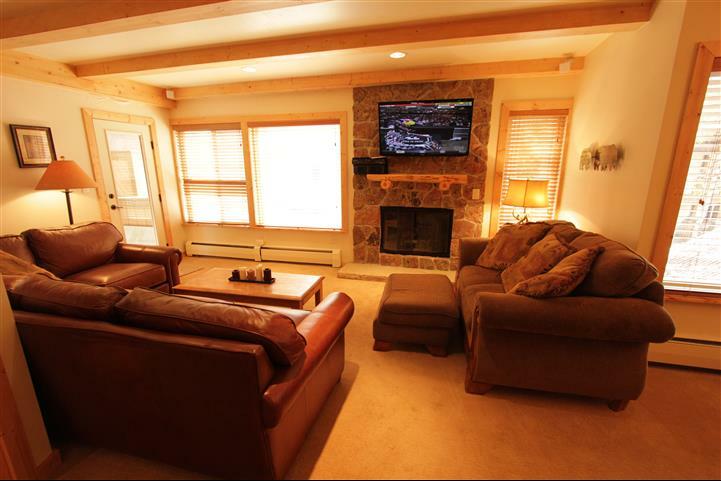 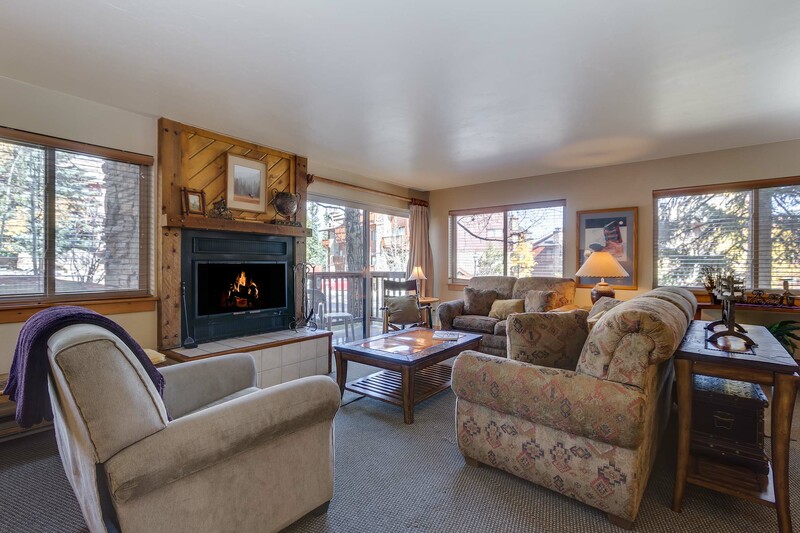 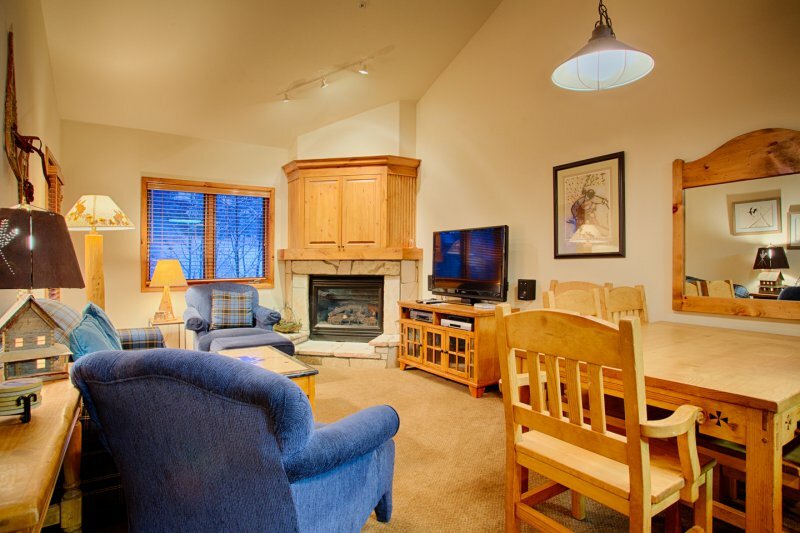 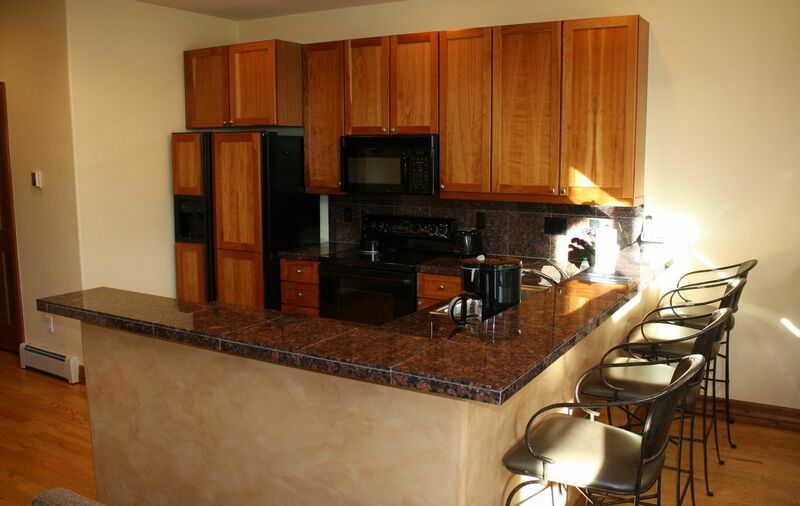 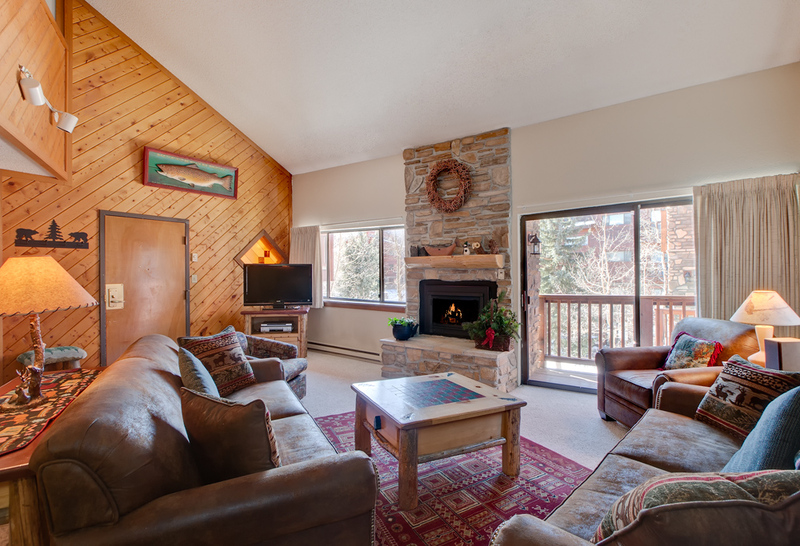 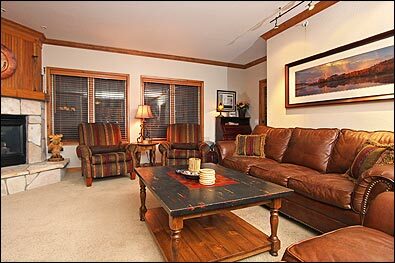 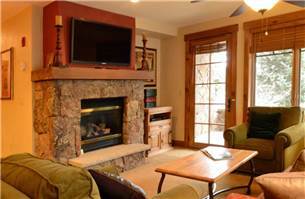 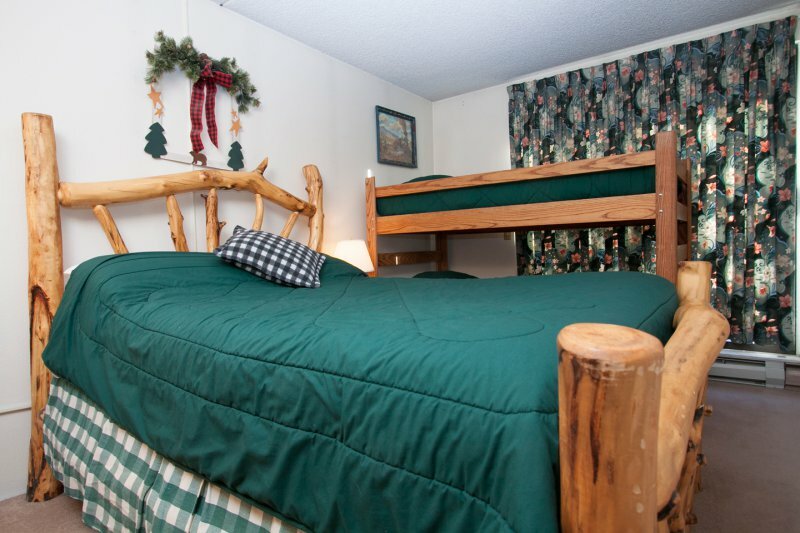 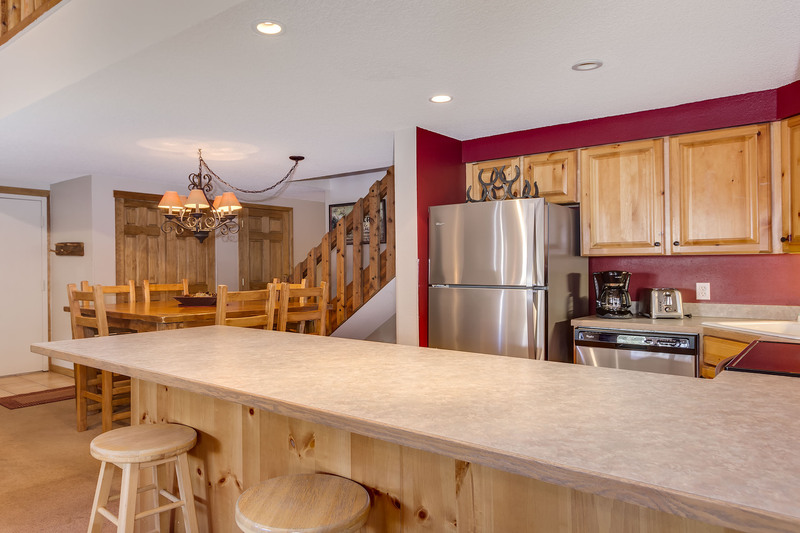 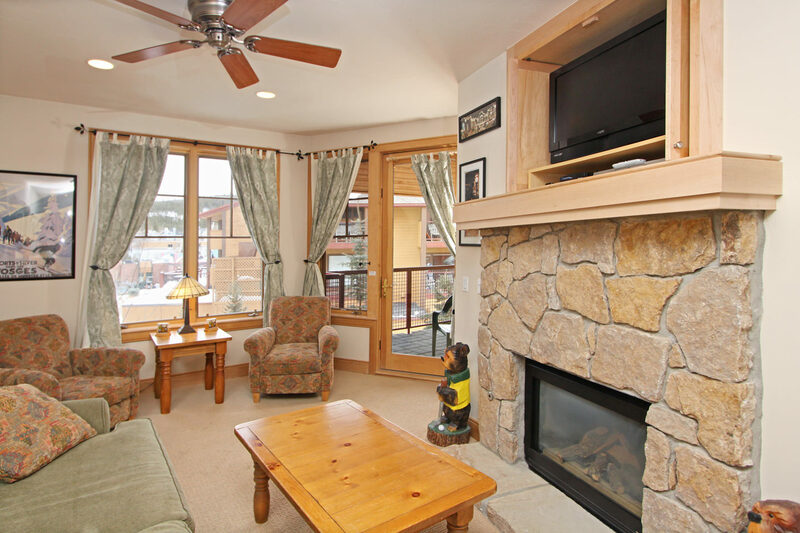 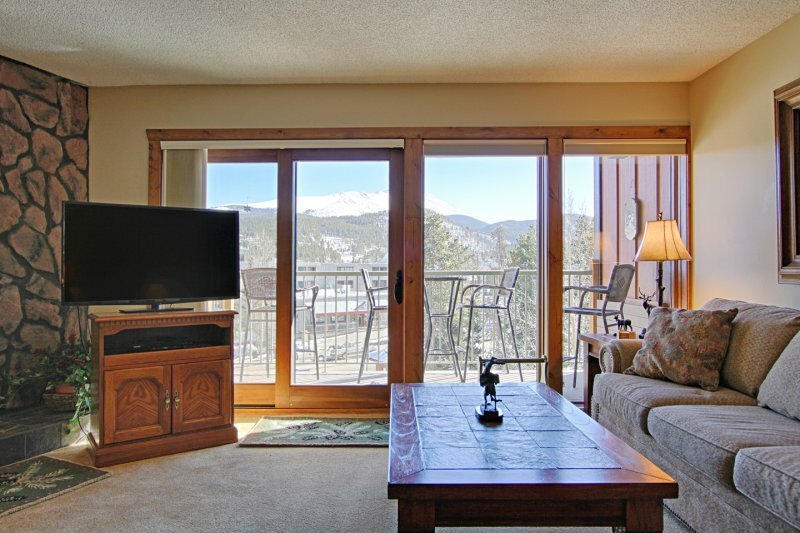 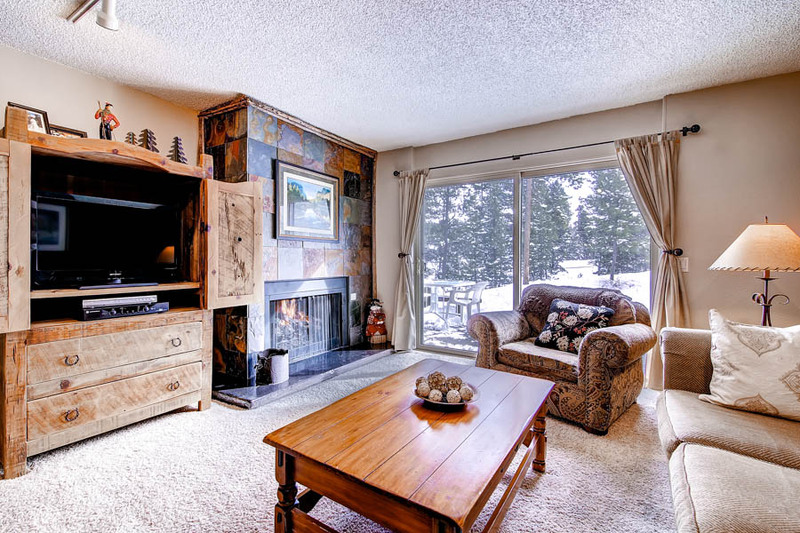 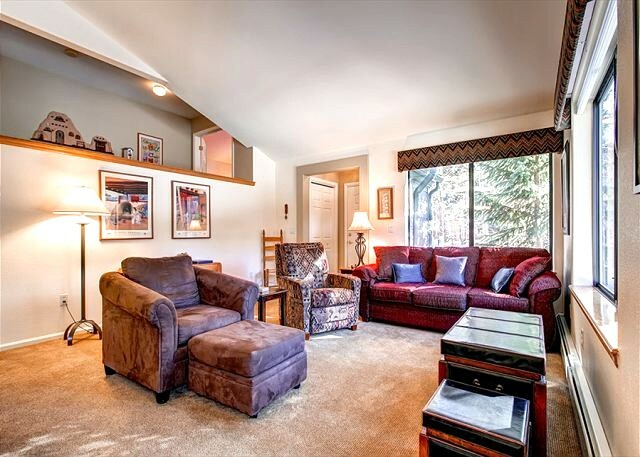 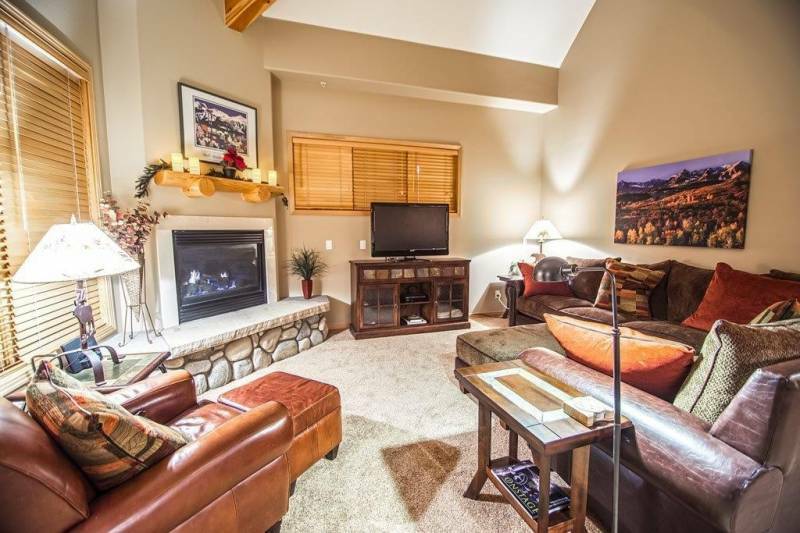 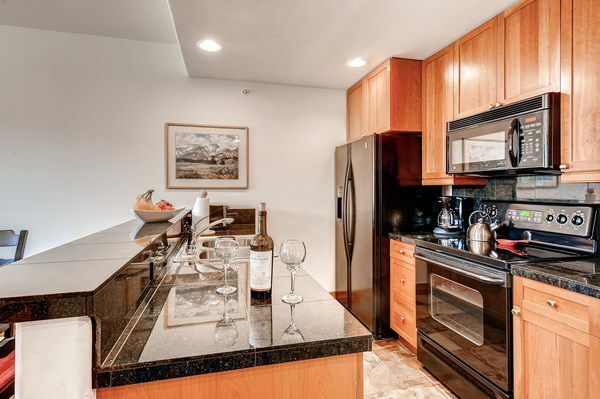 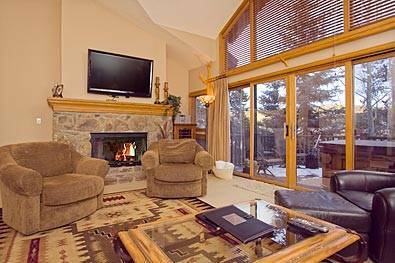 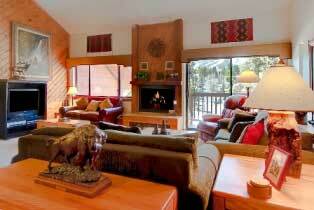 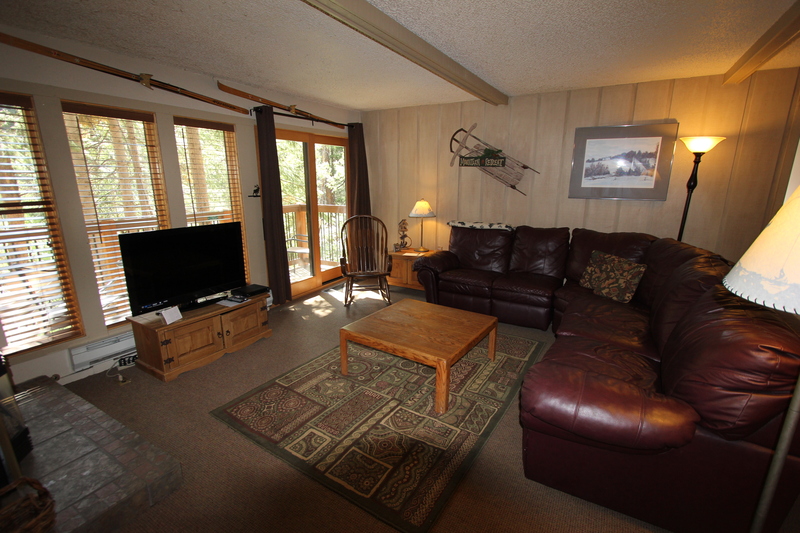 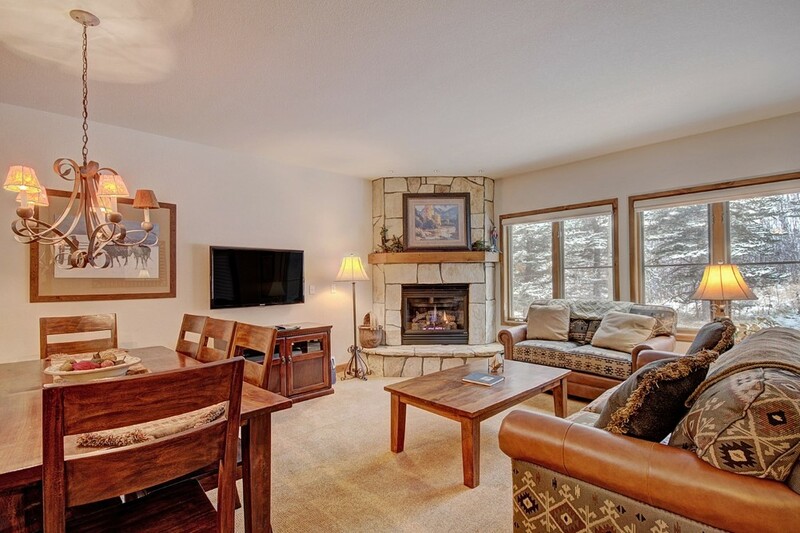 **Unit comes with complimentary Breakfast Redeemable at 2 mountain restaurant locations.